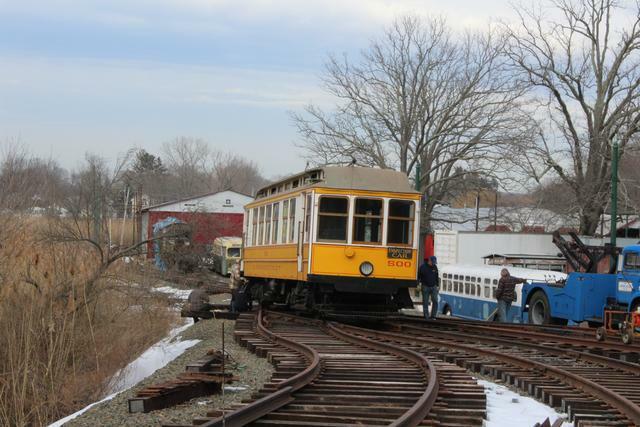 The Shore Line Trolley Museum's priceless and irreplaceable collection of antique trolley cars will soon be safe from future coastal floods such as Irene (pictured above) and Sandy. 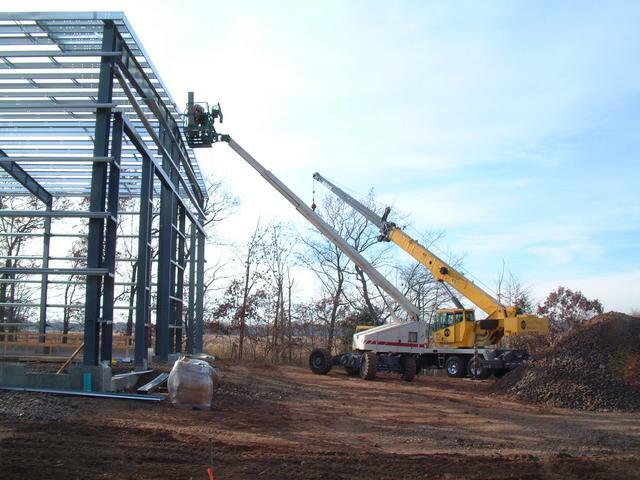 This page is an archive of construction photos of Elevating the Collection. 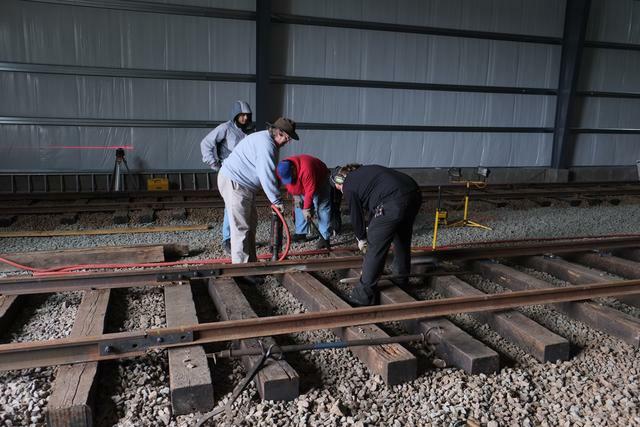 You can help us reach our $2 Million goal which will fully fund the installation of tracks and live wire to reach the new buildings. Email us or call (203)467-6927 for more information. 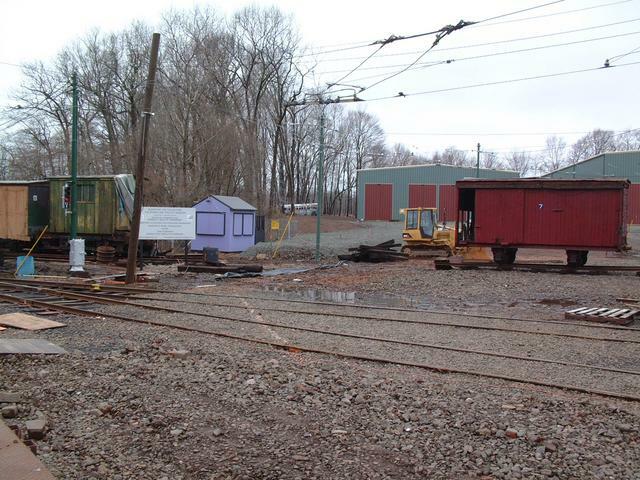 After an open bidding process which was monitored by the State of CT Department of Economic and Community Development (the DECD administers the $1,000,000 State grant) the museum was pleased to announce that a contract for the construction of our two new trolley buildings along with related site and grading work was awared to Pat Munger Construction Company of Branford, CT. Weekly job site meetings began, and members of the Trolley Museum's Construction Committee and Munger Construction reviewed the project plans and specifications. Heading this committee pro-bono is museum member Leonard Pellegrino, PE, whose company LAP Power Engineering LLC specializes in mechanical/industrial construction engineering. Construction activity began at the end of May. 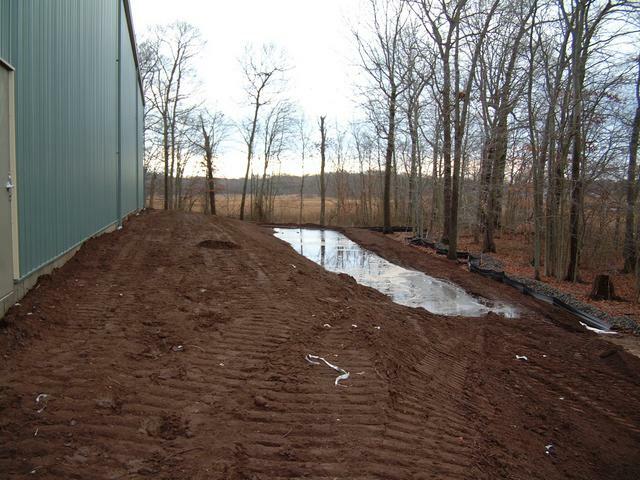 Silt fencing was installed and the building permit application was started (the permit has since been granted). 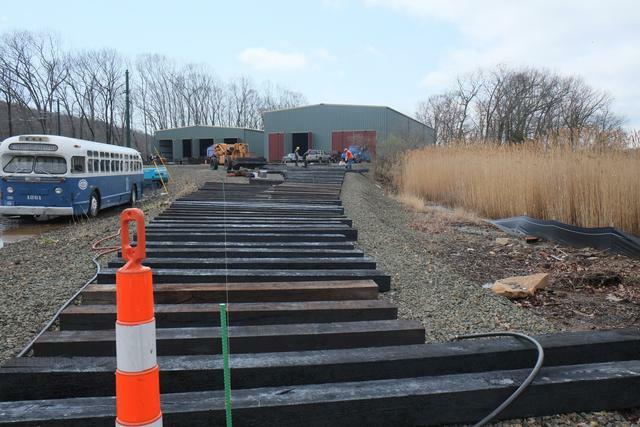 Those who have driven down "the back road" to the museum's yard area have crossed the quaint wooden bridge over the Saltonstall Creek branch of the Farm River and leads to the private Alex-Warfield dirt road. 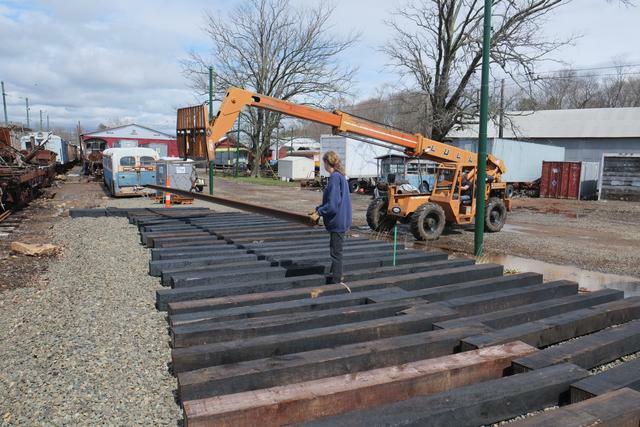 This bridge was identified as a major impediment to the start of construction, because it was unclear if it was designed to withstand the heavy and frequent loading of the construction vehicle traffic. 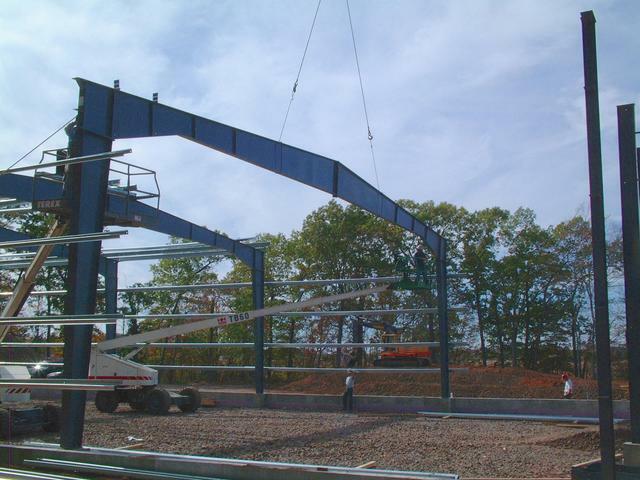 A temporary span made of steel beams welded to a steel deck plate was designed, fabricated and installed as part of our contract with Munger Construction. 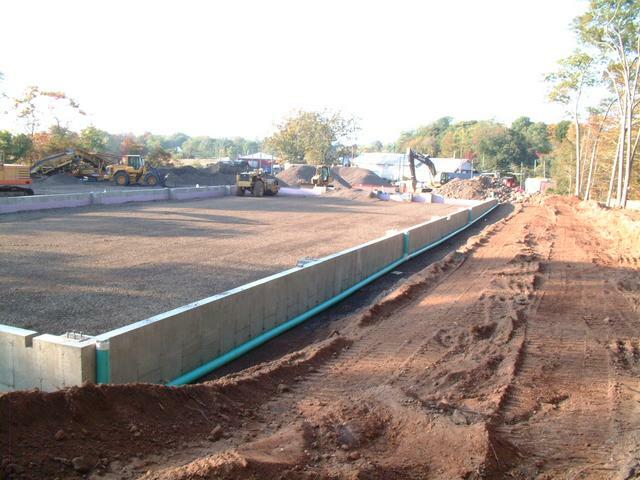 Permission was obtained from both East Haven and Branford, as well as all the residents of the road, to install this temporary span. 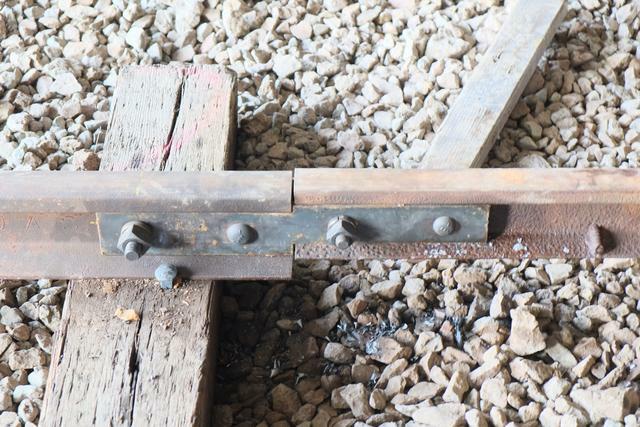 It sits above the original span and is designed to be removed at the end of the job, leaving the original bridge untouched. Installation took place in mid-June and took about 5 hours. 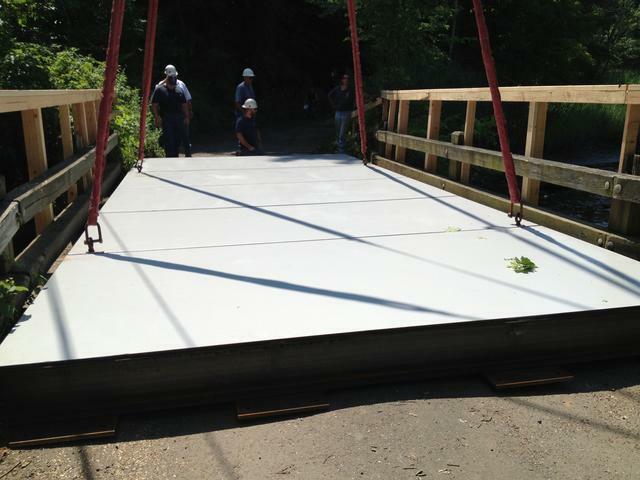 Temporary asphalt ramps were built to bring the road up to the level of the new span. 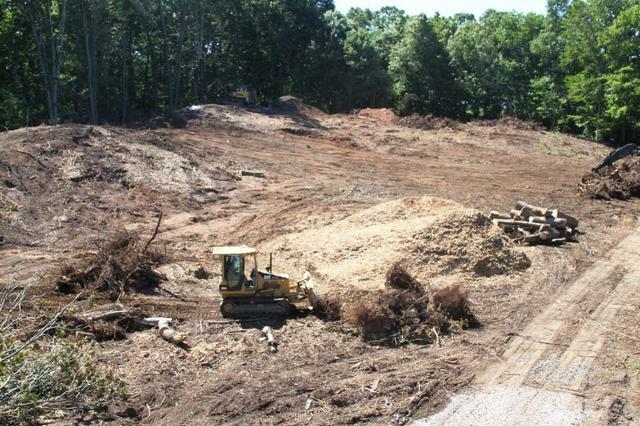 Small brush has been cleared and topsoil is being stripped. 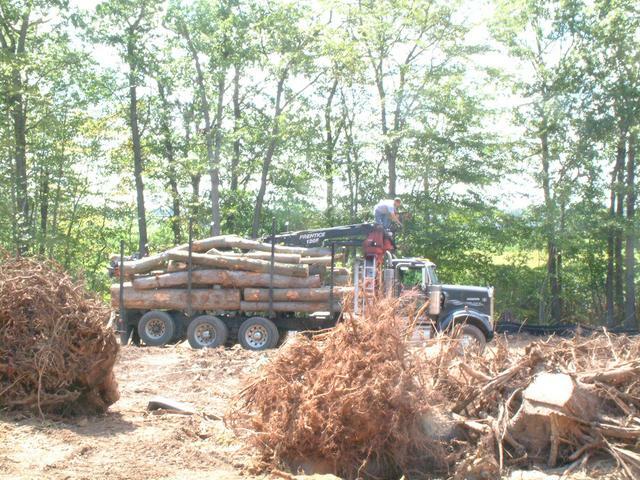 Leaves and small branches are chipped, while larger logs are cut and stockpiled for pickup. 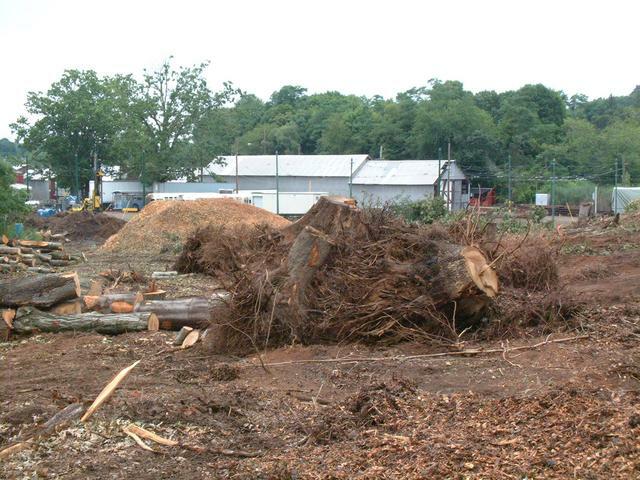 Because of the great 1938 hurricane, there are not many trees along the Connecticut coast that are older than 75. 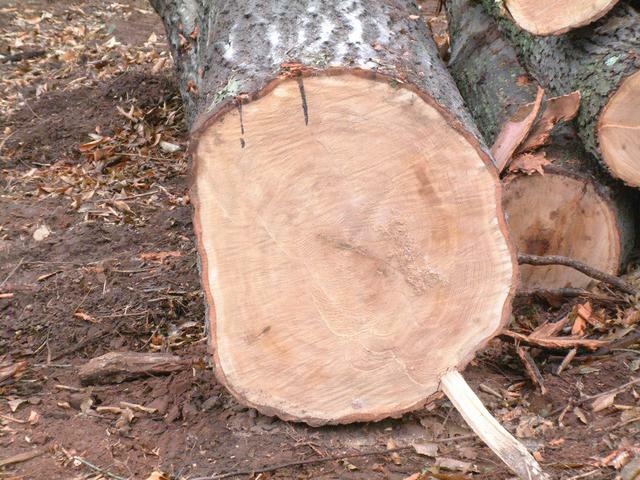 Here is one oak that was 95 years old, by counting the rings. Unfortunately it was right in the middle of the new buildings and had to be taken down. 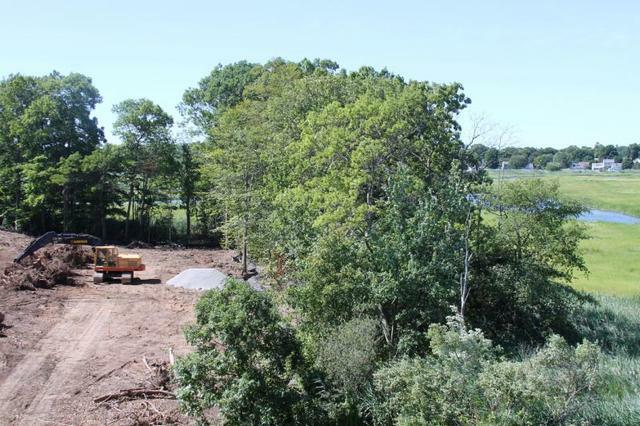 But a large continuous buffer of original trees was retained all around the "island" to maintain the visual and environmental barrier between this new construction and the surrounding marshland, as can be seen from this photo taken from an aerial lift. 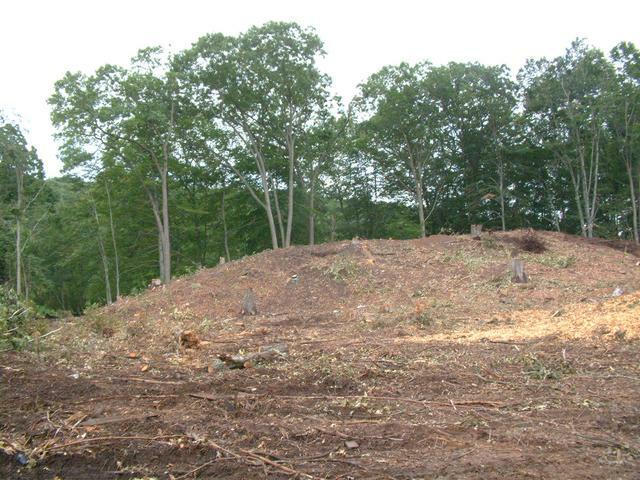 This view taken from the cleared north hill of the island soon disappeared as tree clearing progressed. 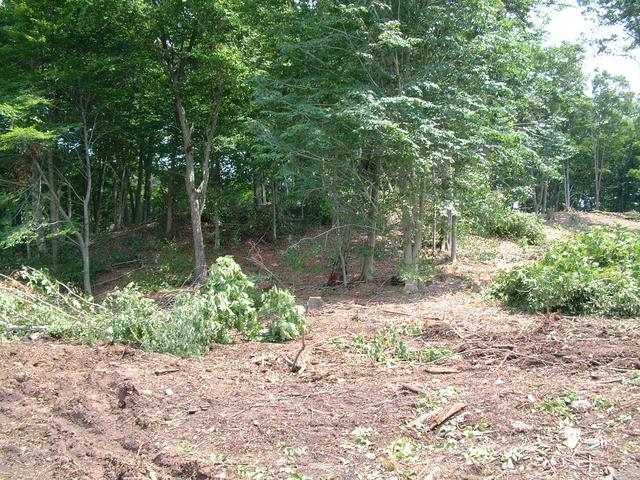 With tree clearing completed in late July, one had access to a new vista that was subject to rapid revision. 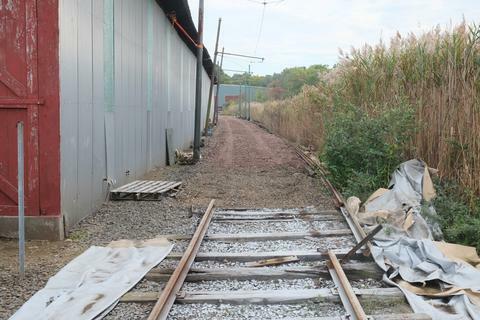 Here we see the northerly (railroad west) knoll looking geographically east (railroad north) towards the main line. 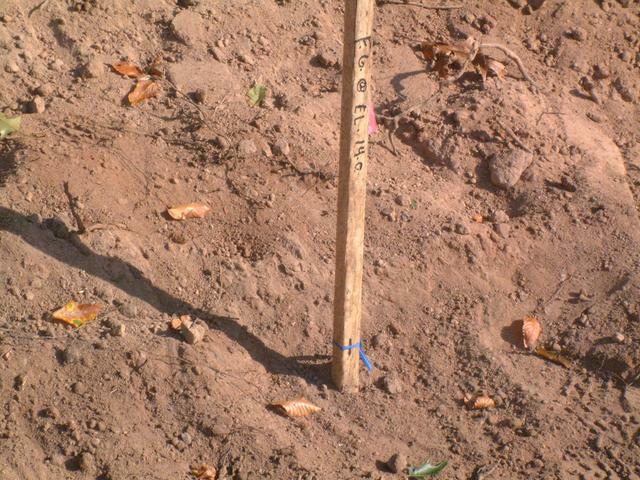 This stake marks the corner of the building known as "building 2" for the purposes of this contract. 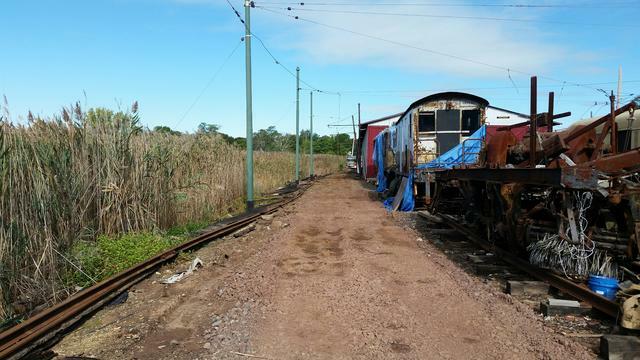 It is the building further away from the mainline, and will most likely be designated Building 9 once the official railway map is revised. Looking towards the northerly knoll. Contract building 1 will begin near this peak, and come back towards the camera's position. 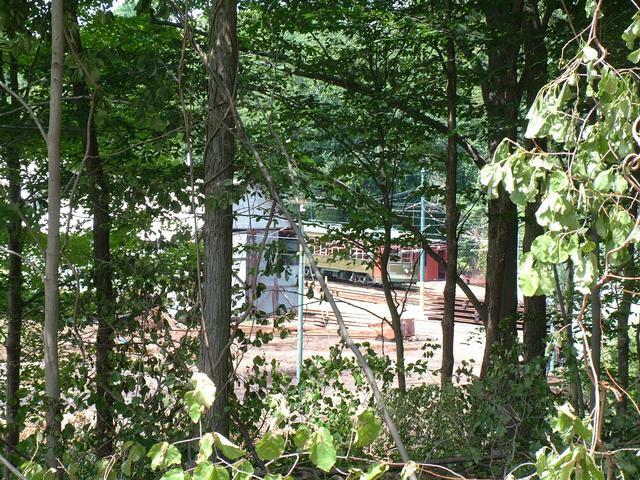 Taken from the southerly hill, this is approximately the back of contract building 1. 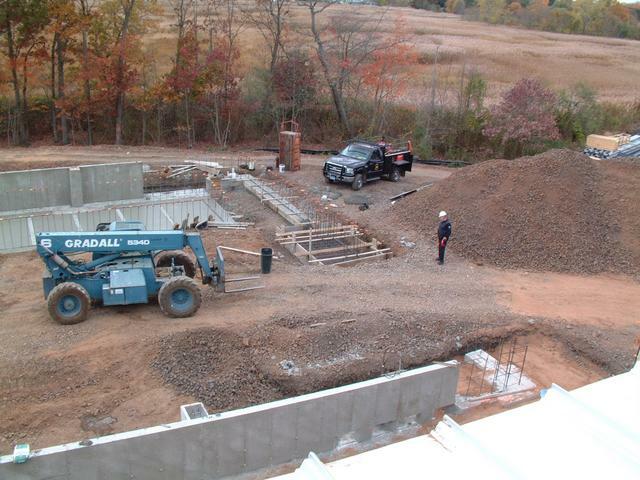 The top of the northerly hill is about 15 feet higher than the planned floor elevation. Soon this hill, and this dramatic precipice, will be blasted down. To catch this panorama again one will have to climb to the roof of the new buildings, which will be at approximately this height. 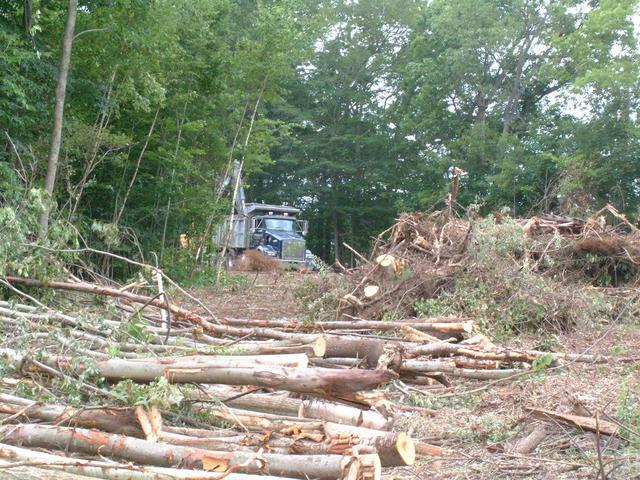 With trees and stumps cleared from the construction area, blasting operations began at the beginning of August. 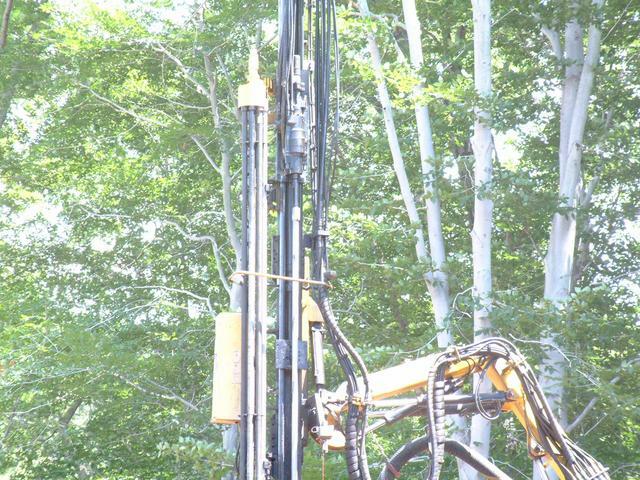 This drilling rig has a water-cooled, carbide-tipped 2 inch hammer drill. 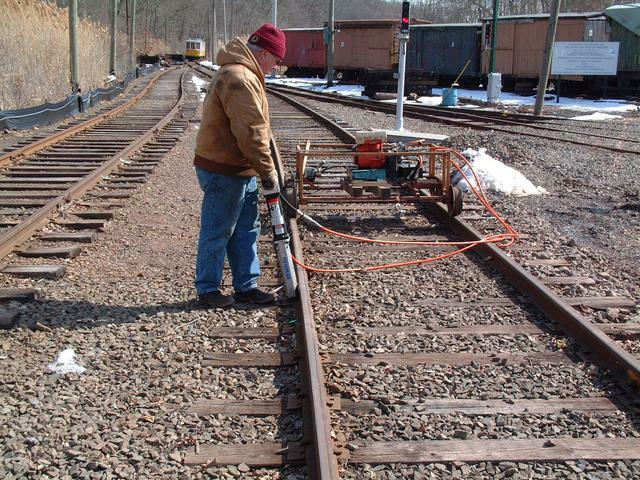 It takes only a few minutes for it to drill down the 10-20 feet needed. 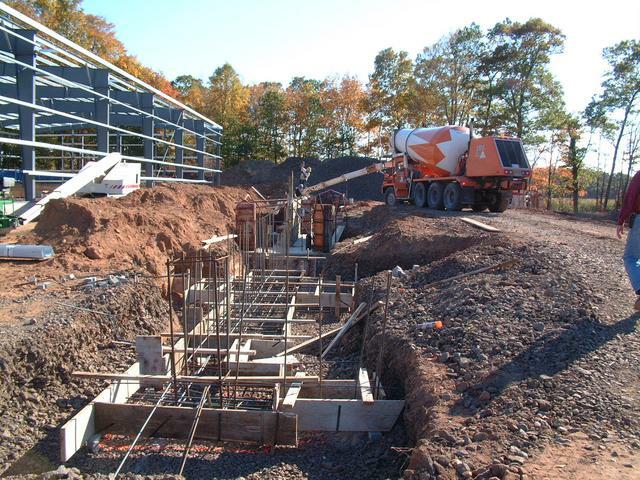 Most of contract building 1 is above ledge and requires blasting, to a depth sufficiently below the planned floor elevation to allow for required foundation depth. 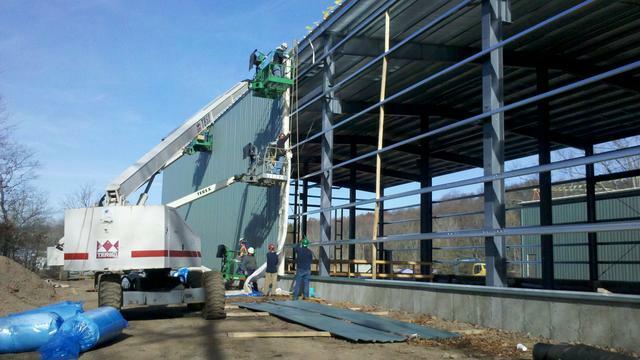 Almost all of contract building 2 requires filling to achieve the elevation. 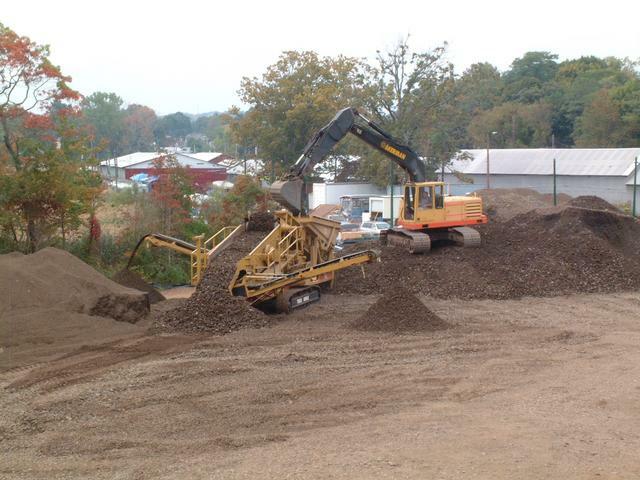 The excess material cut from the hill will be used, in part, to fill where needed. 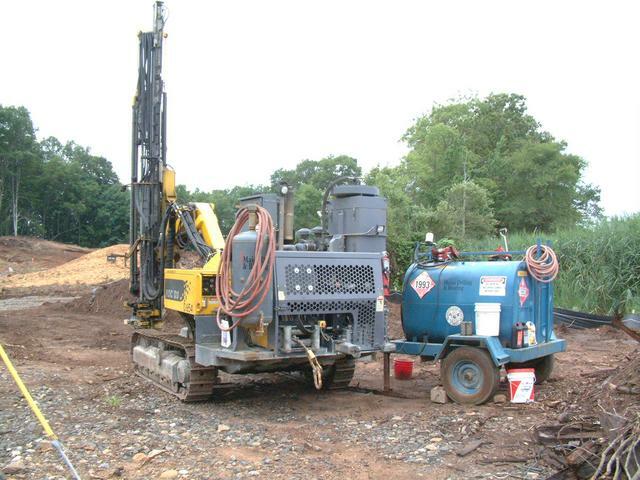 The drill rig is hydraulically controlled. The actual drilling motor is near the top of the mast. The structure to the left of the mast contains the extension rods. Having watched too many Roadrunner/Coyote cartoons, many of us were hoping to see two wires leading to the "ACME" trigger box! 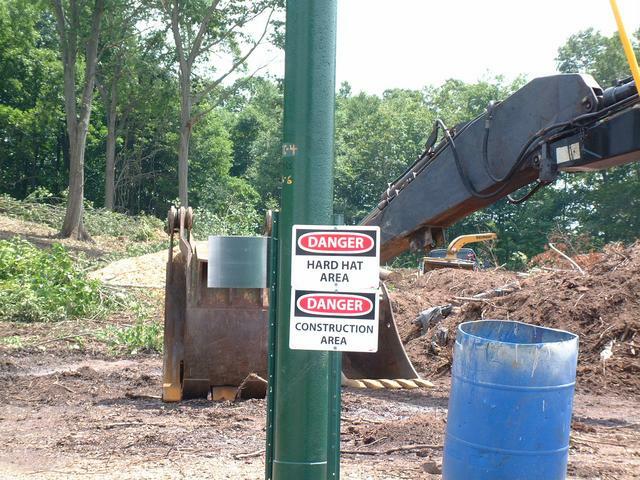 Modern blasting is not controlled electrically or via radio anymore. The trigger is this small hollow plastic tubing which is filled with powder. The yellow lines connect to other yellow lines via the powder-filled junctions. 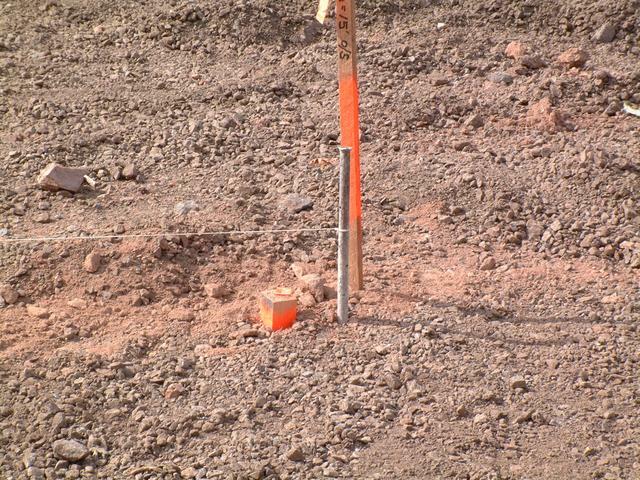 In turn these connect to the orange lines which lead to the bottom of each drilled hole. 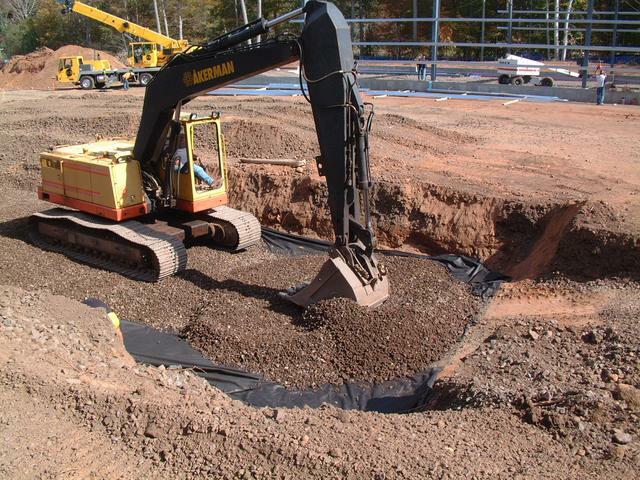 The hole is filled with an explosive slurry mixture and then rammed with crushed stone to help contain and direct the blast. By adjusting the length of the lines, a controlled staggered firing delay is created which affects how the rock will break up. These funnels are used to load the holes with the explosive mix. 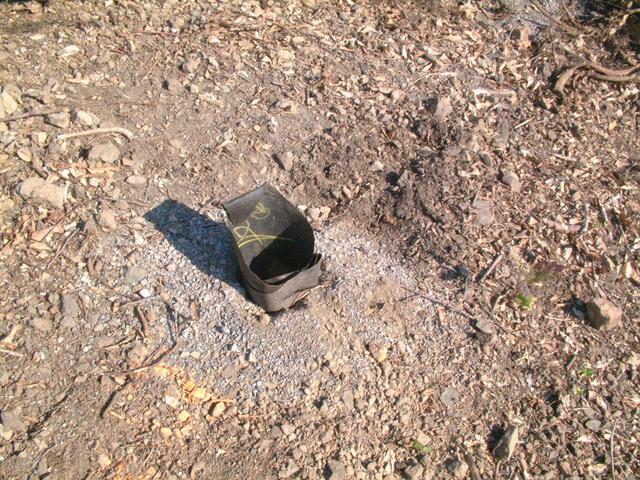 The whole thing is triggered by a spring-loaded plunger which strikes this small shotgun primer cap and sends the initial explosion into the yellow fuse line. 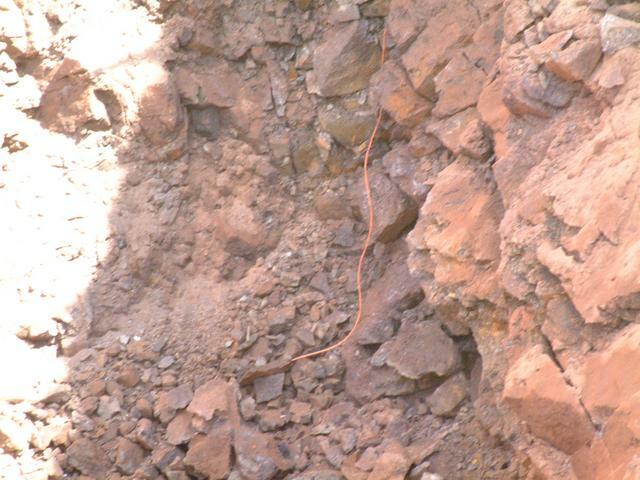 After the blast, the contractor excavated the overburden (loose soil) and broken rock until reaching the edge of the blasted rock. The remnants of the orange trigger line can be seen at the bottom of the crater. 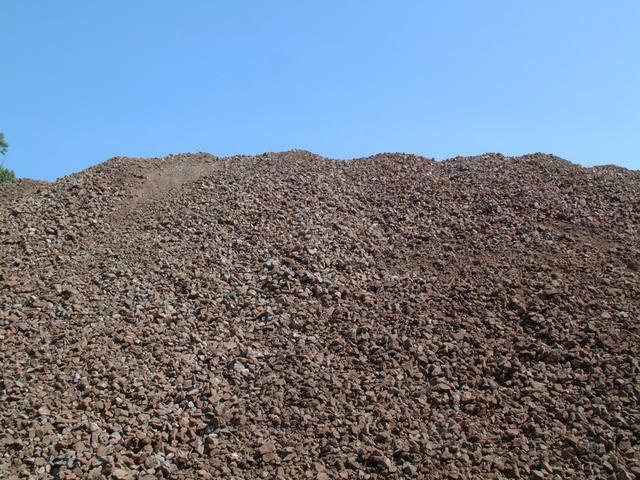 The pile of rock gives an idea of the range of sizes into which the rock fractures. 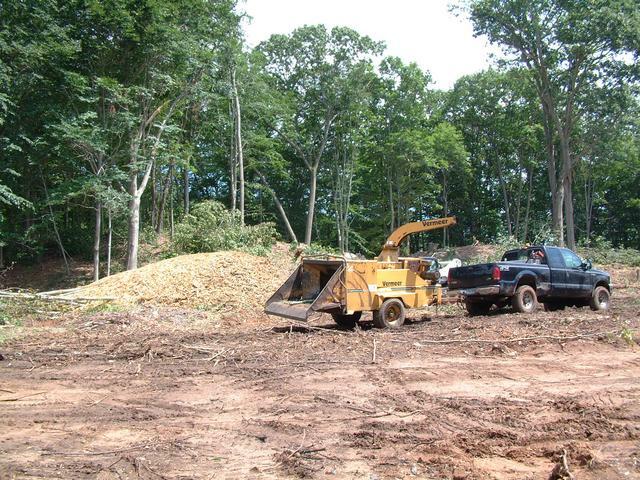 After each blast, construction vehicles are busy moving earth and continuing to truck away unusable materials and debris. 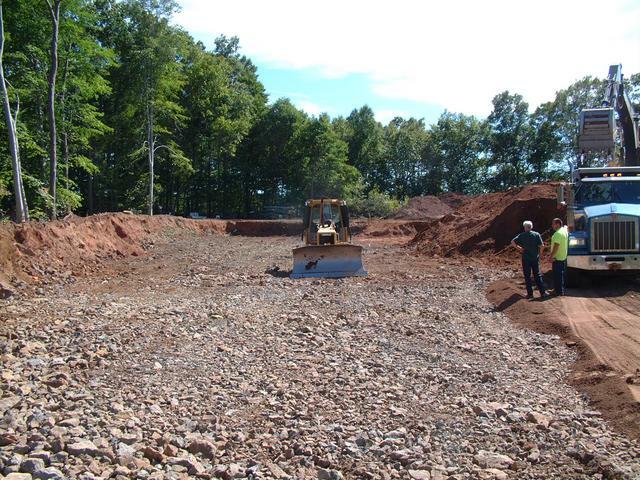 Aug 23, 2013: For a brief time anyway, there is a miniature quarry operation taking place on the Island site. 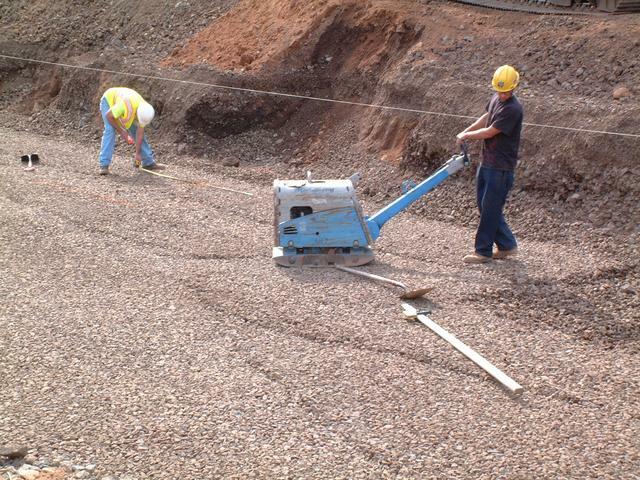 A portable rock crusher (the blue machine in the photo below) was brought in. 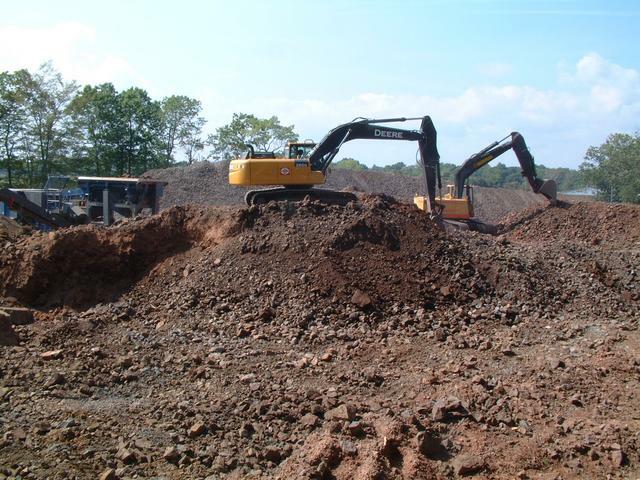 The yellow excavator takes the blasted material, which is a mixture of soil and broken stone of different sizes, and loads it into the top of the crusher. 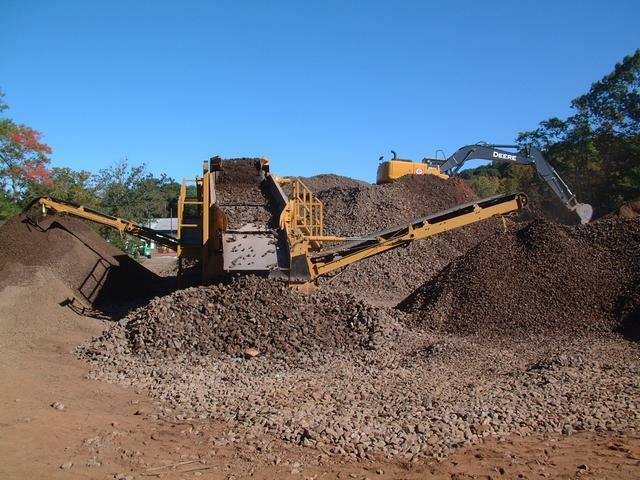 The crusher breaks up the rocks into pieces that are approximately 3" and smaller. 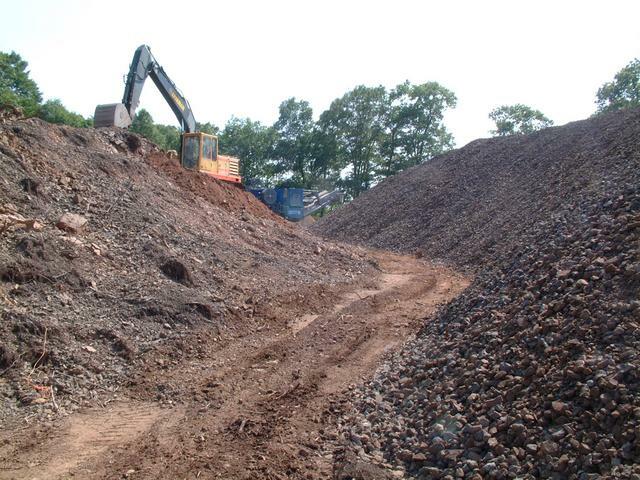 The crushed rock exits from the front of the machine where it is piled, while the soil and fine stone dust is discharged via a smaller side chute. 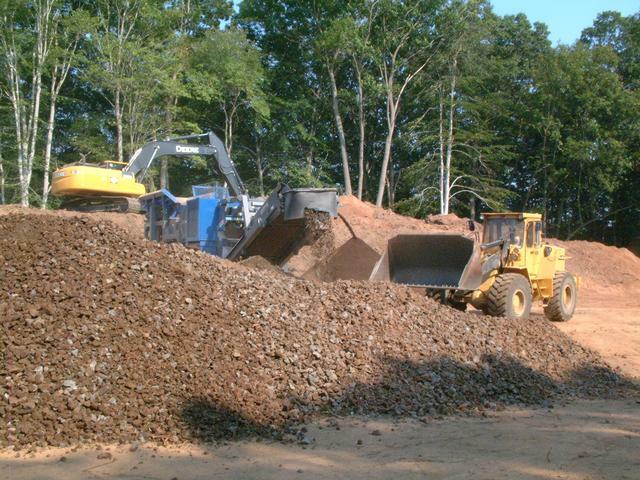 The loader transports the product into various stockpiles. This photo was taken on the first day of crushing. 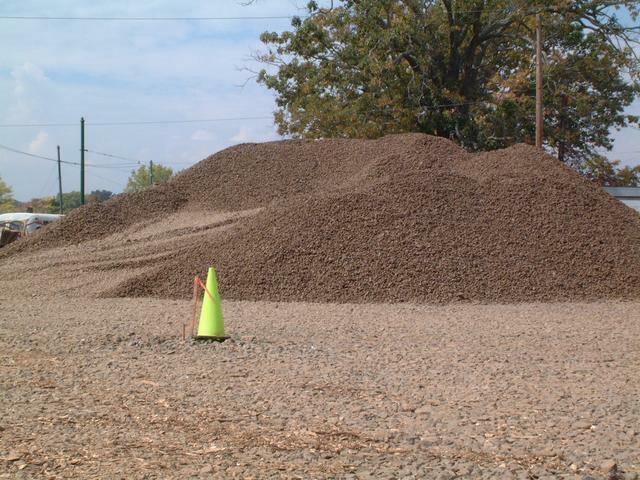 About a day later, at our weekly on-site job meeting, the pile of crushed rock has grown to immense proportions. In places the depth of blasting was almost 20 feet. 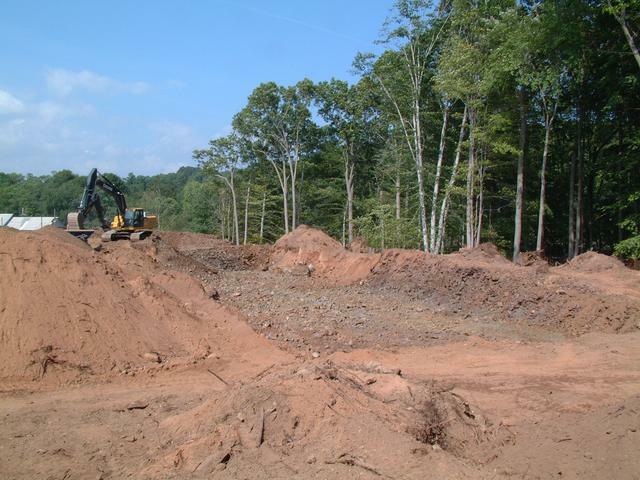 The blasted areas must be dug down to the elevation of the foundations. This section is almost done, but there was still a lot more to go when this photo was taken. 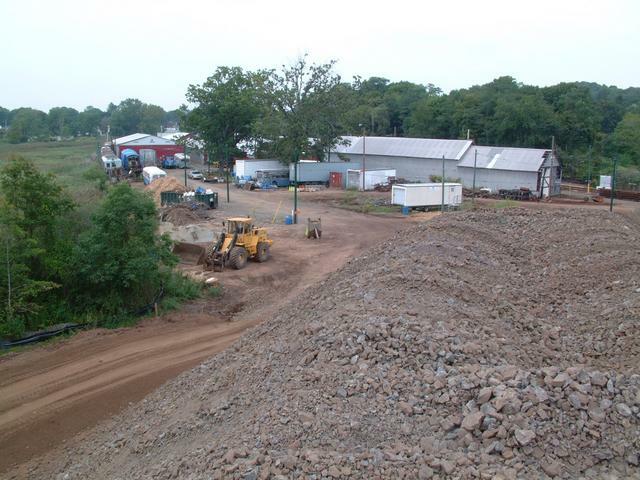 Sep 1, 2013: After a week of crushing we are almost done processing the blasted rock, which has created a mountain of crushed stone! 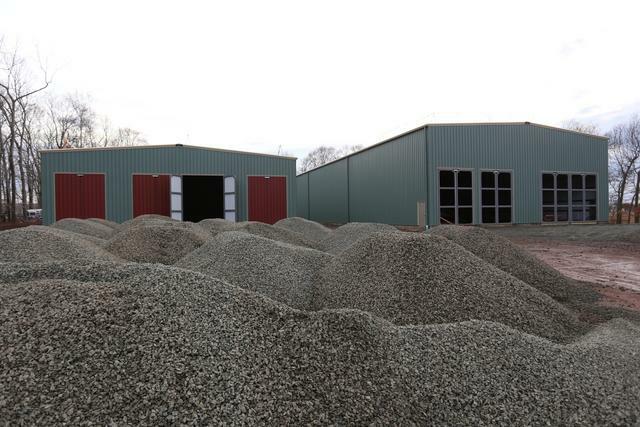 The crushed stone is being stockpiled in the footprint of new building number 2, adjacent to the blasted area which new building number 1 will occupy. 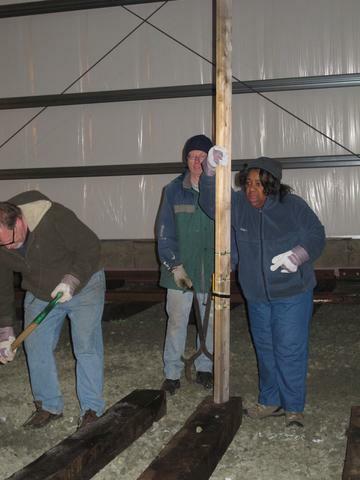 The stake represents the front right corner of building 2. 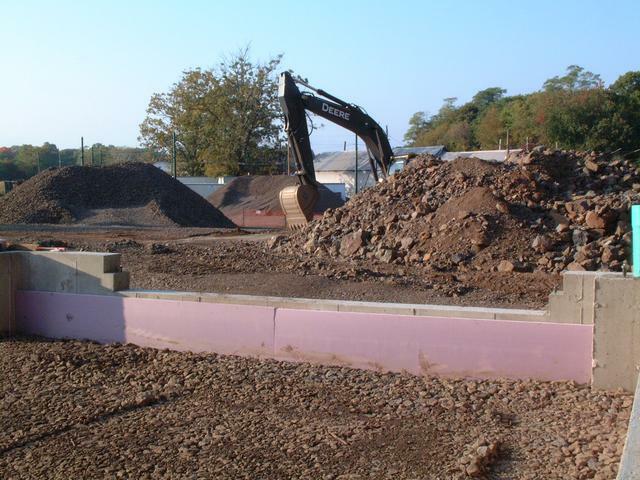 Looking across the excavation for building 1, blasted stone is being loaded into the crusher. 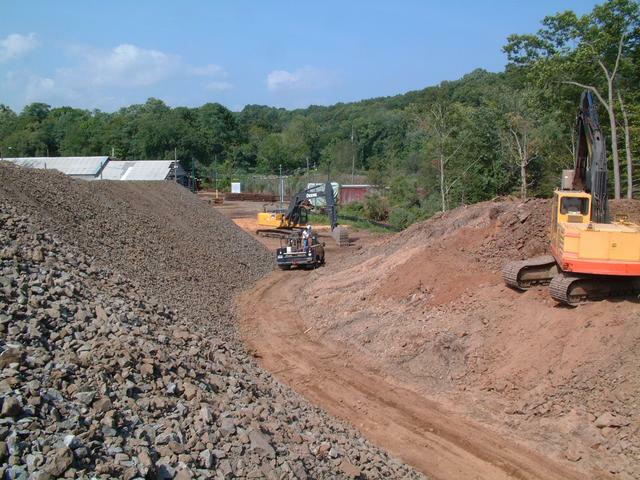 Two excavator machines are needed to keep things moving, along with a few loaders to stockpile the crushed stone. 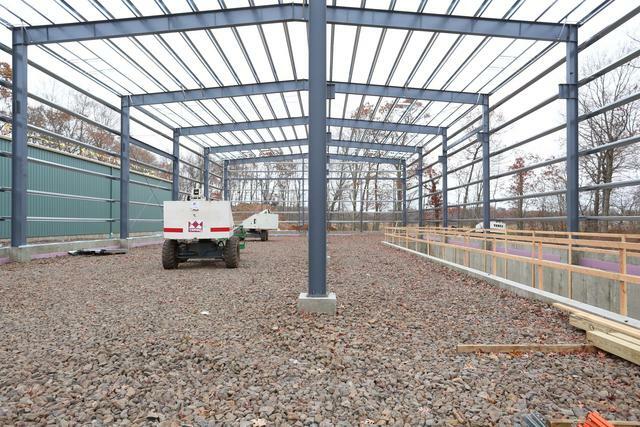 Looking towards the back of new building 1. 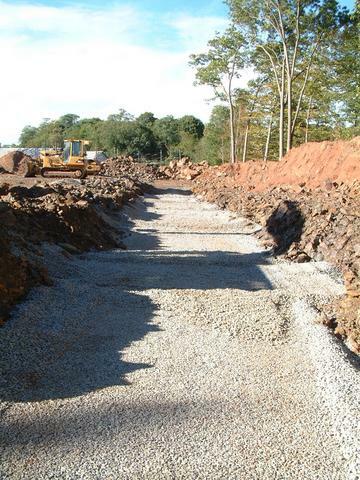 The surrounding grade is approximately the height of the track/floor. 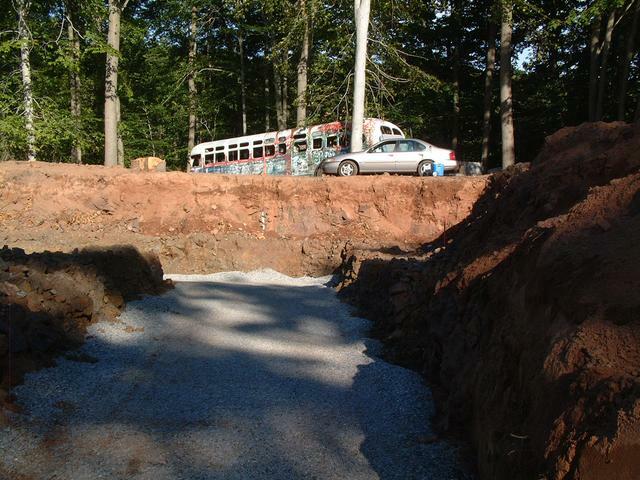 The excavation is about 5 feet deep. 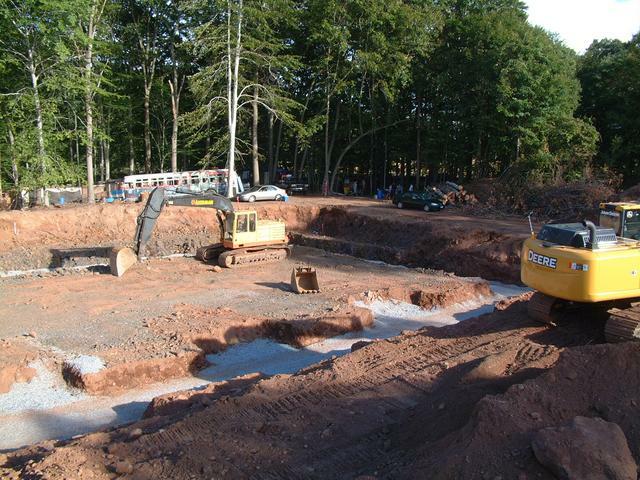 By about September 6, excavation for the footings of the building foundations will begin. 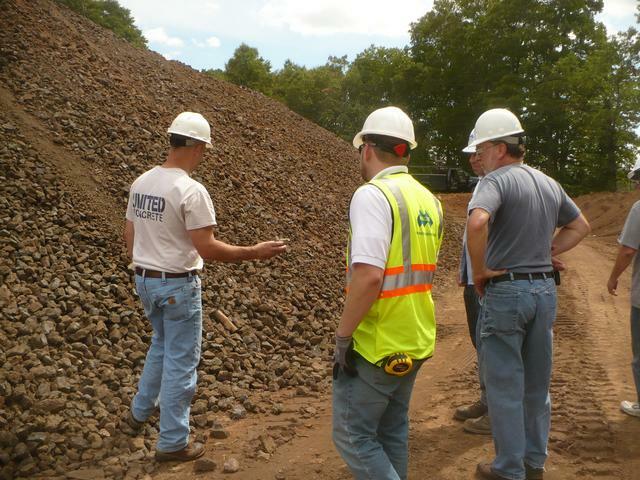 The mountain of crushed stone is over 30 feet high. 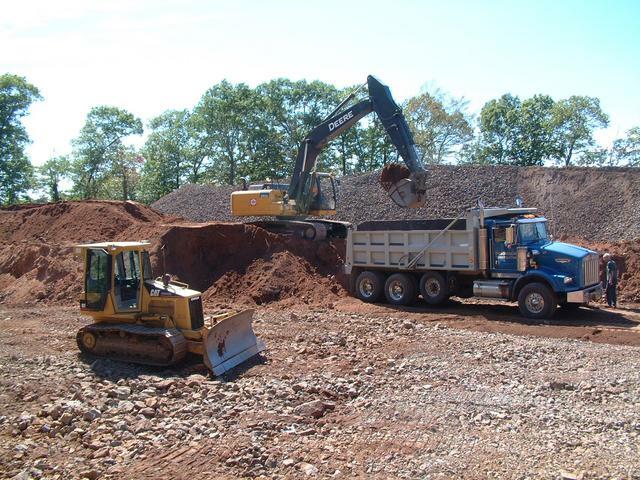 When crushing is completed in the next few days, we will have almost 10,000 cubic yards of crushed stone. 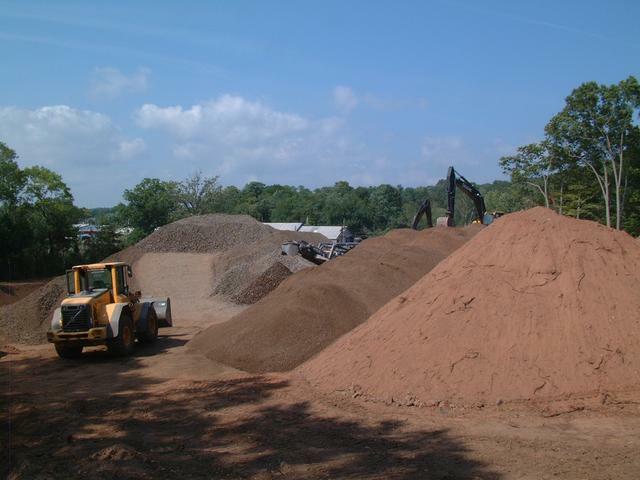 It will then be screened and stockpiled in three categories: coarse sub-ballast, ballast, and processed fine gravel. 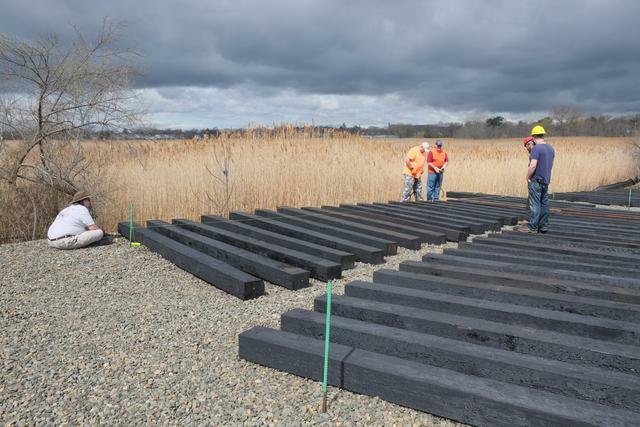 A lot of this material will be used up in filling the low parts of the project to the required elevation, including the track approach ramps. 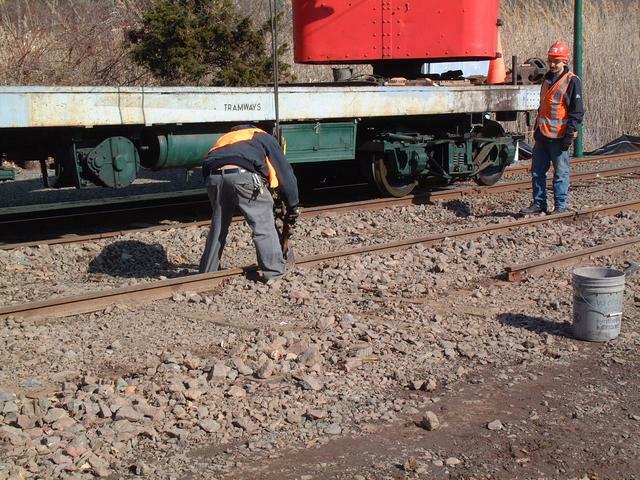 Still, we expect to have a significant amount of track ballast stone left over. As we move into September, the crushing operation has concluded. 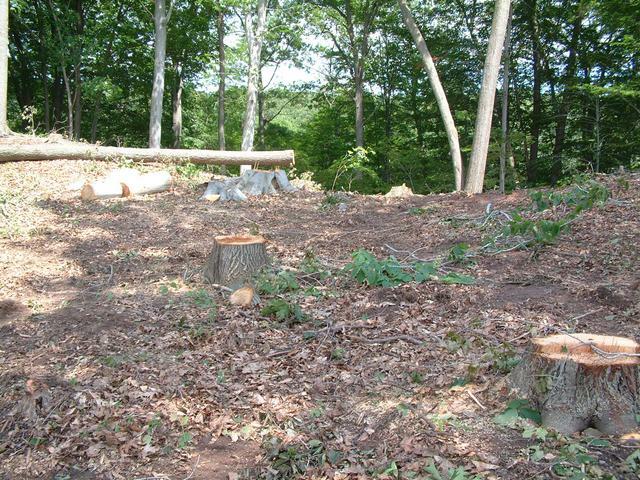 It's hard to believe that this large, flat, open area was once a small mountain. 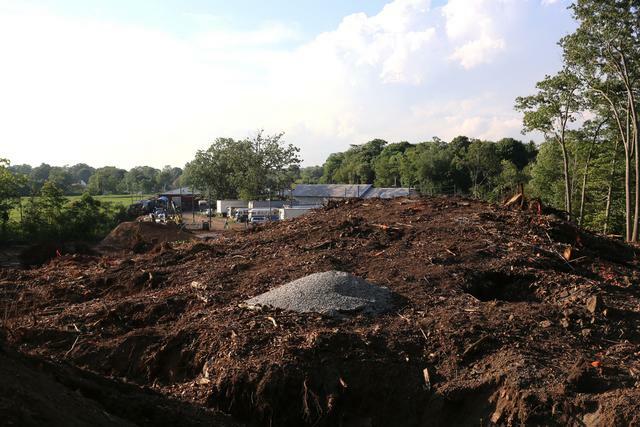 The crushed stone will be screened into three different sizes and temporarily stockpiled in the open area behind the E.H. Blossom Barn. 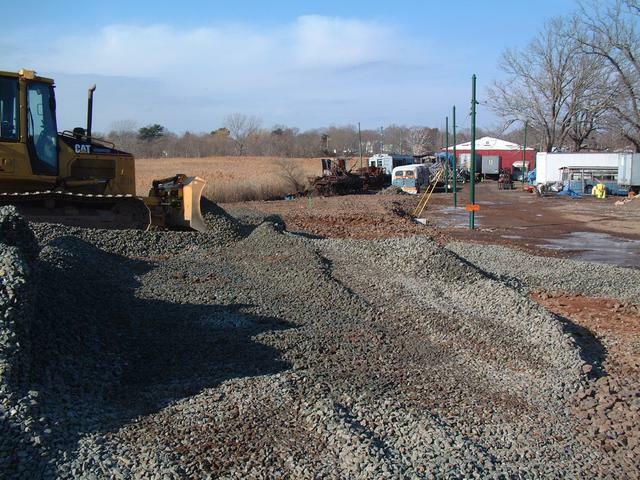 Much of the stone will be used in filling and grading in and around the buildings and approach tracks. 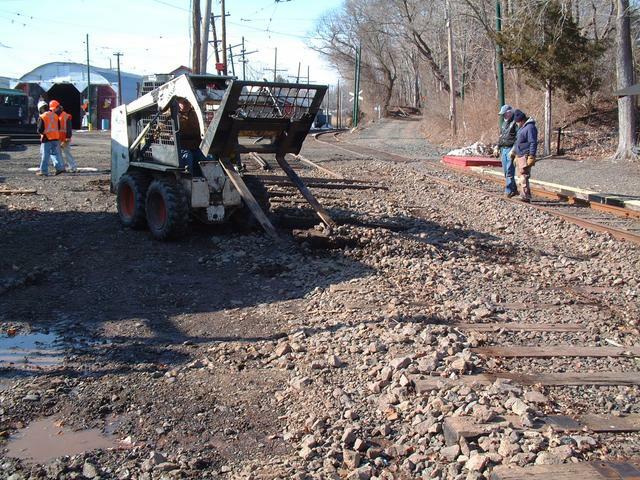 We expect to have a considerable amount left over for future track maintenance use. 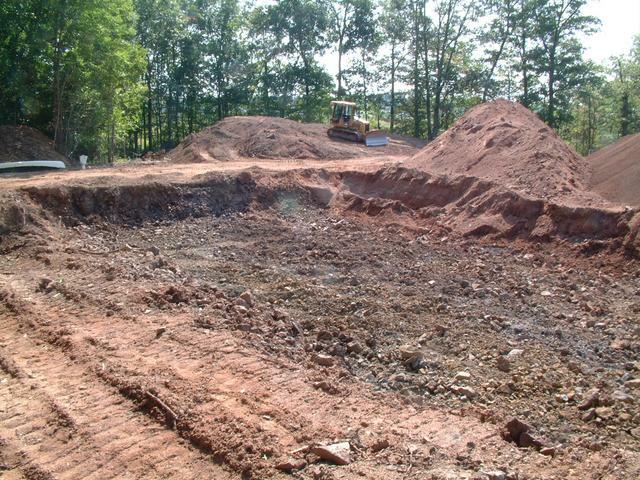 Because space is very limited, excess red sandy soil is being taken away by the contractor. 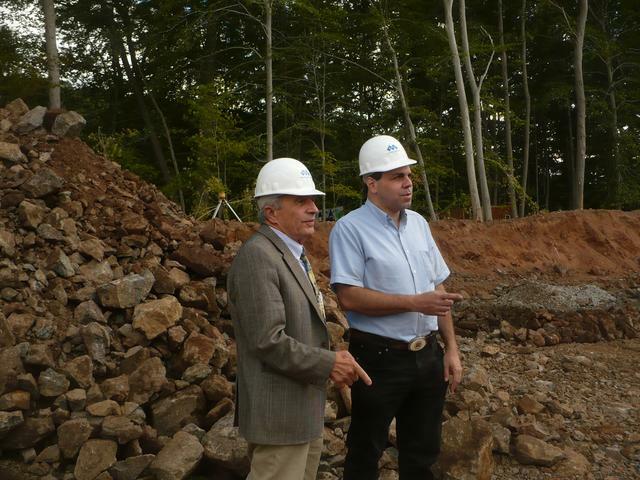 Town of Branford First Selectman Anthony "Unk" DaRos (l) takes a tour of the construction site with museum President Jeff Hakner. 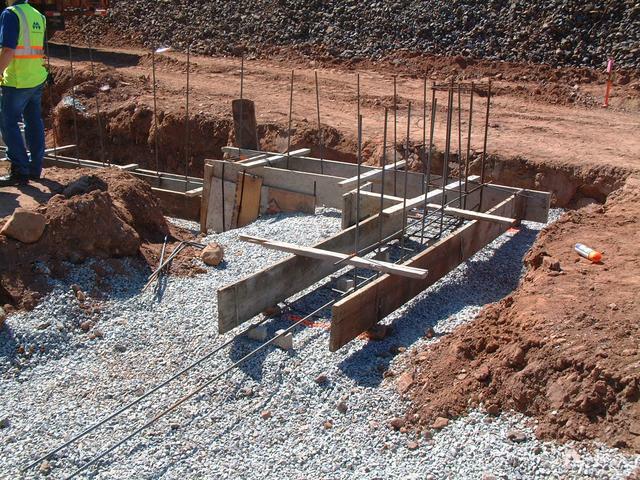 By the second week of September, the surveyor had re-staked the corners of new building #1. 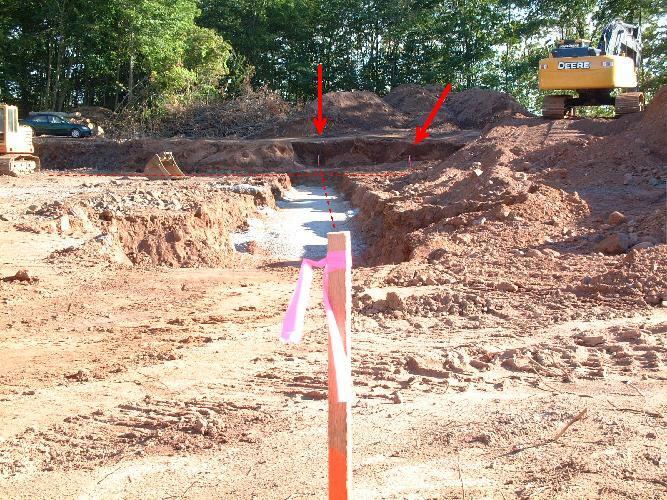 Since the actual corners will be excavated for the foundations, the stakes are set on an offet of 15 feet, where they will not be disturbed. The image below has been augmented to highlight the stake 200' away in line with the stake in the foreground, and another stake which defines the perpendicular line. 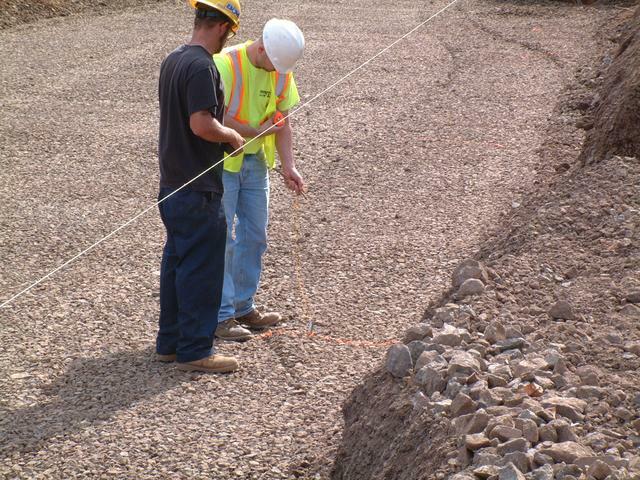 By stretching a string or laser between stake points, the actual building lines can be followed on the ground. The survey is accurate to 1/8 inch. 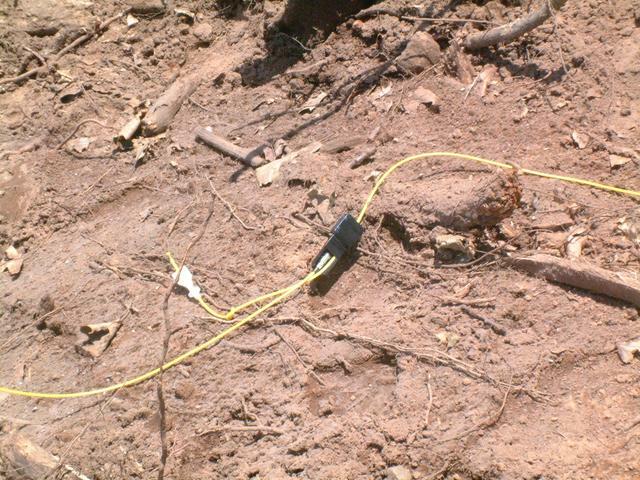 A second stake, set a few inches from the first, bears a nail head which marks the exact control point. 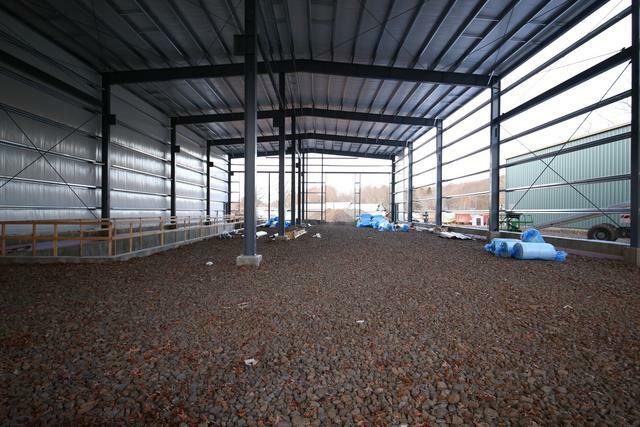 Let's take a walk around the perimeter of new building #1. 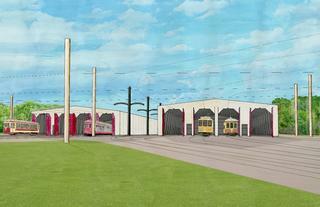 The previous view is taken from the northwest corner (geographic as opposed to railroad direction) looking south. View below looking south from northeast corner. 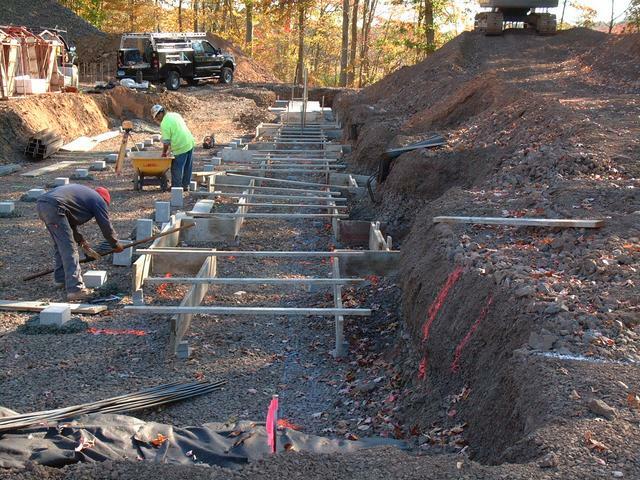 The trench is for the footings which will support the columns, and smaller footings for the foundation/frost wall. 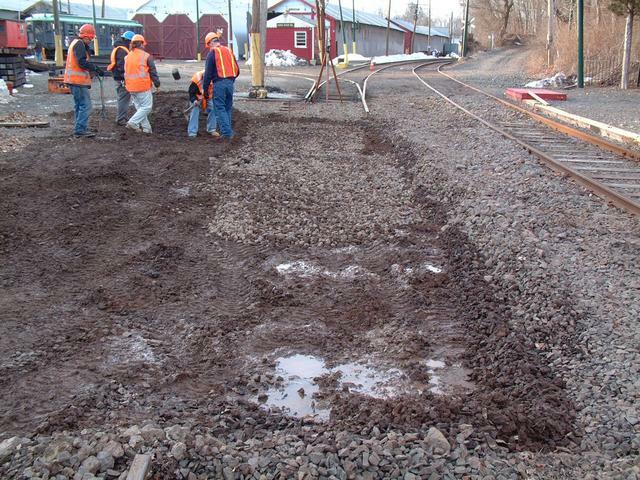 The trench has been excavated several feet below the surrounding grade (which itself is about 3 feet below the final track/floor elevation) and filled with crushed stone which has been compacted with a roller. Southeast corner looking north (above) and west (below). Southwest corner looking east. 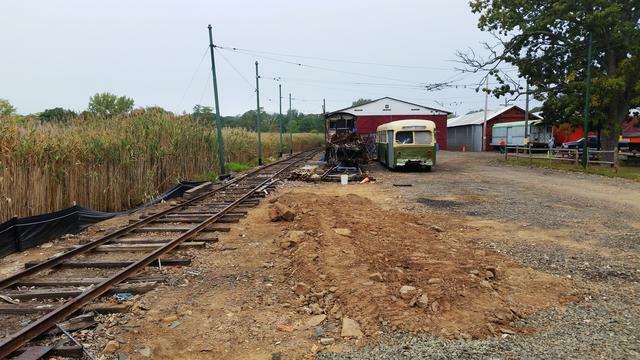 The old bus is part of the Haunted Isle set. 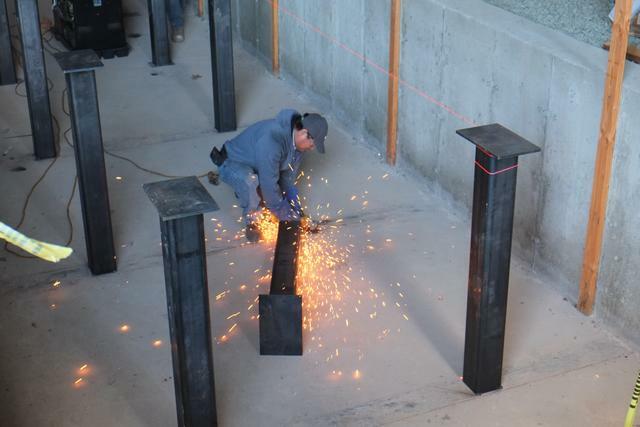 These white painted stakes mark the column lines for the structural steel frames that support the building. 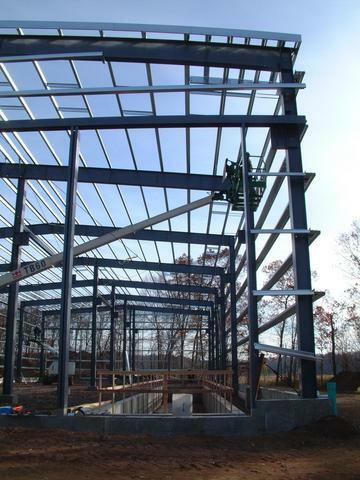 There are seven such frames in each building, including the front and rear walls. 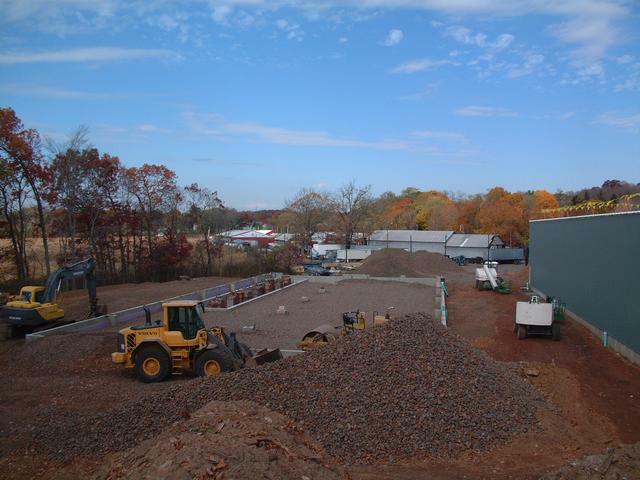 From the stone pile currently occupying the footprint of new building #2, we can take in the panorama of building #1 from rear to front. 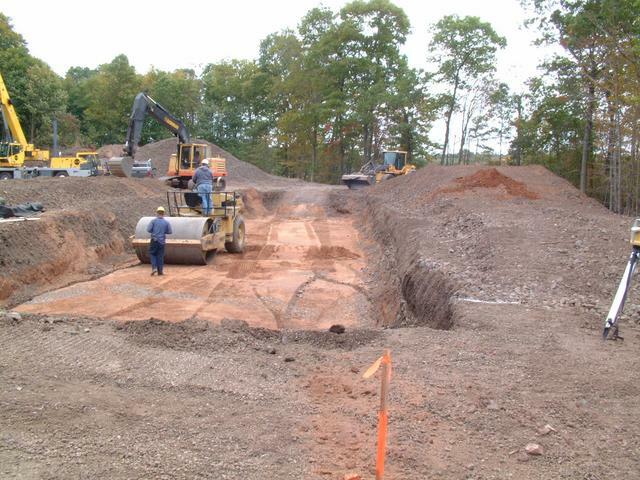 When this photo was taken, foundation excavation was still in progress near the front of the building. 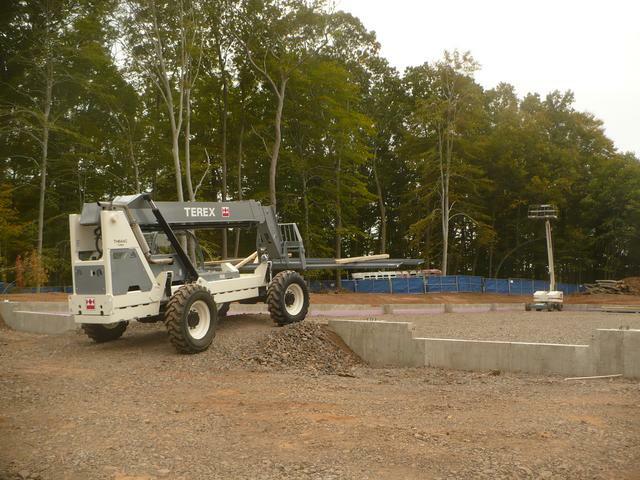 Sep 19: The first of many concrete trucks have arrived to pour concrete into the formwork of the footings and foundation walls of building 1. 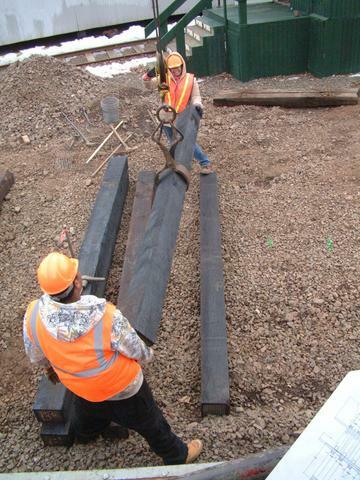 These temporary wooden forms delineate the footings. 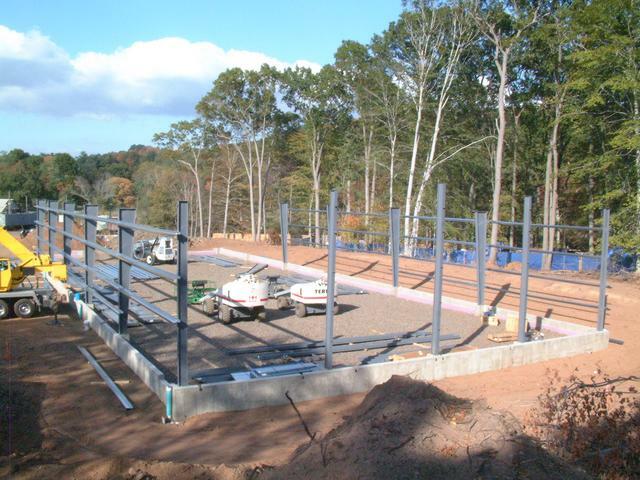 Extensive steel reinforcement ("re-bar") is used to develop the required structural strength. 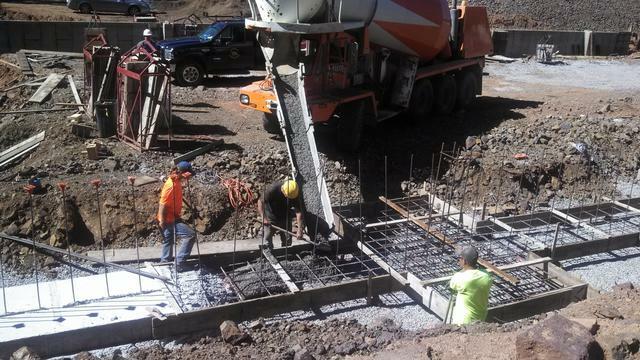 The lower photo shows the edge of the form work for today's pour, at the northwest corner of the building. 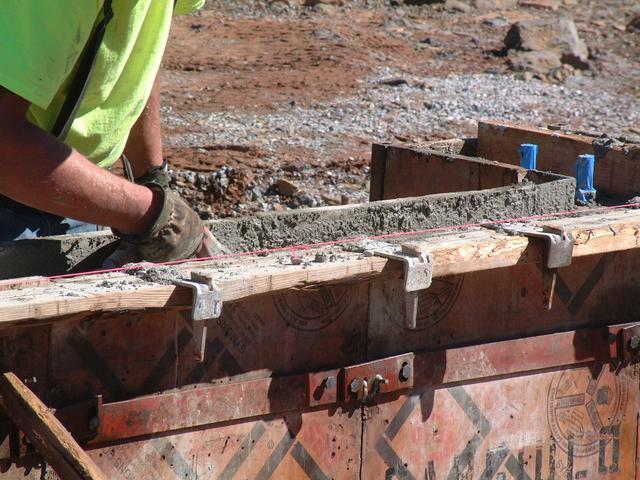 An independent testing lab performs the concrete quality inspections that are required by code. 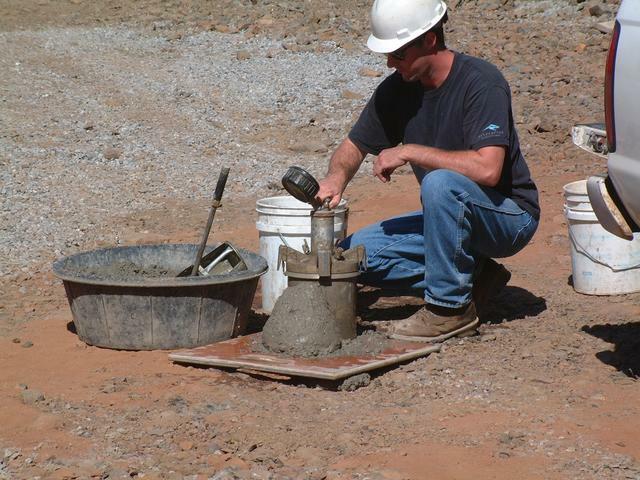 Here we see the technician testing a small sample of concrete taken from the pour for entrapped air. 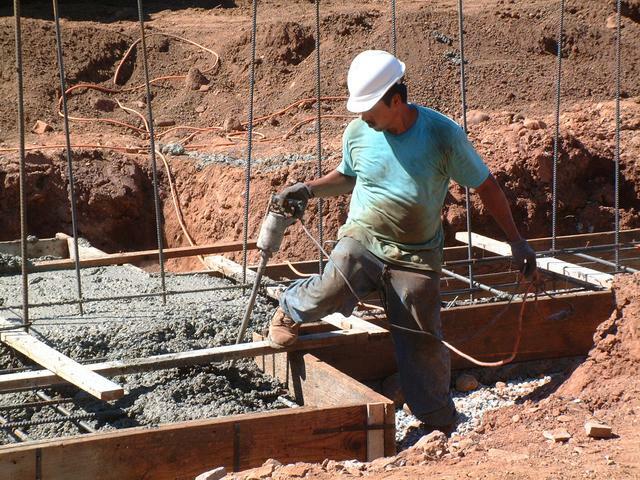 This hand-held electric power tool agitates the concrete to ensure there are no voids within. 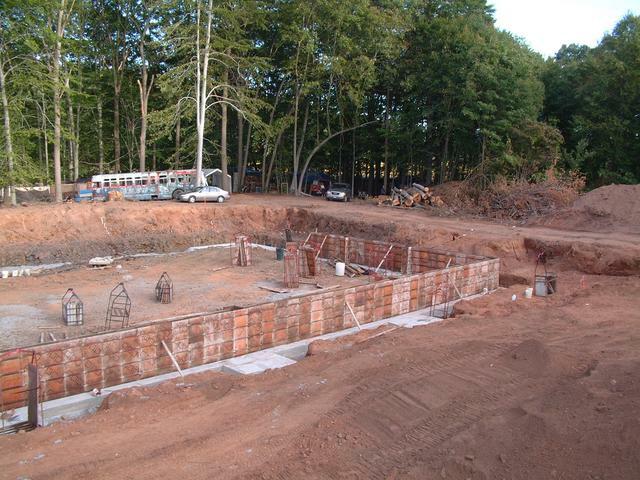 The next day, footings on this side of the building are done, and forms are up for the wall pour. Rebars reinforce the wall. 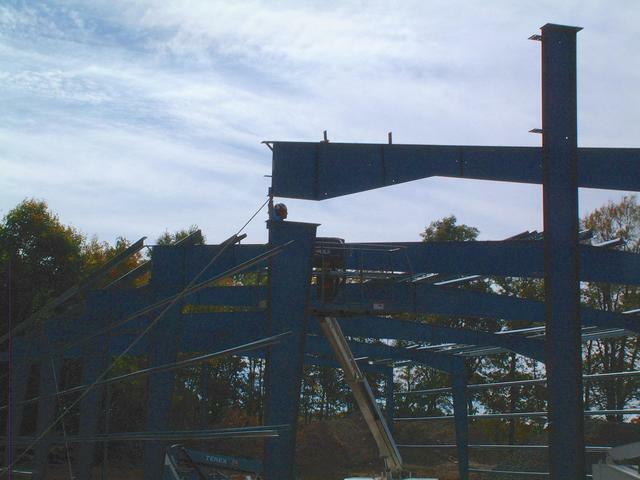 This structure is the pier on which one of the columns will sit. 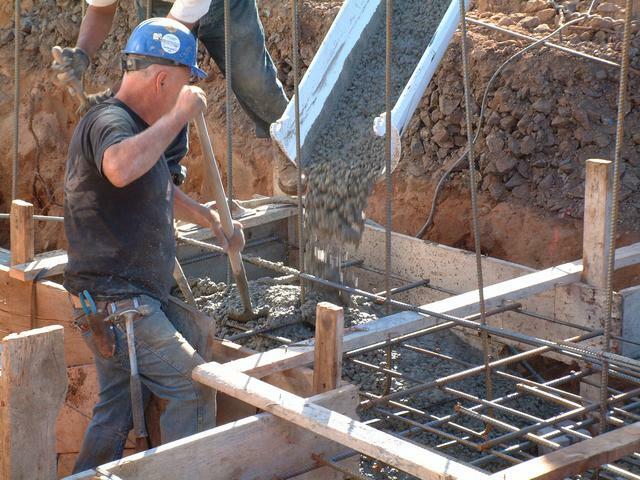 At the corner of the building, note how the rebar extends beyond the edge of the previous pour, to provide continuity to the overall structure. 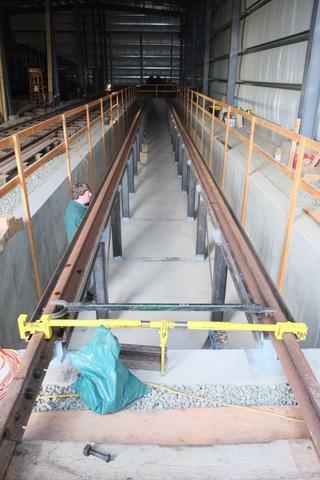 Looking down the wall section, the form panels are held in place by these small tie rods. 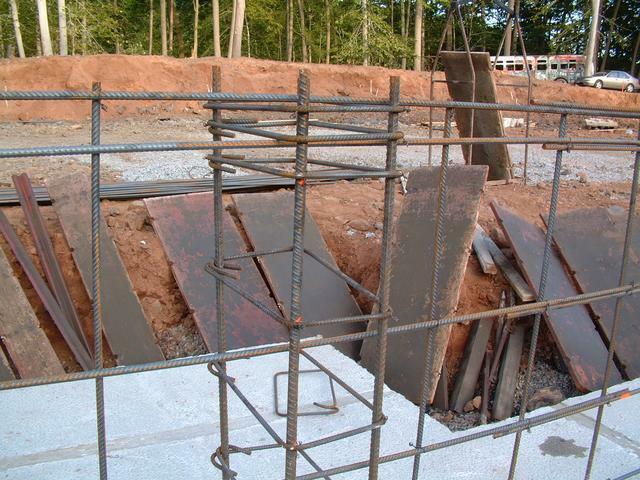 Once the wall is poured and the forms are stripped, these rods are broken off flush with the wall surface. 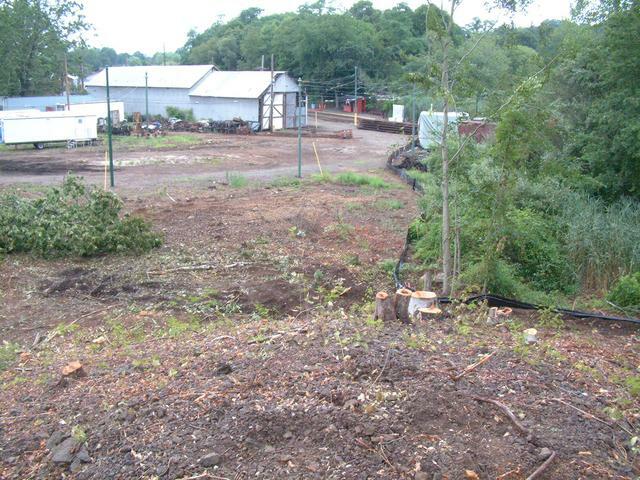 View from the back of building 1 looking north on Sep 21. Pouring along the east edge has not yet taken place. 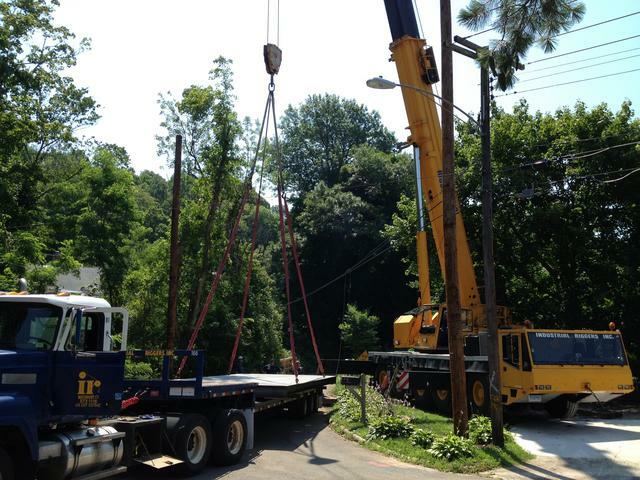 The front wall is being left open to allow truck access. 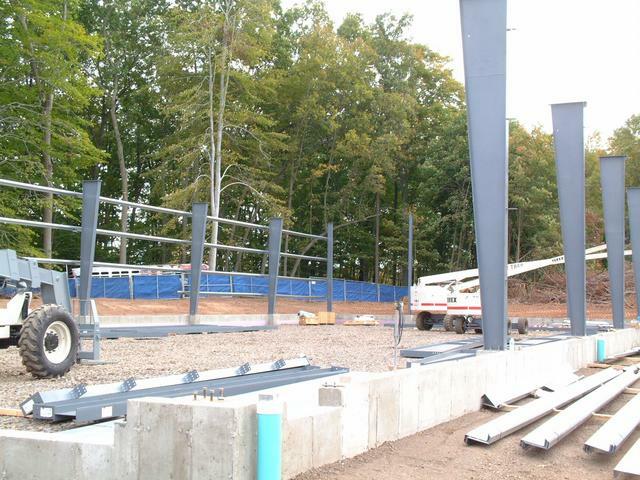 Sep 24, 2013: The steel structure of building 1 was delivered on several trailers and stockpiled near the site. 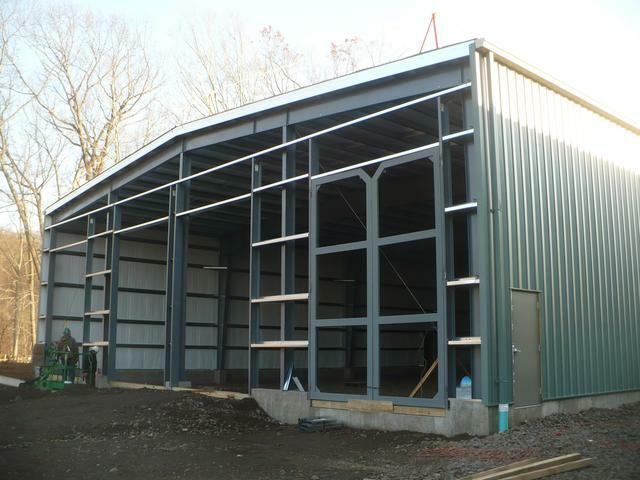 Components include the columns, roof beams, wall girts, roof purlins, standing-seam roof panels, wall panels, trim and hardware. 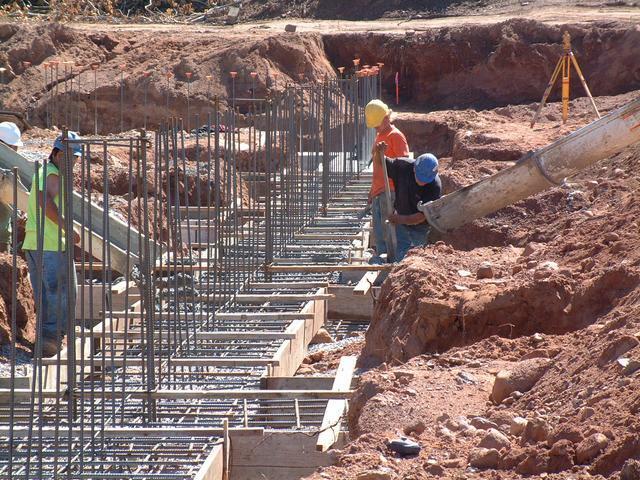 Meanwhile concrete work continues daily. 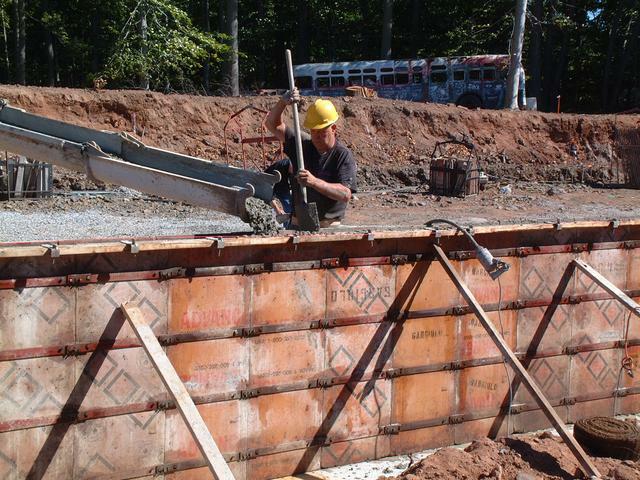 Here a section of wall is being poured into the forms. 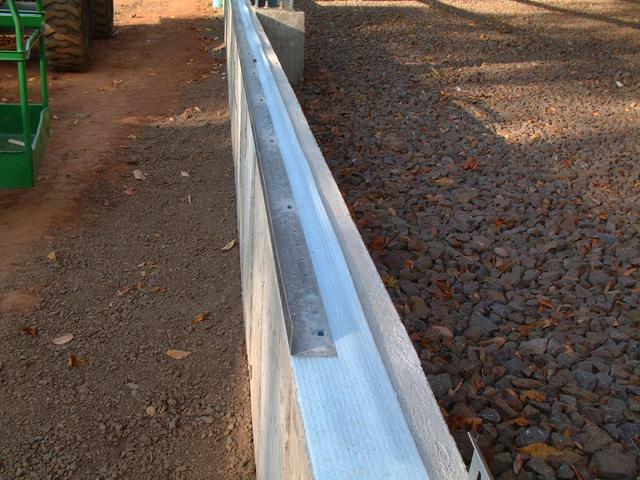 The top of the wall is a few inches below the top of the form and the concrete is trowel-finished to the correct height. Note the two projections protected with blue tape. 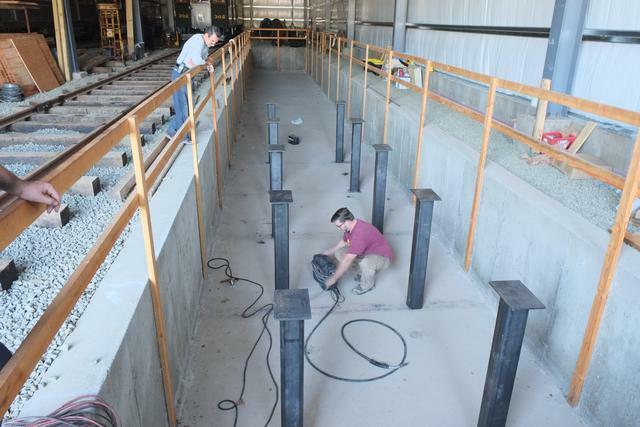 These are the anchor bolts for the column, which are cast into the concrete pier. 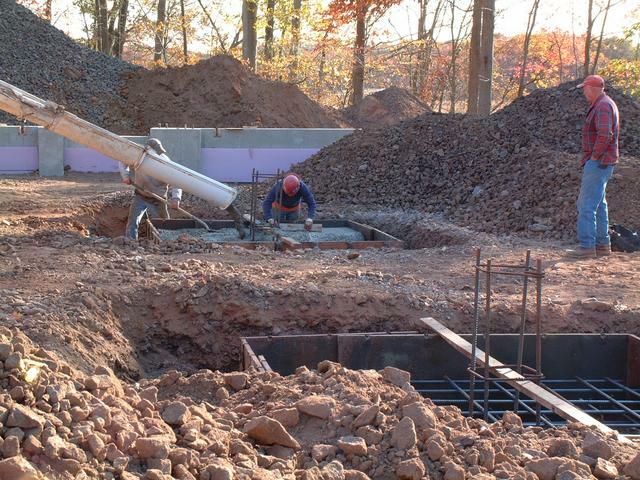 The next day, pouring of the footings on the east side of the buildings has begun. 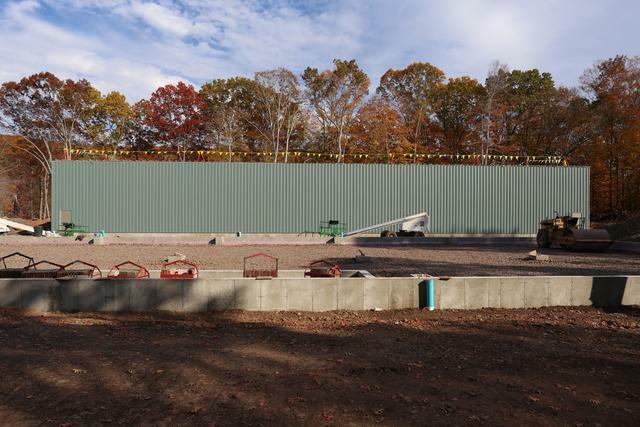 The completed wall can be seen on the far side. 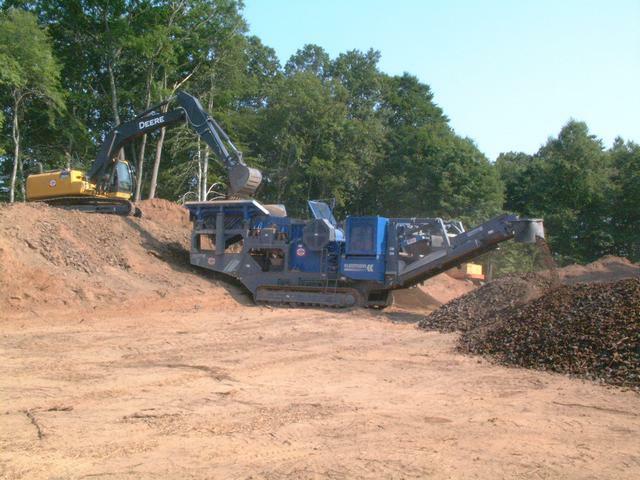 Sep 27, 2013 : This screener machine was used to process the raw crushed rock, which is loaded into the top of the machine. The stone falls over two heavy wire mesh screens which are constantly shaking. 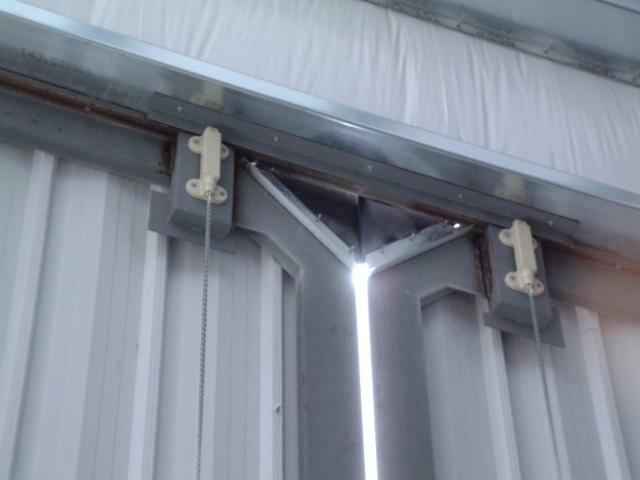 The largest stones (over about 2") fail to fall through the screens and slide down the back chute. Stones between about 1.25" and 2" fall through the top screen and are caught by the lower screen, and exit the conveyor on the right. 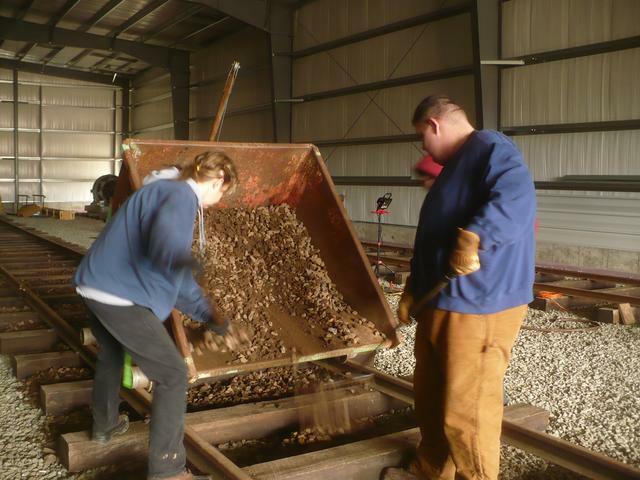 The remaining material consists of fine stone fragments, dust and soil, and exits the conveyor on the left. 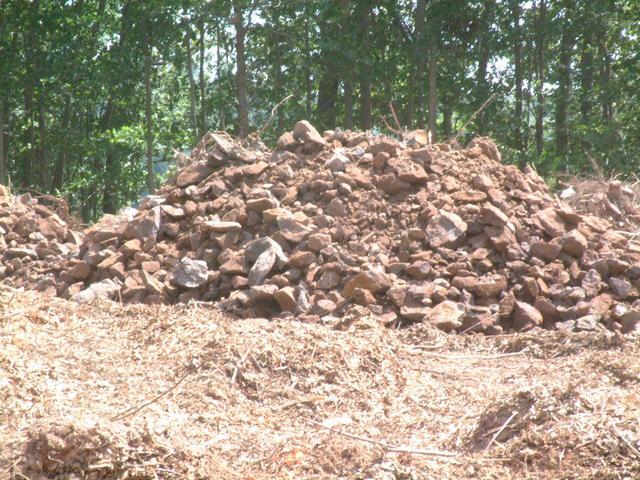 These materials are then stockpiled. 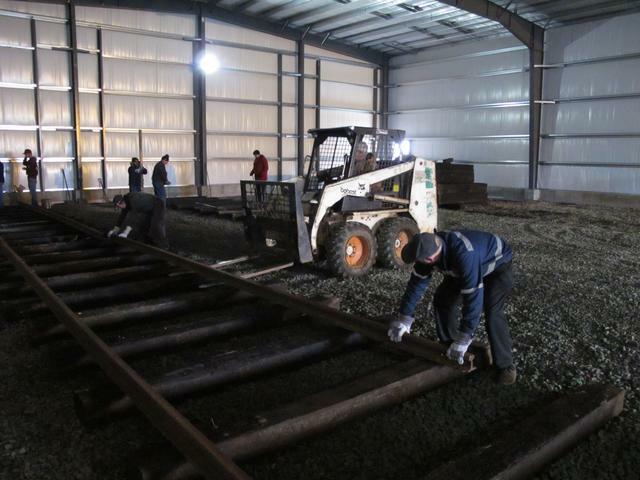 About a week later, screening operations are concluding. 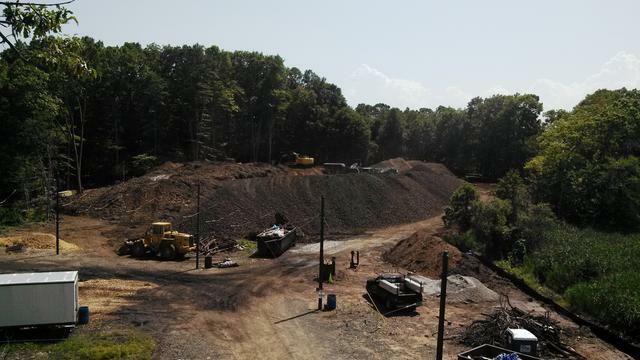 The large crushed stone mountain is nearly gone. 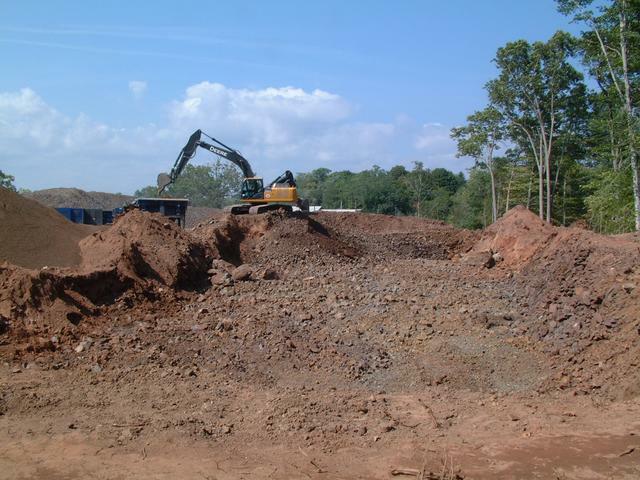 Much of the unscreened crushed rock has been used up in general filling operations in and around the buildings. 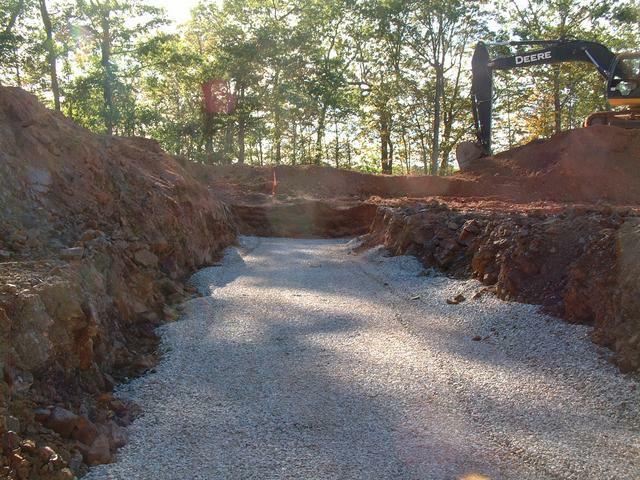 The area where Building 2 will stand has now been brought up to rough grade, about 3-4 feet below finished floor grade. 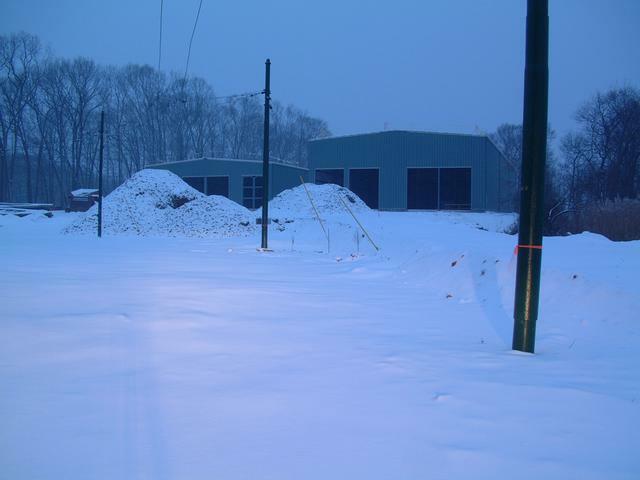 Several large stockpiles of the screened stone can be seen, including about 1000 yards of track ballast piled behind E.H. Blossom Barn. 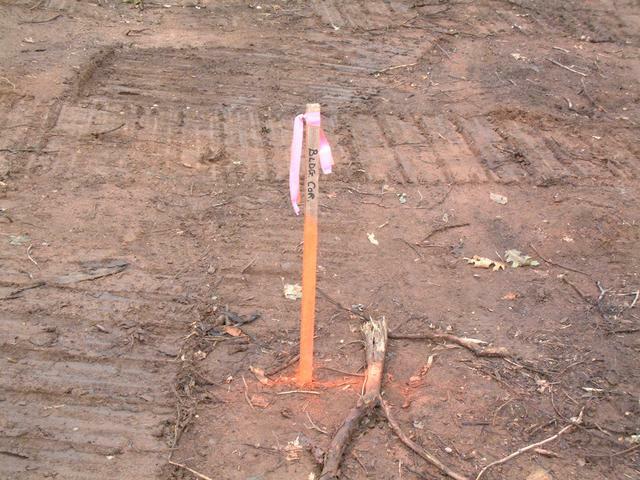 The cone and stake mark the center point of the new Edwin Burch IV Memorial Loop. 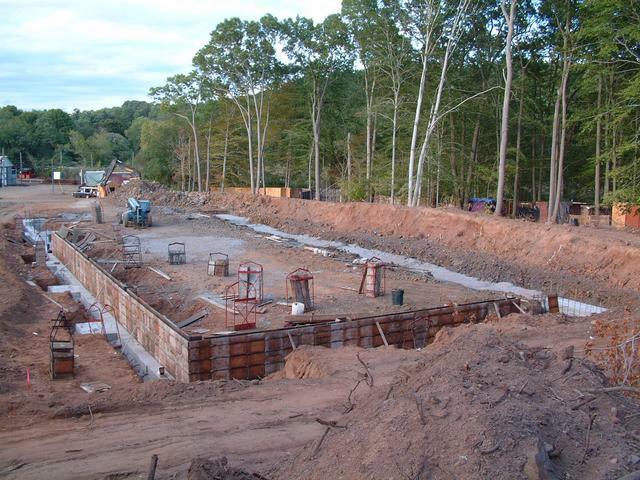 Around October 1, just the front walls and last side bays remained on the foundation pour. 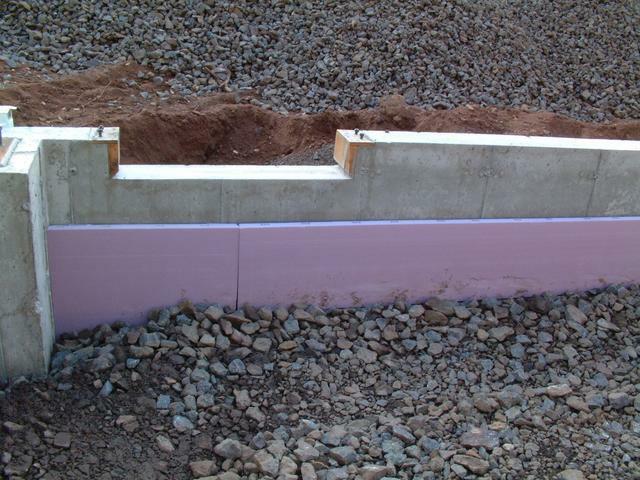 These protrusions left behind from the form dowels will be invisible far below grade, and they'll help retain the foundation insulation panels during backfilling. Note the egress doorway midway along the east wall of building 1. 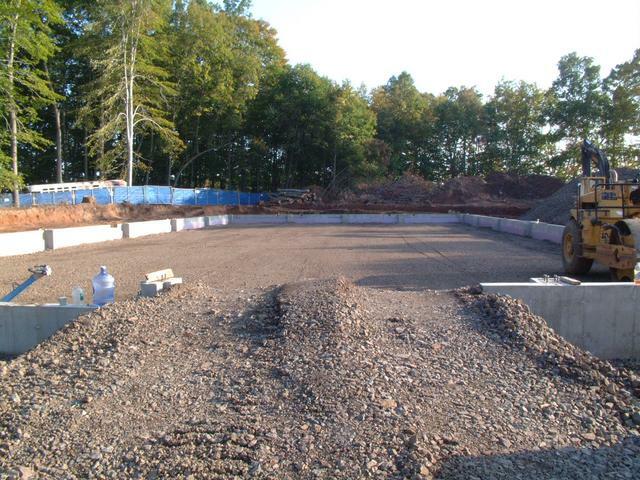 October 4, 2013: foundation work is complete, the footings have been back-filled, and filling is taking place inside the building perimeter. 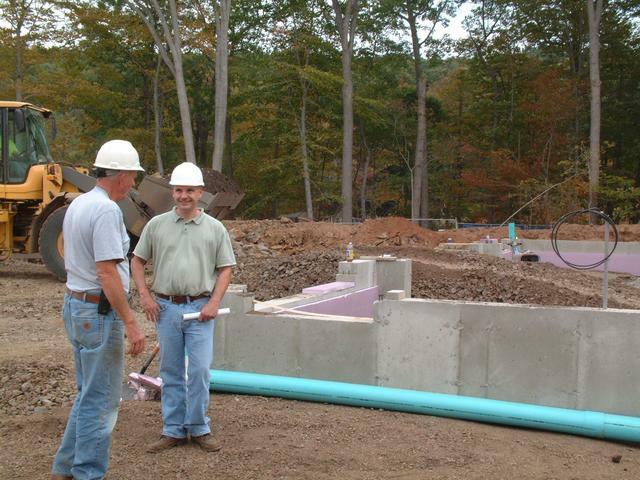 Here Sven (Munger Construction Co. foreman) and Rob (Vice President of Pasqualini Construction, the site work subcontractor), discuss the grading. 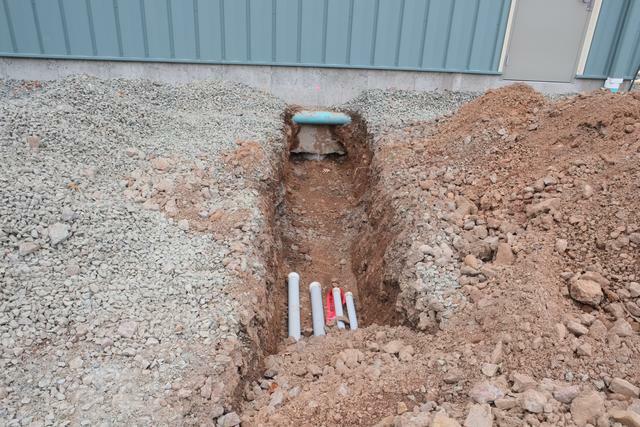 6" Schedule SDR-35 drain piping will pick up the discharge of the roof gutters and downspouts, and convey the water to another pipe across the south end of the project which will lead into the storm water retention basin. 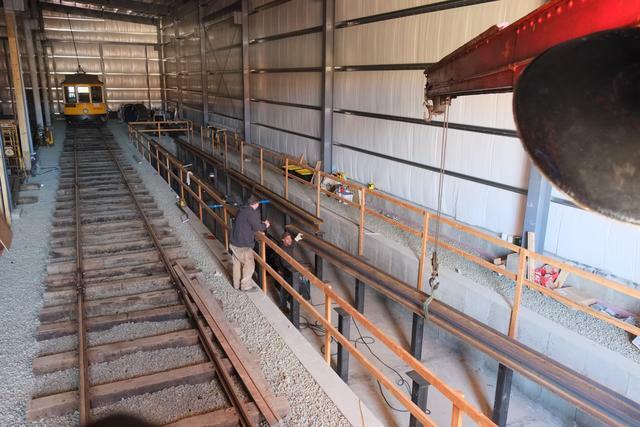 This temporary ramp is on the future alignment of track 83, and allows construction vehicles to get inside the foundation wall perimeter. Egress door in the southwest corner of building 1 (aka building 8). 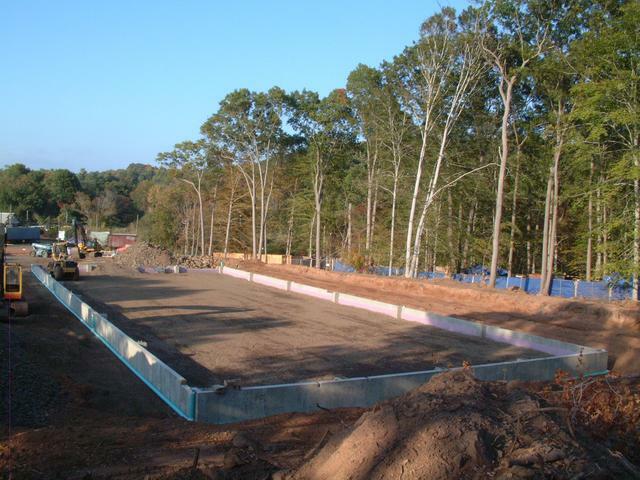 The foundation wall forms a curb 6" above the finished floor elevation. Thus the doorway drops down. Note the foundation wall frost insulation. 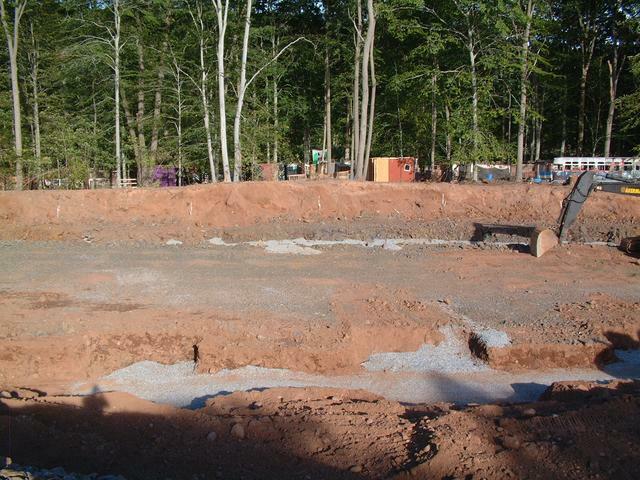 From the topsoil pile behind the building looking north, showing the entire complete foundation. Looking north along the east wall. 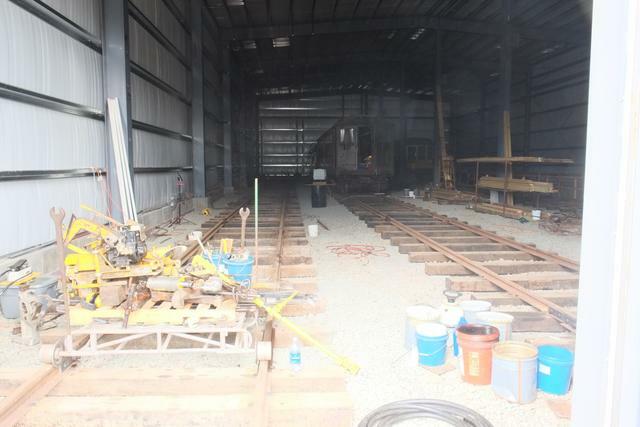 This is the future doorway for track 81. Note the double step down: first a drop of 6" from curb height to floor height for the door jambs, which are 4" heavy C-channels. 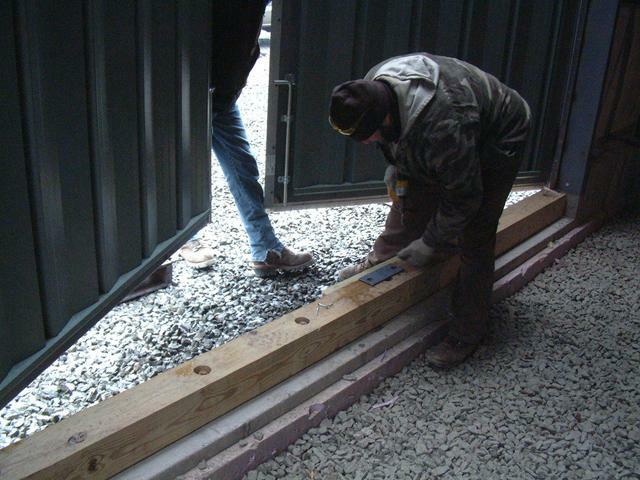 Then a second drop to 6" below floor height to allow for the rails. 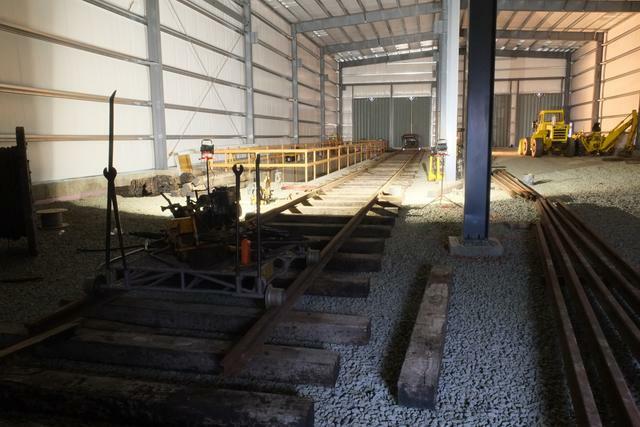 Once the track has been installed, aligned and leveled, the concrete floor slab will fill in this large area and embed the rails. 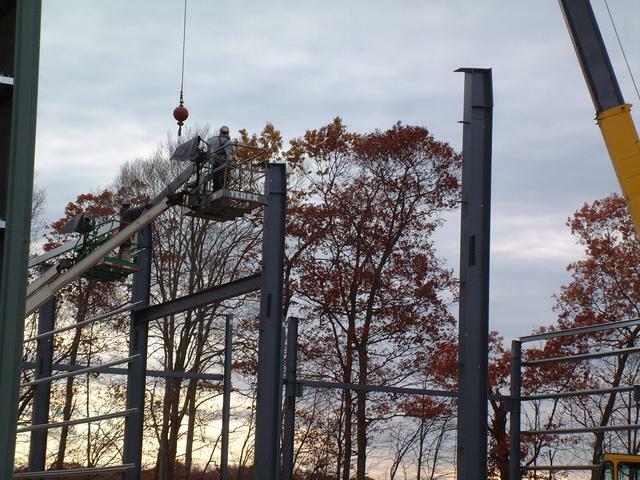 Building 1 Steel Is Up! 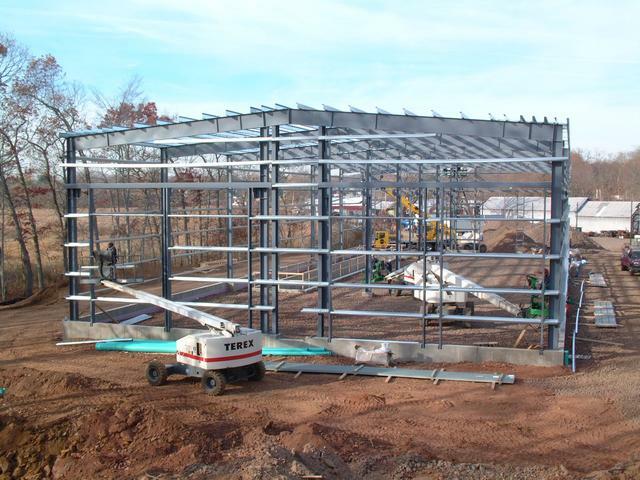 Oct 14, 2013: In just a few working days, the steel superstructure of building 1 has been erected! 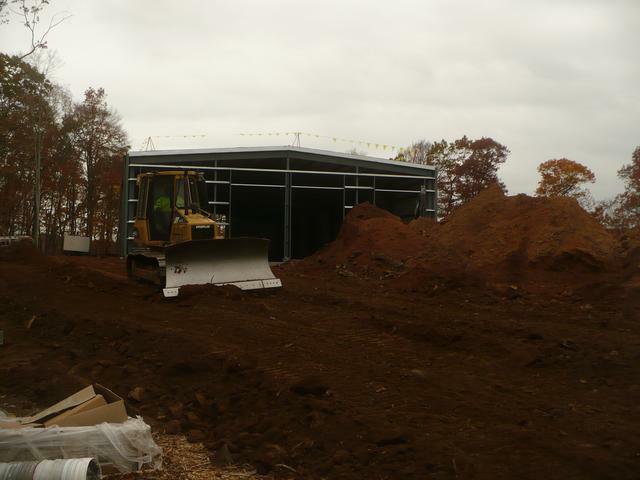 On Oct 10, First Choice Builders (the iron work subcontractor) mobilized and moved the building components inside of the foundation perimeter. 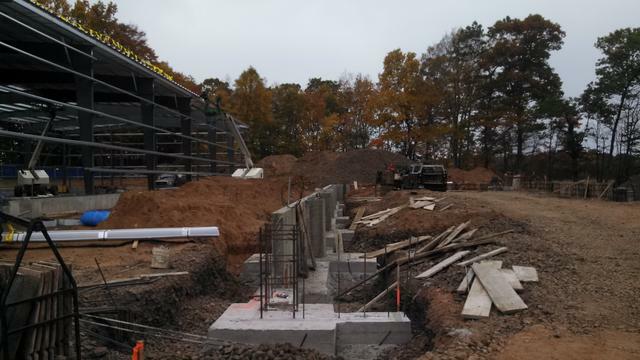 By Oct 11, the first 6 column lines are up (starting from the back of the building) and some wall girts have been installed to stabilize the structure. 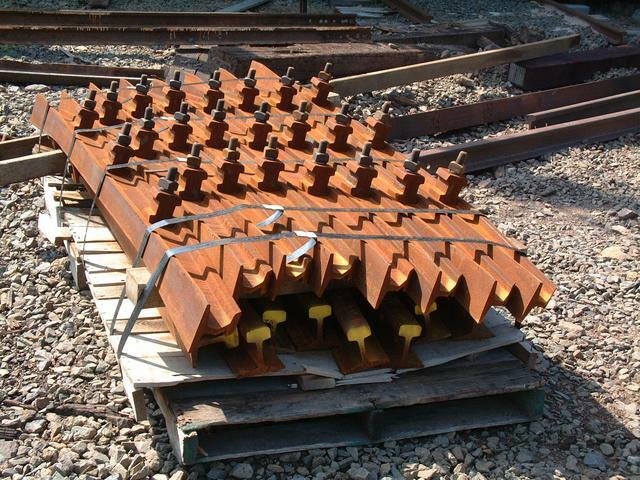 These are the Z-shaped wall girts which are bolted to clips on each column. 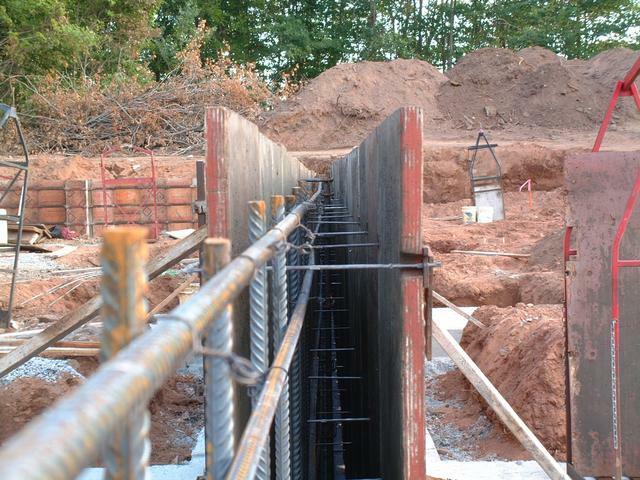 Each girt overlaps the other by a few feet at the joint. The wall sheets will be screwed to the outside face of the girts. 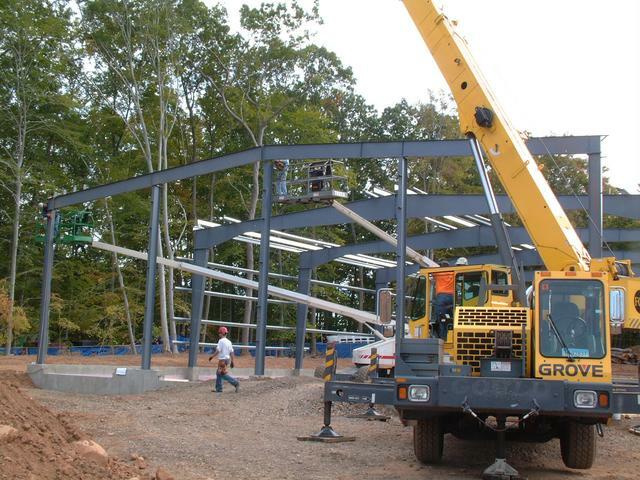 Oct 14, 2013: Looking skyward from the back of the building, lines 7,6,5,4 and 3 have been completed with roof beams assembled to the columns. 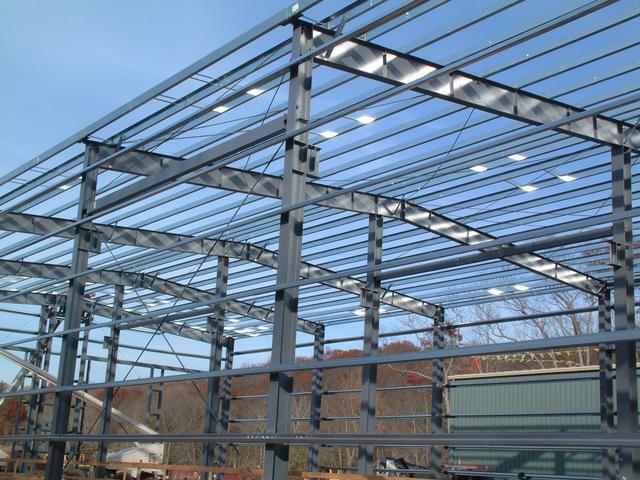 Each frame consisting of the two columns and the roof beam is considered a "rigid frame" which is capable of resisting being distorted into a parallelogram by crosswide wind forces. 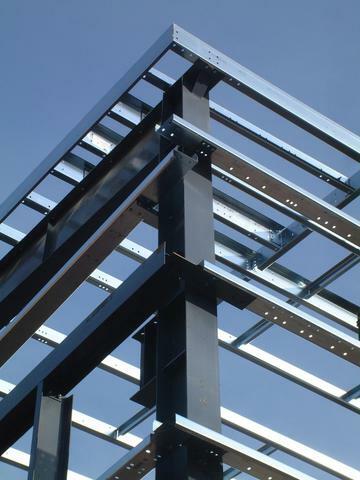 However the structure requires bracing to resist forces acting along the length of the building. 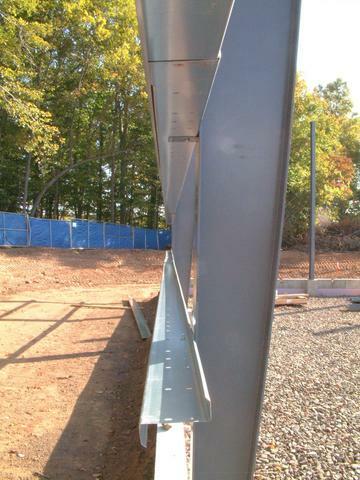 That is the function of this X-brace inside the wall, and similar bracing which will soon be installed in the roof bays. The threaded brace rods are held in tension by nuts and a special curved washer. 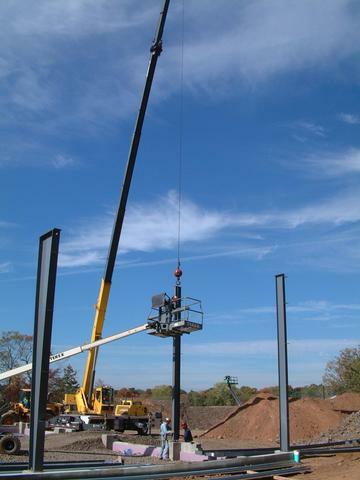 Setting columns on frame line 2. 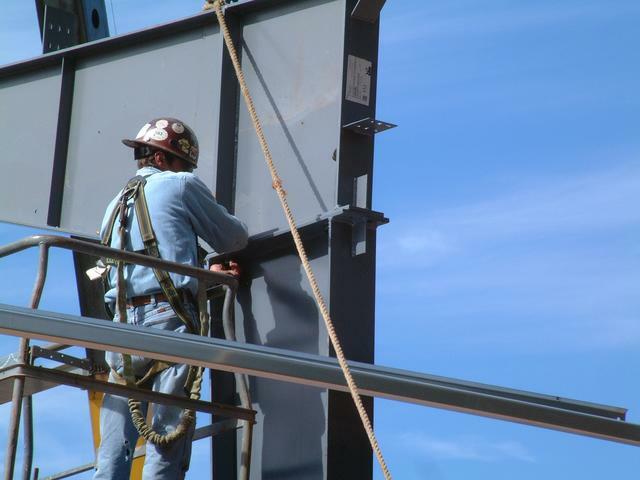 The column is picked up by a crane and dropped on the anchor bolt plate. 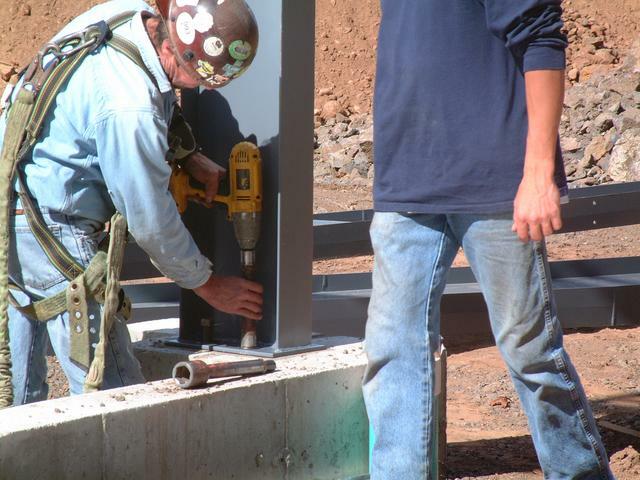 Construction workers guide the column into place and line up the holes in the bottom plate with the 4 anchor bolts, then bolt it down with an electric impact wrench. 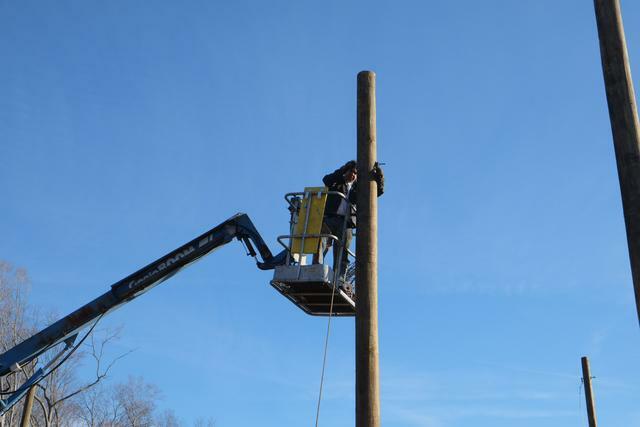 A worker in the aerial lift then disconnects the sling from the top of the column. 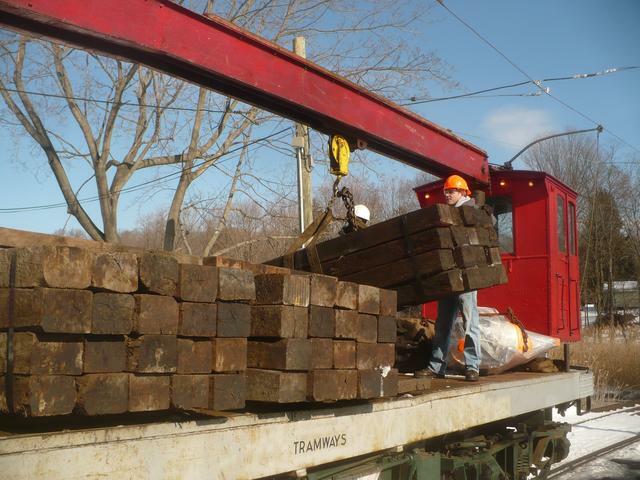 As columns are set, girts are lifted and set on the column brackets. 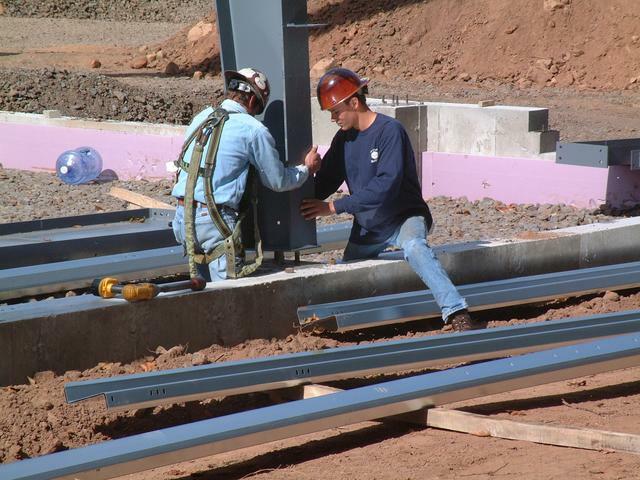 The construction worker uses a "spud wrench" with a tapered end to line up the holes, then puts in one temporary bolt to hold it in place. 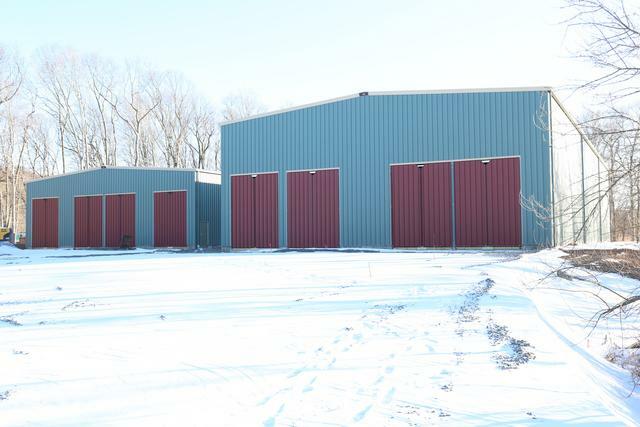 Each building is 70' wide. 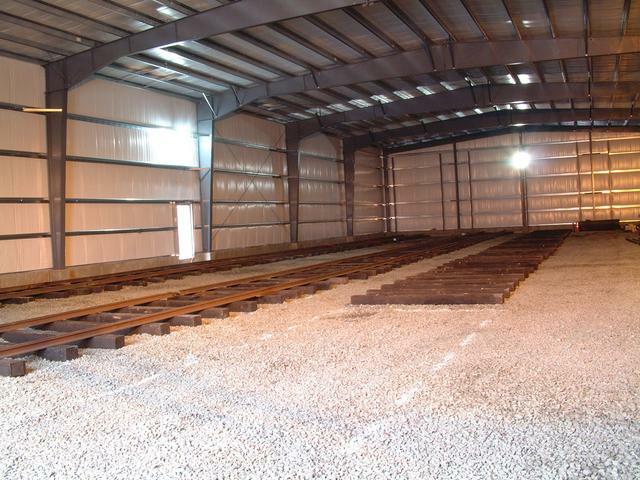 A single roof beam of this size would be too long to ship without an expensive oversize permit, so the beam is made of two pieces which are bolted together on the ground. 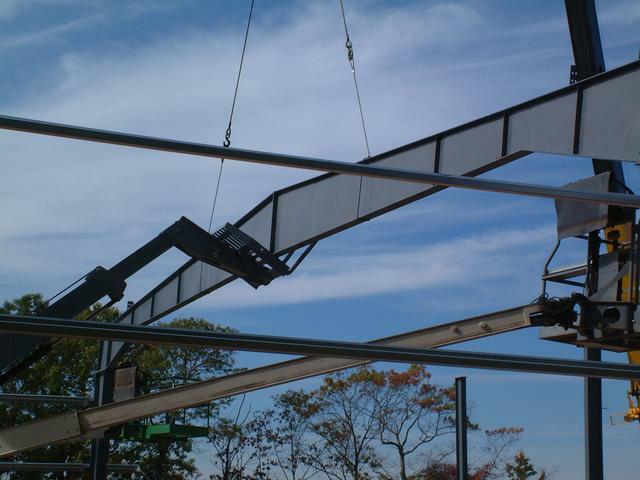 Then the assembled beam is craned into position. 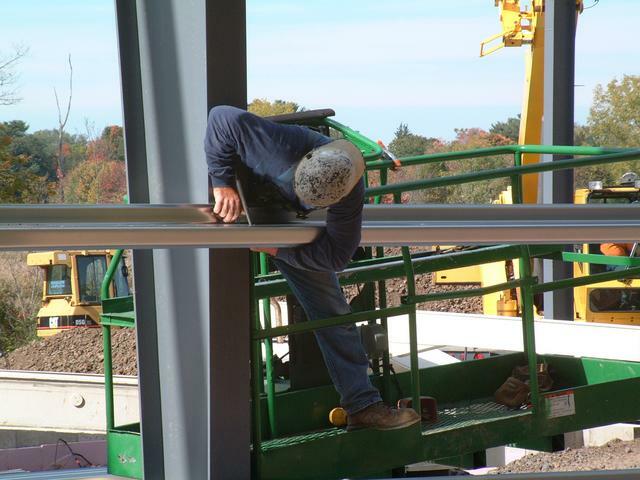 A worker on the ground with a "tag line" helps to stabilize the load as it is guided on top of the columns. 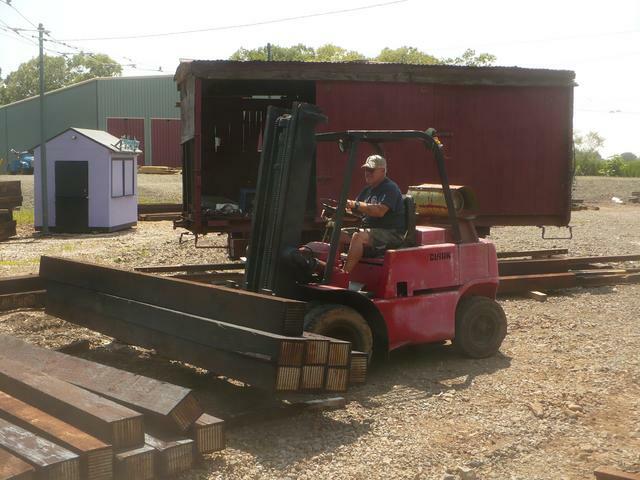 This telescoping forklift was used to prop up the beam until it could be completely bolted down. The aerial lifts are repositioned to remove the crane slings. 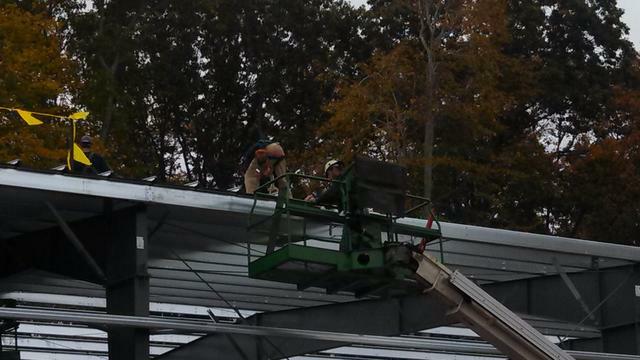 Next some roof purlins are placed and temporarily bolted down. 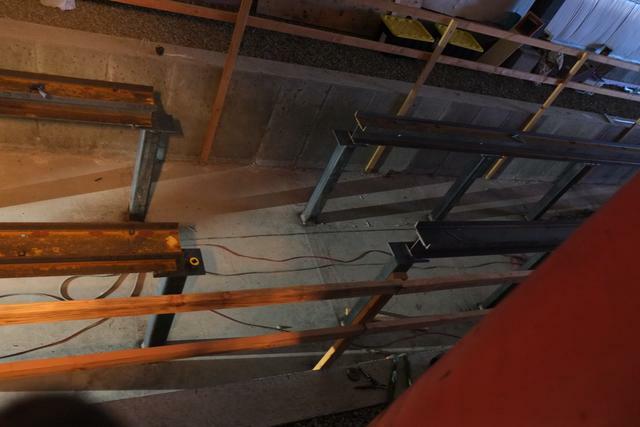 These will ultimately hold up the roof, and for now will stabilize the structure in lieu of the diaphragm action that the roof and wall sheets will provide. 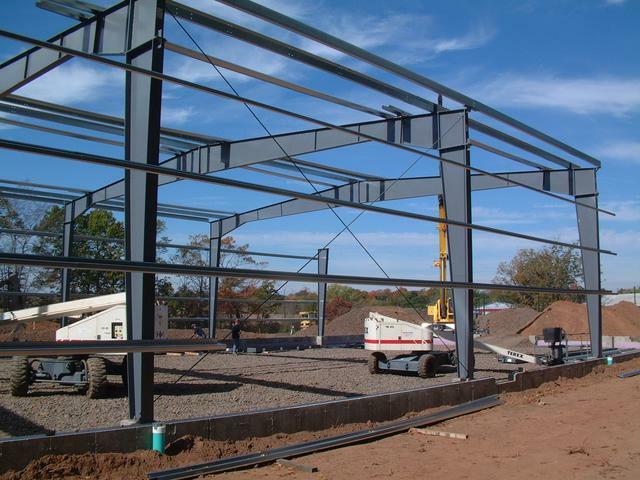 Frame lines 1 and 7 are the end walls and are of different construction. 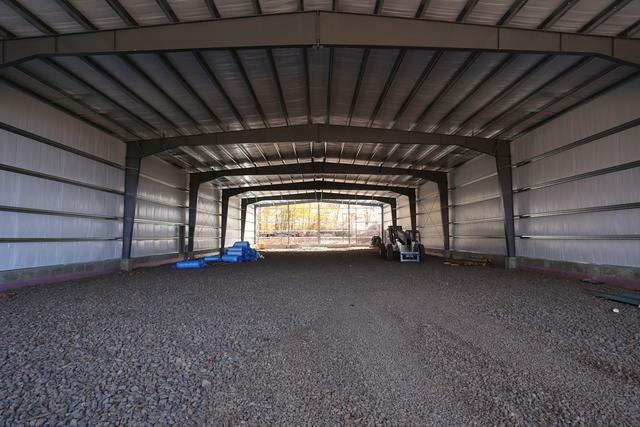 They bear only half (approximately) of the load compared to the side columns, and since they are end walls, additional columns can be used which will not interfere with the open floor plan. Therefore these columns are considerably smaller. 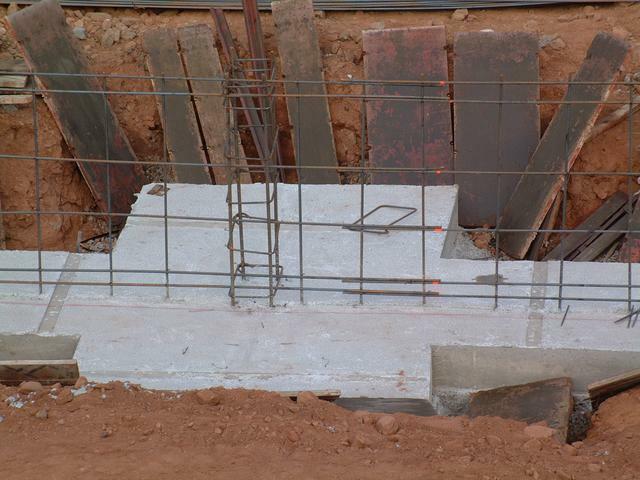 Here one of the columns of the front wall is set down. 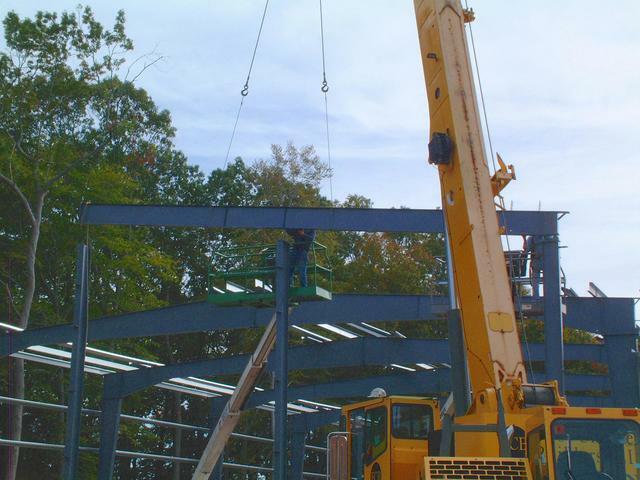 The last roof beam is placed on the front wall. And building 1 superstructure is complete! 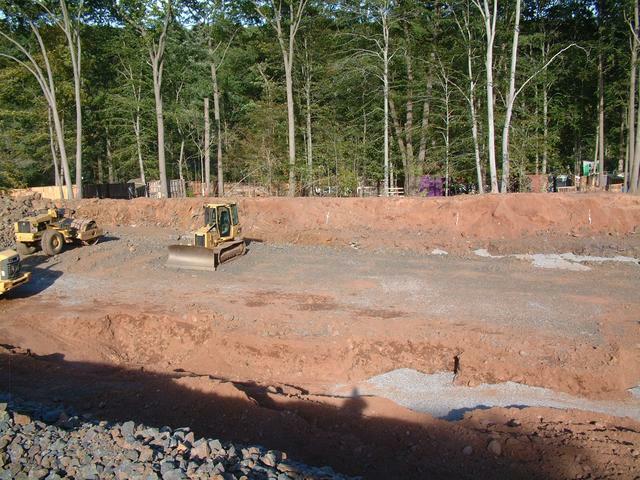 Oct 11, 2013: The excavation begins for the west side of building 2. 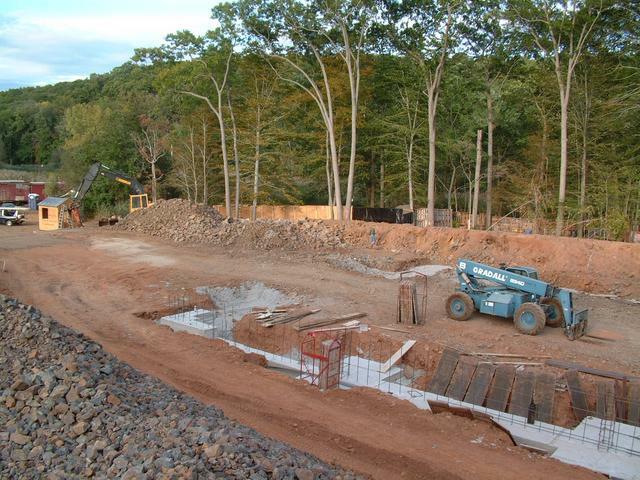 The new pit track is on this side, and the footings for the wall will overlap the pit floor slab. Therefore both are being done at the same time. 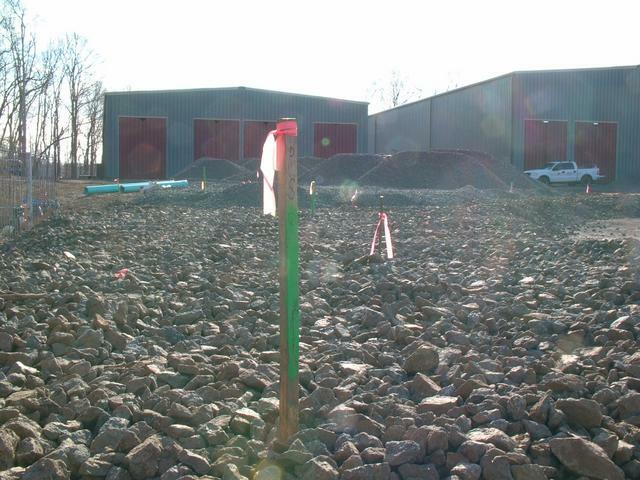 The orange stake in the foreground represents the west building line, and we are looking south towards the back of the building. The pit is 100 feet long. 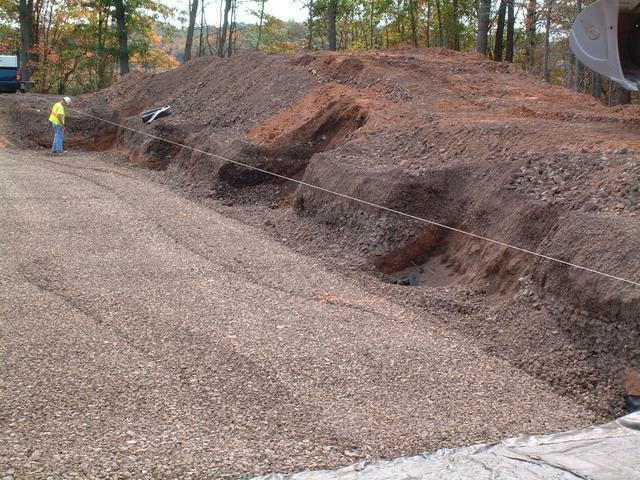 Oct 14, 2013: 3/4" crushed stone that was made on-site is spread on top of a geotextile fabric. 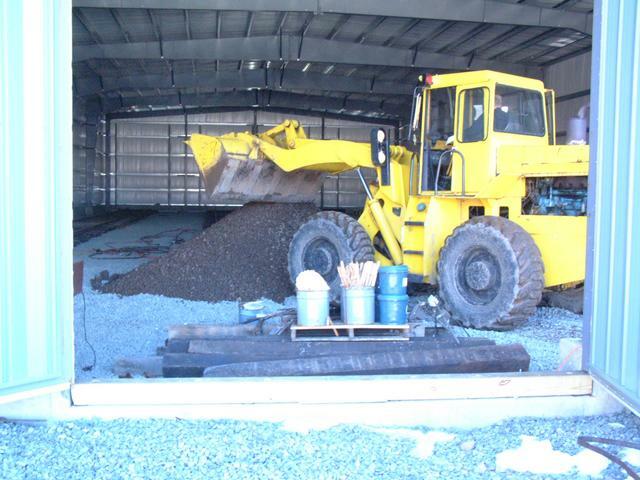 A portable compactor is used where the steamroller can not reach. 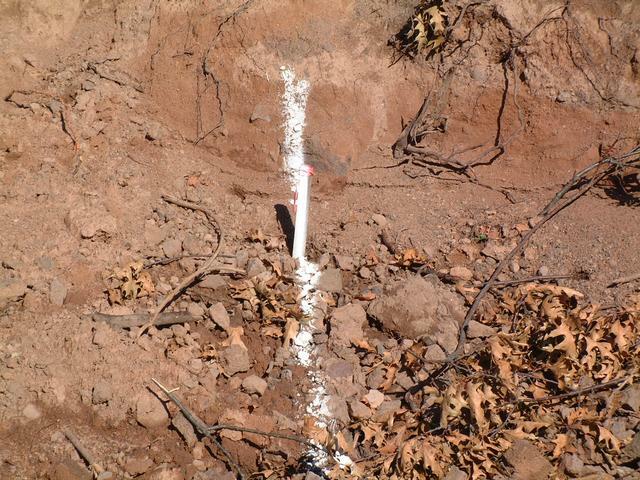 A string line is stretched over the control point that marks the west building line of building 2. 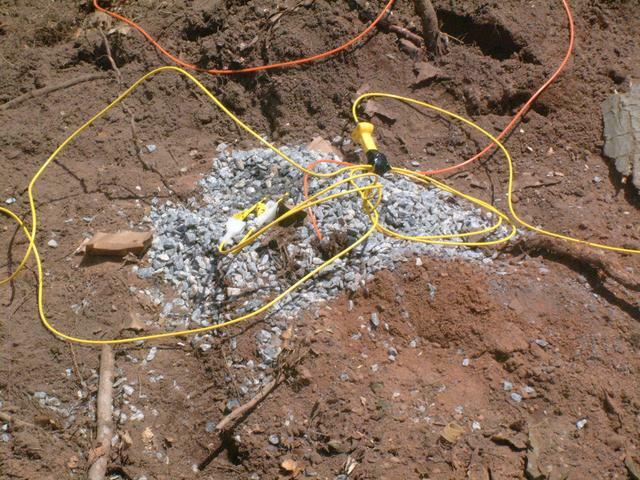 From the taut string, a plumb-bob is dropped to transfer the line to the bottom of the excavation. 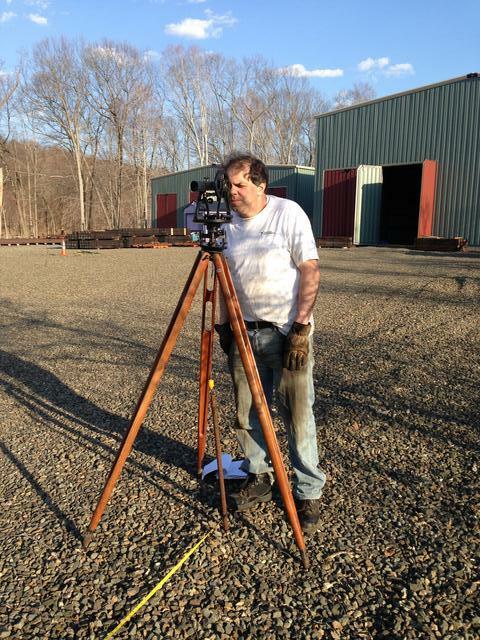 Rob from Pasqualini Construction uses a grade rod with a laser detector to find the laser reference line established by the rotary laser (not visible in photo). 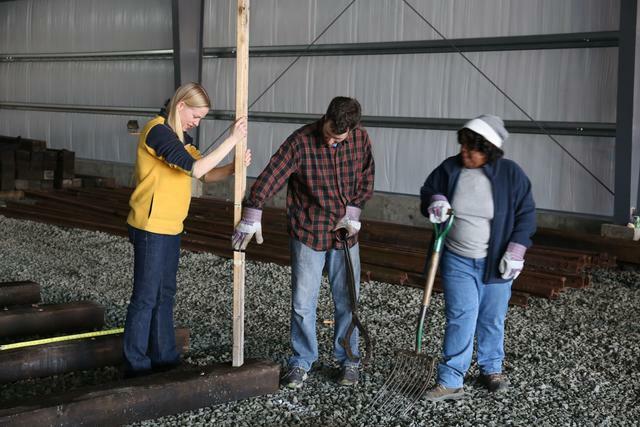 He is then able to tell exactly how far down the bottom of the footing must be by subtracting the computed number of feet and inches from the reference line. 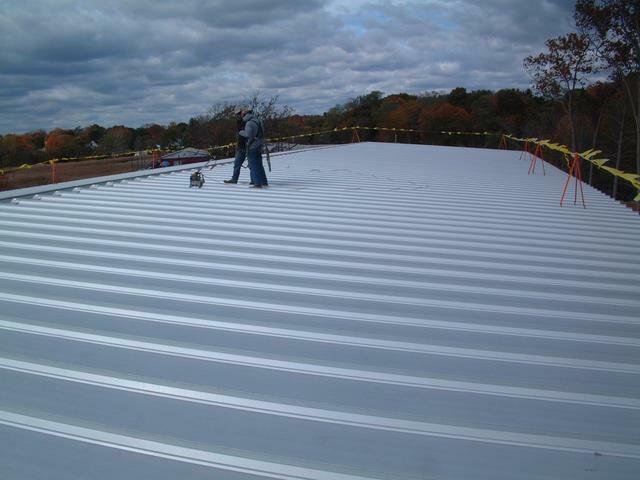 Oct 21, 2013: Installation of roof sheets began on the north end of building 1. Bracing struts where the end and side walls meet. 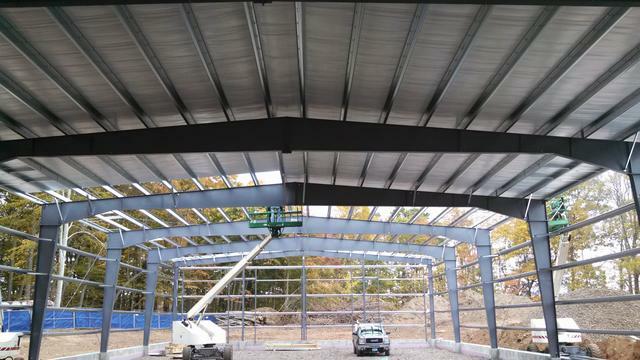 By Oct 23, the roof is 75% done. 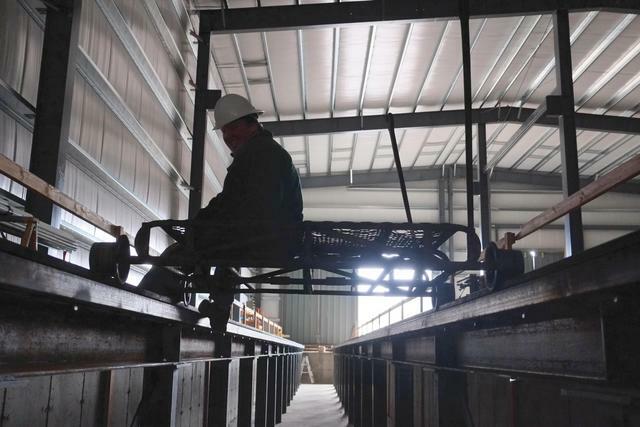 Workers use this platform lift to safely access the roof structure. 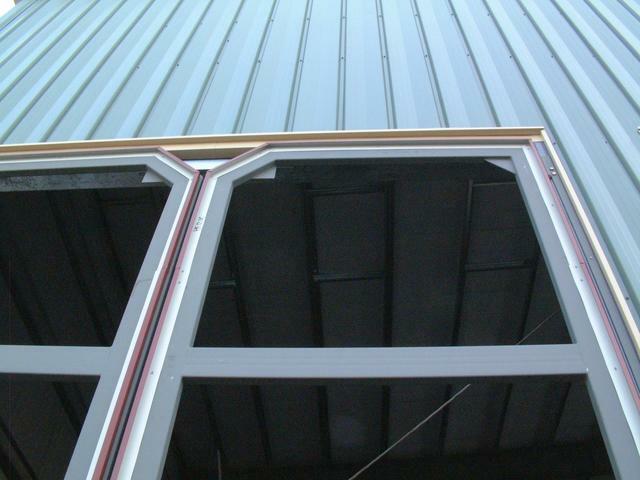 X-braces in one of the roof bays along with those in the wall bay provide the required longitudinal stiffness. 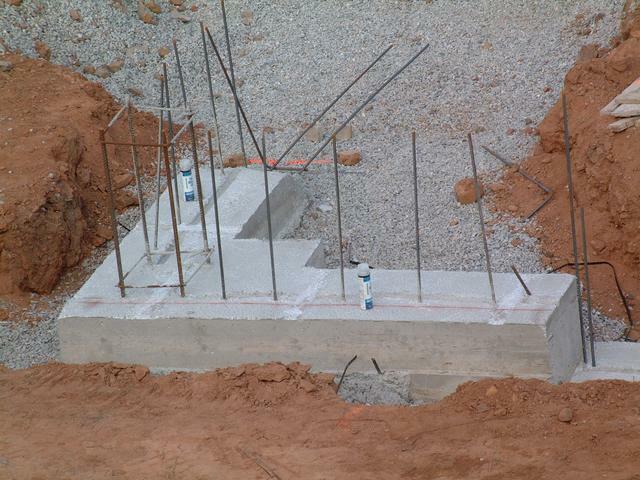 Angles have been applied to the foundation wall. These will support the bottom of the wall sheets. Note the thin layer of foam insulation to provide a "thermal break". 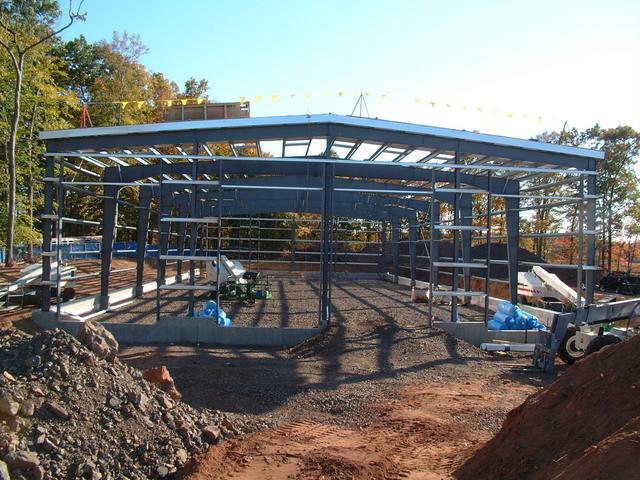 By Oct 25, all roof sheets have been installed. 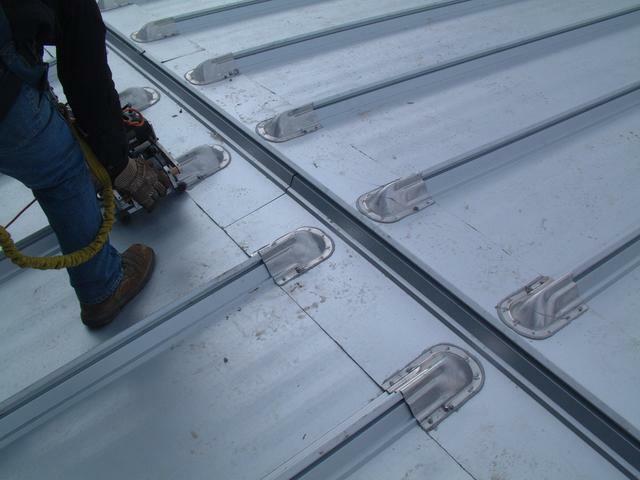 The joints between the sheets are made using a "standing seam" which eliminates any penetrations of the roof membrane by fasteners. 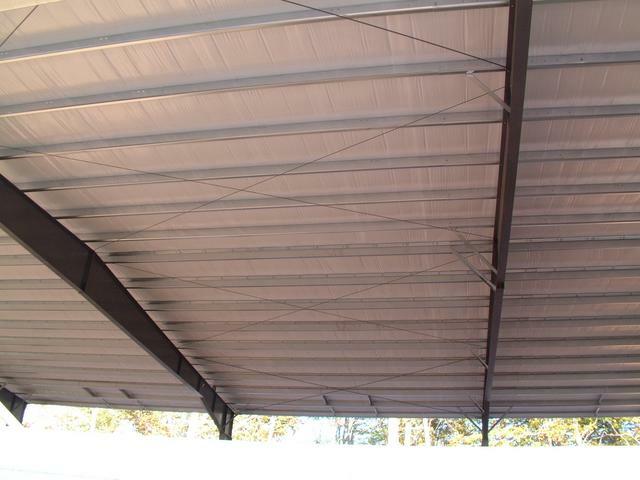 The sheets are clenched around protruding clips which are anchored to the purlins. A special crimping machine then crimps the edges of the sheets around the clips. There is also a seal inside the crimped joint. 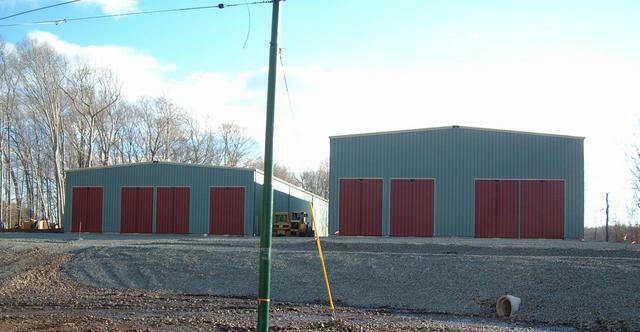 View from the north end (railroad west)	of building 1. 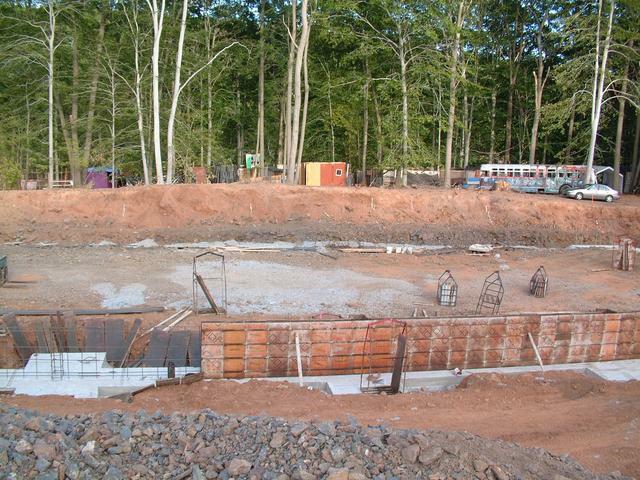 Footings and walls have been completed for all of building 2 except the front wall and the interior columns. 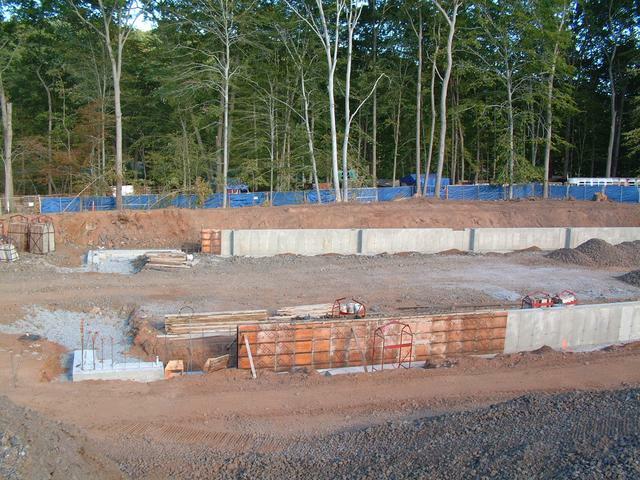 Here we see a section of the east wall formed up. 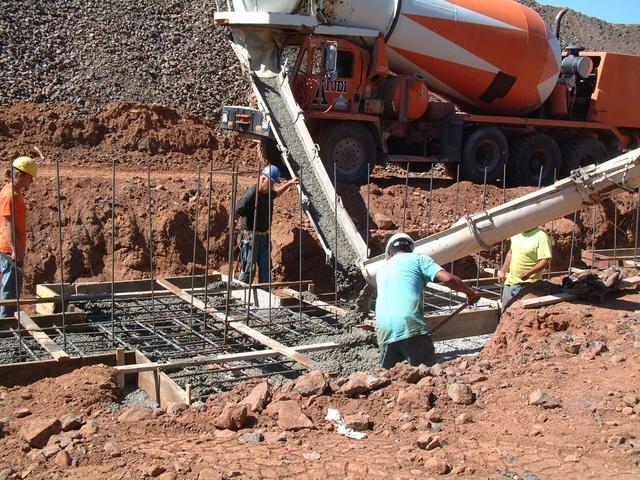 Concrete has just been poured and is being finished. 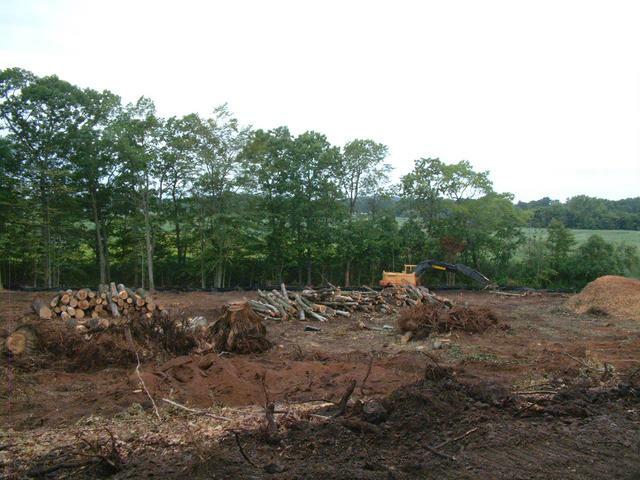 A few days later, the forms have been stripped. 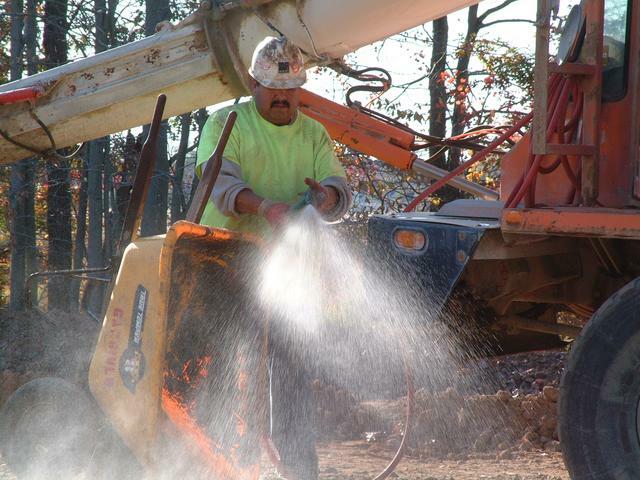 One of the concrete workers washes off the tools. 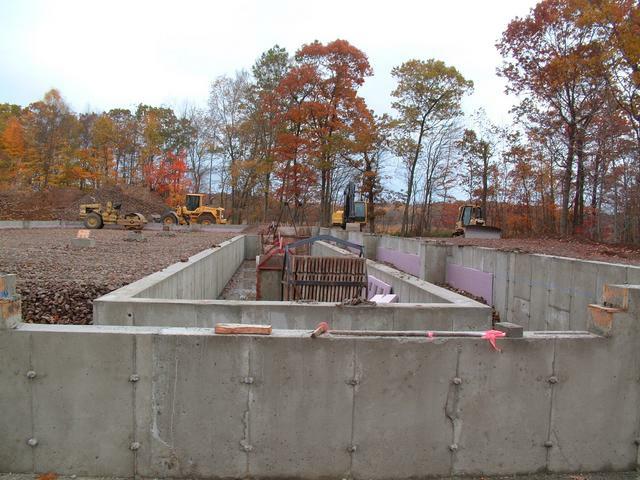 Building 2 contains provisions for a future maintenance pit. 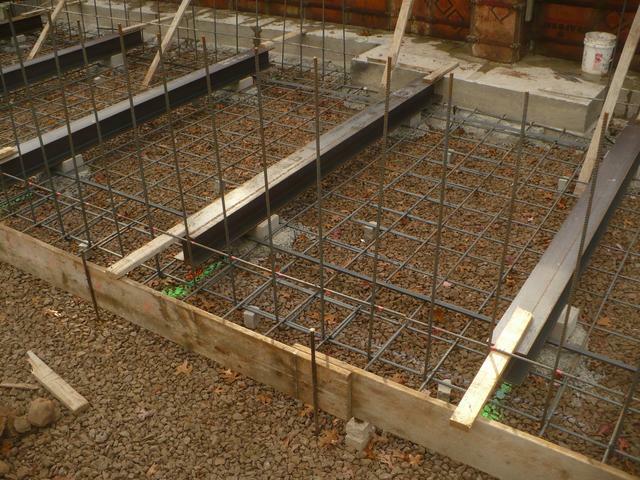 A series of 8" I-beams embedded in the pit floor slab acts to control the gauge and transfer the load into the slab. 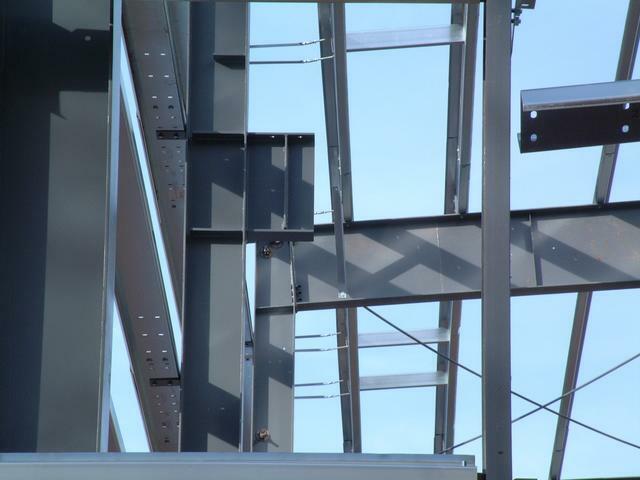 In the future, 6x6 structural steel tube posts will be welded to these beams. 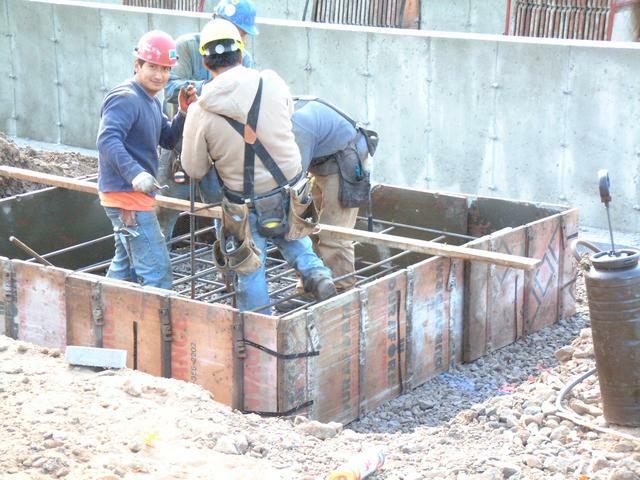 During the slab pour, the beams are supported on cement blocks which are carefully set to the same level using a rotary laser. Oct 24: The pit floor beams are in place along with the rebar mat, and rebar for the walls connected, all ready for pouring. 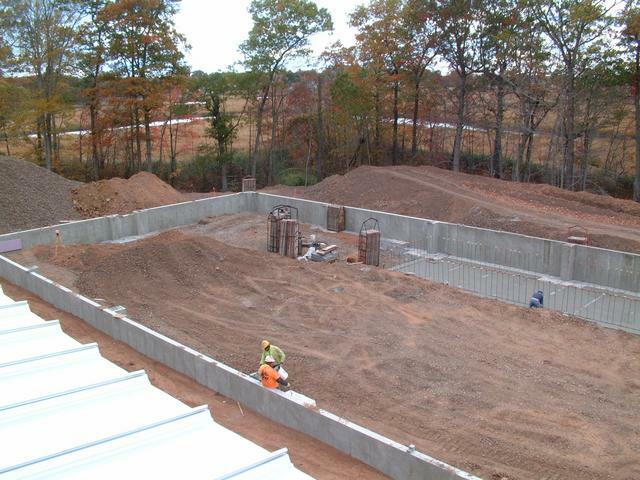 Oct 25: Standing on the floor of the future pit, and aerial views of building 2 taken from the roof of building 1. 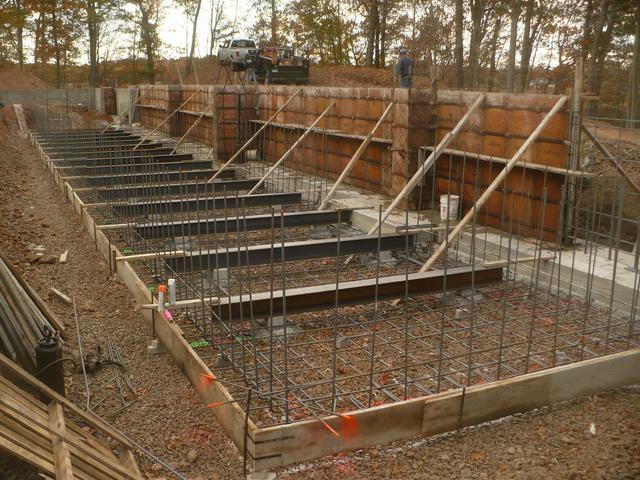 The square holes at the bottom of the east wall are for electrical conduits and future water piping. 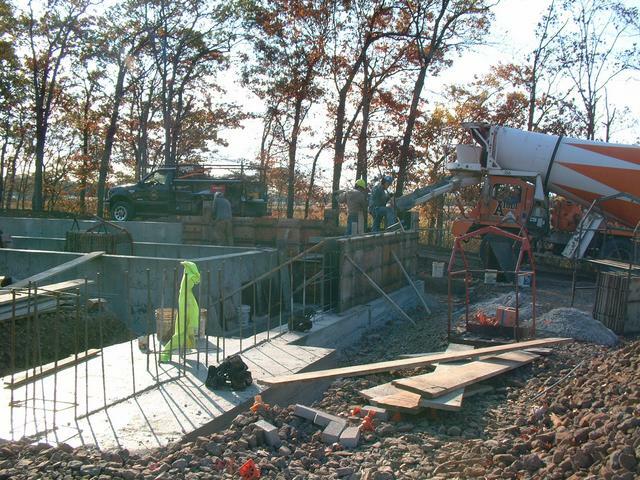 November 4, 2013: The concrete workers were on the job last week, forming up the remaining walls, and the footings and piers for the interior columns of Building 2. 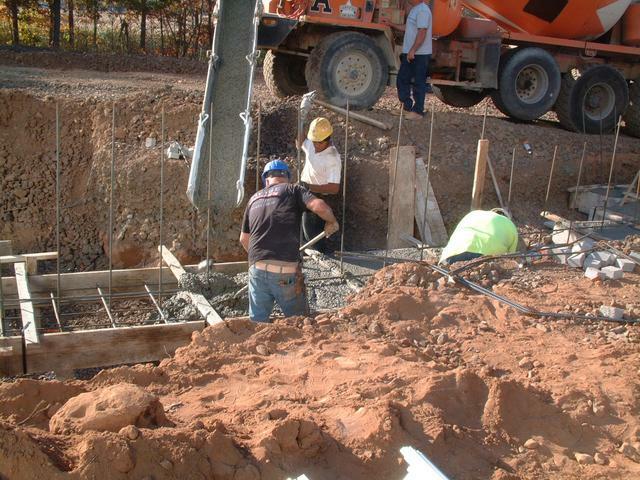 Concrete was poured at the end of the week, thus finishing foundation work. 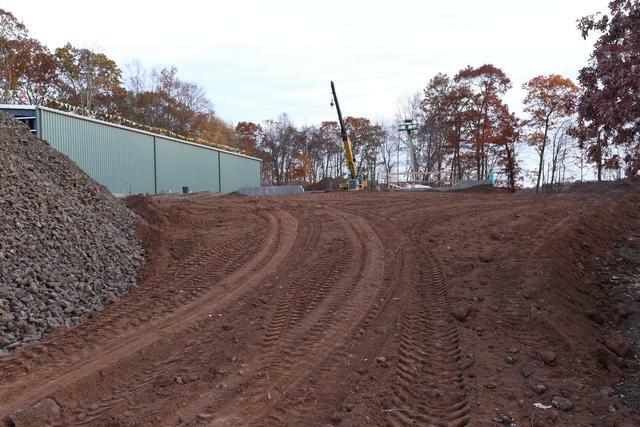 The walls of the future rail car maintenance pit in Building 2 were also finished during the week of Oct 28. 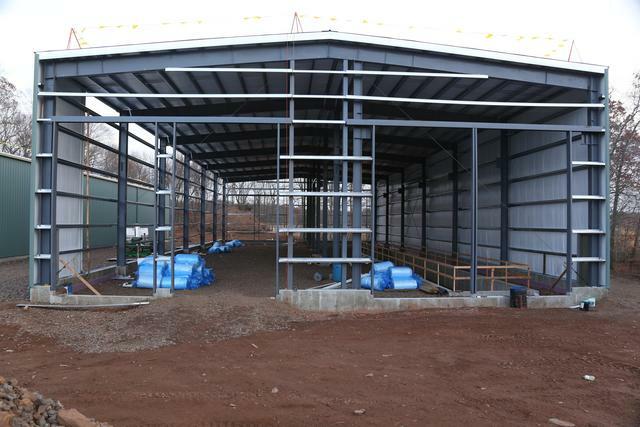 We are standing outside the front of the building looking at the doorway for track 4, with the pit beyond. 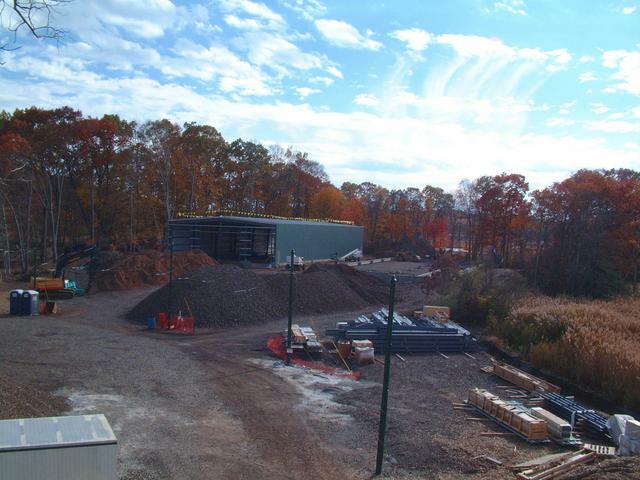 Taken from the topsoil pile behind the buildings, looking north (railroad west) at building 2 foundation, with building 1 on the right. From the back corner of building 2 looking towards the pit. The piers for the interior columns are visible. 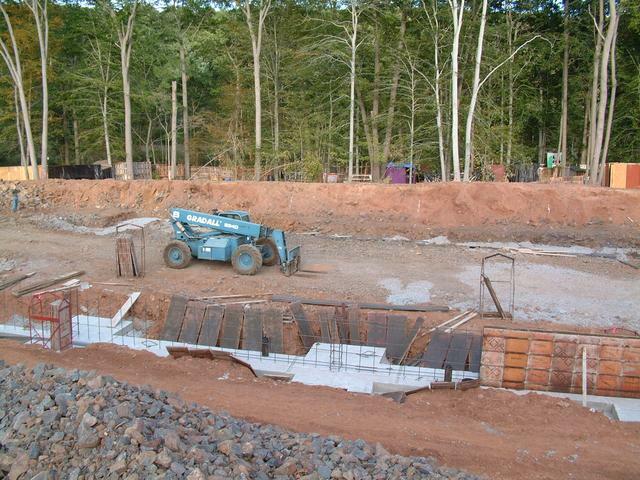 Some backfilling of the building interior has taken place. 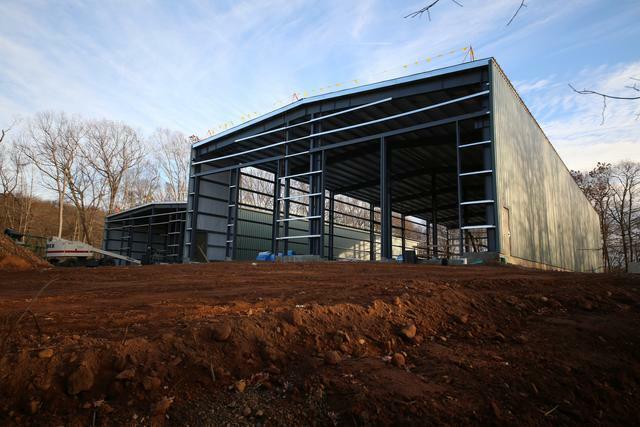 The skin of Building 1 is now complete, with the exception of the end walls. 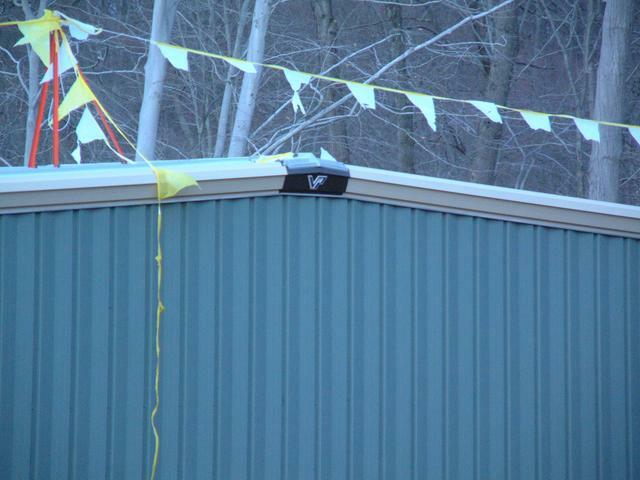 Below is the front of the building. 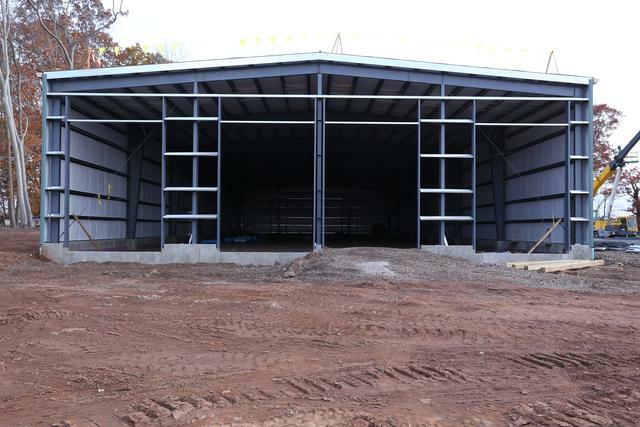 Note the framed openings for the four 12' wide x 16' high doorways. 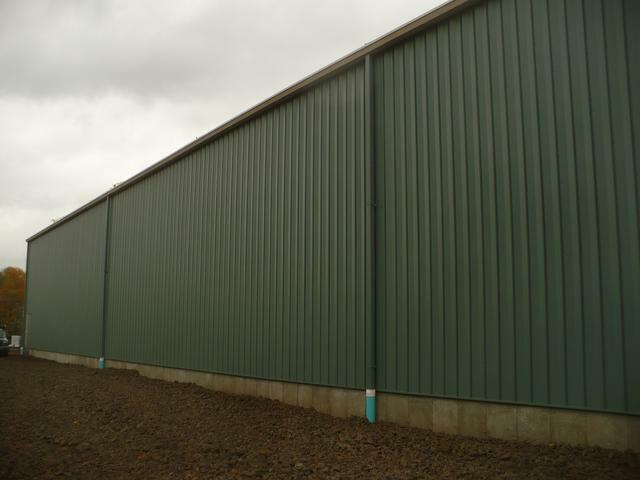 The back wall of building 1. Note the same framed doorway openings as in the front, but with girts across them. 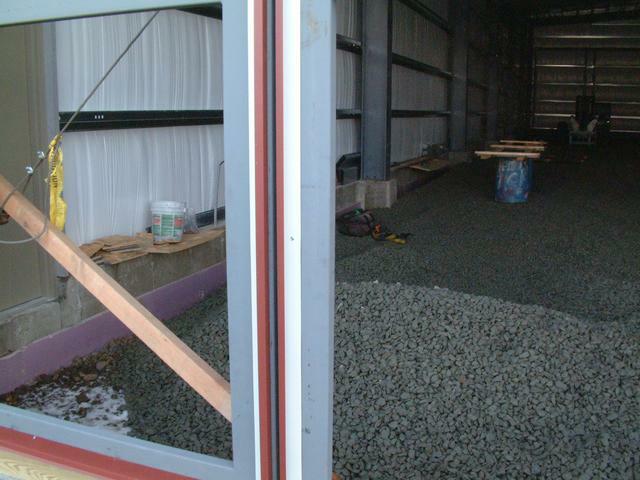 In the future should it be desired to place doors in the back of either building, the framing is in place to do so. 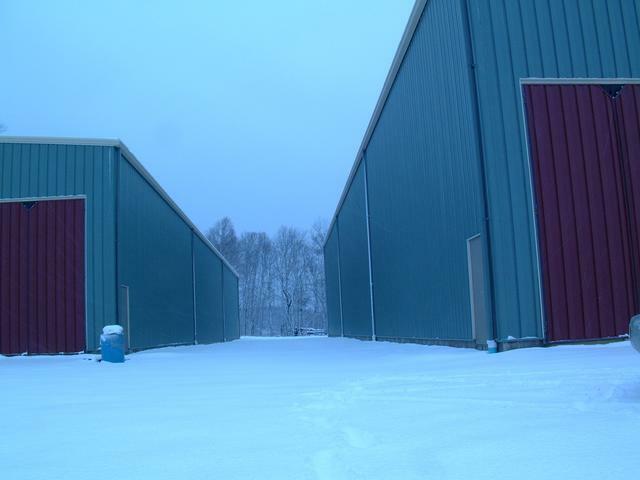 The east (railroad north) side of building 1. 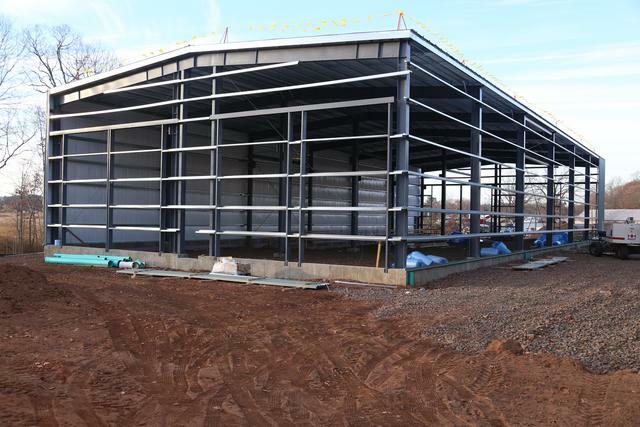 Wide angle view of the entire west side of building 1. 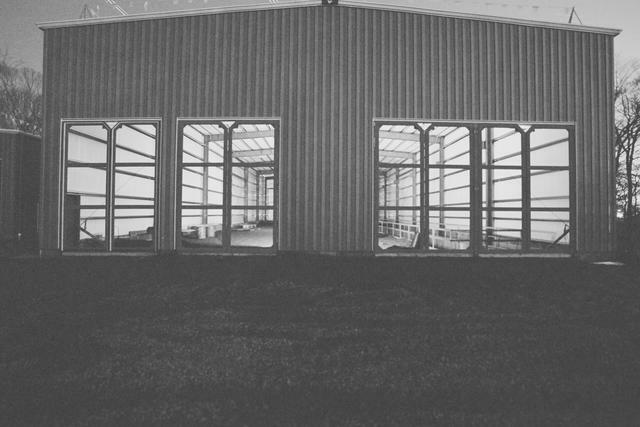 Interior of building 1 showing the 70' clear-span construction. 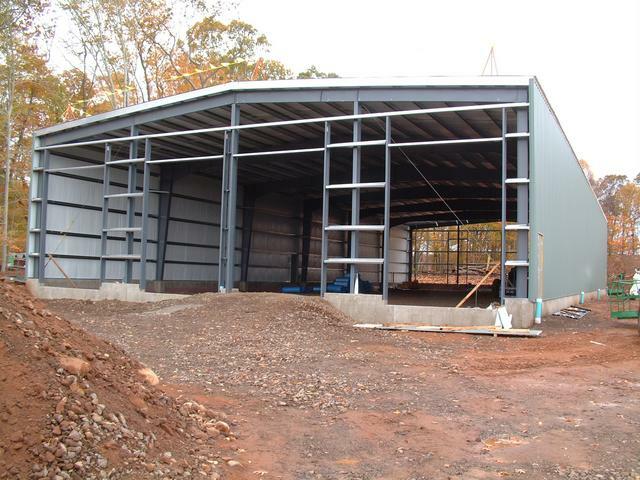 Walls and roof are insulated. 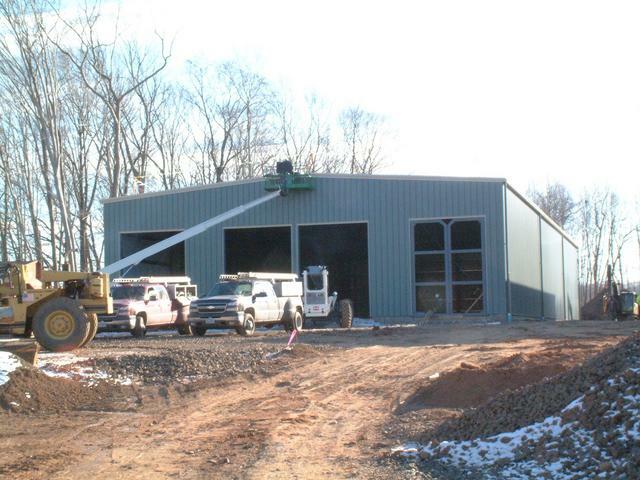 Although this building will not be heated or air conditioned, insulation will reduce temperature and humidity fluctuations. 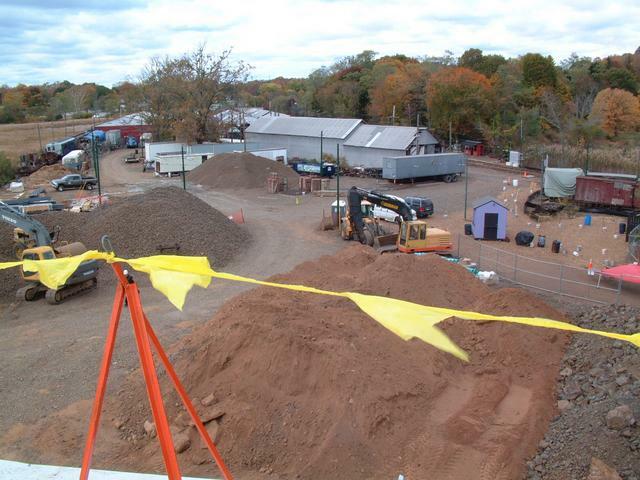 And finally an overview of the entire project taken from about 40' up in the aerial lift. 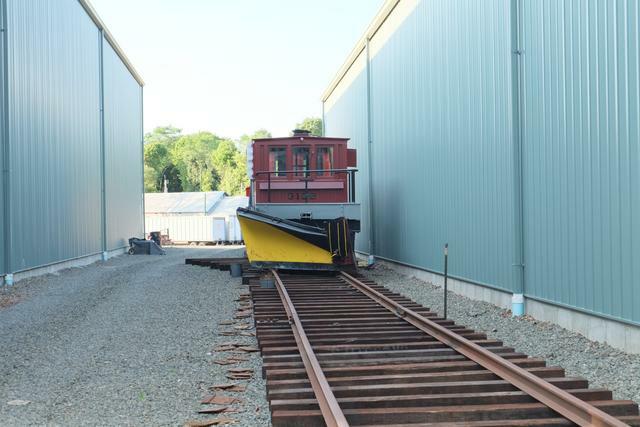 What will be the first new turnout to be installed at the museum in over 30 years has arrived from our supplier, Ohio Valley Trackwork. 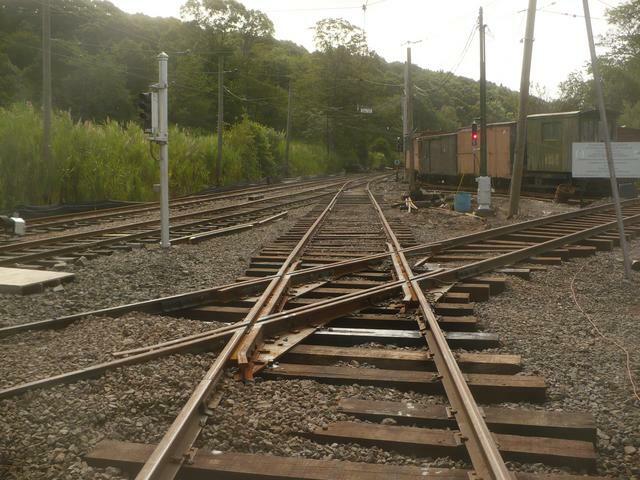 Below we see the #4 double-spring frog which is part of the turnout from the mainline track towards the island. 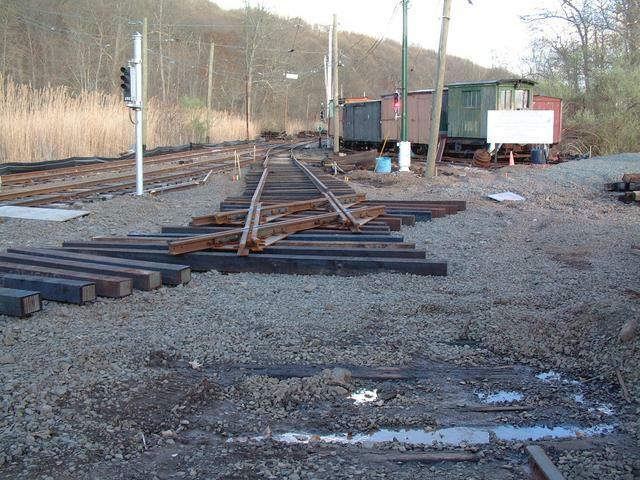 Beneath it are parts of the 35 degree crossing of Narragansett side track. 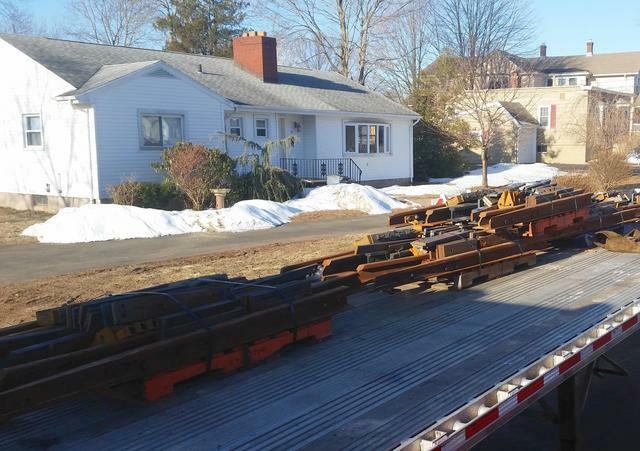 The switch point rails, guard rails and other small hardware were also part of this delivery. 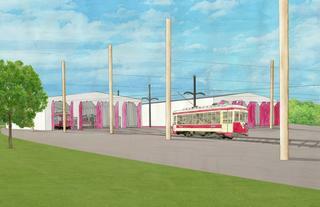 Work will begin to install this specialwork during November and December. 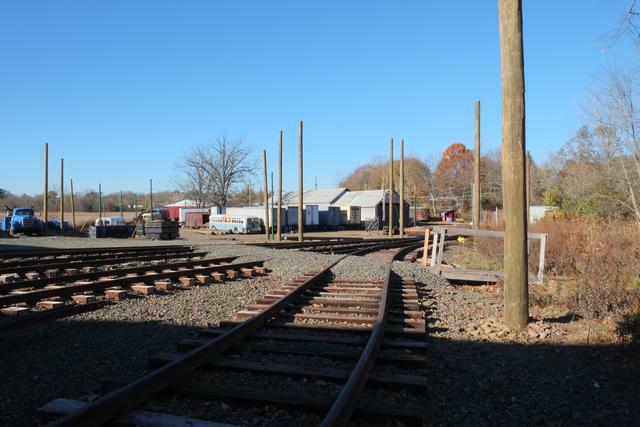 Your donations to the Elevating the Collection campaign will ensure that we have the funding in place to purchase and install the remaining 11 turnouts that are needed to complete the new track plan and allow us to access all of the tracks of both new buildings! 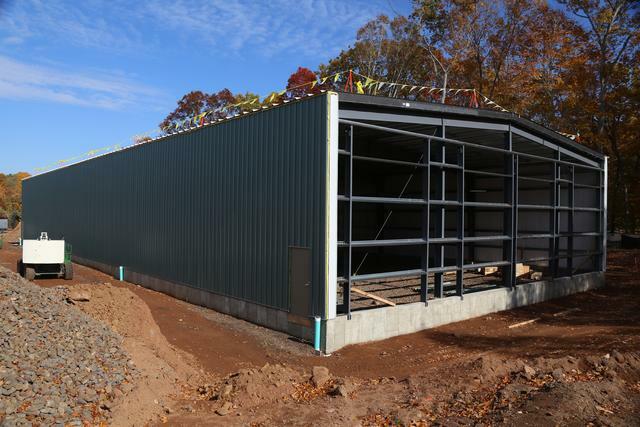 November 7-15, 2013: Building 1 is complete with the exception of the doors, siding and trim of the front wall, and interior finish grading. 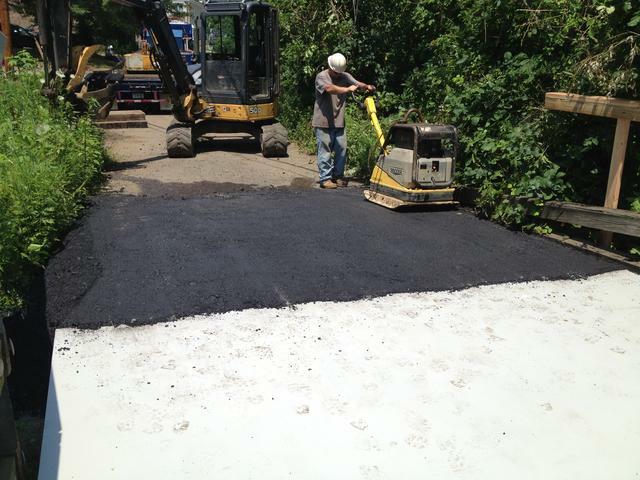 The approach ramps are being rough-graded now. 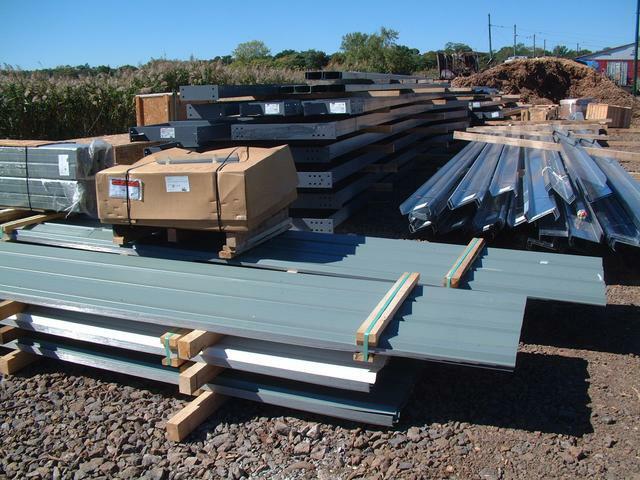 These will contain the track "ladder" for building 1. 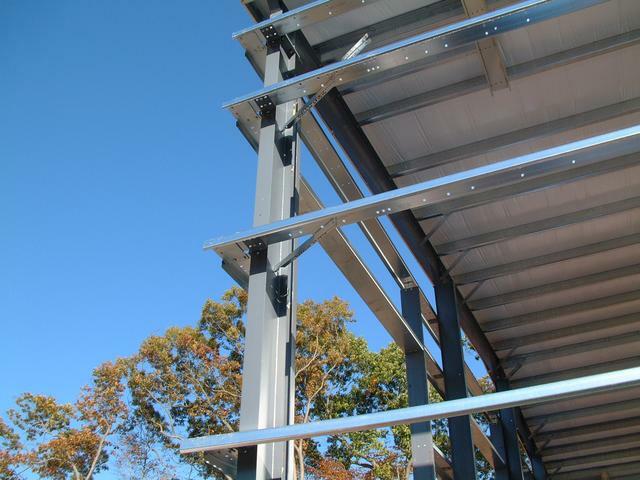 Roof gutters and downspouts being installed near the rear of building 1. 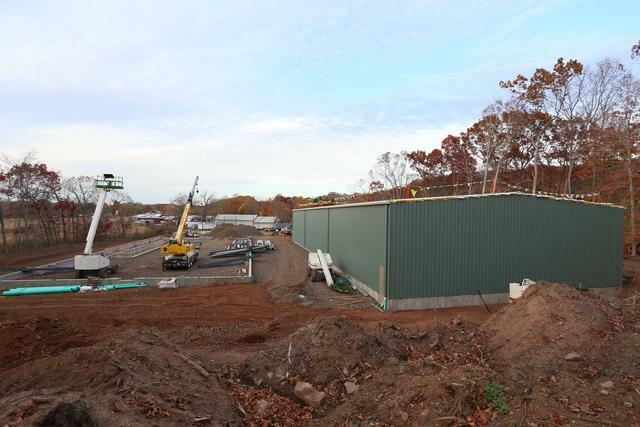 Installation of wall siding moved very rapidly, but we managed to catch one photo of the process at the rear wall of building 1. Note the insulation blanket. 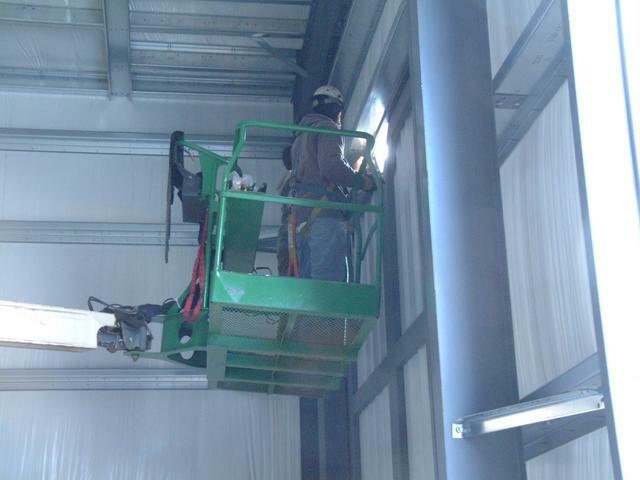 Although this building will not be heated, wall and roof insulation will help control temperature and humidity fluctuations. 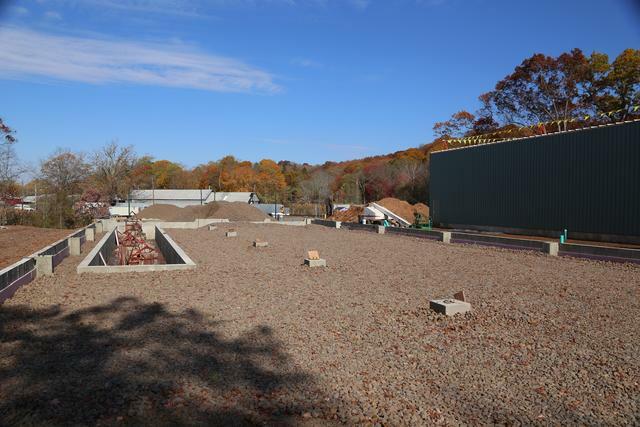 November 9, 2013: Part of the approach ramp to building 2 has been rough-graded. Looking up the ramp, the crane in the distance is staging the building columns. 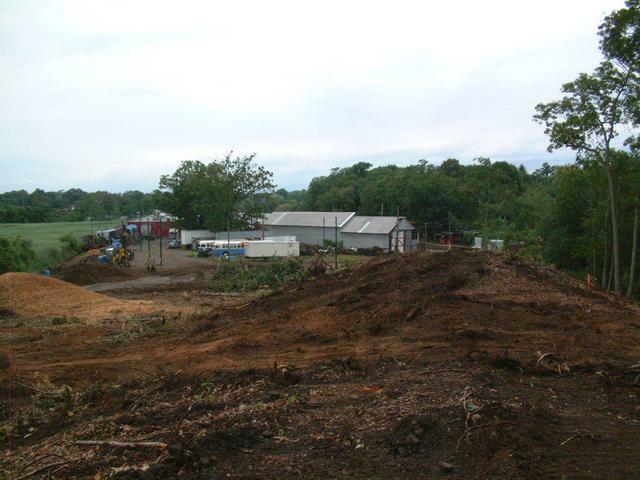 View from the rear of the site. 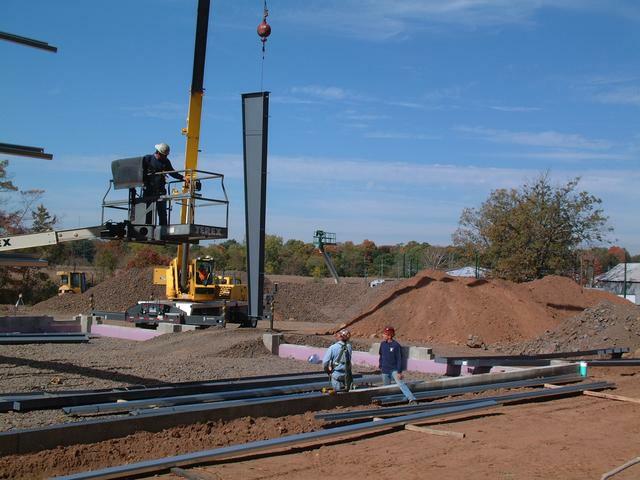 The crane towers over the building 2 site as columns are placed on the foundation, and wall girts are installed to tie the columns together. 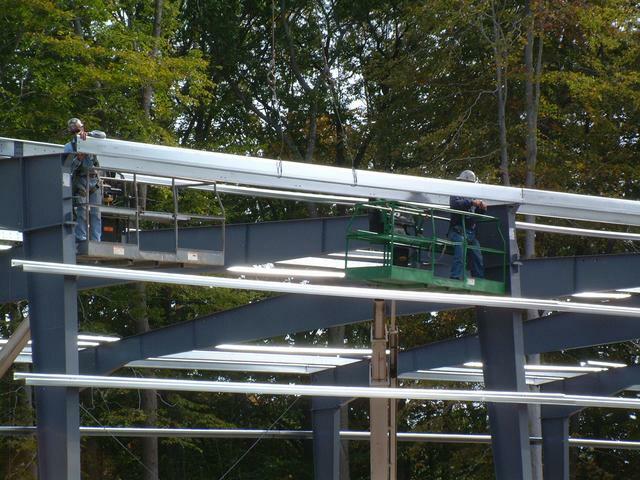 From the aerial lift, two steel workers complete the roof structure at the front of the building. 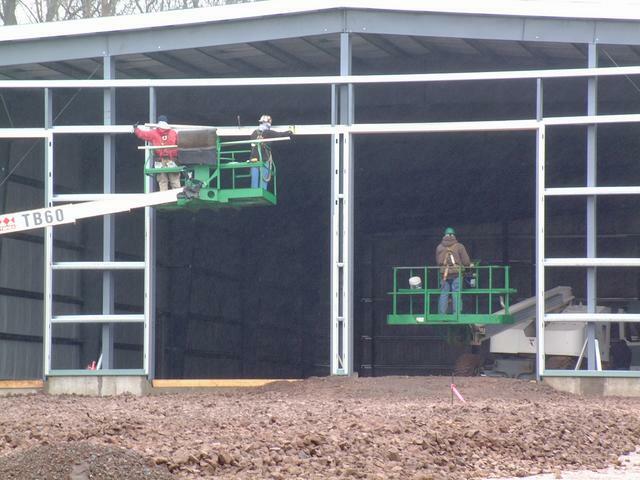 While at the back, one worker installs the end wall girts. 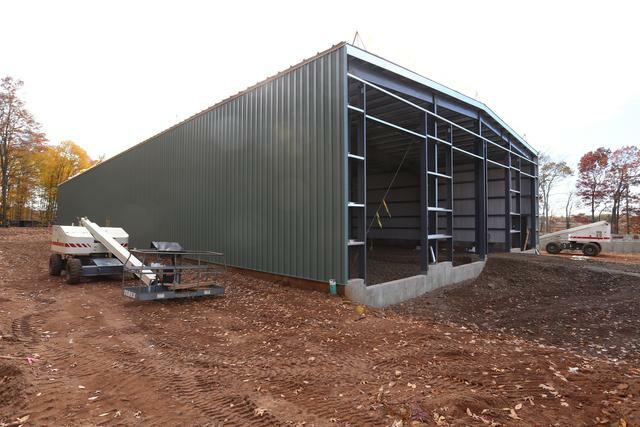 One of the bays contains X-bracing in the roof and walls. Girt connection details at the front corner the building 2. 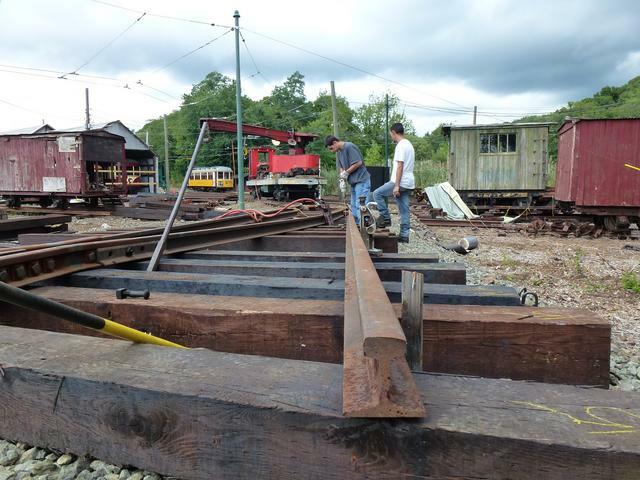 Looking into track 4 with the future pit, which has been temporarily protected with a wooden fence during construction. 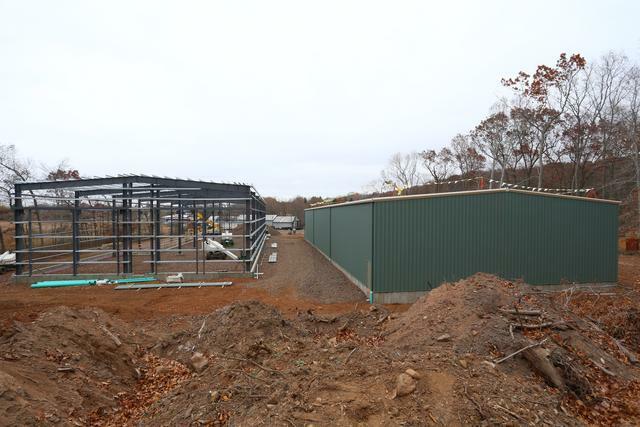 November 15-17, 2013: Building 2 is spaced 30' from building 1 (this is a building/fire code requirement) and is also offset 30' forward (for track design reasons). The interior row of columns in building 2 is slightly off center. 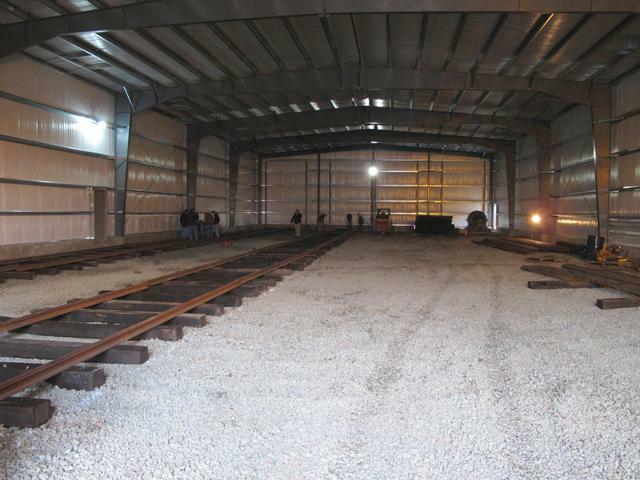 They are designed to support potential future upgrades: on the right, a 28' span, 10 ton bridge crane running the length of the building and spanning two tracks, and on the left a 40' wide storage mezzanine. 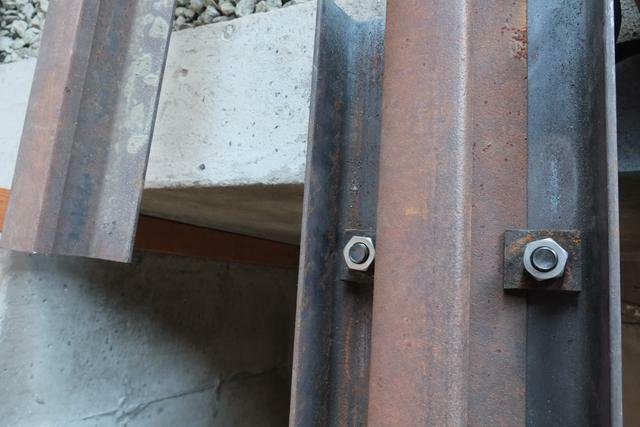 These 6-hole plates which were factory-welded to the web of the east and middle columns are connection points for future mezzanine floor girders. 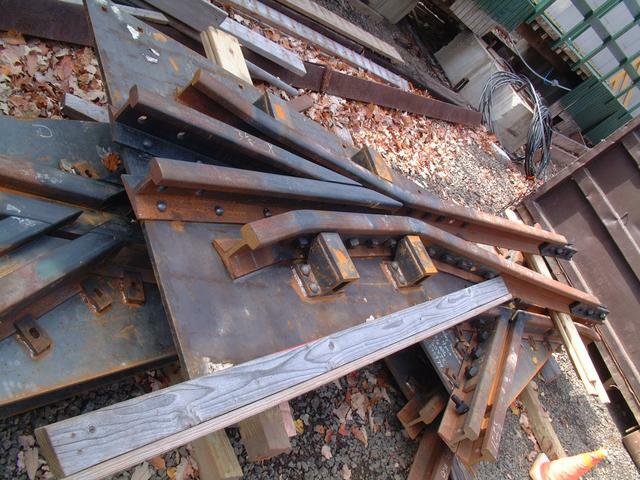 Close-up view of the factory-installed brackets which will support future crane beams and rails. 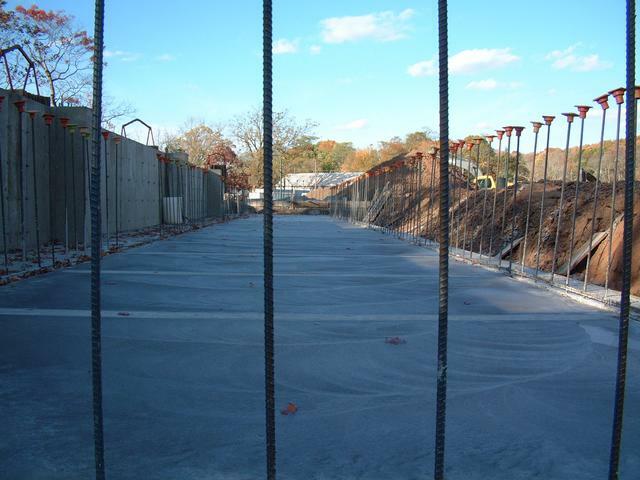 Standing in the "level spreader" stormwater management structure we see the structural skeleton of building 2, with building 1 in the distance. 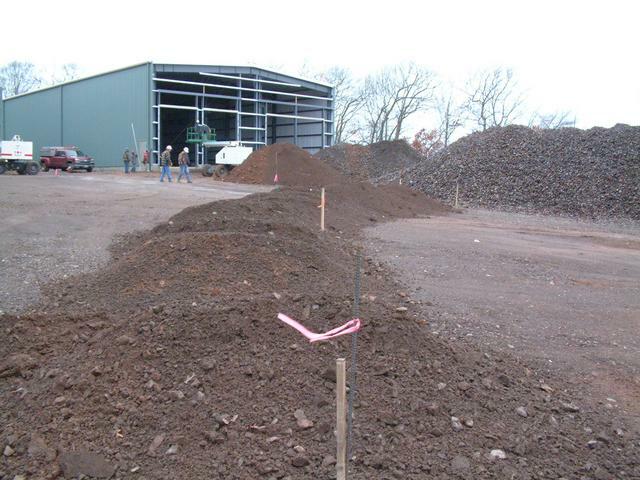 The topsoil pile at the rear of the site is one of the few places that is still higher than the buildings. 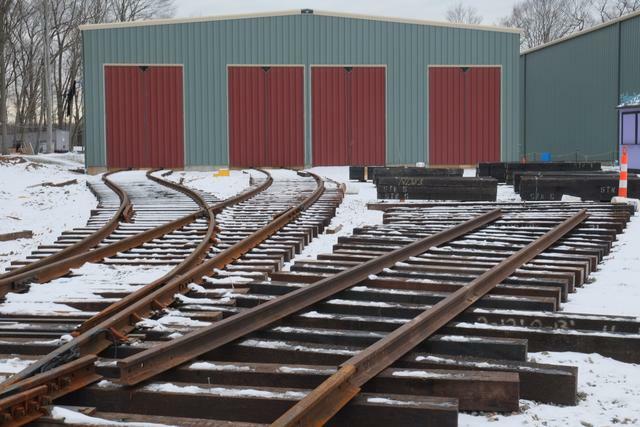 The 30' strip between the two buildings will contain 2 dead-end tracks that can be used to store additional cars in the event of an impending flood. 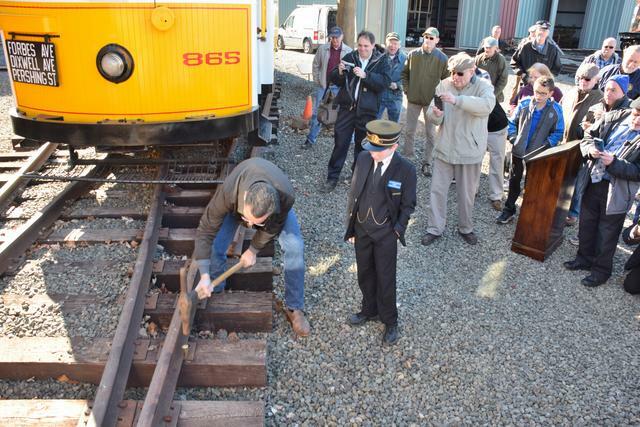 November 16, 2013: About 130 members and friends of the museum were on hand for the ribbon-cutting ceremony on Saturday, November 16. 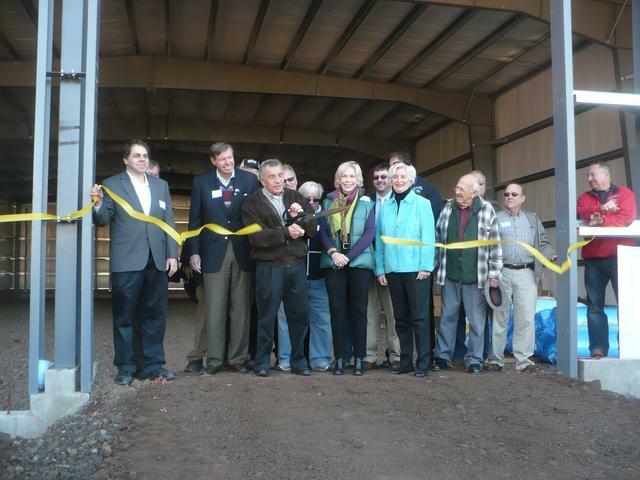 Unk DaRos, the retiring First Selectman of Branford, is seen cutting the ribbon flanked by State Sen. Ed Meyer, State Rep. Lonnie Reed, State Rep. James Albis, and State Rep. Patricia Widlitz, along with numerous museum officers and trustees. 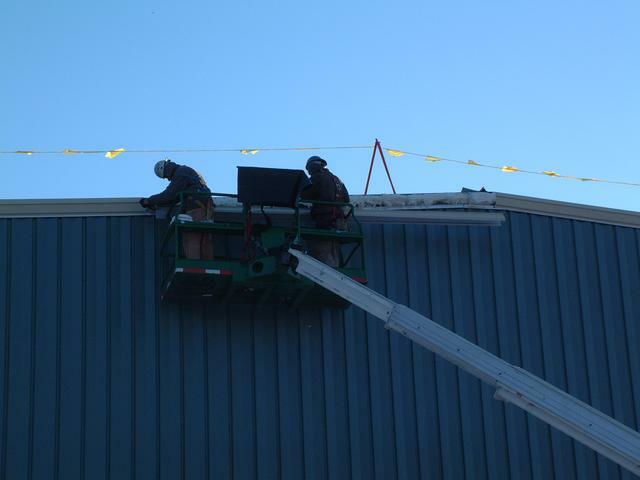 November 18-22, 2013: Following the ribbon-cutting, Building 2 continued to approach completion, as roof and siding panels were installed. View of building 2 on right, with building 1 visible through the uncompleted side. Interior taken from rear of of building 2. 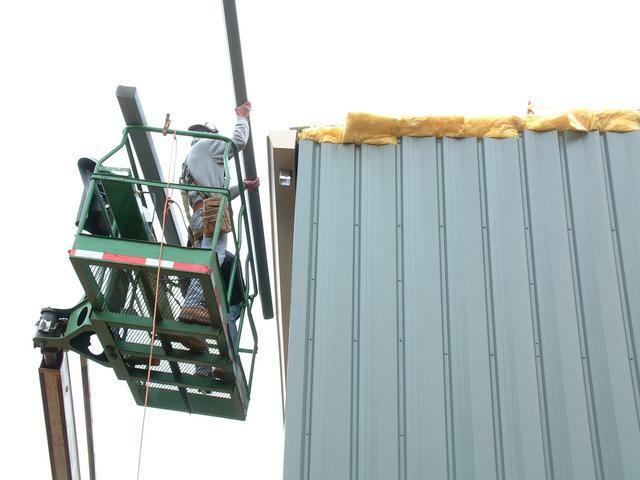 This sequence of photos shows insulation and siding panels being lifted into place along the side wall of Building 2. 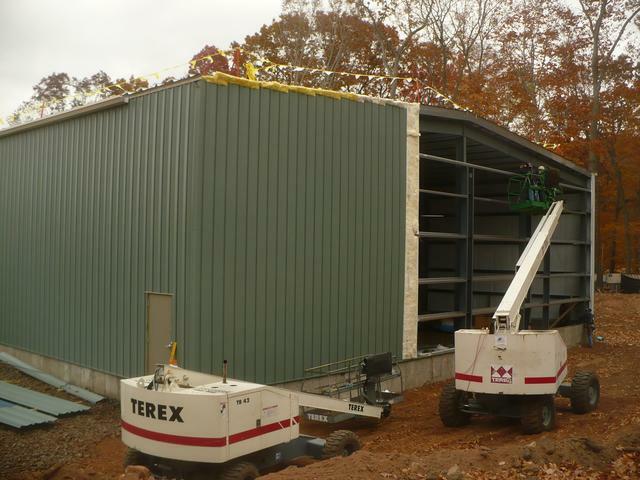 Nov 25 - Nov 30: Both buildings are now entirely clad, with the exception of the front walls, pending door installation. 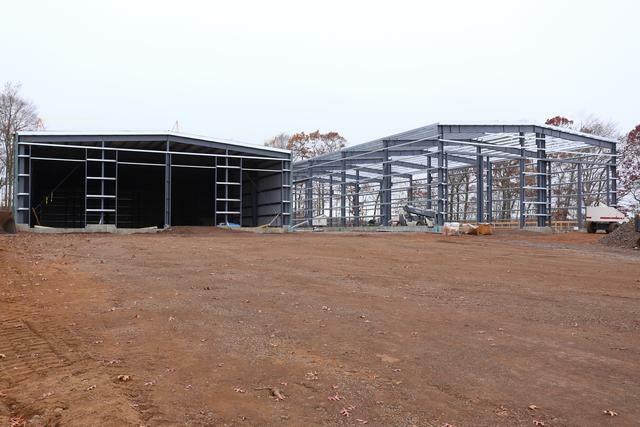 Gutters and trim have been completed on building 1, and ongoing for building 2. The logo of Varco-Pruden, the manufacturer of the building, is embossed on this piece which joins the gable trim at the peak of building 1. 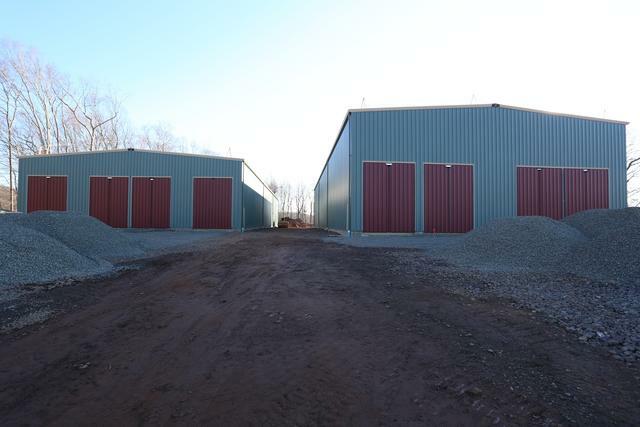 Dec 3: The final phase of the building construction is the doors. 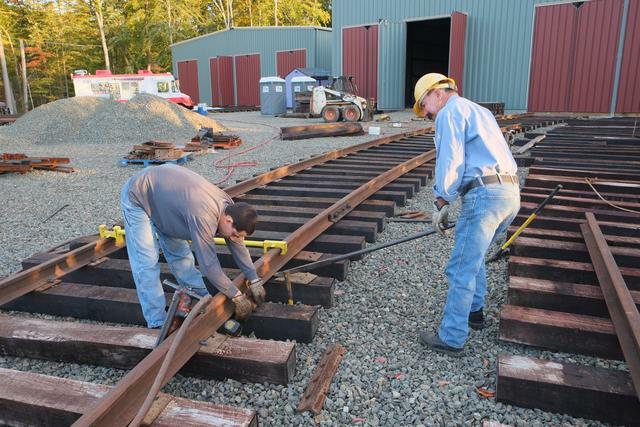 One set has been fabricated and test-fitted. 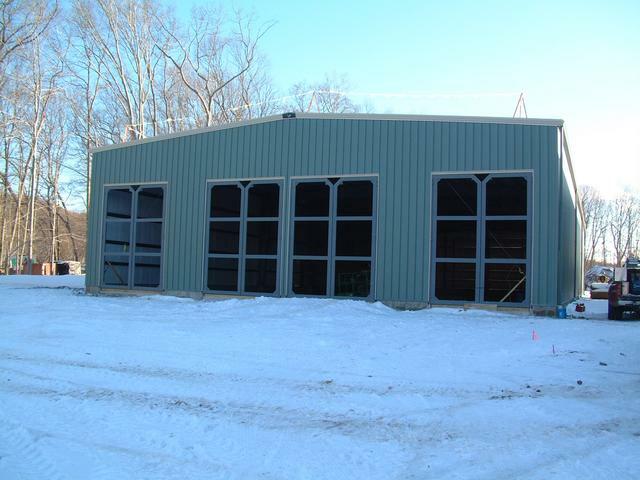 The doors are made from welded structural rectangular steel tubing, and are very substantial. 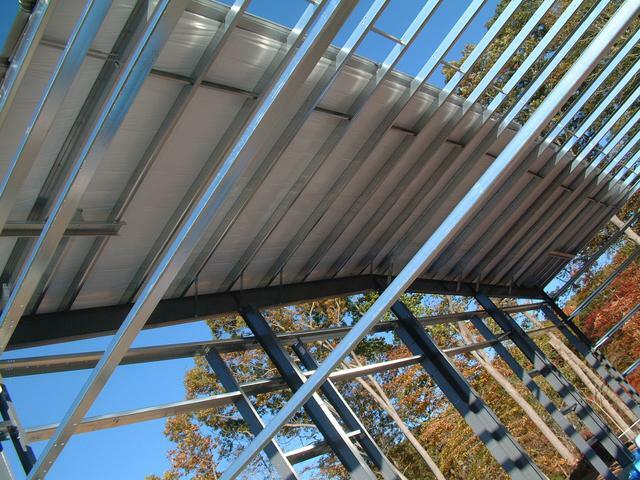 They will be clad to match the building finish. 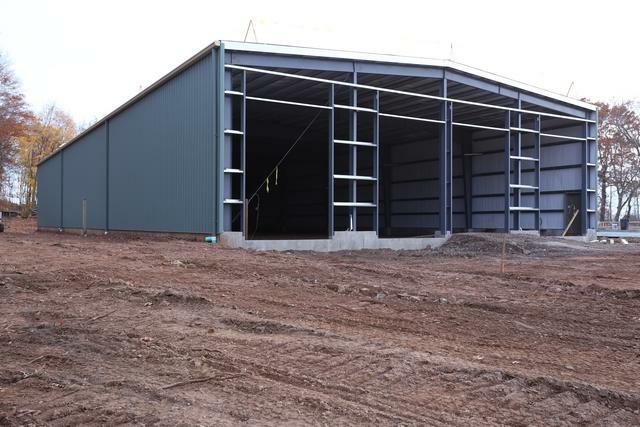 A few days later, all of the sheeting has been installed. It's now a lot easier to see the doorways. 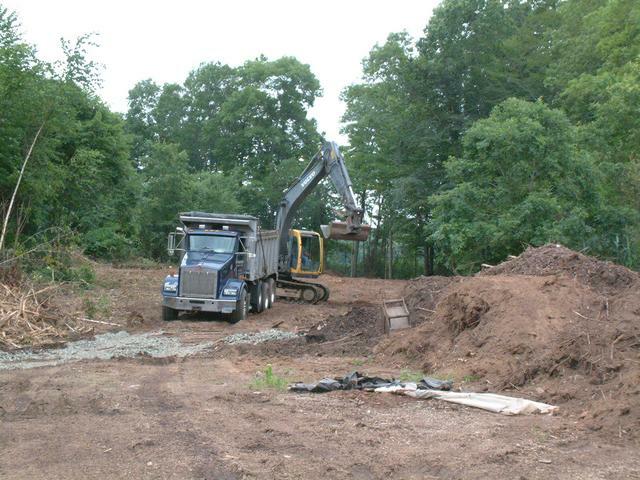 The site work subcontractor is now completing the final grading. 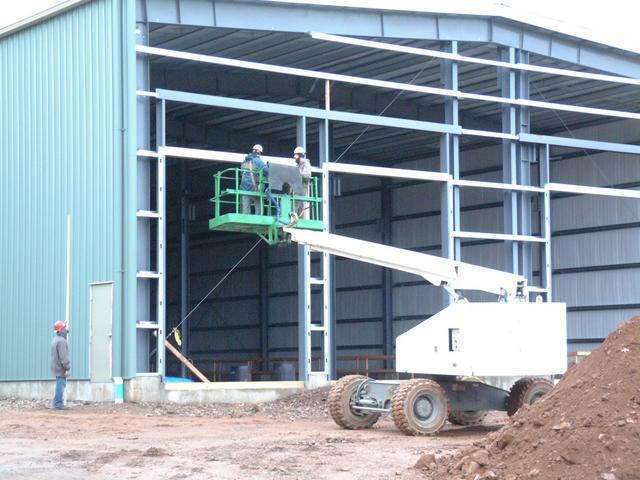 Some of this work had to wait until the end of the job because the building erectors required large flat areas around the buildings. 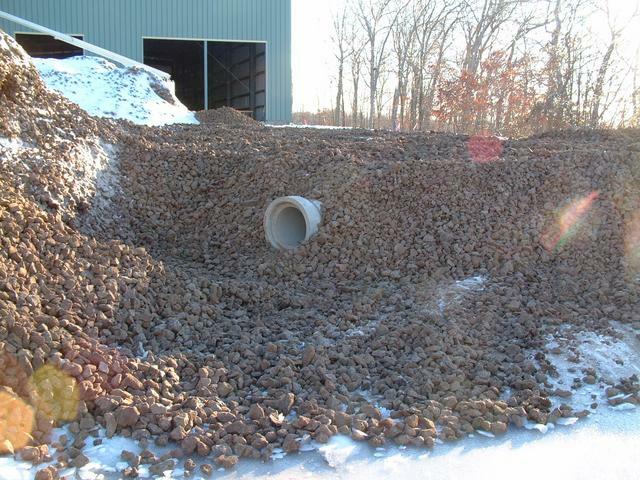 Below we see 2-3" crushed stone being spread near building 1. 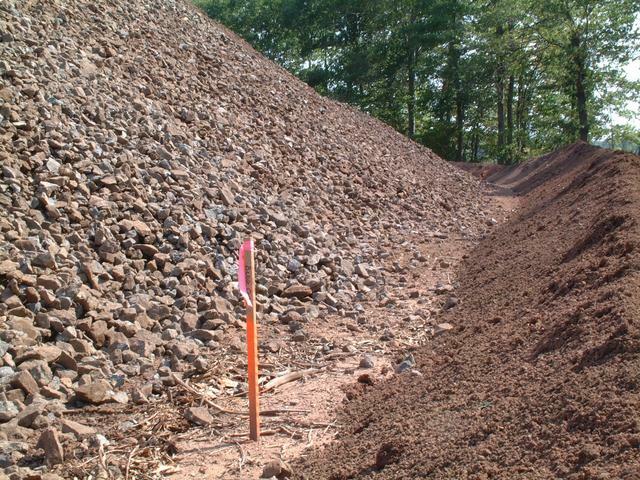 These mounds of material have been placed approximately in the path of the new loop track. 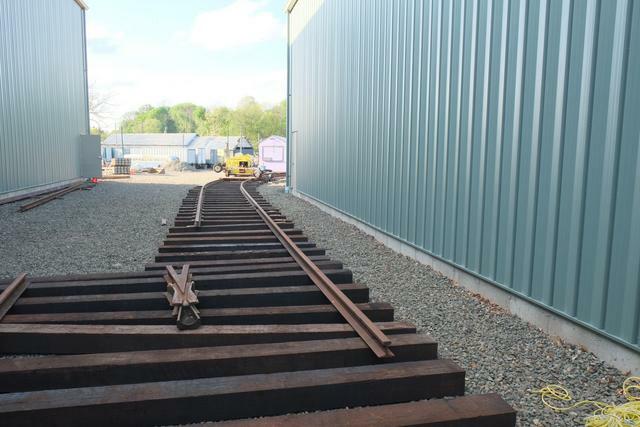 This track climbs to an elevation of 11.5', or about 2.7' lower than the tracks in the building, and then holds that elevation as it sweeps around and eventually joins in with the ramp coming down from building 2. The building 2 approach is a dramatic feature set against the marsh. 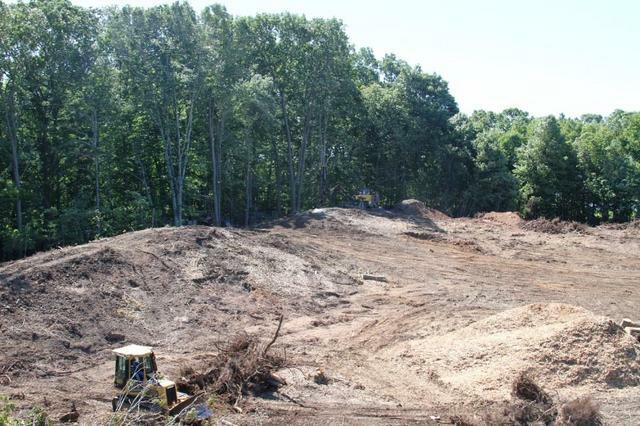 The area to the left of the ramp in the first photo will be seeded and planted with shrubs and trees to create an erosion control / wetlands buffer area. 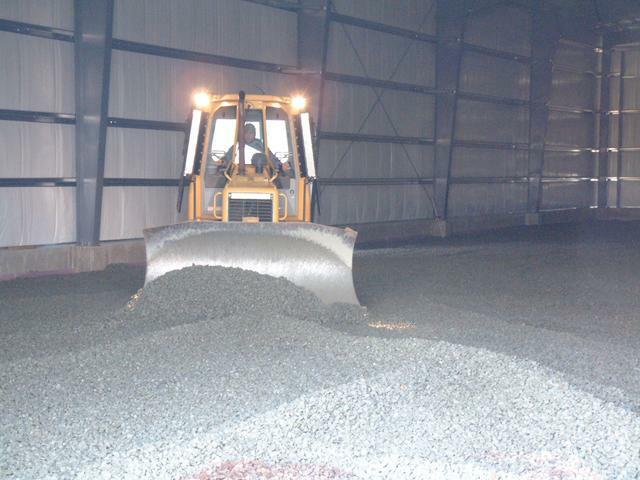 The base layer is gravel process which was left over from the crushing and screening operation. 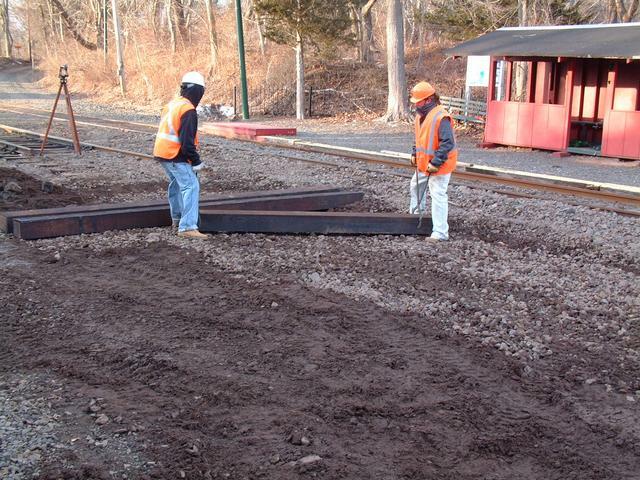 It is compacted with the roller, and will be topped with two layers of crushed stone to support the tracks. Both buildings against a gray backdrop as the museum experiences the first snowstorm of the season on Dec 14. 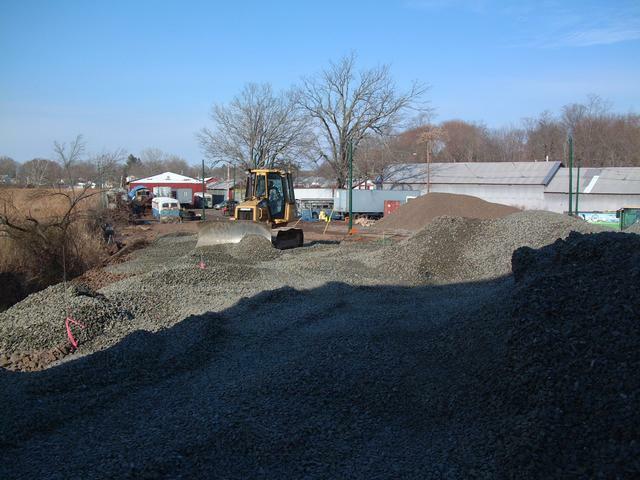 Dec 16-24, 2013: The site work contractor is wrapping up the final grading. 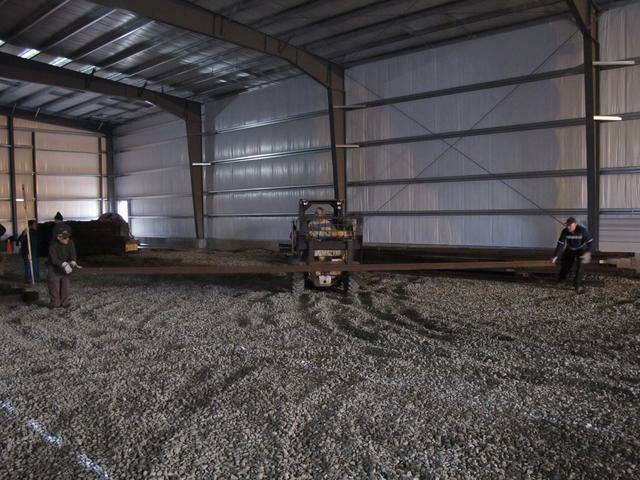 Ballast stone is being spread on all of the track areas, and also inside both buildings. 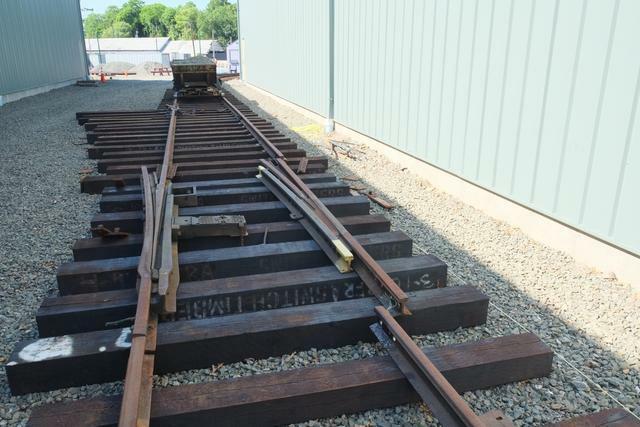 The contractor will leave a finished grade which is approximately one foot lower than the ultimate rail head height, then the museum will place ties and rail. 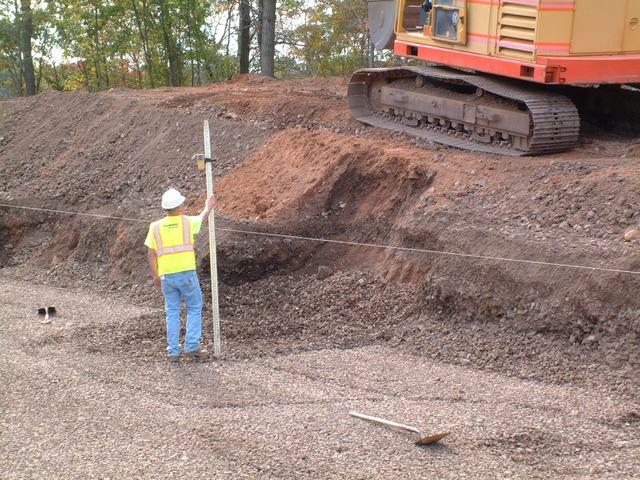 Below a dozer spreads stone within building 1. 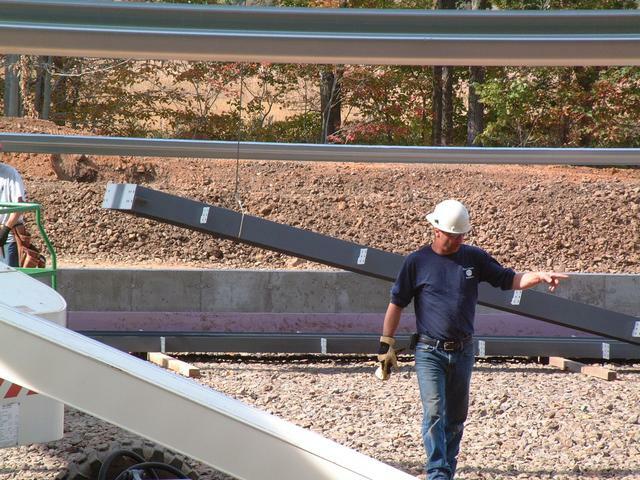 There are two concrete drainage pipes which pass beneath the ramp approaching new building 2. 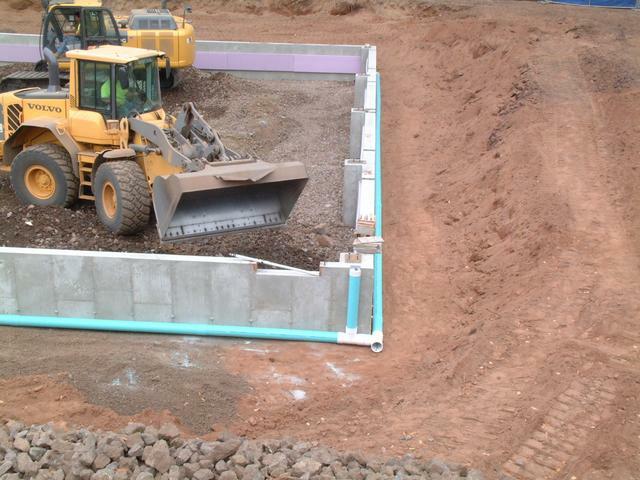 In the event of another severe flood, these are designed to relieve the water pressure against the side of the ramp, and to allow water to drain back out. 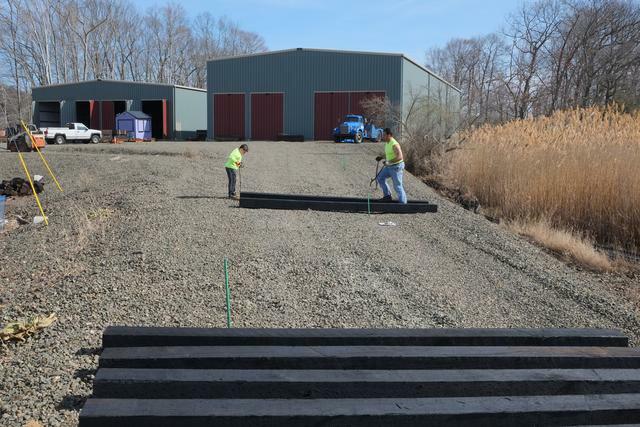 The storm water detention pond has been completed along the side of building 2. 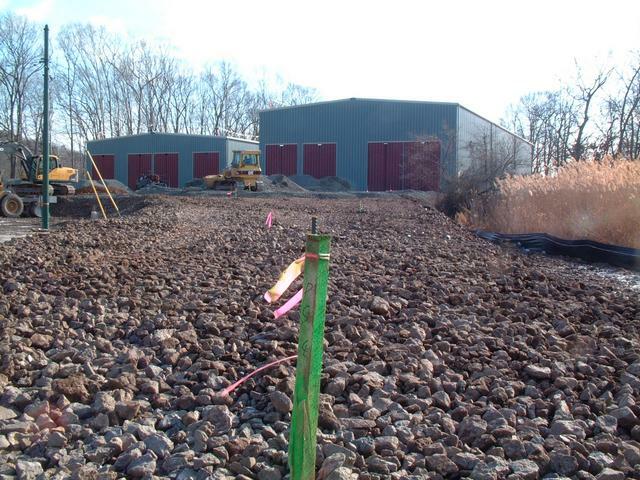 Runoff from the two building roof drains is diverted into this swale, which in the spring will be topsoiled and seeded to provide a natural buffer against erosion. 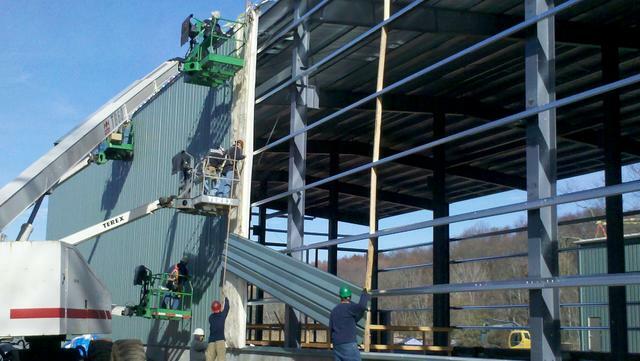 The last bits of trim have been installed on Building 2 across the front wall. 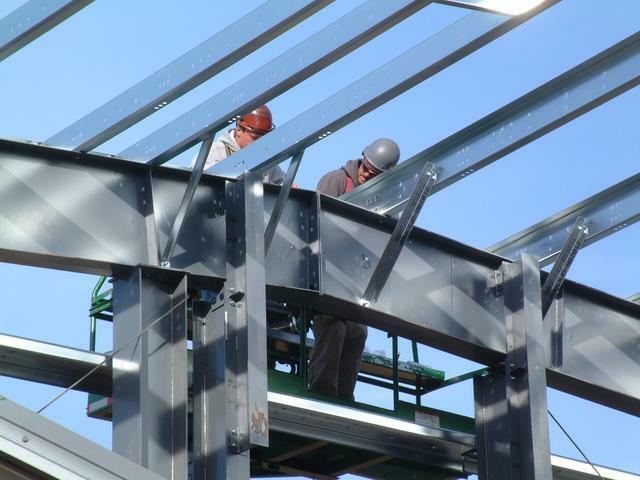 Below: the steel workers cut a piece of trim to length and put it up. 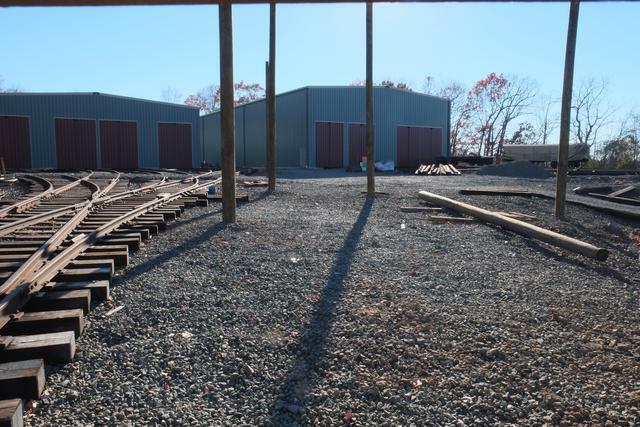 All of the trackway doors (4 sets on each building) have been hung, and sheathing is almost complete. 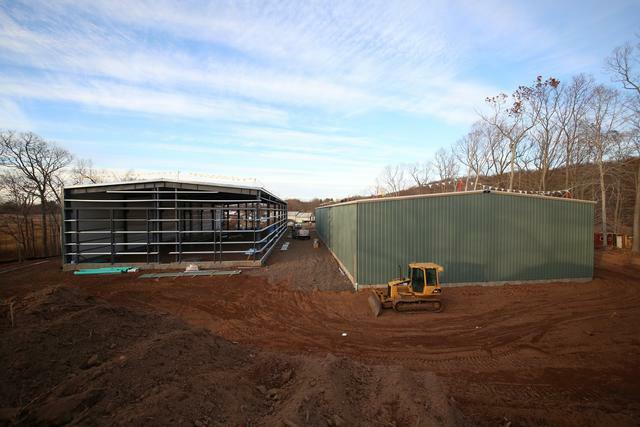 Below: On Dec 16, building 1 doors are up but no sheathing is in place. 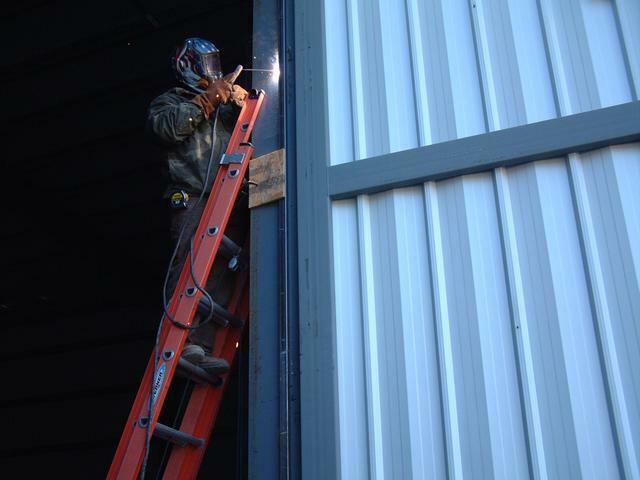 Door hinges being secured on the last of the door frames at building 2. 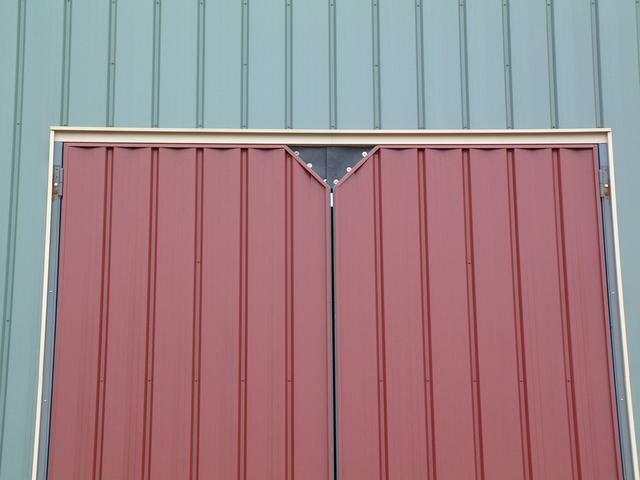 These J-shaped moldings retain the corrugated siding and make a weathertight seal. 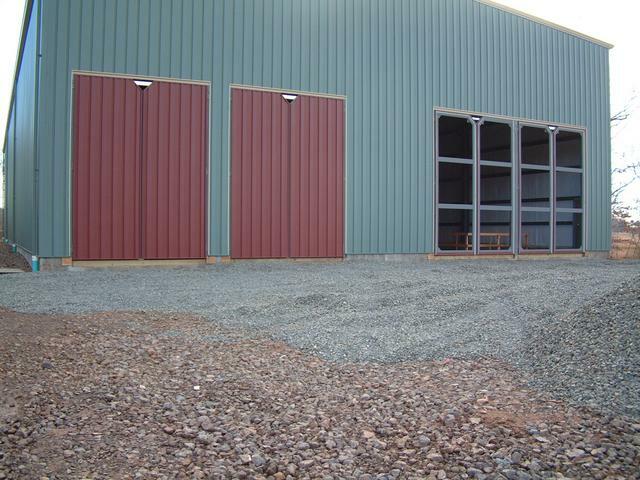 The following week, all doors are clad on building 1, and almost done on building 2. 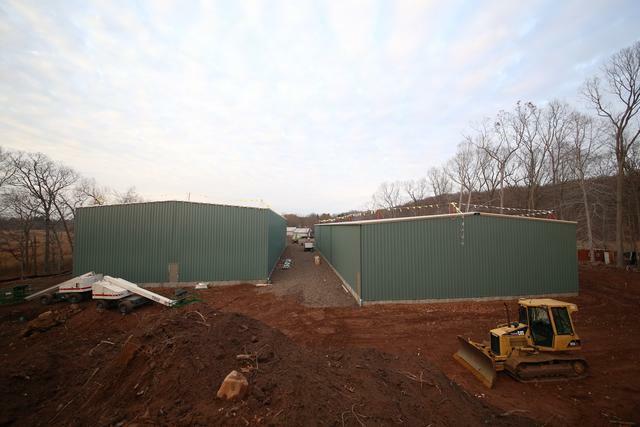 Dec 26, 2013 - Jan 3, 2014: The new yard is almost complete. 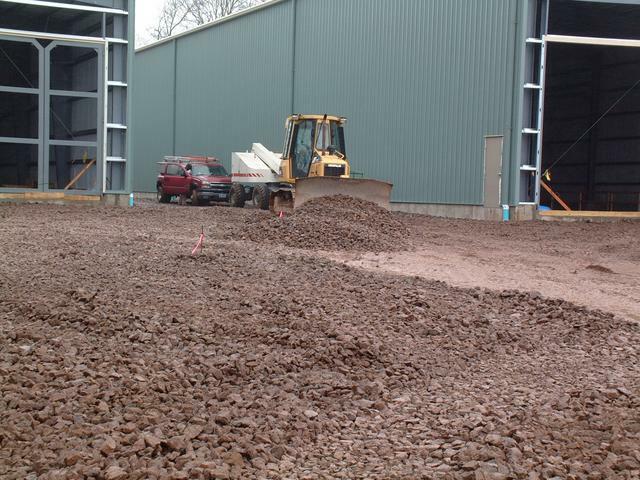 This medium ballast stone was delivered and piled in front of each building to be spread out. 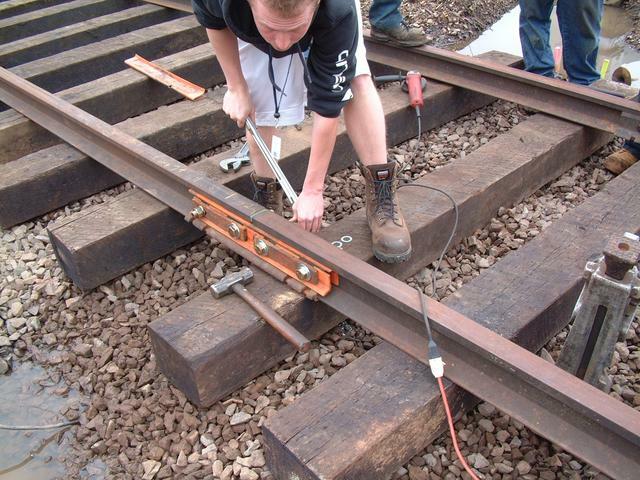 While this stake represents the opposite end of the loop, at the switch which forms the throat of the ladder for building 2(9). 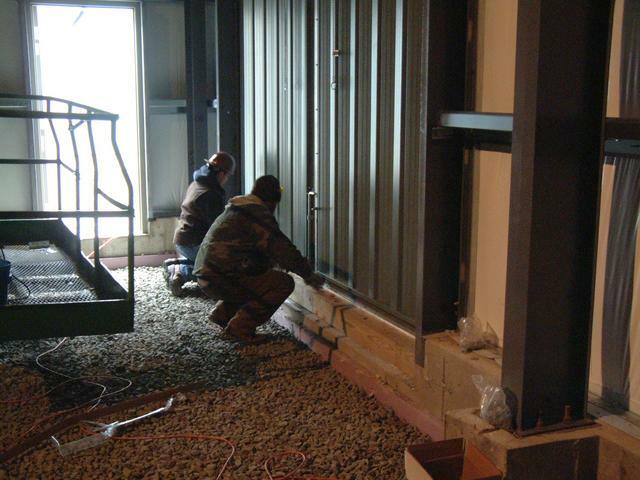 The building contractor has completed installation of the door stops, which were welded to the door frames. Which allowed the flaps to be put on. 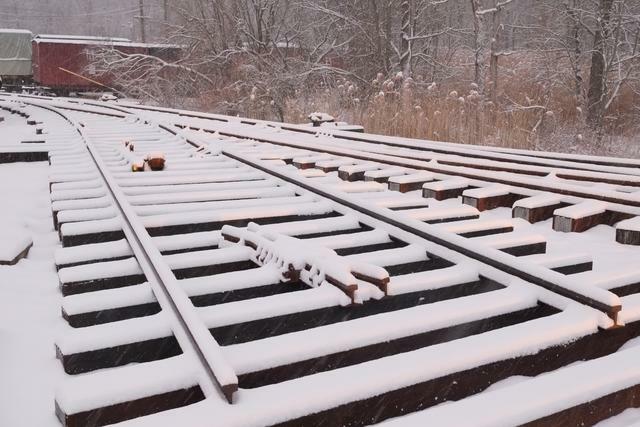 Each door leaf carries a piece of electrically insulating rubber piece in the shape of a right triangle which forms a weather seal against the trolley wire (when installed). 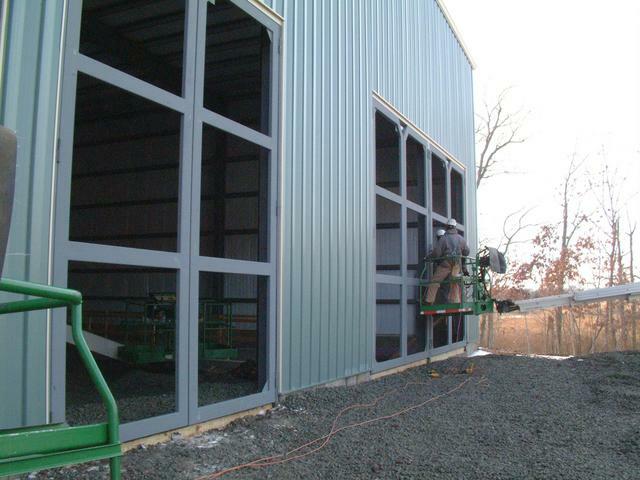 It will be much easier to latch these doors closed than our present wooden barn doors. 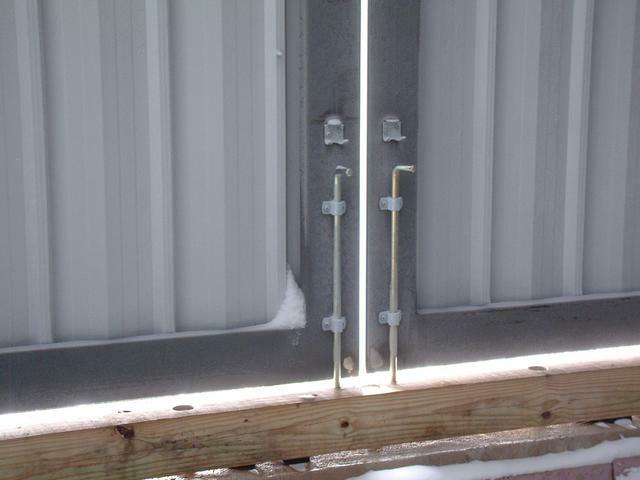 A spring bolt latch at the top and a cane bolt at the bottom will be complemented by a heavy slide bolt across the middle. 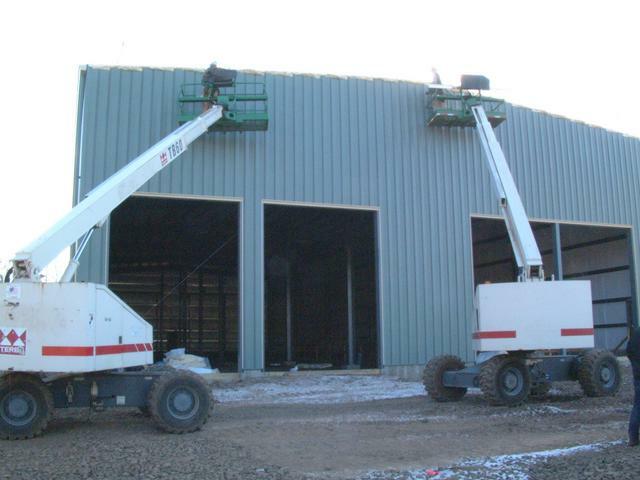 Jan 6, 2014 - Jan 17, 2014: The last few details of the two buildings have been wrapped up. 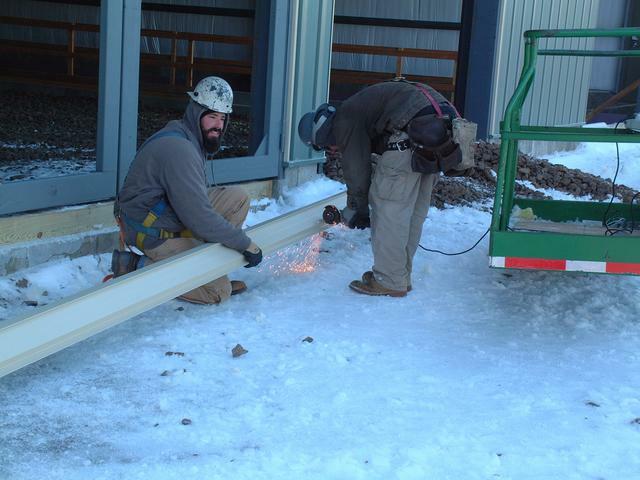 Braving the cold, these two construction workers completed installation of the bottom bolt plates, edge weatherstripping, bottom door sweeps, insulation and innner cladding. 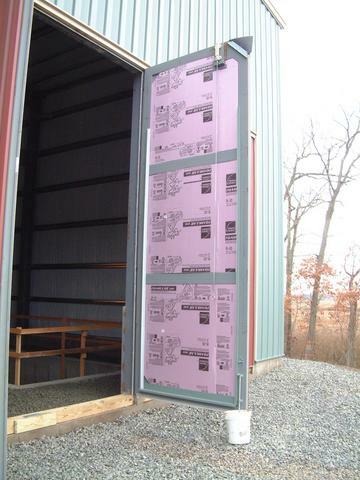 Door panel of building 2(9) just prior to inner cladding installation shows the 2" rigid insulation. 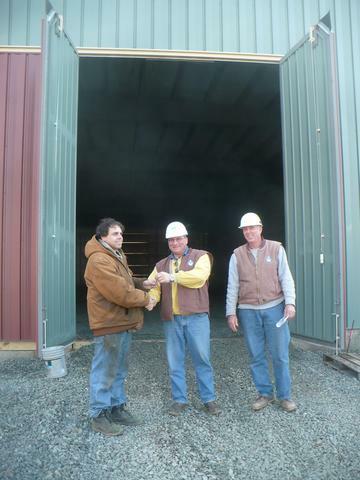 And Munger Construction has literally handed us the keys to the building! 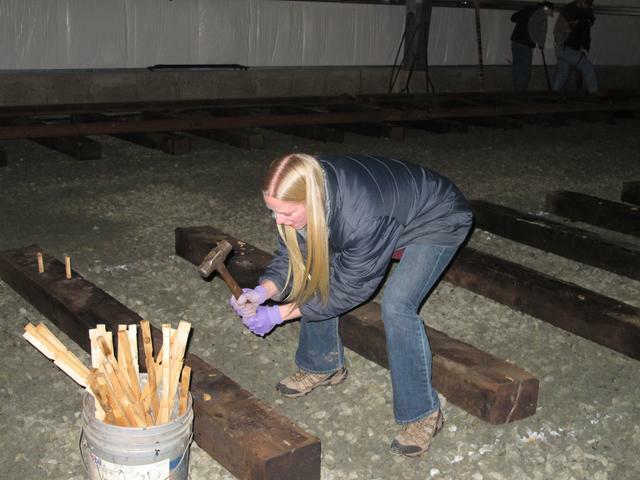 On Jan 18, 2014 we had our first "work party" for Elevating the Collection. 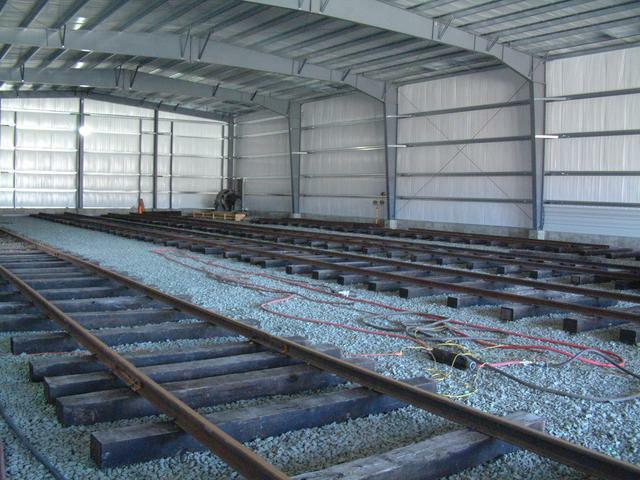 The task at hand was to begin installation of the tracks within building 1(8). Work began at 10 AM. 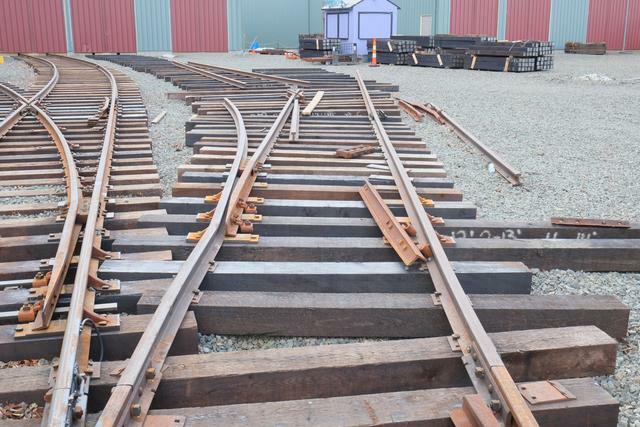 Layout lines for the first two tracks had already been put down the day before. 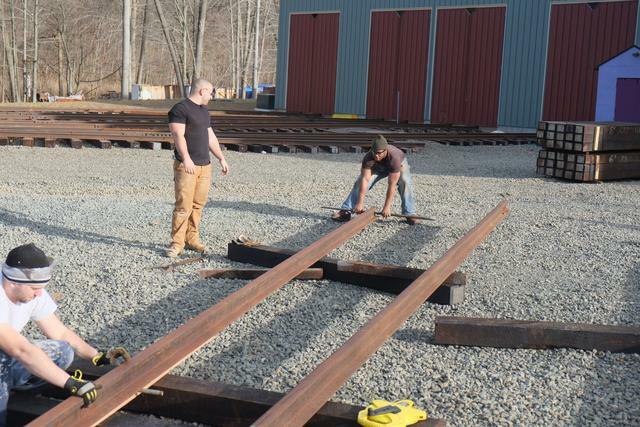 Ties were distributed with the Bobcat machine and spaced by hand every 3 feet or so, using the layout guide lines to align the edges of the ties. Rough elevation was checked with a rotary laser level. 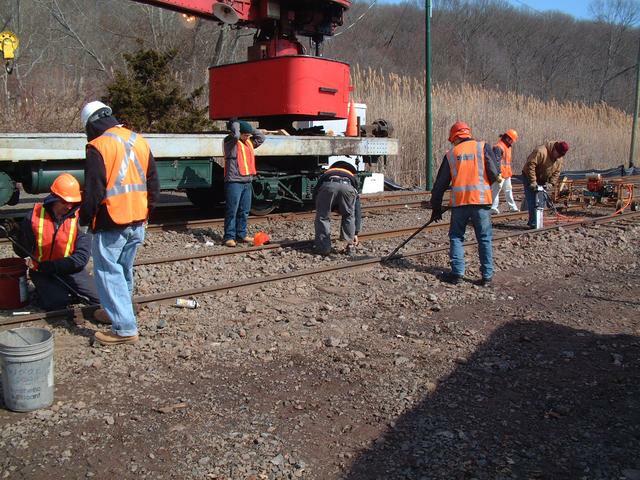 At a later date, additional ballast will be spread over the tracks and they will be raised up and tamped to final elevation. 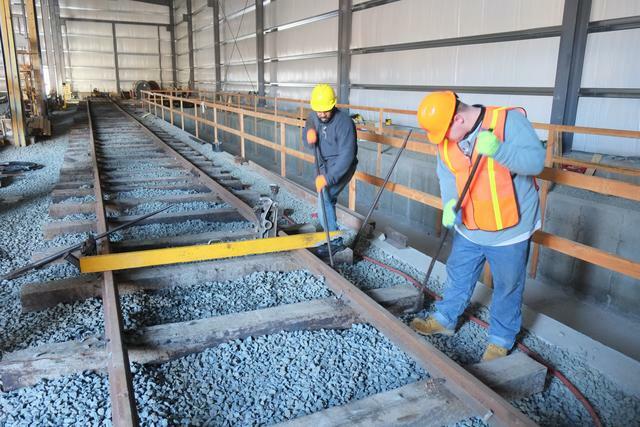 For these tracks inside the buildings, where traffic will be light and exposure to the weather will be zero, we saved a lot of money by utilizing used ("re-lay") ties. 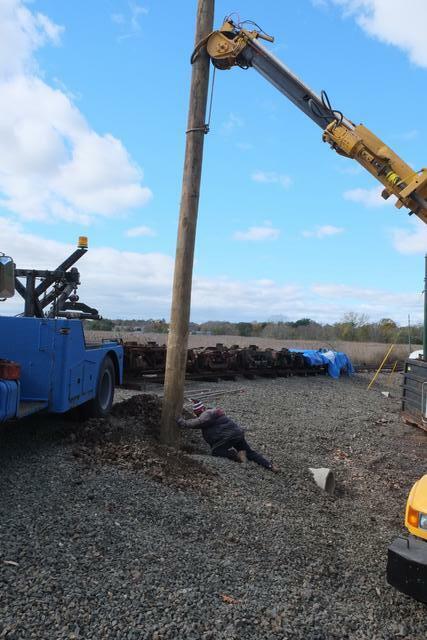 The old spike holes need to be plugged up. 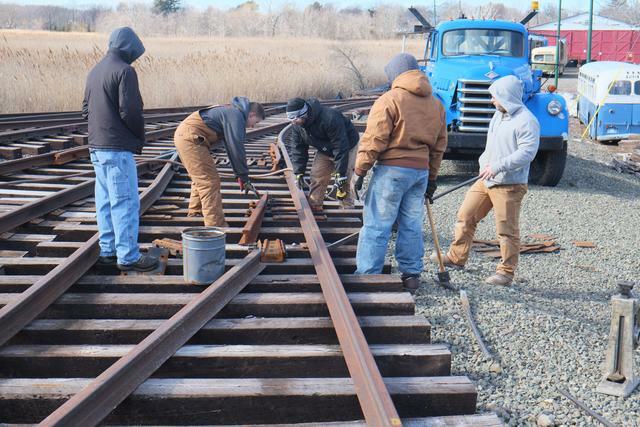 Once a stretch of ties was put down, the Bobcat brought over one rail at a time (about 30 feet long) and set it down. 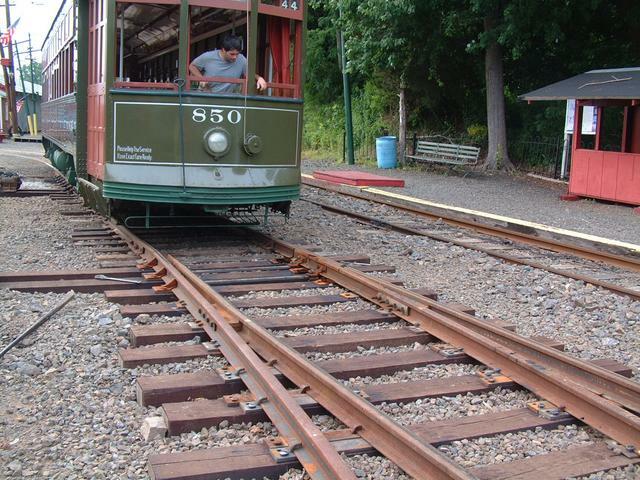 This is the used 60AS rail which was donated by National Capital Trolley Museum. 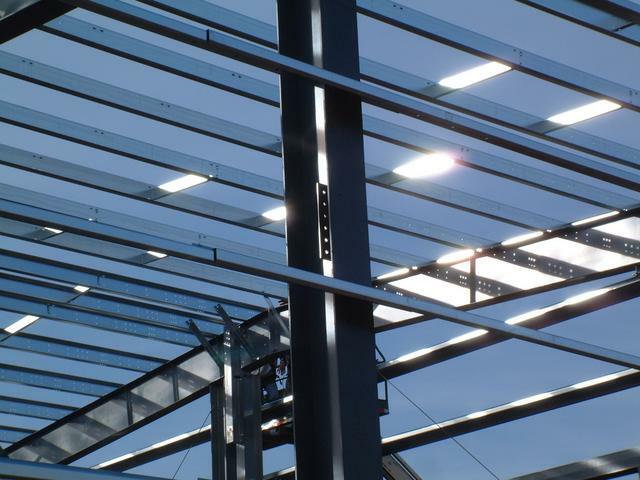 The light section is suitable for track inside the building. 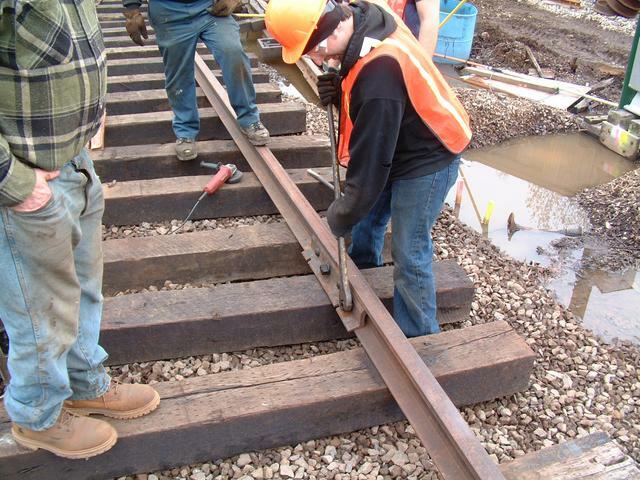 When laying new track, one rail is selected as the "line rail" and is spiked to line. 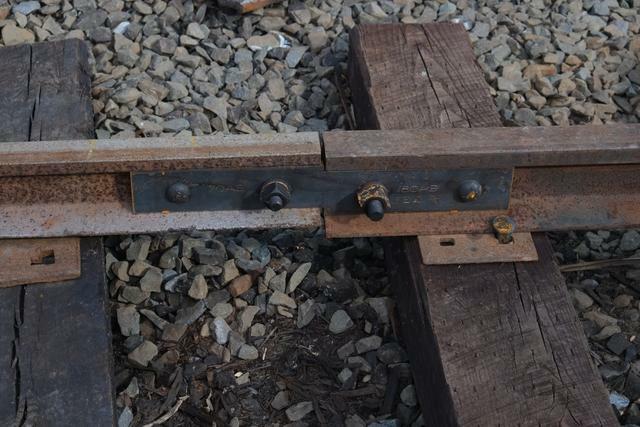 The other rail is then spiked to gauge (56.5") relative to the line rail. 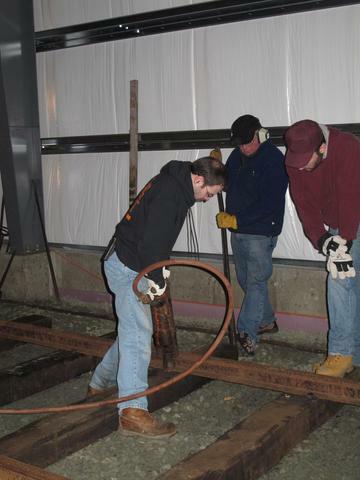 We began on track 81 and used the concrete foundation wall as the reference for setting the line rail. 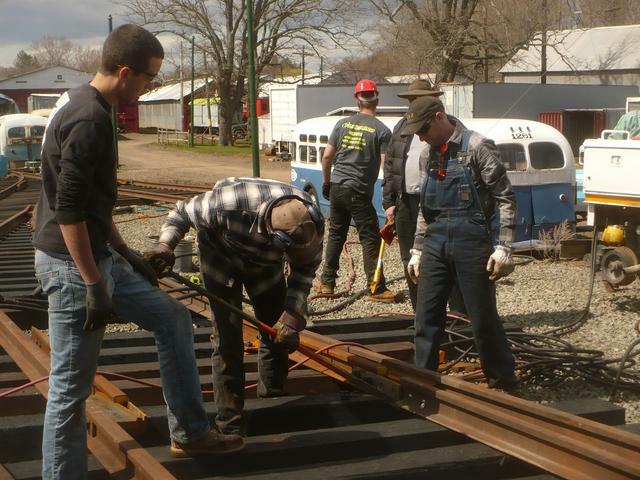 One or two volunteers held the rail at the proper position while another tapped the spikes in loosely by hand, and then yet another volunteer came along with the pneumatic spiking hammer to drive each spike down. 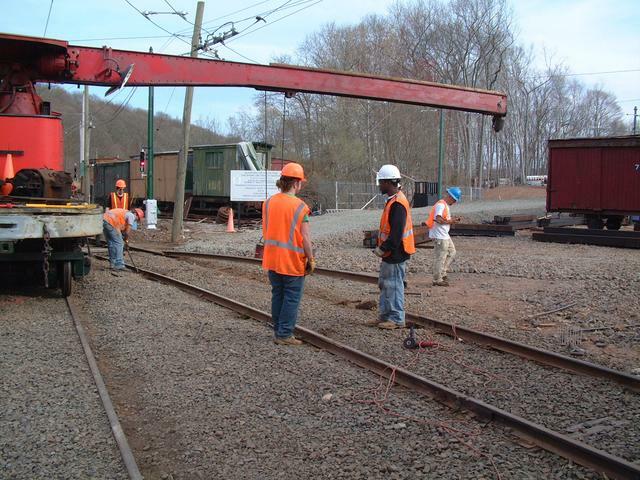 As the tie tends to settle down into the ballast, another volunteer holds up the end of the tie with a bar. 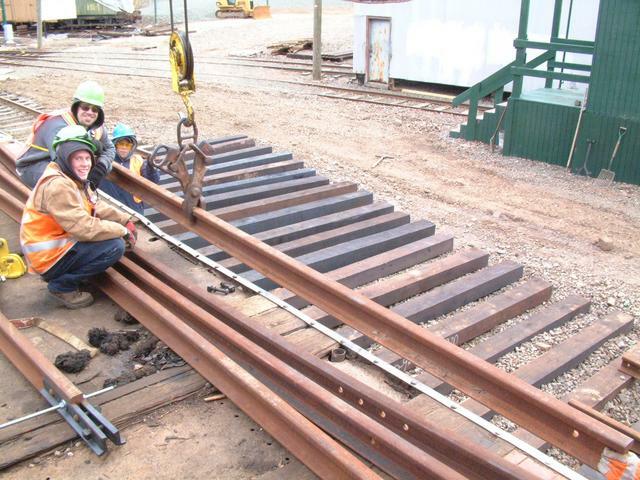 As the end of each length of rail is reached, the next length is jointed up. 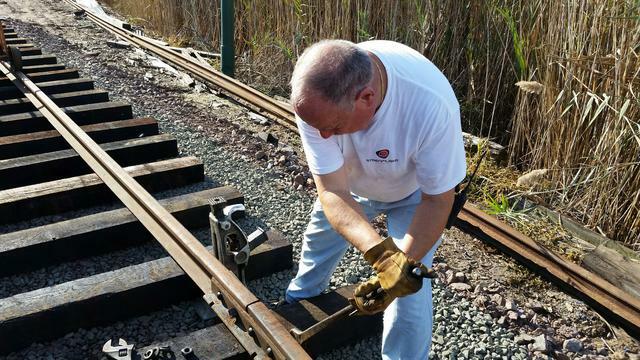 We used a pneumatic wrench to speed the process of tightening the track bolt nuts. 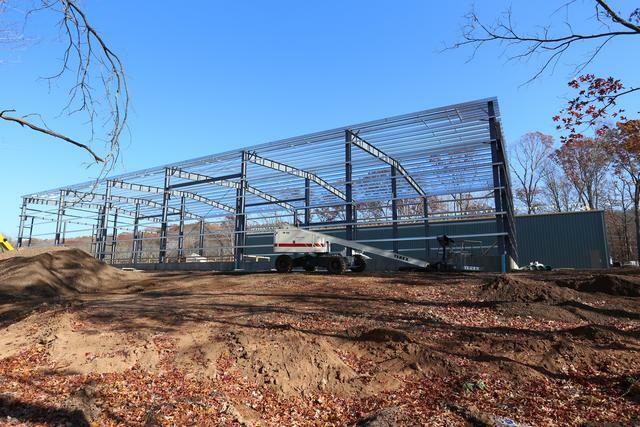 By about 4PM, it was starting to get dark, cold and windy, so we called it a wrap, cleaned up the work site and secured the building. 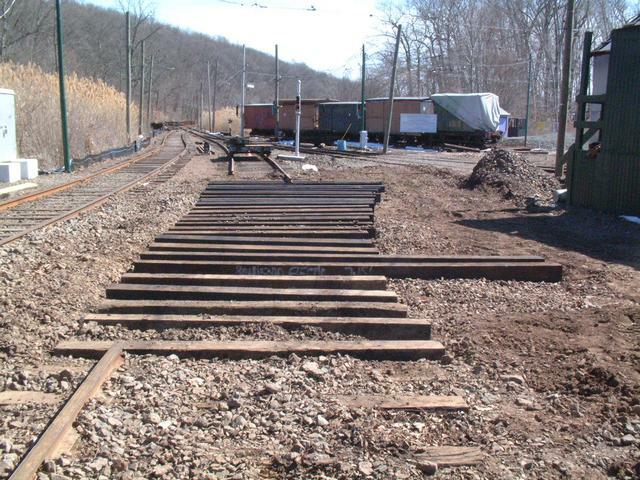 Ties and rails had been distributed the length of tracks 81 and 82, and the line rail was complete on track 81. Work will continue in the coming weeks and months. Feb 1, 2014 The weather outside has been challenging but we lucked out again on Saturday Feb 1 for our second indoor work party. Temperatures were warm enough that we could keep all of the doors open. 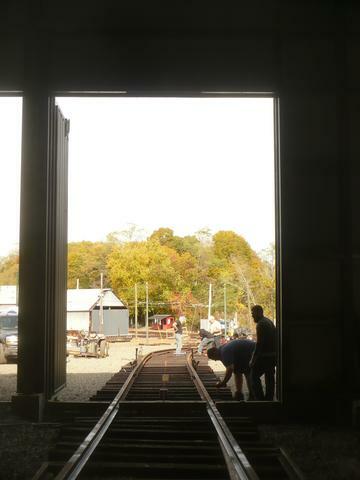 Track 1 is now complete from the back of the building up to a few feet from the front doors. 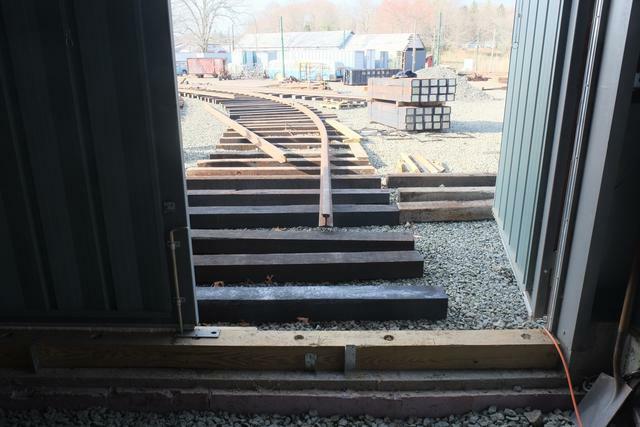 We are leaving this last bit of track out so the "compromise" joint between the 60AS rail inside the building and the 80AS rail in the yard can be made indoors. 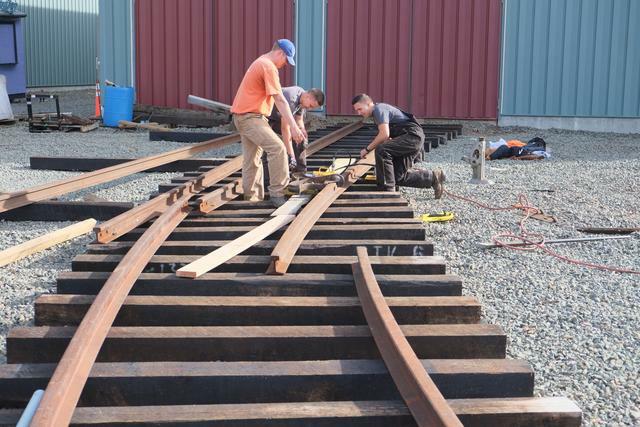 Lining and spiking of one rail on Track 2 was begun with all joints made up loosely, and ties were distributed for Track 3. 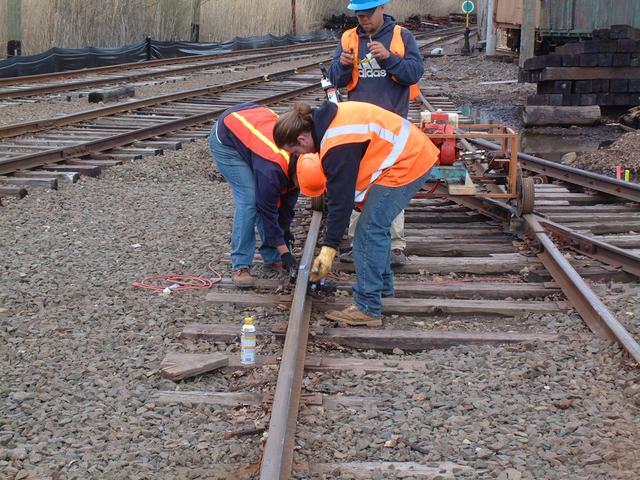 Checking the height of the ties on Track 3 with a laser level. 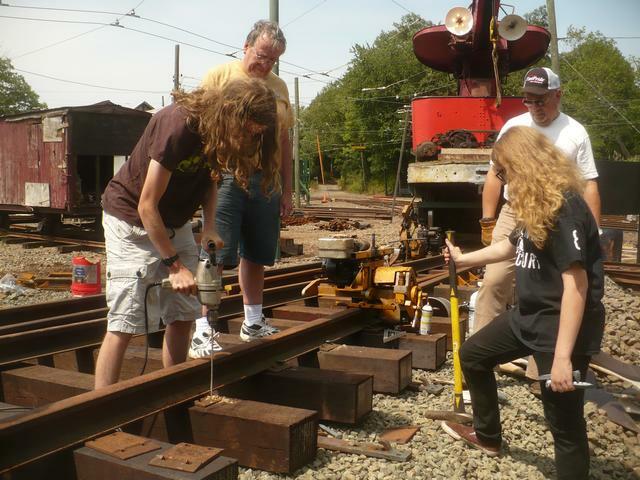 Setting the spikes by hand, then driving the spikes with a pneumatic hammer. 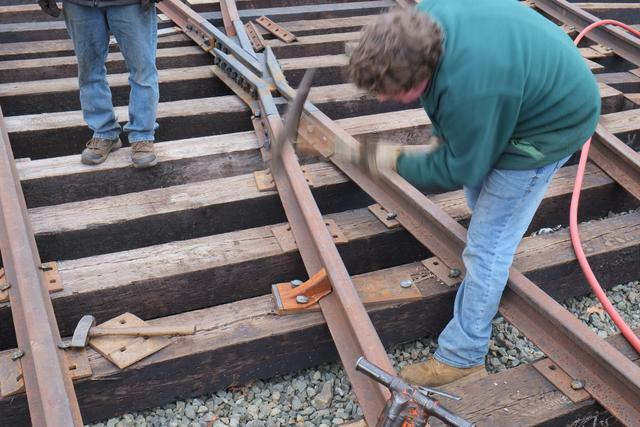 The tie is held up with a lining bar to ensure full seating of the spike. At the conclusion of the day's work. 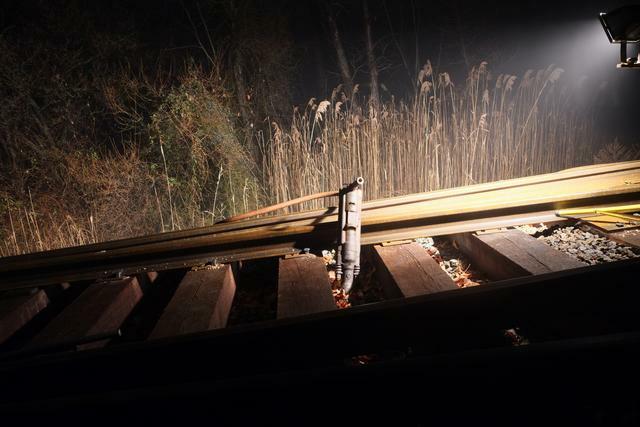 Member Ken Rosen just submitted this great bulb exposure shot from the night of Dec 21, 2013. Building 9 doors were installed but not yet finished, allowing him to "paint" the inside of the building structure with light to create this interesting effect. Shortly after the work party concluded, we had yet another snowfall. Feb 22, 2014 In mid-February, our museum volunteer force was augmented by students from the Gateway Community College partnership program. 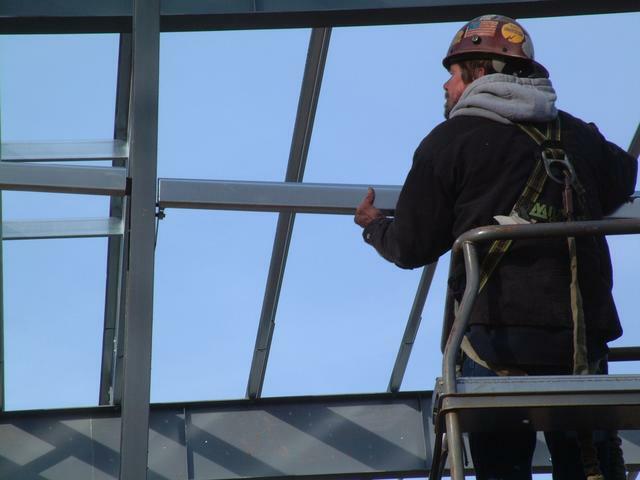 Together they are making rapid progress inside Building 8. 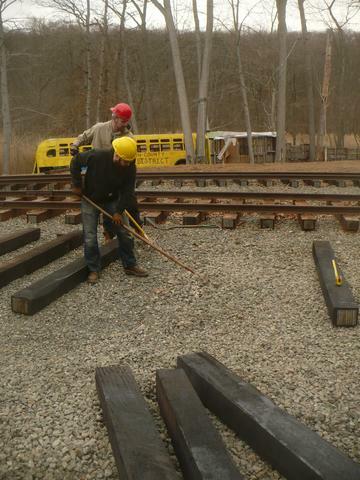 Another work party took place on Feb 22, and another nice day! 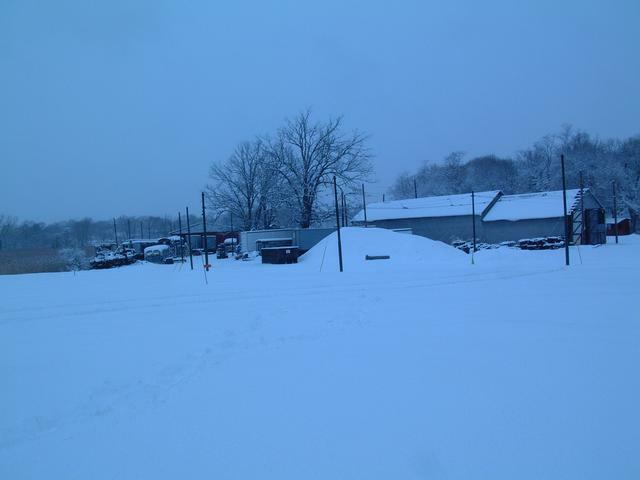 Temperatures reached the mid-40s which seemed like a tropical resort given the unusually cold, snowy winter. 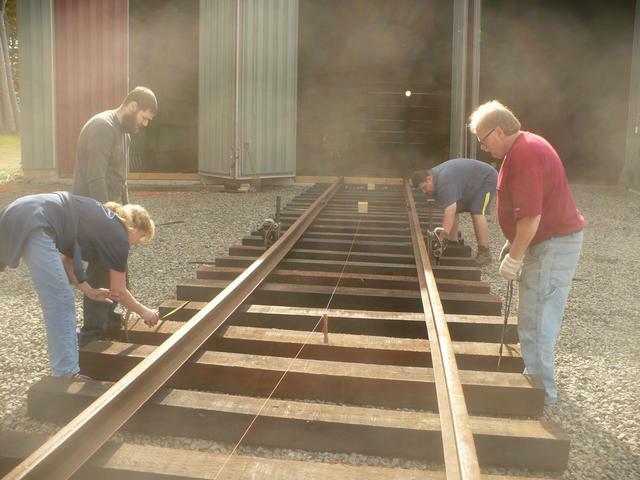 Earlier in the week, GWCC volunteers, seen below, completed lining and gauging track 82. 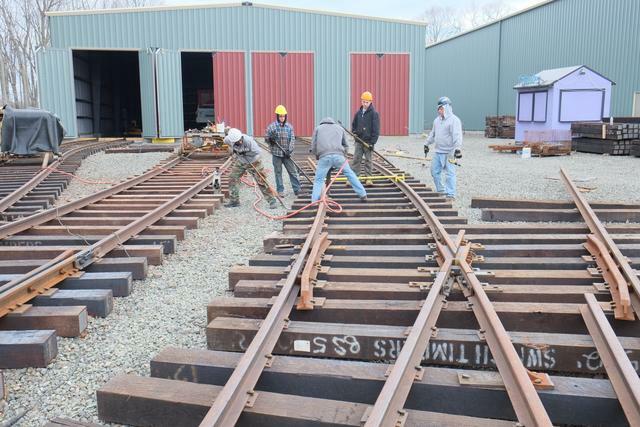 As the Feb 22 work party began, ties were waiting on 83 track. 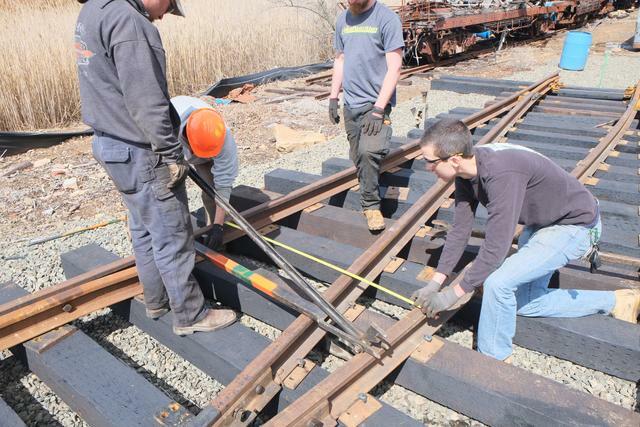 Volunteers distributed lengths of rail on the ties and bolted them together. 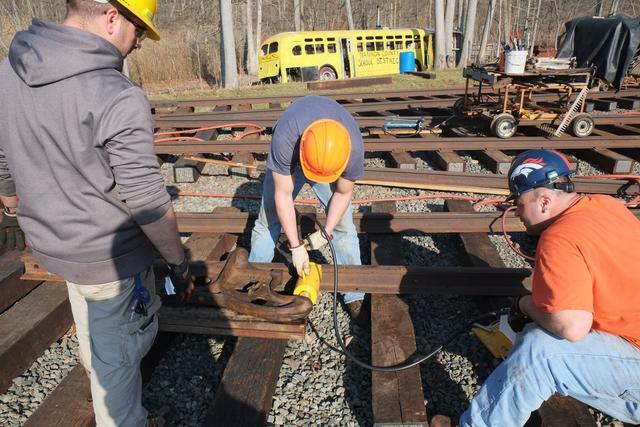 Additional ties were inserted as needed to support each joint. Now it was time to begin spiking down one entire side to proper alignment. This was done with the assistance of a construction laser. 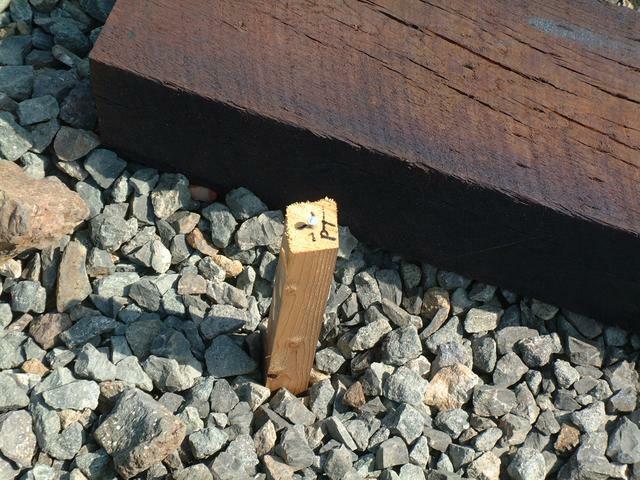 The red laser line on the wooden sighting block is the gauge line of the line rail. 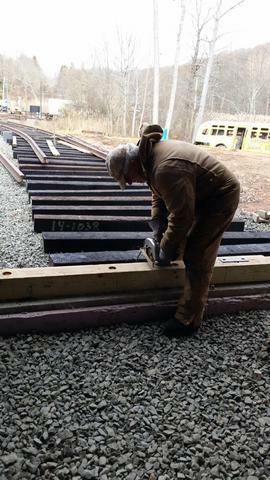 Here a volunteer is pre-drilling and setting spikes after the rail has been lined in. 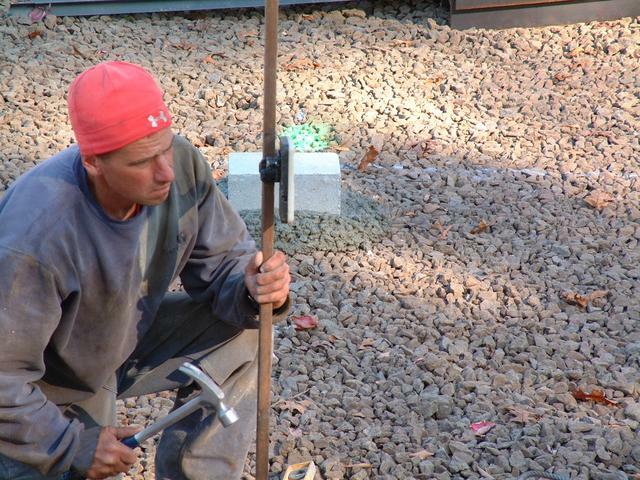 It will then be spiked down with the pneumatic hammer. Another volunteer supports the tie. 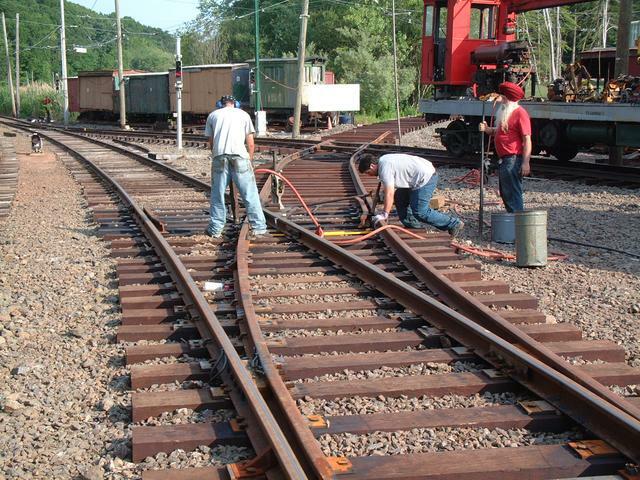 Meanwhile on 81 track, a few ties that were skipped during the initial gauging-in were now finished off by hand. 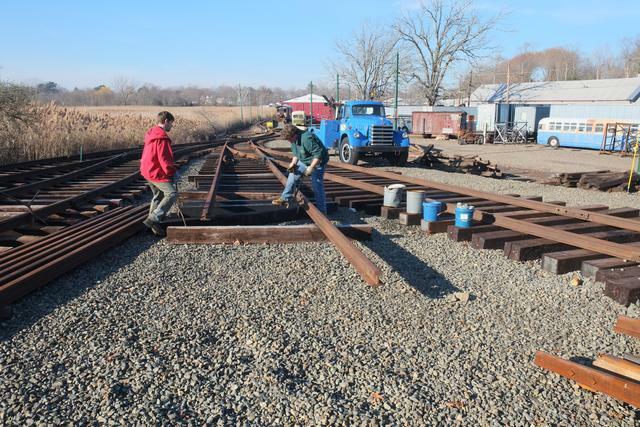 Mar 14, 2014 It was sometime in the Ford administration when the museum's main line track was last cut to install a switch! Finally after a seemingly endless snowy winter, the weather improved sufficiently to begin this project. 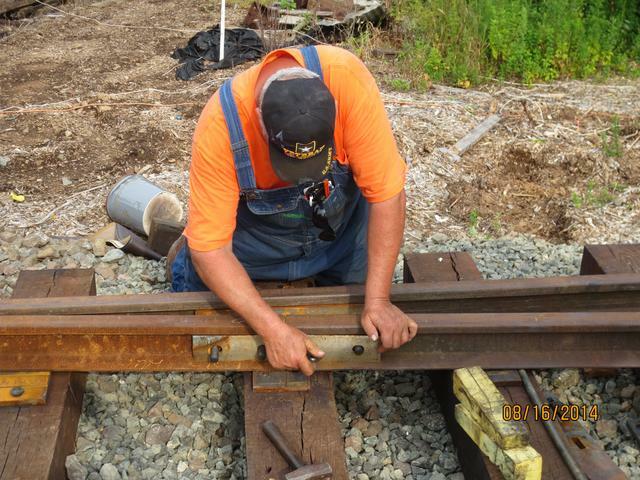 Above, unbolting joints on the existing 78NH mainline rail. 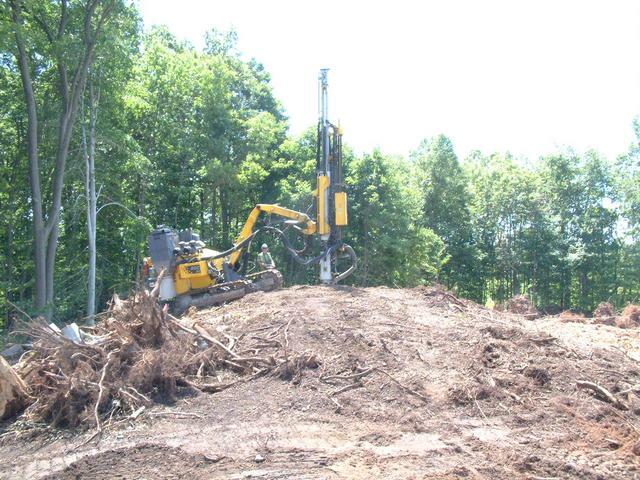 Below, using a hydraulic spike puller really made the job go a lot faster. 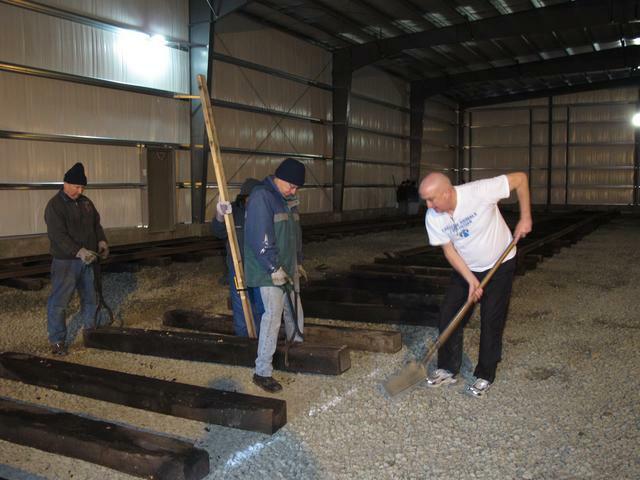 With a large group of GWCC and museum member-volunteers, several gangs were at work at once getting the rail prepared for removal. 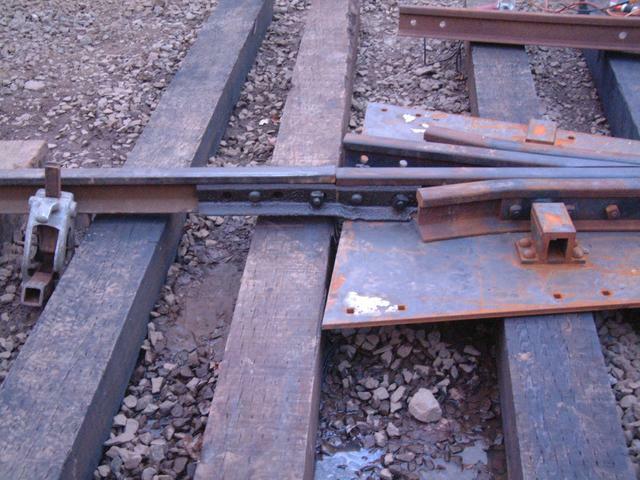 These traction power return bonds had to be ground off prior to separating and removing the lengths of rail. 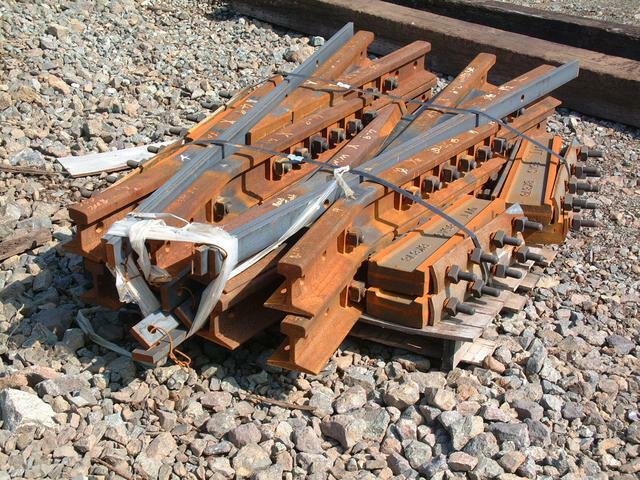 Now it was time to lift out 4 sections of 78NH rail and set them aside. 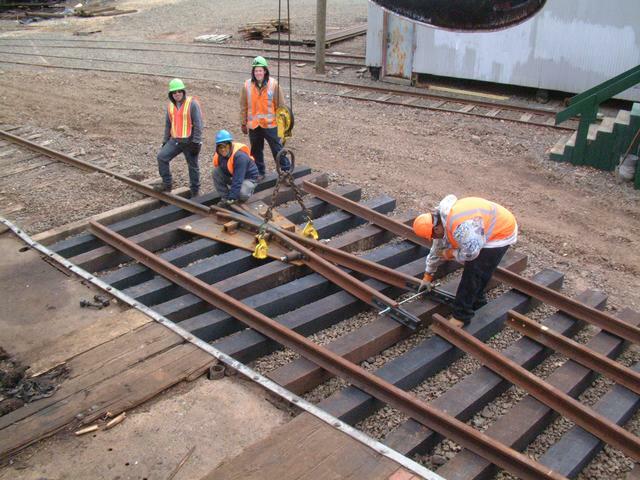 Rail tongs are applied to the center of each section and crane W-3 then lifts the rail. 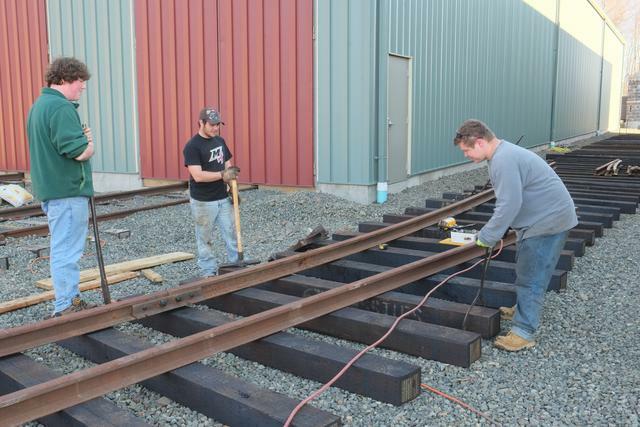 Two volunteers "walk" the rail along a short distance and then set it down outside the work area. 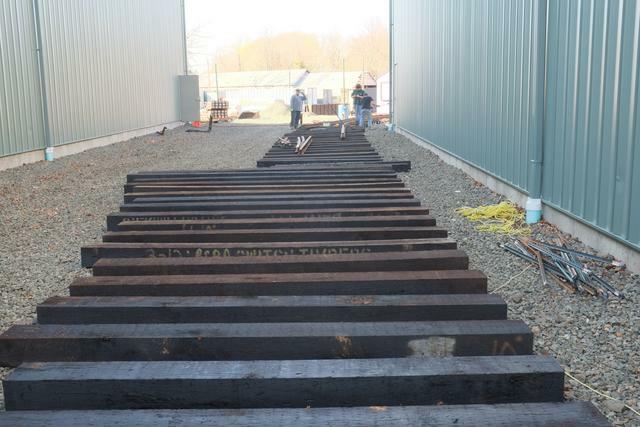 The tie plates which were under the rails are carefully picked up and stacked for future re-use. 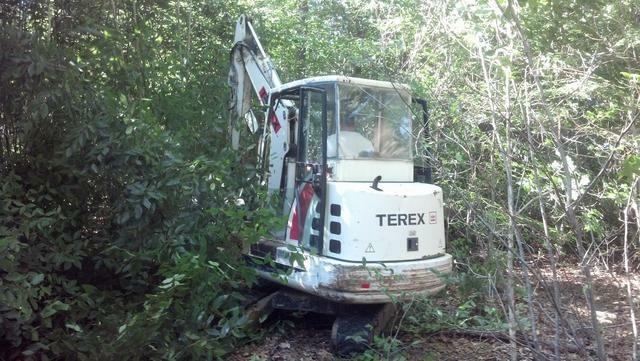 The 'Bobcat' comes along and picks the old ties out of the ground, then moves them out of the work area. 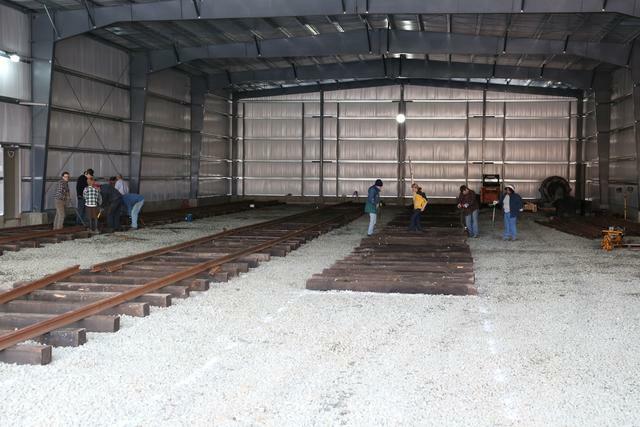 The ties were sorted into 3 piles: good for re-lay (some of these ties had just been installed last year), good enough for temporary track, and discard. 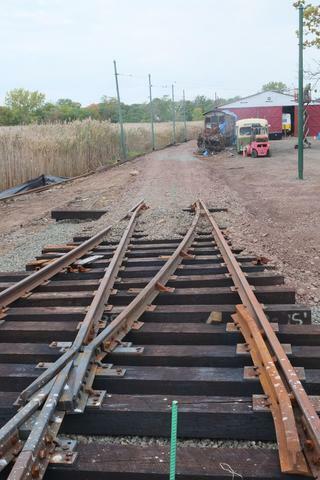 The sight of the missing stretch of track is somewhat intimidating. 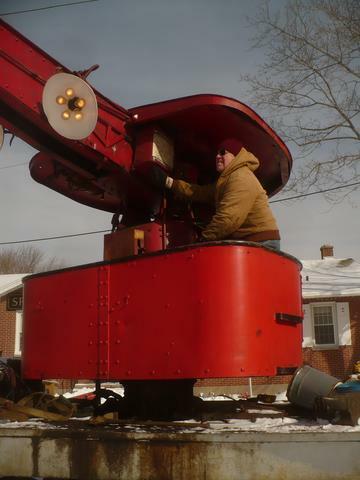 Volunteers in the signal department install a temporary jumper. 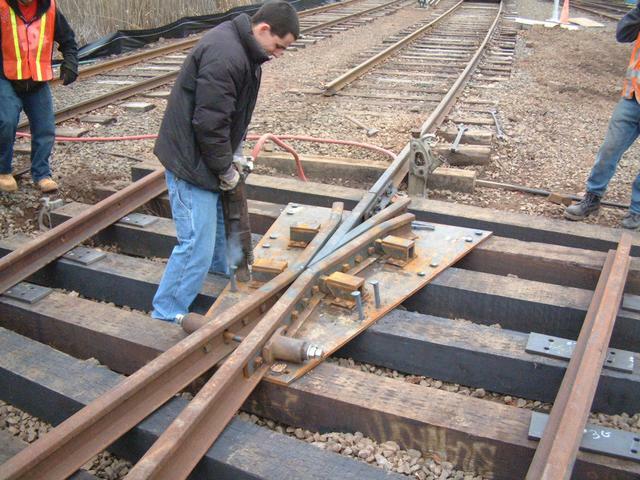 With one of the main line tracks cut, this is needed to provide a redundant path for traction power return to the substation. 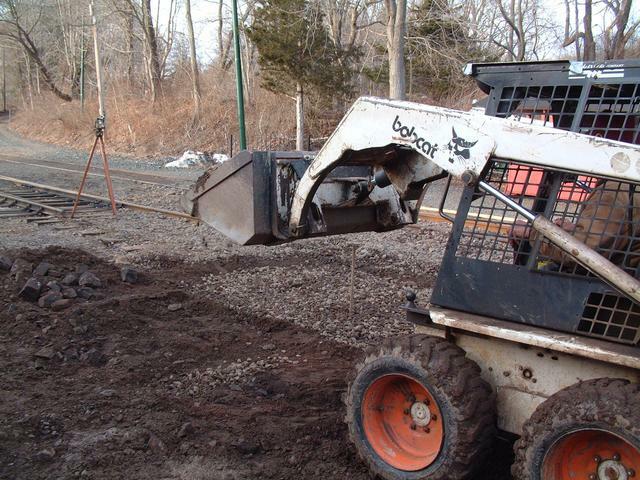 The Bobcat comes back and cleans up the roadbed where the old ties had been removed, and then spreads and levels some stone to support the new ties. Now the work of setting out the ties can begin. 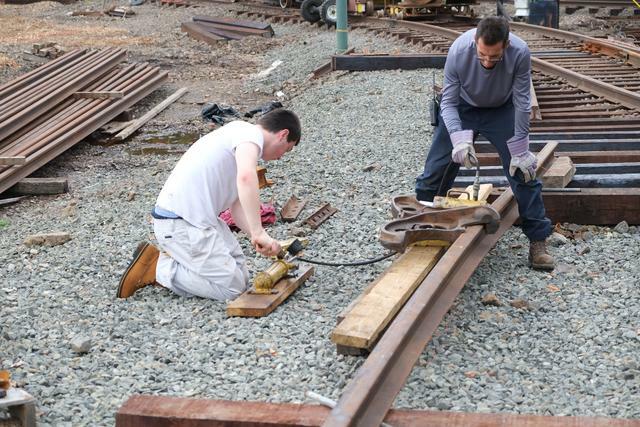 The turnout begins with two 'headblock' ties 15' long which will support the switch stand, then forms a triangle getting wider as it goes from the points to the frog. Crane W-3 was used to bring ties from the tie pile and place them into rough position. 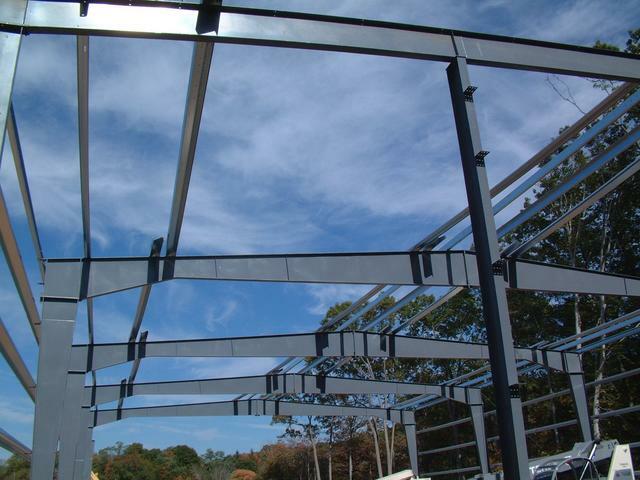 After being roughed-in, the ties were lined up and spaced following the drawing layout. 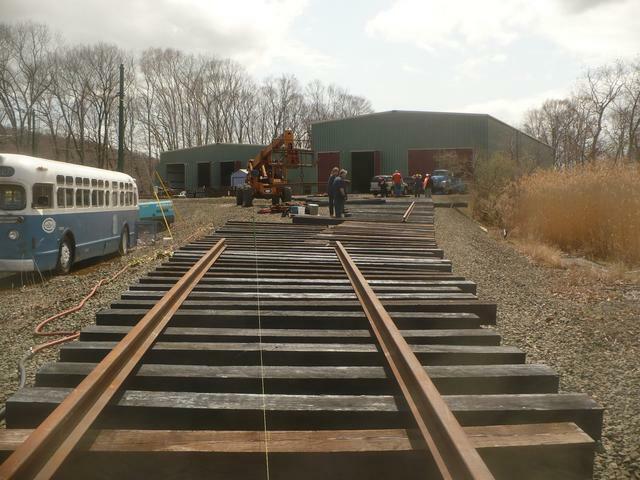 The next step will be the installation of the rails. 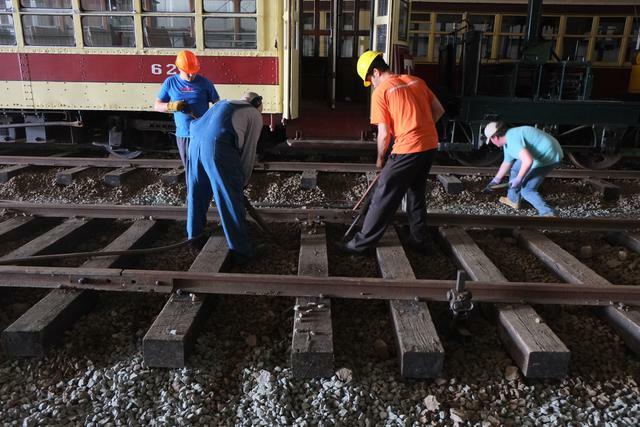 During the last weeks of February and into early March, museum volunteers working alongside GWCC volunteers completed 3 tracks inside the building and roughed-in the 4th track. 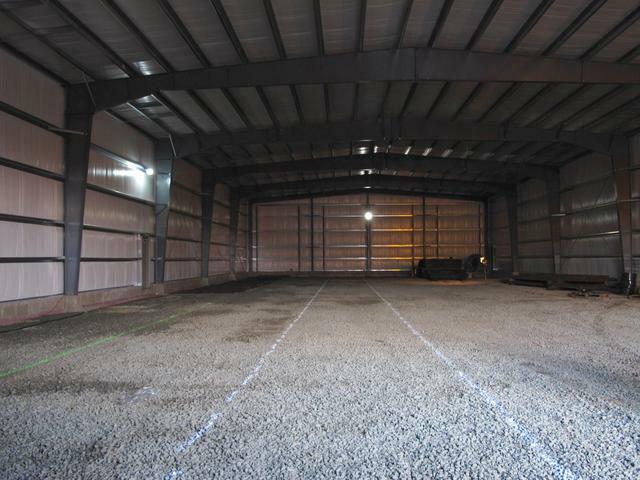 Only 81 track is complete to the door. 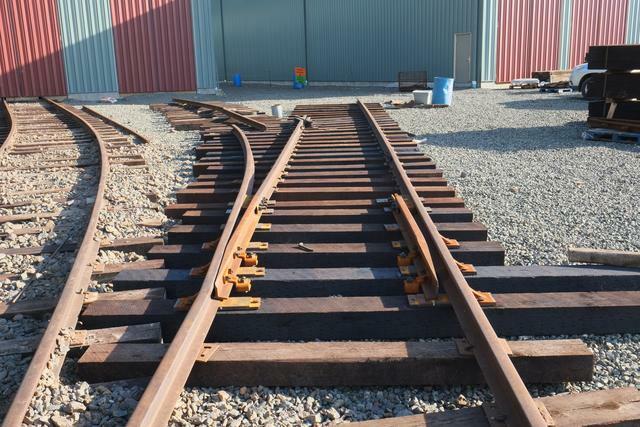 The other 3 tracks are being left about 30' short right now to facilitate movement of heavy machinery within the buildings. 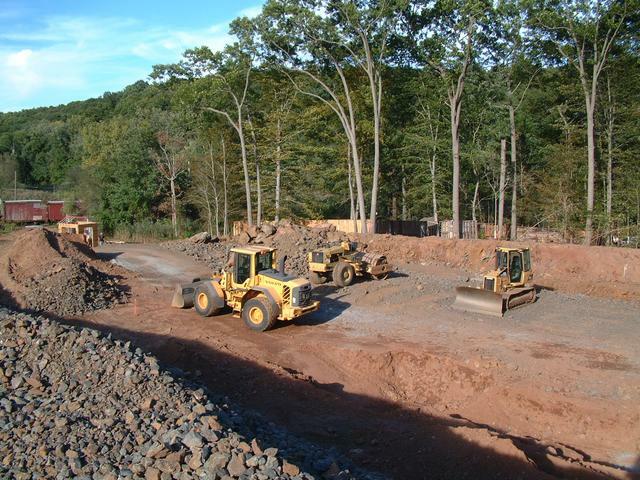 Above the large payloader delivers a few yards of stone and stockpiles it within Building 8. 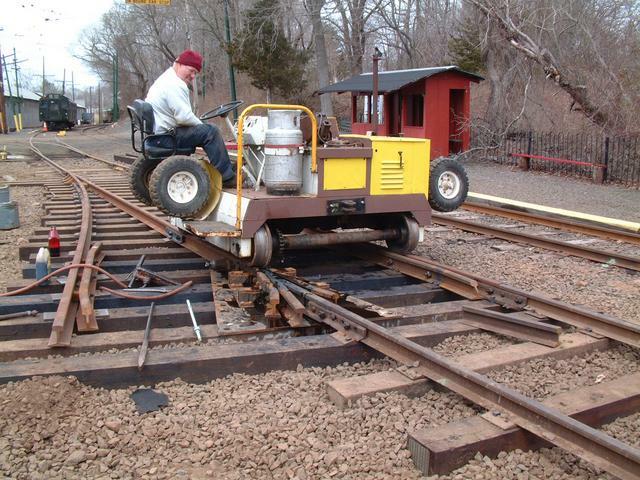 The contraption below is a home-made 1/2-yard hydraulic dumper mounted on a track cart. 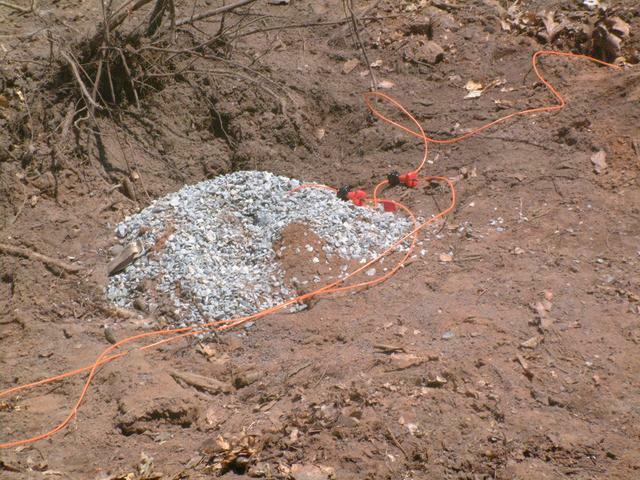 The stone is loaded from the pile into this bucket using the small 'Bobcat' and then spread along the track. 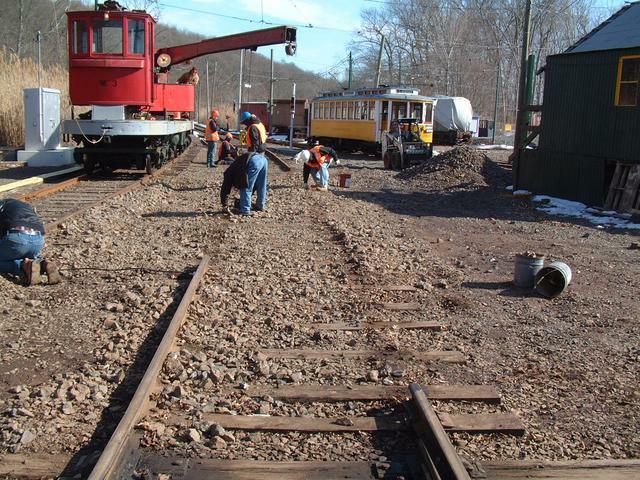 Once the stone is spread, each track will be jacked up, leveled and tamped. 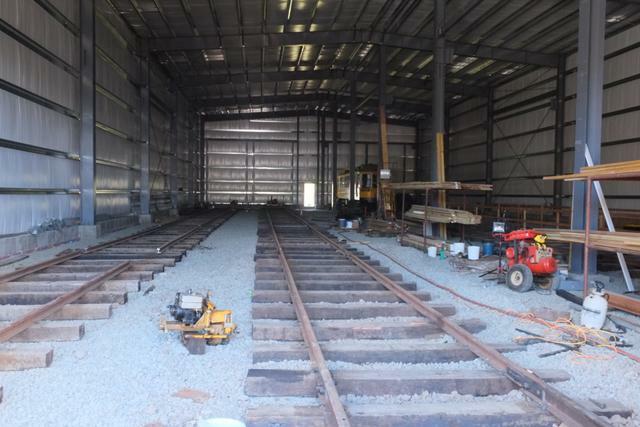 Above, view of all 4 tracks inside Building 8. 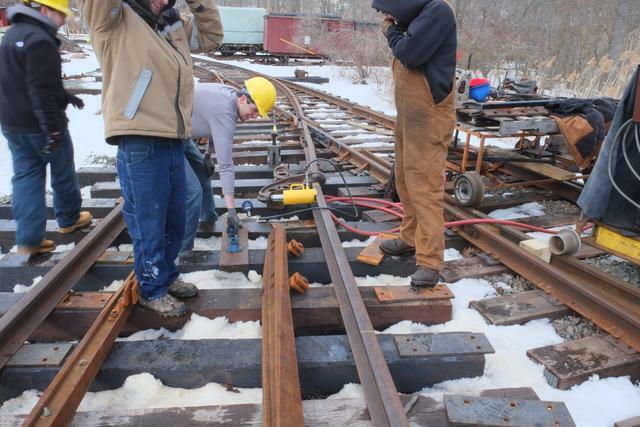 Mar 17-21, 2014: With the switch ties placed and roughly aligned and leveled, the process of installing the actual turnout began. 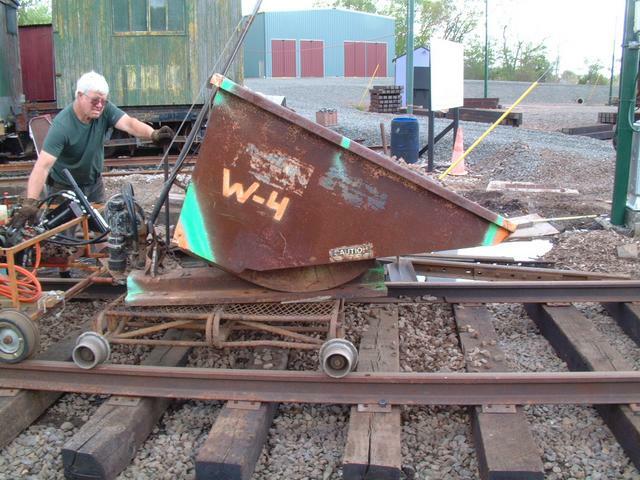 Crane W-3 was used to pick up the rails (stock rails, closure rails, switch points and guard rails) which had been stockpiled and lay them out on the ties. 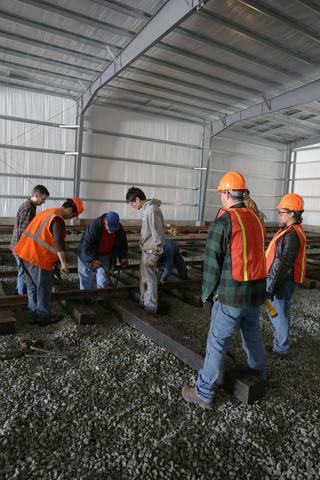 Gateway College Students Kurt, Cameron, Jeremy and Darrell are seen handling the material. 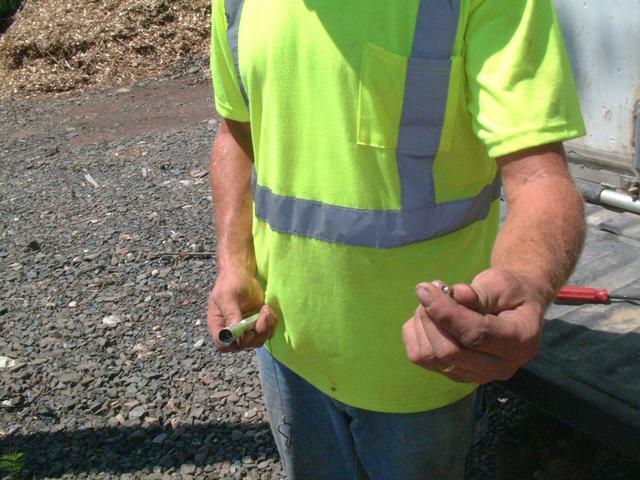 This #4 double-spring frog, below, was handled using special plate clamps. 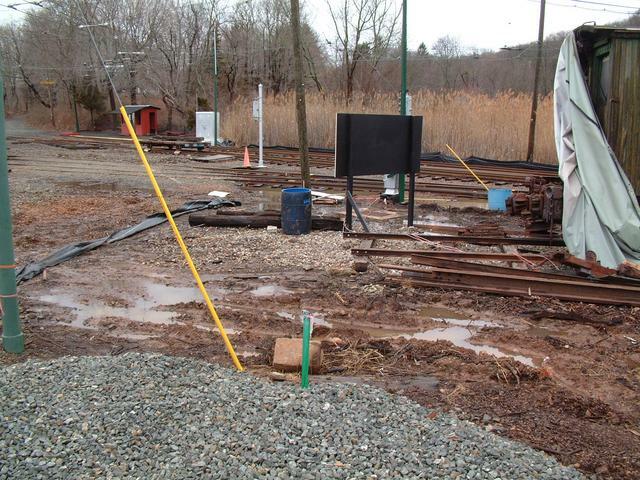 The existing mainline track in this area is 78NH (New Haven R.R.) section. 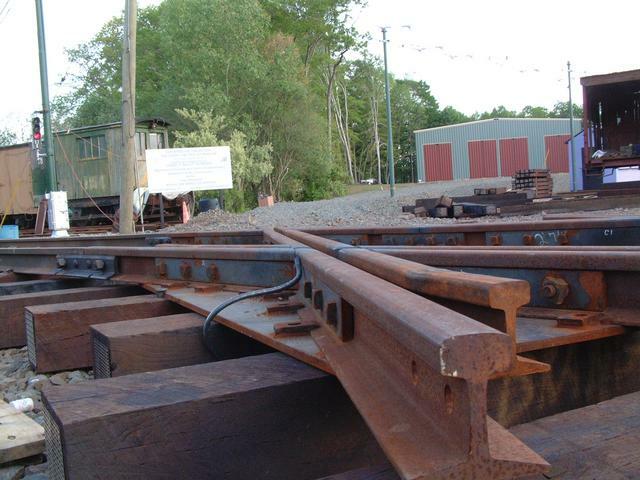 This rail was obtained used in the 1960s and was installed by museum volunteers to replace the heavily worn 80AS rail which had been left from the line's Connecticut Company days. 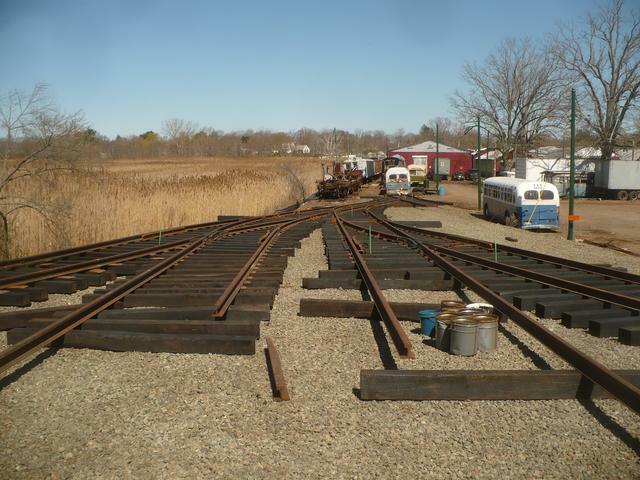 Since 78NH is not being rolled new anymore, the museum decided to standardize on 80AS for all the new trackage. 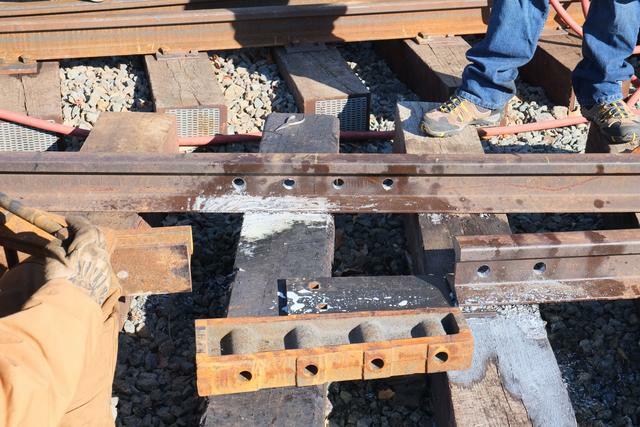 Thus a "compromise" joint is installed between the 78NH existing rail on the left and the new 80AS frog on the right. 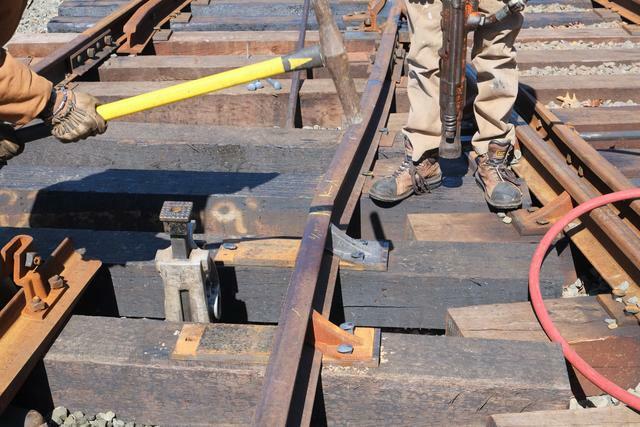 The ties have not yet been aligned, raised and tamped to support the joint. 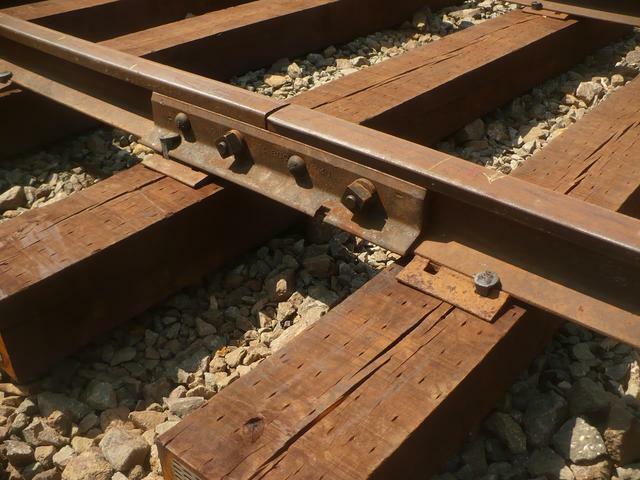 The angle of the frog was established by sighting along the gauge line of the rail towards a stake that had been set in the distance by means of surveying instruments. 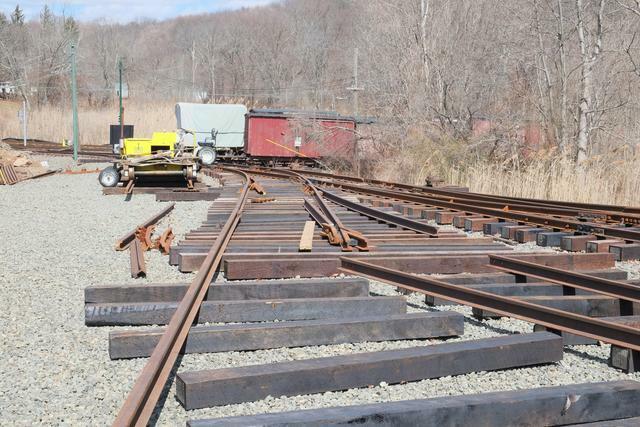 The track diverging to the right will not be going through the line pole as it might seem: it will take a slight further right curve before crossing the Narragansett siding track ahead. 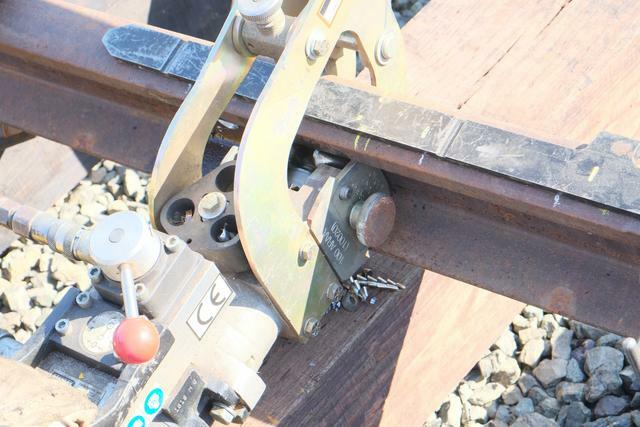 The threaded rod is a temporary measure to hold the wing rails, both of which can swivel in this double-spring frog configuration, to the correct "spread." After alignment, the frog was spiked down. 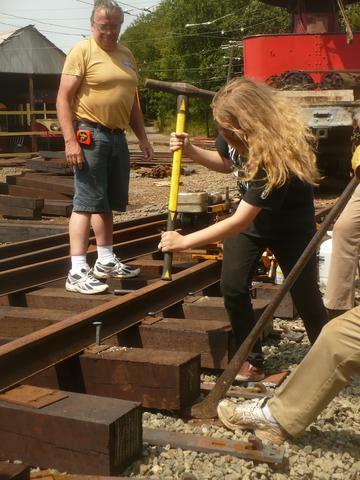 Here a museum volunteer joined forces with a Gateway College student volunteer, both named Joe oddly enough. 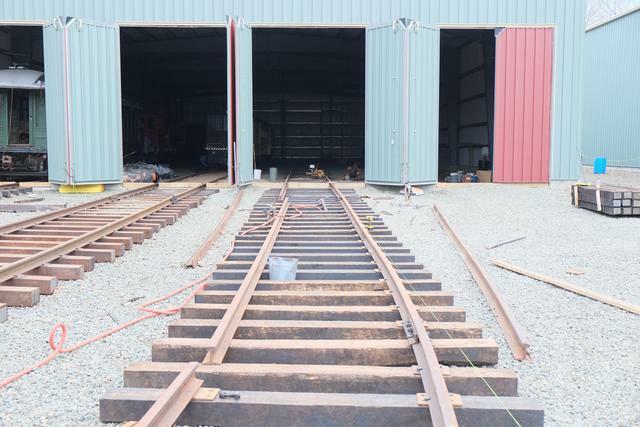 Mar 23-30: An obstacle in the path of the track leading to the new barns was the pair of temporary tracks containing parts storage boxcars. 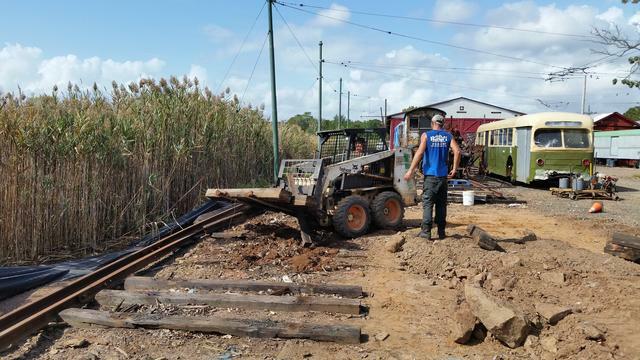 One such track was extended to the east by about 18' and all the cars were moved up with a payloader. 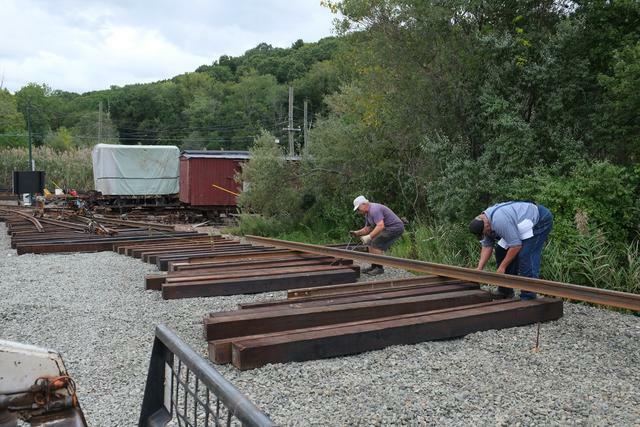 Then one boxcar on the other track was moved out of the way onto an isolated stretch of track. 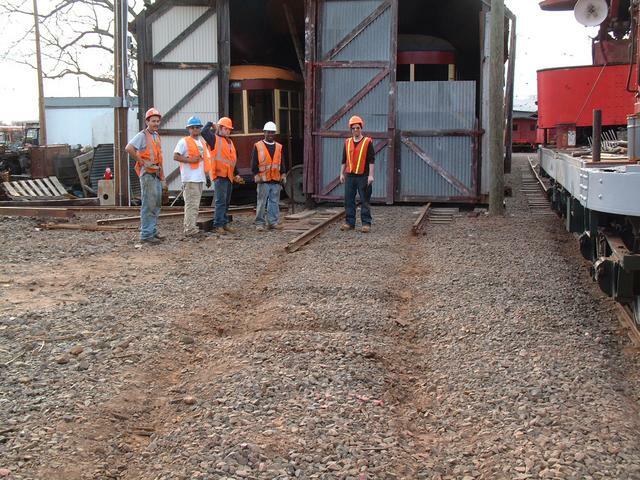 This boxcar, which is not part of the museum's historic collection and is in poor condition, will be transferred to a private collector soon. 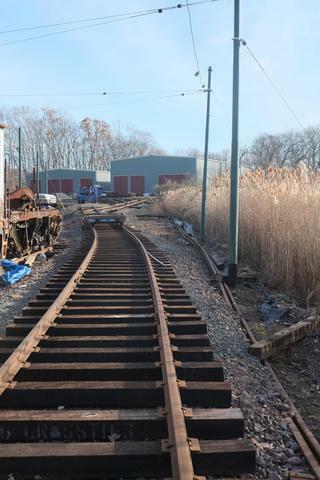 The view from the ramp looking back towards the main line. The back-guy with its yellow safety guard will be relocated. 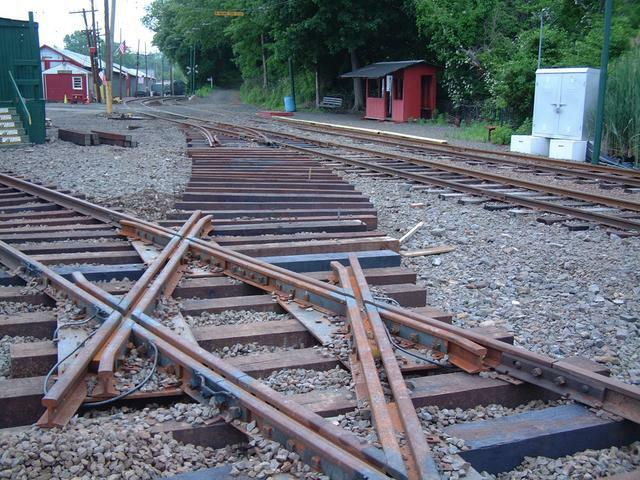 The track, whose center line is marked by the green stake, will turn left here and descend to meet the new main line turnout. There are many components to a turnout. 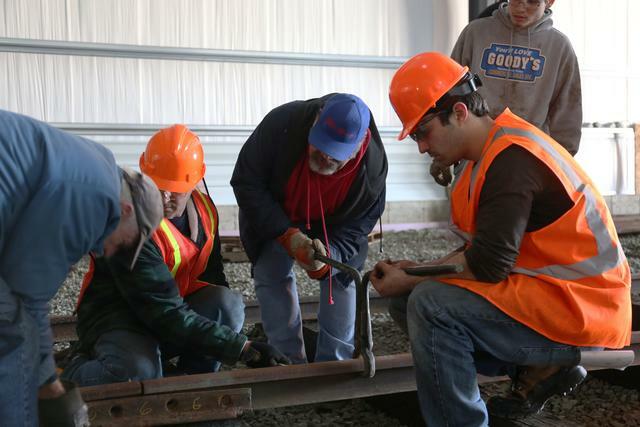 Here GWCC students install the "heel block" which forms the pivot point for the switch. 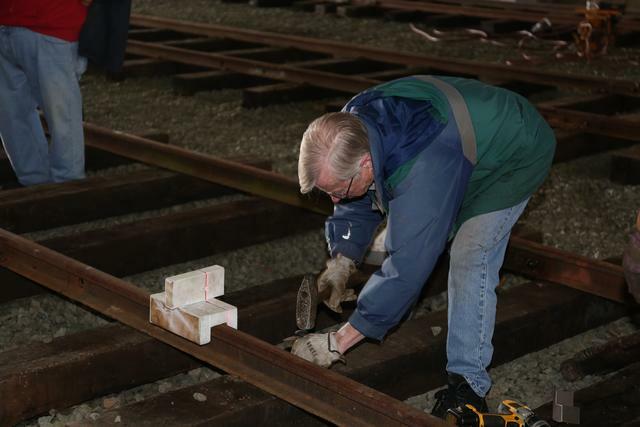 Both heel blocks are installed, and the diverging stock rail is being gauged against the frog, as GWCC professor Larry I. inspects the work. 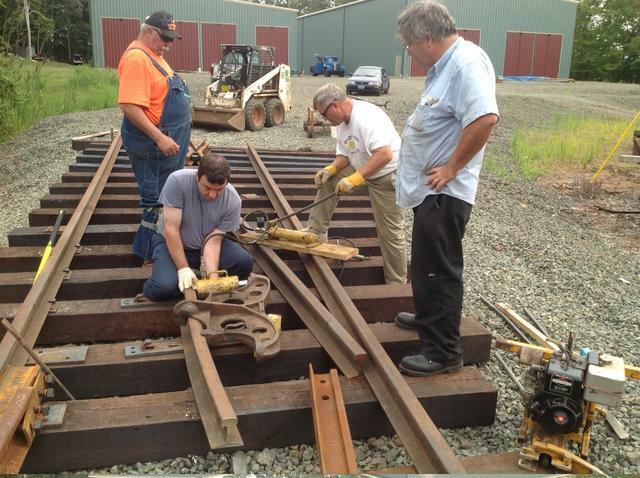 Work continues as the correct plates are installed under the rails and spiked down. 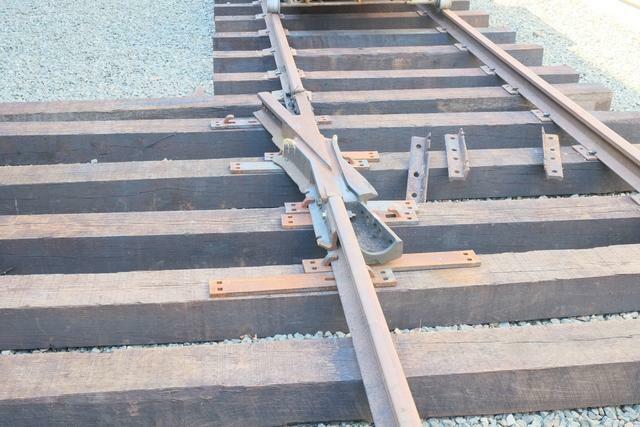 The switch points have now been connected up to the heel blocks, and both closure rails are connected between the heel and the frog. 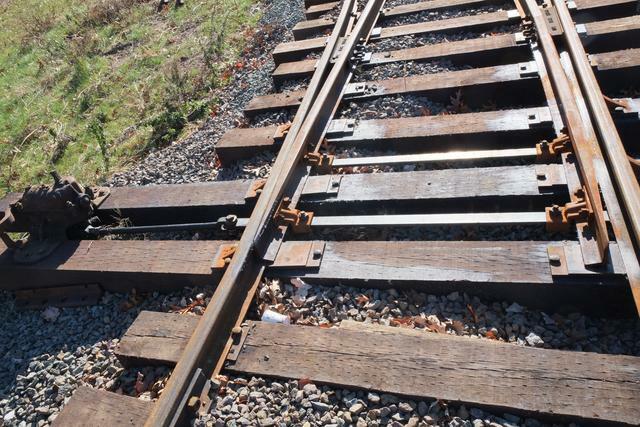 The rail on the left has been spiked to position so that it lines up with the existing rails. The turnout on March 30, view from the west and east ends. 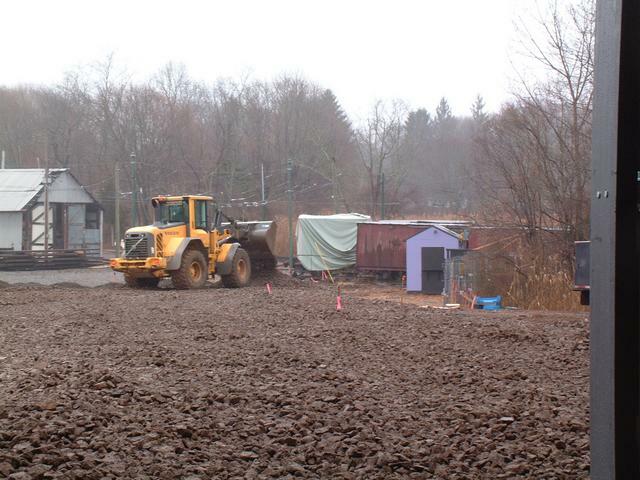 Heavy rains earlier in the day meant working in muddy conditions. 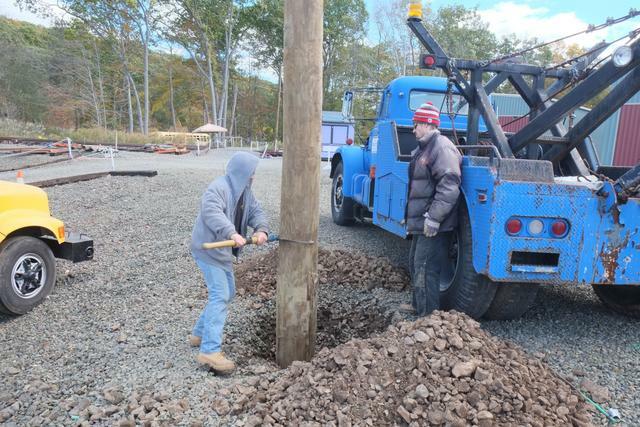 The Bobcat brings a load of stone to begin tamping up the switch. 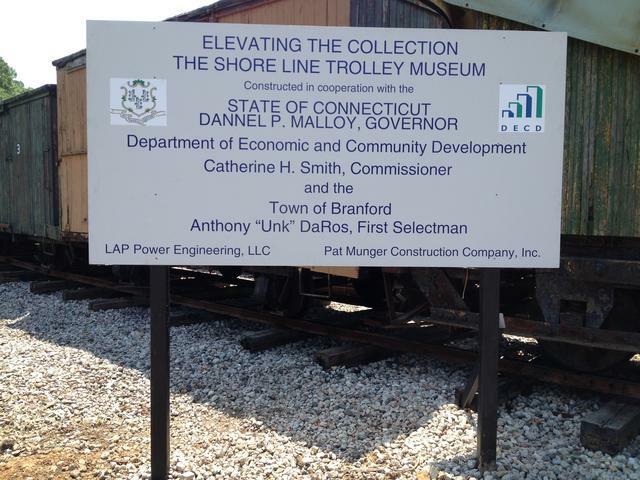 Apr 1-13, 2014: The first new turnout in the Elevating the Collection project is now open for traffic! 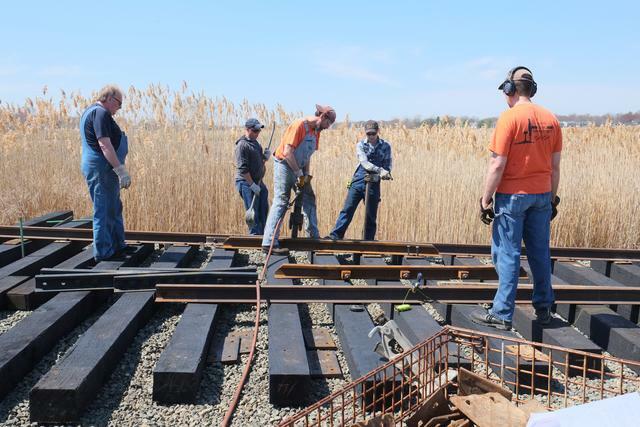 The turnout had been designed to coincide with one existing joint in the main line, requiring the addition of three new joints. 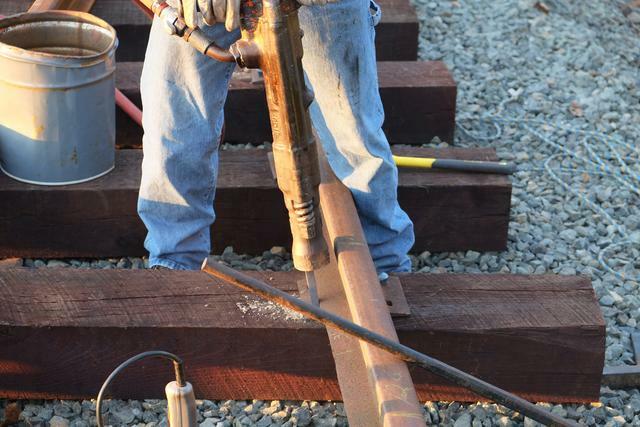 Three lengths of 78NH rail were cut to exact length, drilled and installed. 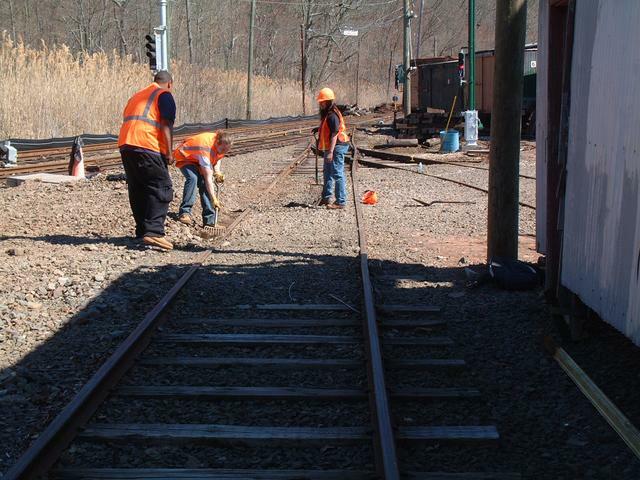 This restored the continuity of the outbound main line track. 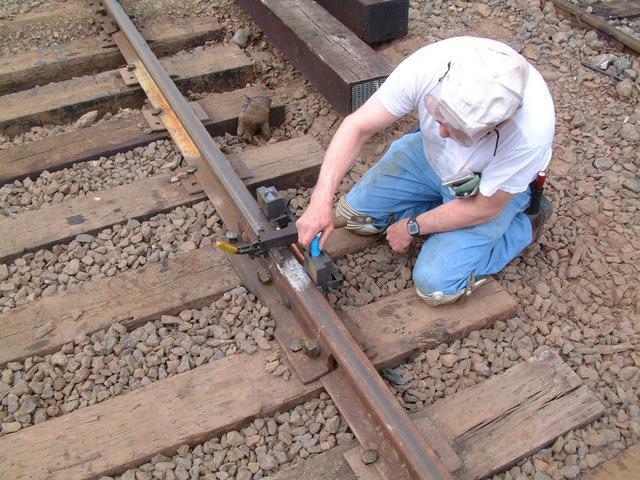 Above: using our somewhat antique gasoline-powered rail hacksaw to trim a piece of rail to length. 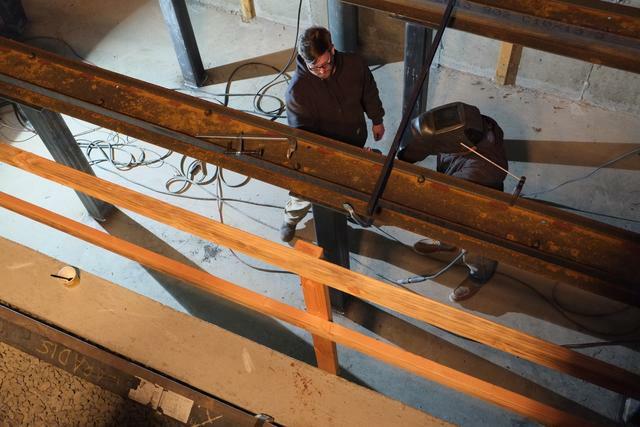 Below: Drilling the holes for the joint and bolting up the joint bars. 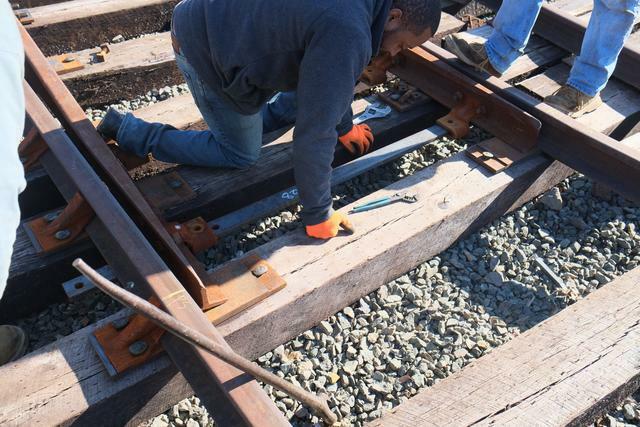 After the turnout had been entirely spiked and gauged (on the main line track side only for now) it was placed in proper level. The yellow spirit level board checks the cross-level. 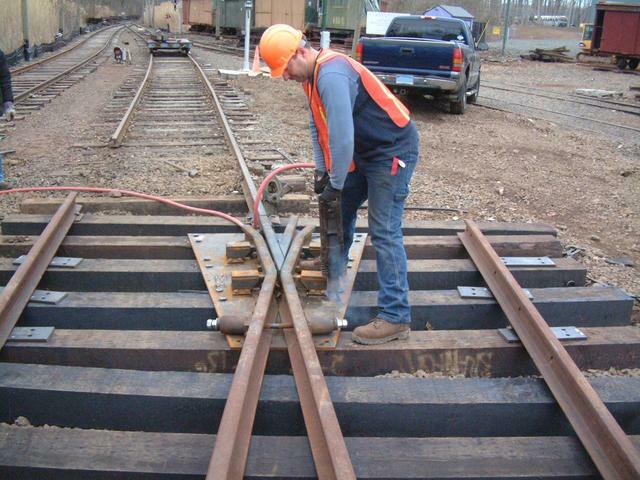 If one rail is higher than the other, the track is jacked up and the pneumatic tamper is used to tamp the tie firmly to hold the correct level. 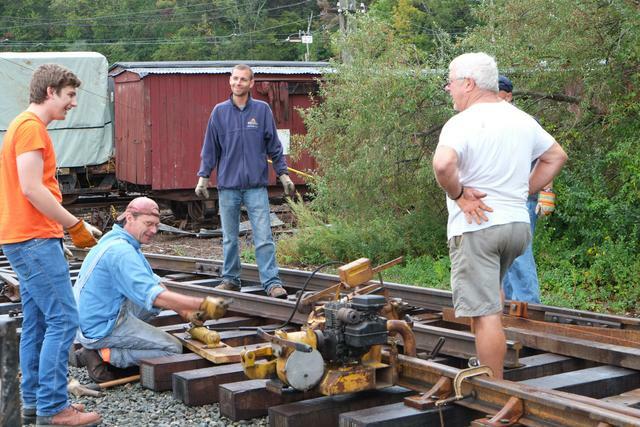 For the record, the first ever trip over the new turnout was a test run by this "car mover". 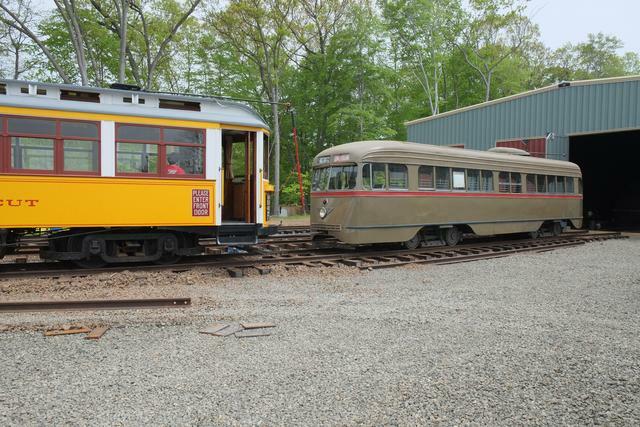 The turnout was tested with a number of cars in the collection, including Third Ave 629. 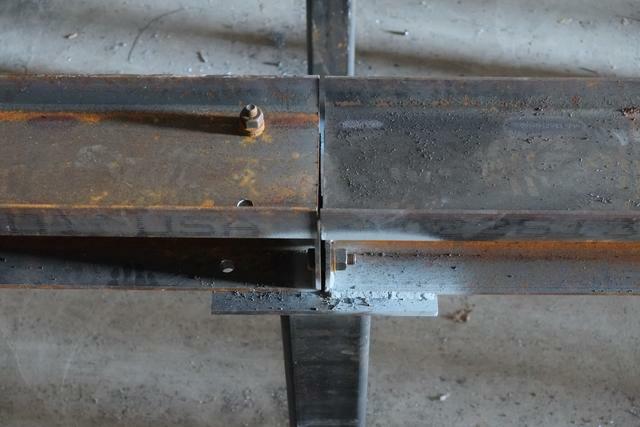 Then the bond is clamped to the rail with the bonding fixture and the latter is charged with Thermite -- an incendiary mixture of different metallic powders. 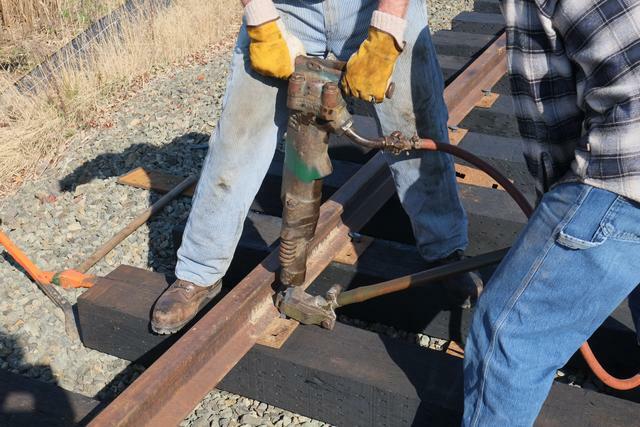 A special spark striker allows the operator to throw a spark from a safe distance, setting off the Thermite charge which welds the bond to the side of the rail. 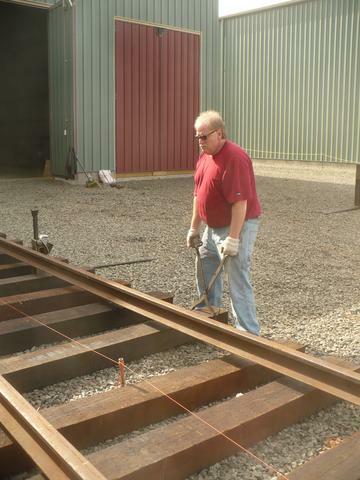 The excess metal is then peened out and the bond is ready for use. 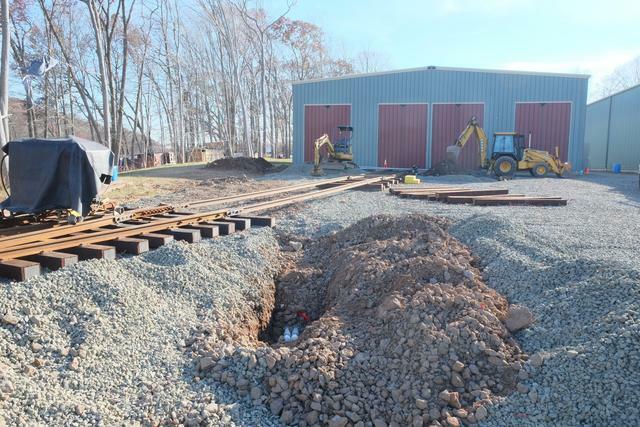 The next phase of the project will be to install a crossing of one of the existing yard tracks. 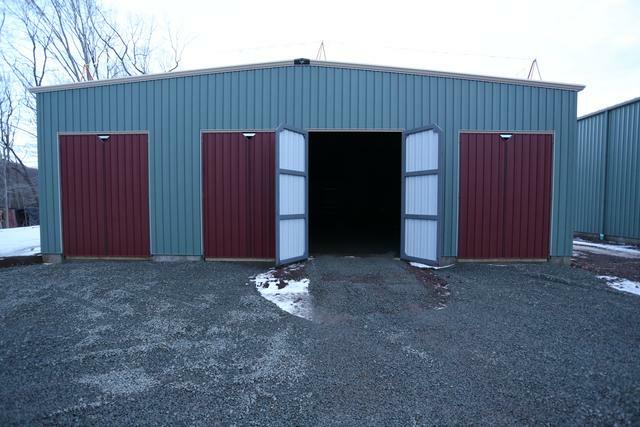 Since this will make two of our existing barns inaccessible for several months, cars have been repositioned to take this into account. 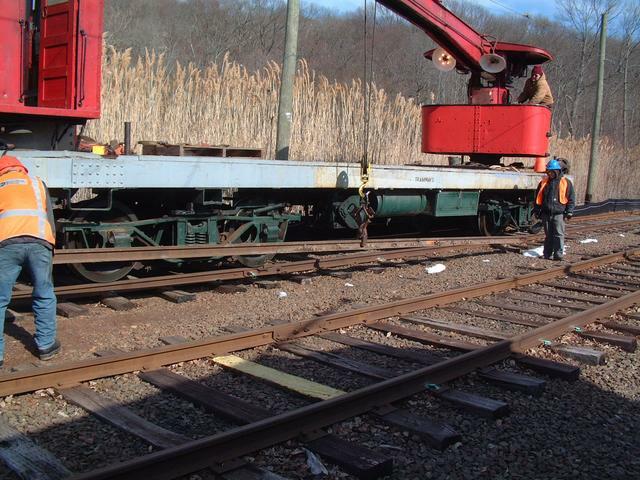 Below car 629 tows car 2001. 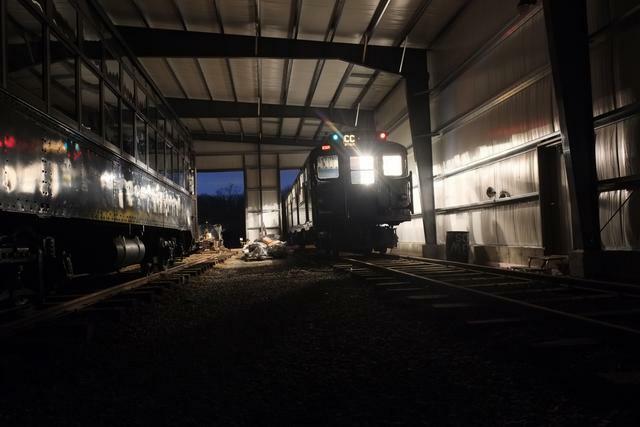 Its motors were damaged during Irene and have been overhauled through the FEMA-subsidized hurricane damage recovery program. 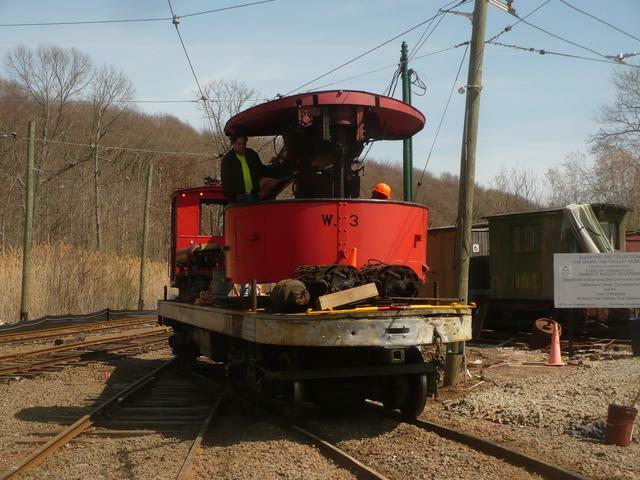 It will soon have these motors re-installed to return it to operational condition. 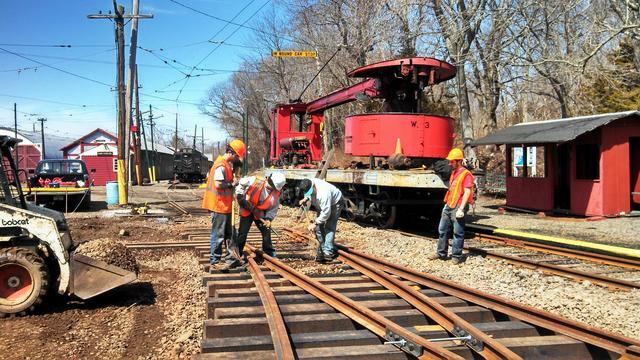 Apr 14-29: Following the first mainline turnout installation in almost 40 years is the first track removal in almost as long! 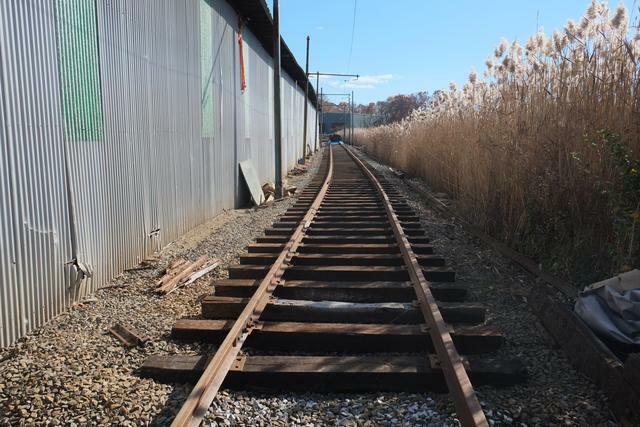 The lead to the new buildings must cross the existing "Narragansett" siding track, which was installed ca. 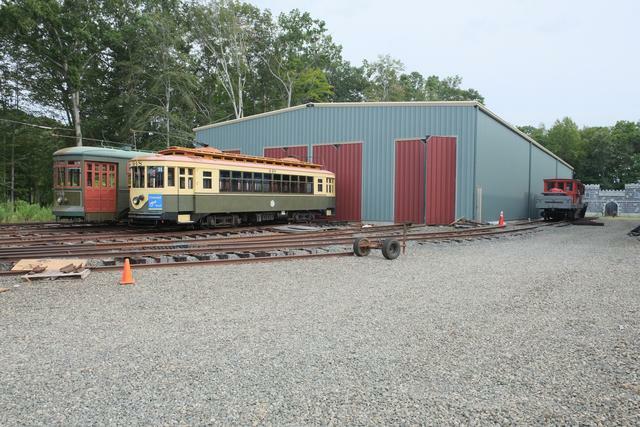 1960 and was named in honor of the company which donated the material, the Narragansett Brewing Co. Narragansett track serves and will continue to serve an important function at the museum: it provides access to the high-level platform, Barn 1 and to the east end of the car shop. Above is the spring frog of Narragansett switch in the foreground. 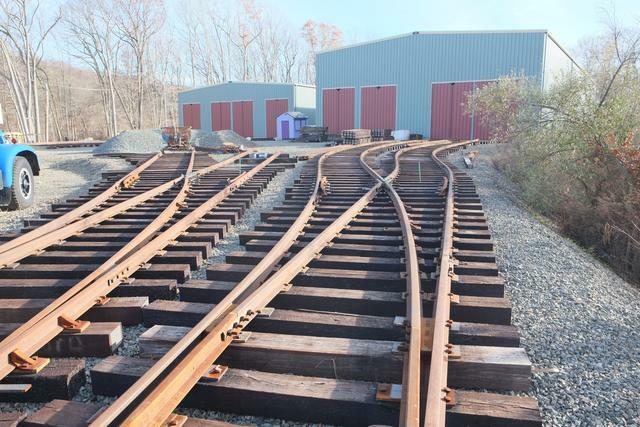 The track on the left is Narragansett siding (the other track is the outbound main track, with the new turnout in the distance). 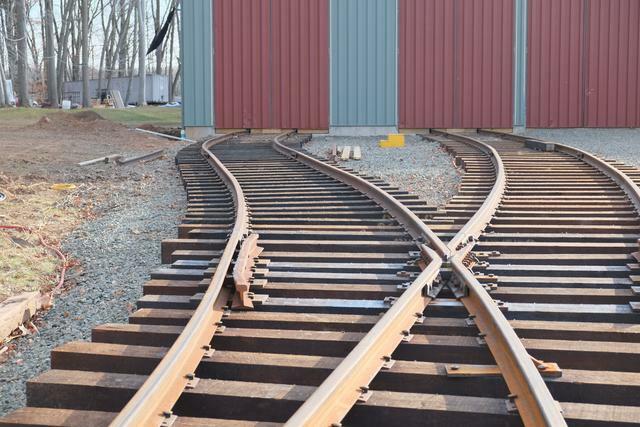 The next switch is a single-point switch providing access to track 21. 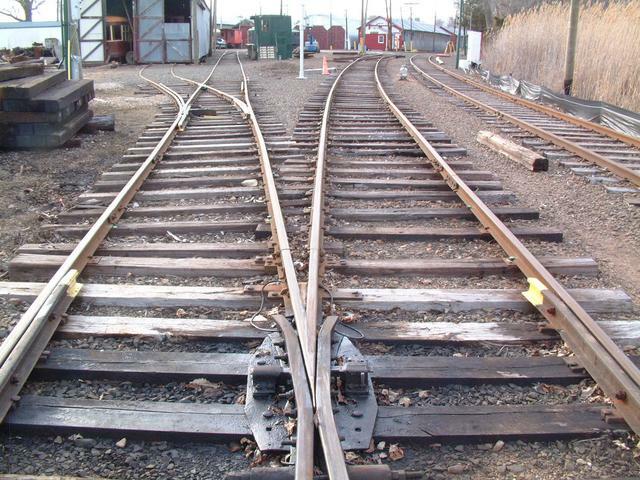 It was not possible to retain this switch in the new track layout. 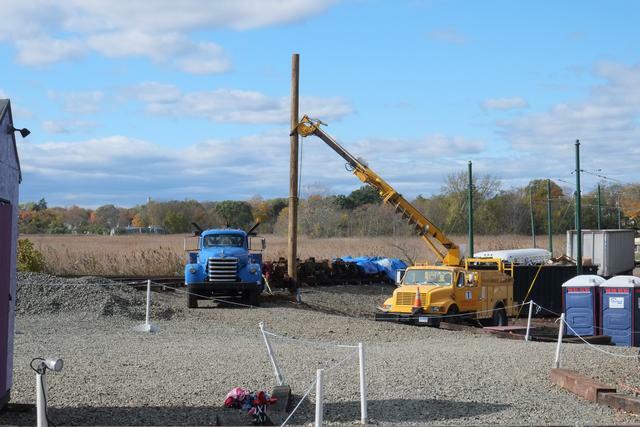 Therefore the east end of Barn 21 will be disconnected. Access is still available via the west end, although it requires traversing barns 4 and 7. 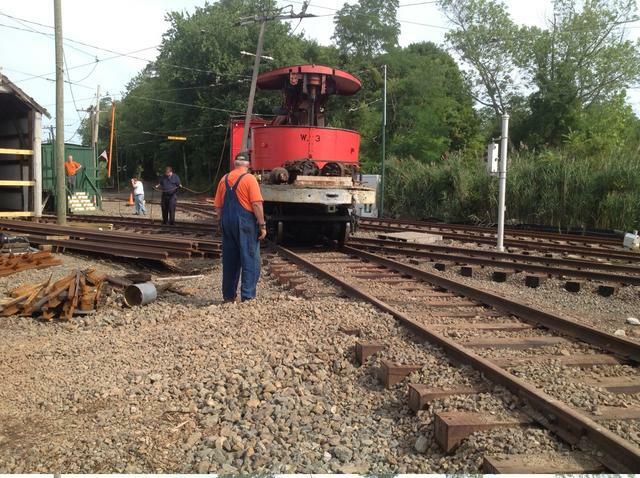 21 track and the single-point switch are being taken out. 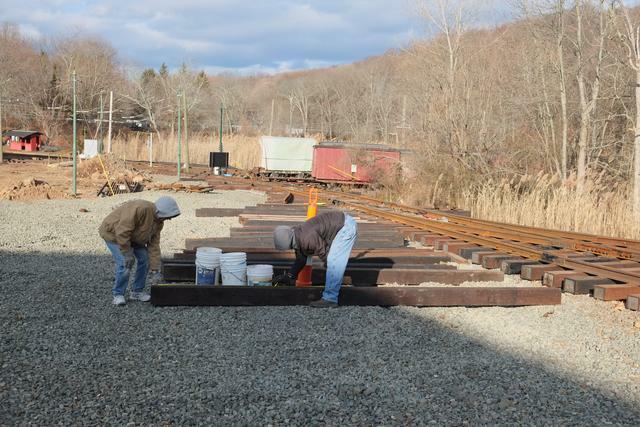 The rails of Narragansett siding will be temporarily taken up, then re-installed once the new crossing is positioned. 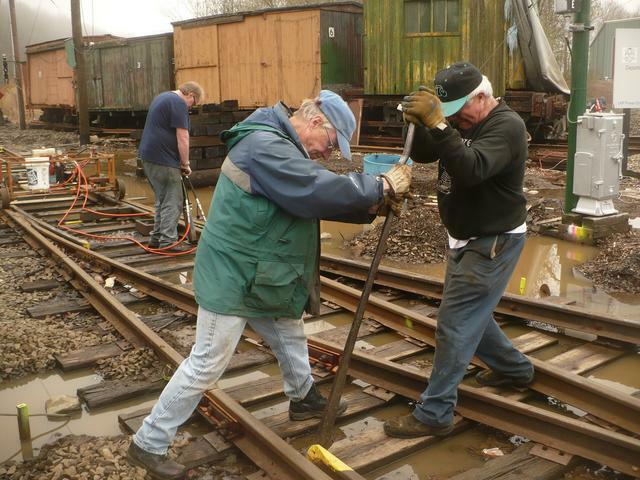 Removal began by digging out the ballast. 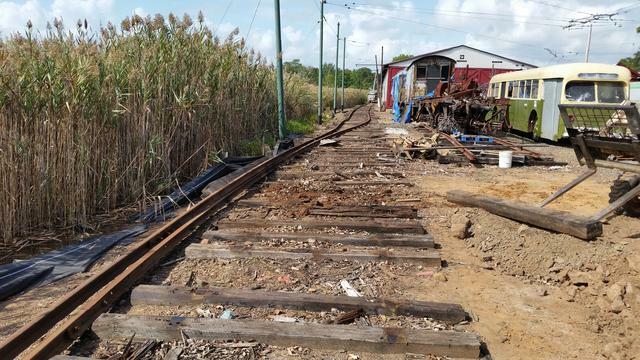 Because this area has been used from time to time as a vehicular pathway, the ballast was packed down hard. 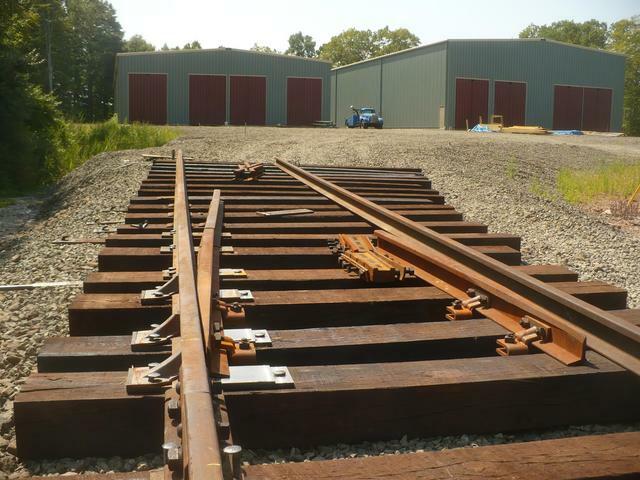 For the record, the last use of 21 track was made by crane W-3 to pick up rail which was stockpiled near Barn 2. 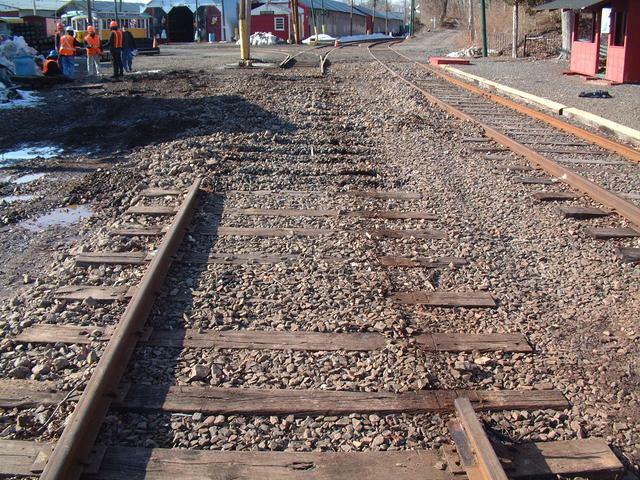 Once the track was pulled up, this rail would have become inaccessible. 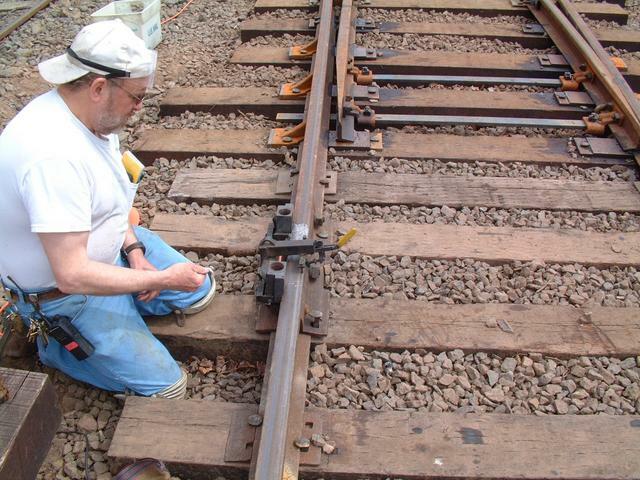 With the ballast was removed it was possible to unspike and unbolt the rail. Crane W-3 was then used to lift it and stockpile it for future re-use. 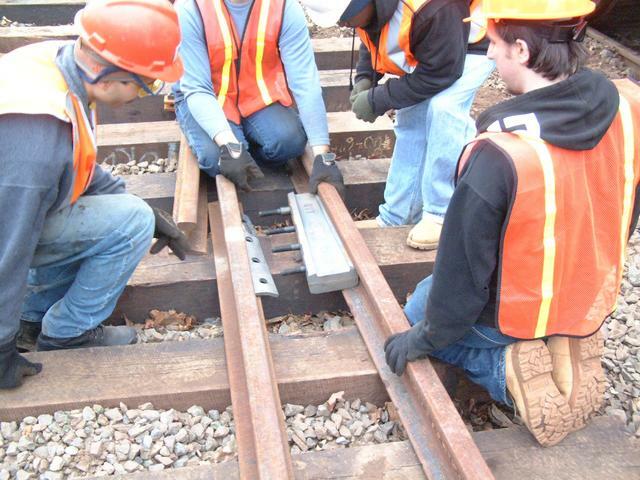 Gateway College students pose with the now disconnected 21 track. 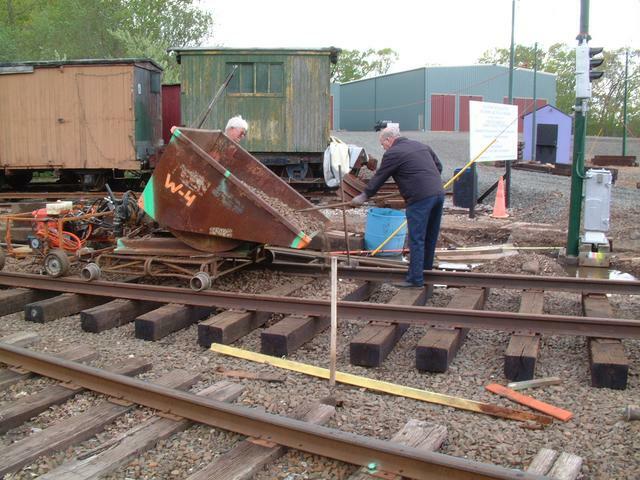 Members' Day was held on Saturday, April 26, with a large number of cars operating. 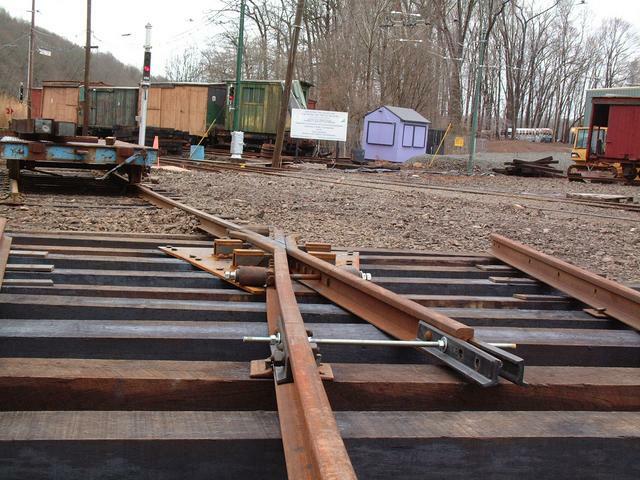 To avoid potential logistical difficulties, Narragansett track was left in place for one more day. 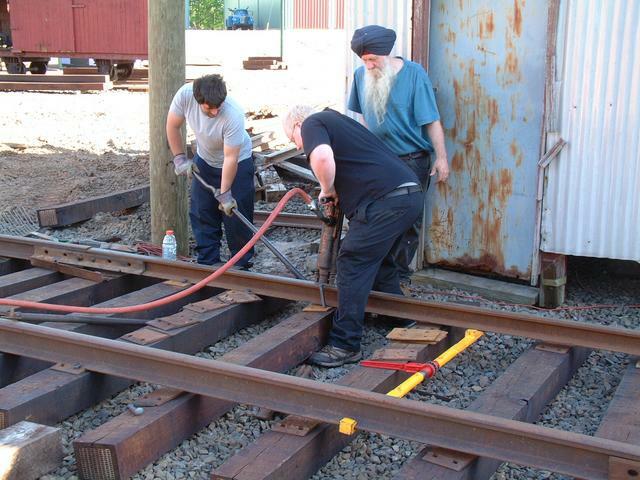 But on Sunday the 27th, work began on temporarily removing this track too. 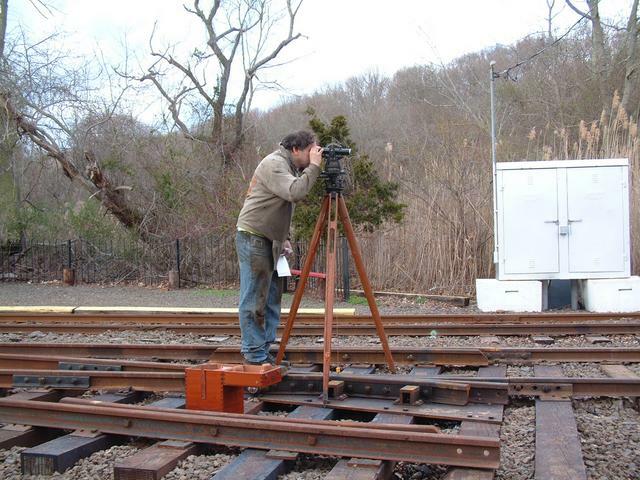 With the rail out of the way, an old-fashioned engineer's transit was used to stake out the lines of the crossing. The plumb bob hangs over the the point of the frog of the new turnout, which is a control point. 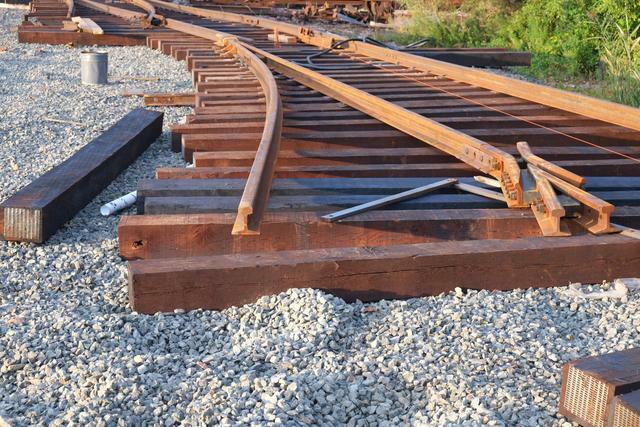 In our next update, we'll look at the crossing installation. 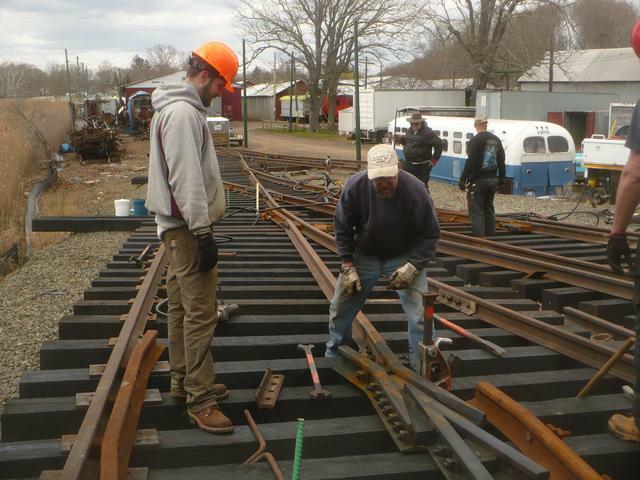 Apr 27, 2014: With Members' Day concluded, work began the next day to complete ripping up "Narragansett" siding. 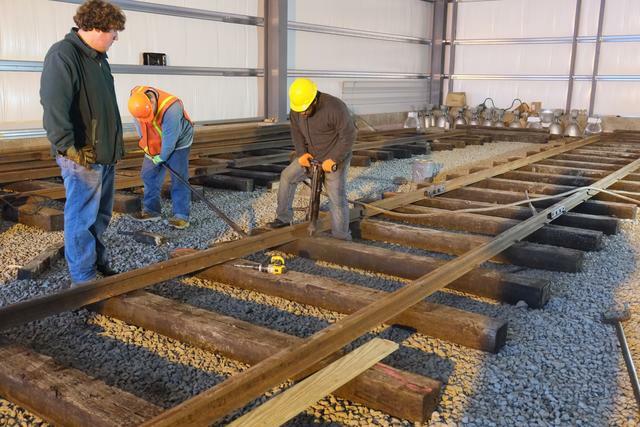 Ties were then placed in the area of the new crossing, and then the crossing itself was placed down in roughly the correct spot. 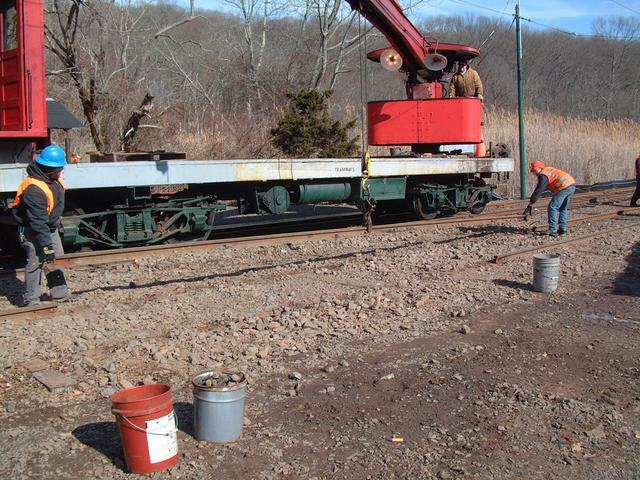 Work proceeded railroad east until all of the old siding was removed up to the frog of Narragansett switch. 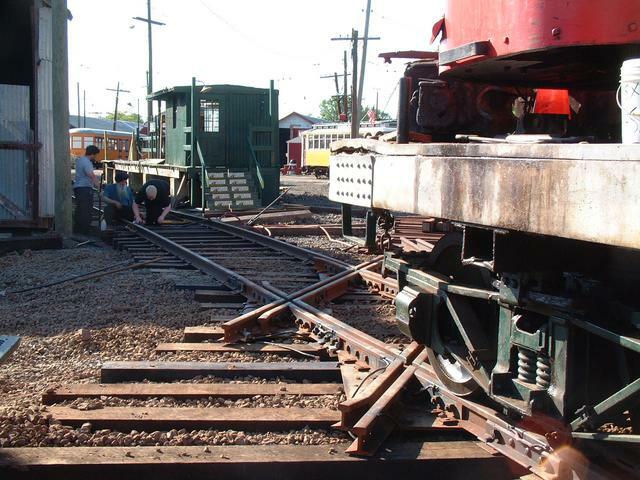 Above: Pulling out the 21 track switch. 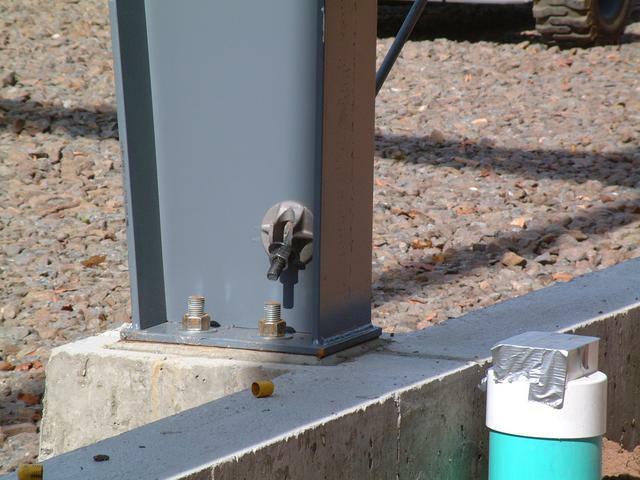 This single-point #4 switch has been set aside for potential re-use elsewhere in the project. 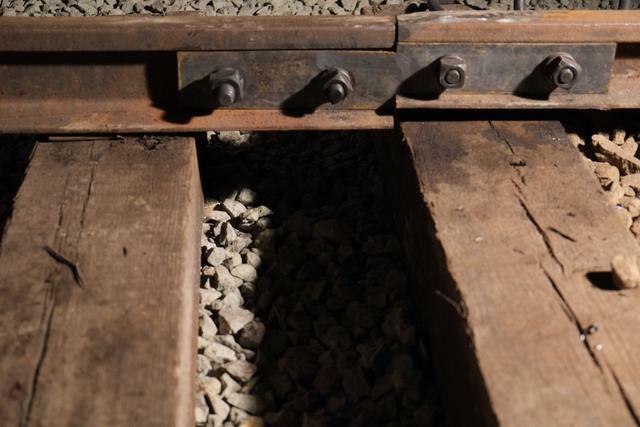 Below: The crossing was manufactured in two pieces for shipping (otherwise, at 17 feet across, it would have been too wide to ship). 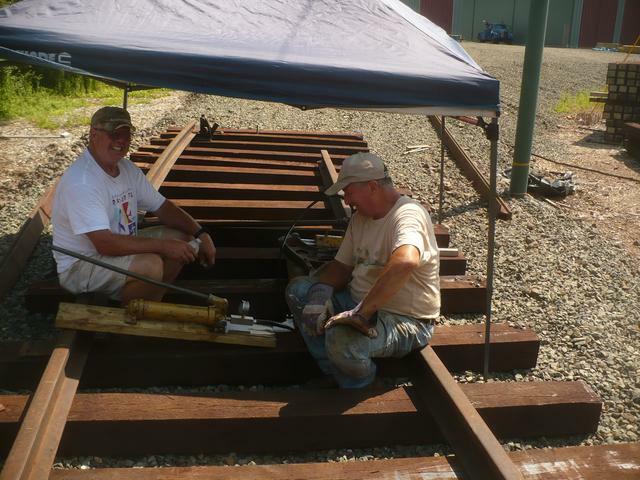 After the two pieces were set down, it took a few hours to get everything lined up and reassembled. 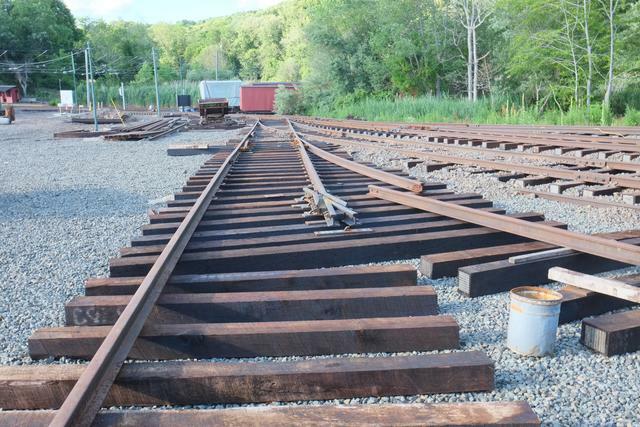 The old Narragansett siding was a mixture of 60, 78 and 80 pound rails. 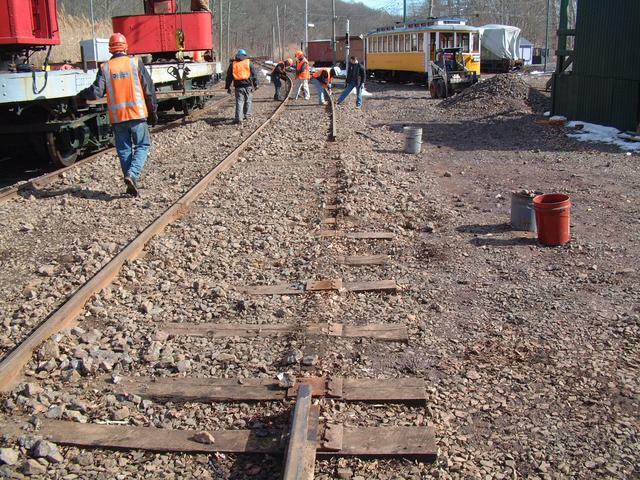 After removing the old rails, the old ties, which were in poor condition, were removed with the Bobcat, which then distributed stone and new ties. 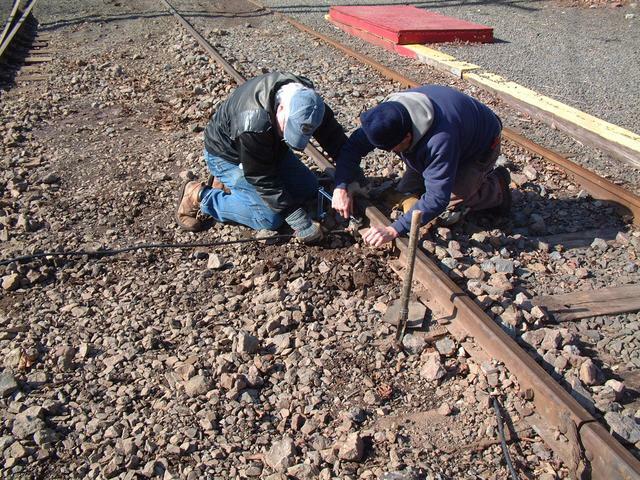 Next new (to us) lengths of 80 pound rail were distributed and placed in rough position. 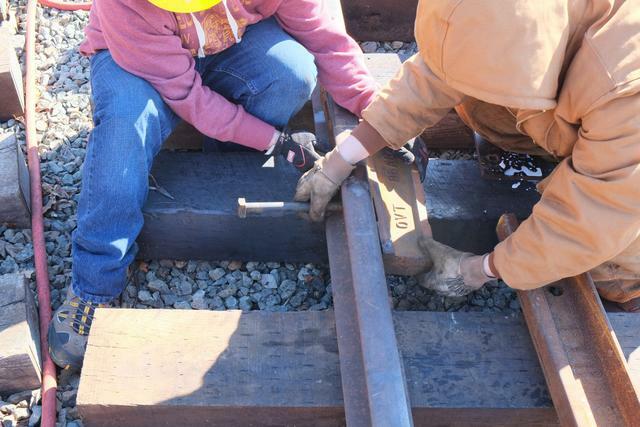 May 9, 2014: The rails were cut to the correct length to fit between the crossing and the existing track, and then drilled where needed so that the joints could be made up. 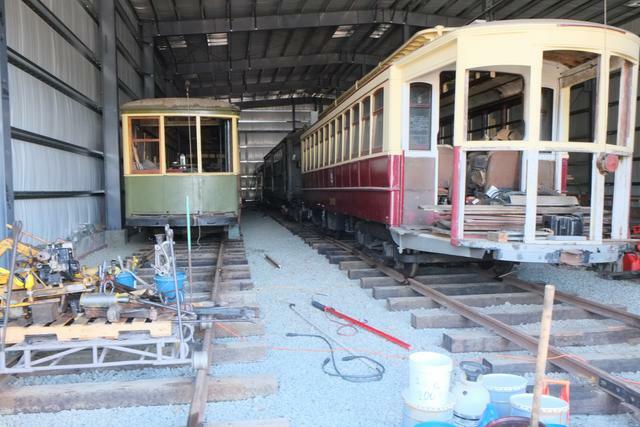 Car 948 passes the work area on May 13. 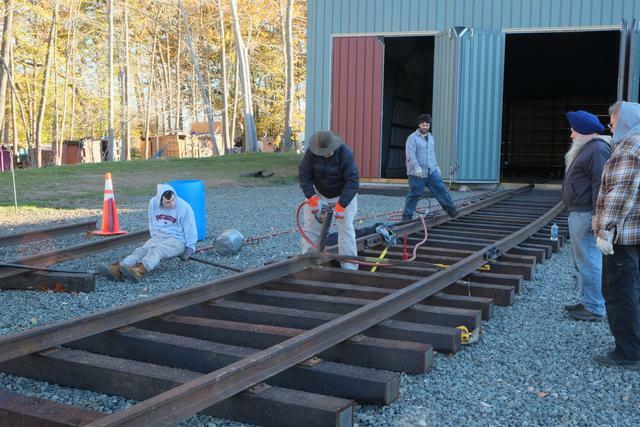 All rails and ties are in place, but nothing is spiked down yet. 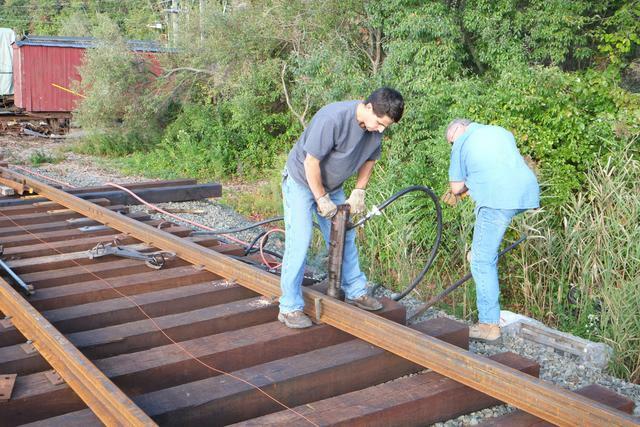 Shortly thereafter, the rails were put into rough line and spiked every 10 feet or so. 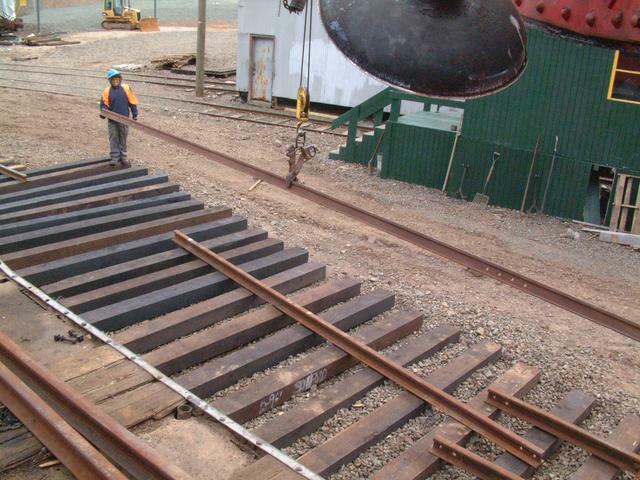 This gave the track enough stability to allow the stone hopper to traverse the track and spread ballast. 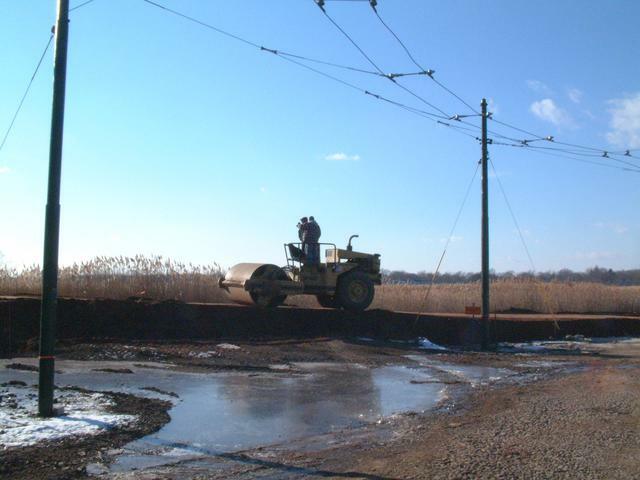 Meanwhile, back on the Island, spring has arrived, and Pasqualini construction returned to perform the required erosion control seeding. 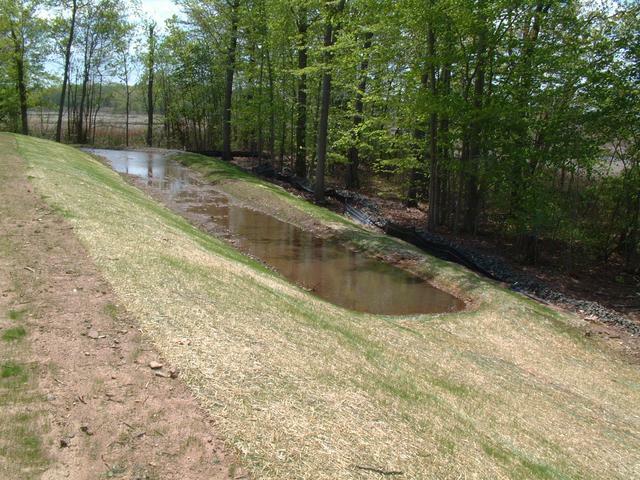 The stormwater detention swale is already filling in nicely with grass that will help hold the soil together. 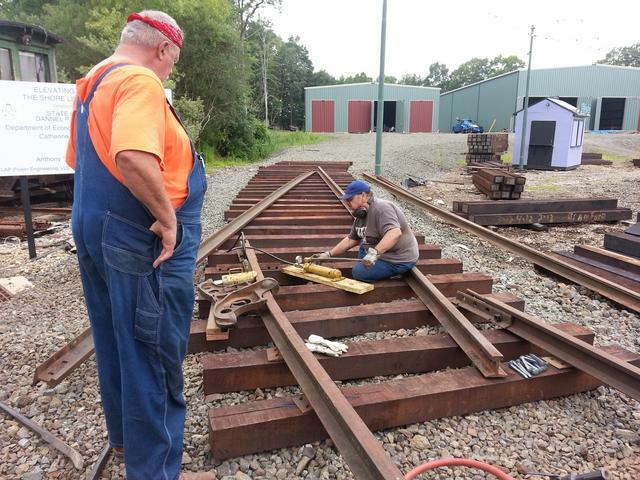 June 22, 2014: For the past few weeks, museum volunteers were hard at work finishing up work on Narragansett siding and the new crossing diamond. 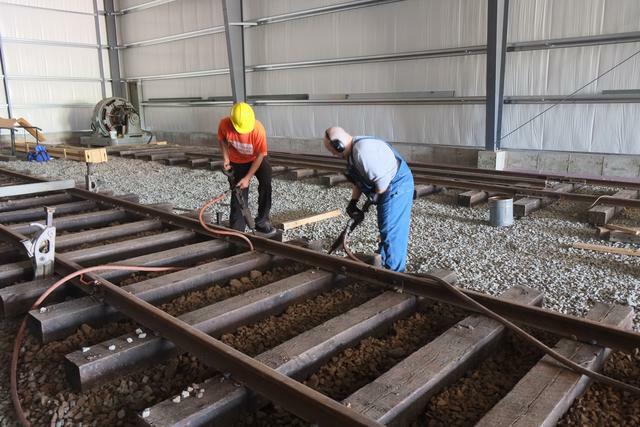 The siding was declared open for all traffic on June 22, although it had seen limited use with work equipment and high-level platform (rapid transit) cars during the previous two weeks. 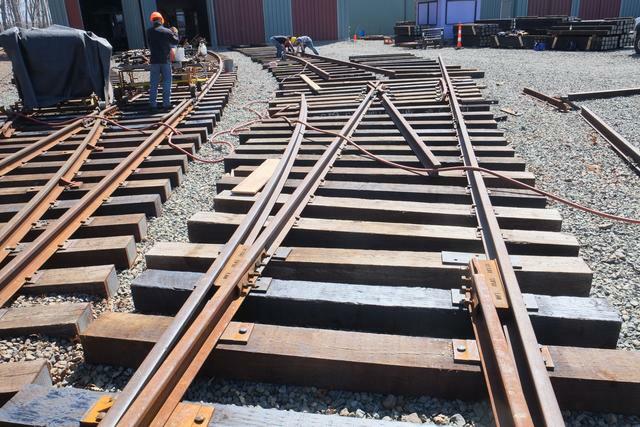 This completes another important phase, and concludes the portion of the trackwork project which interacts with the existing railway. 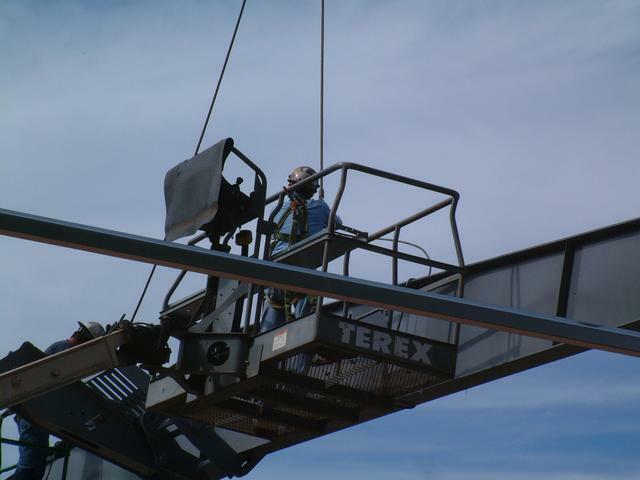 Above: the official first trip through the crossing took place in late May, with crane car W-3. 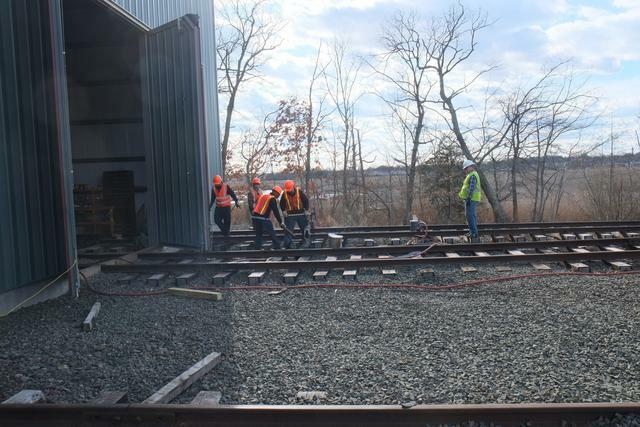 Since the last report, the entirety of the renovated Narragansett siding was spiked down. 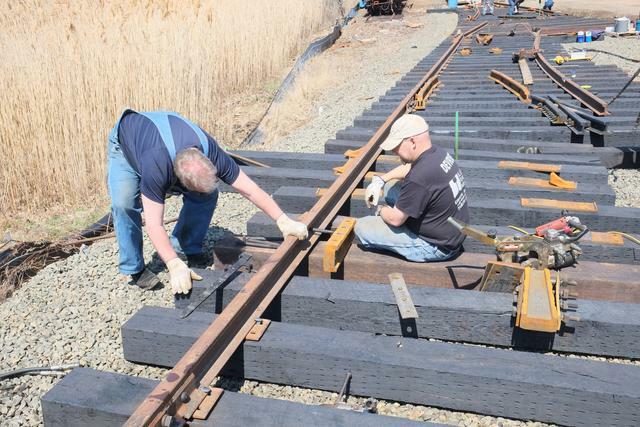 Every tie from the frog of the existing Narragansett switch to the east end of the high-level platform is "new" -- either a brand-new tie or a high-quality relay tie. 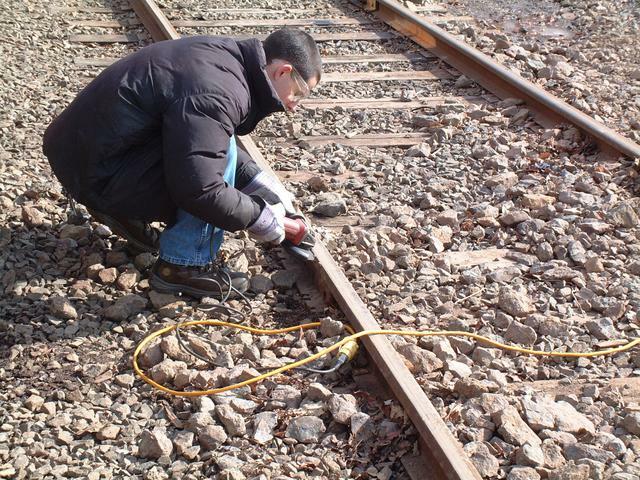 Additional ties were renewed in the area of the platform. 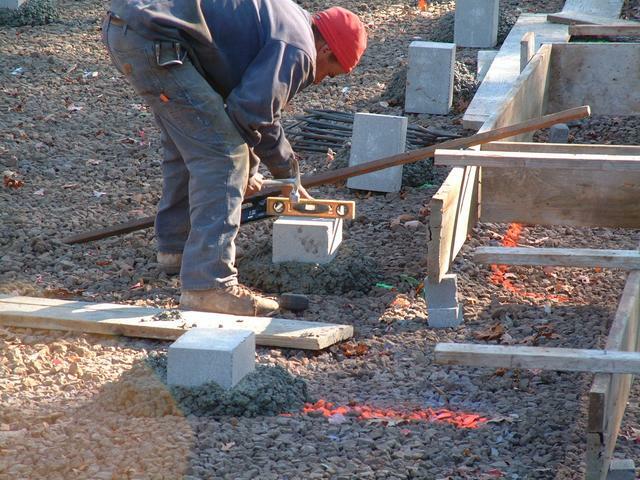 Above: tamping using hand-held pneumatic tampers. 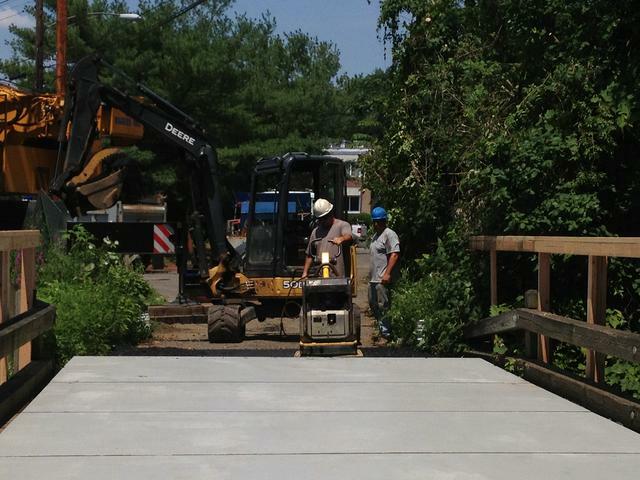 Below: the new crossing is installed and pointing towards the Island. 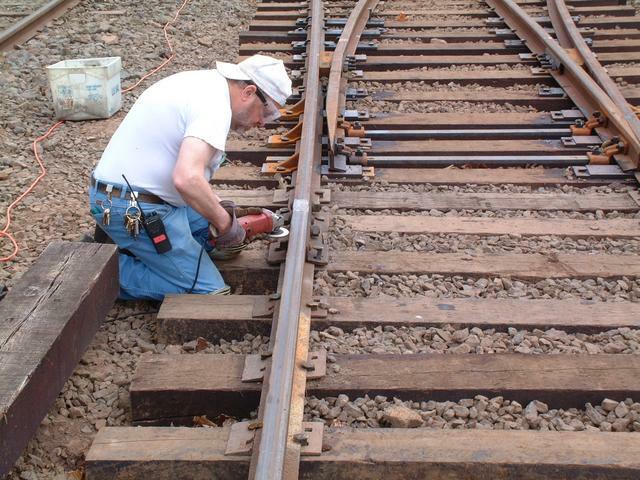 To fabricate the required bend in the rails, the position of the curve was measured and marked on each rail. 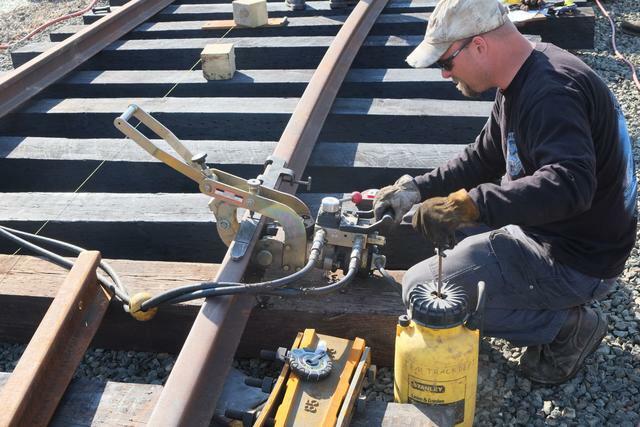 A hydraulic rail bender was used to put a small bend in the rail every foot. This large number of small "kinks" forms a good approximation to a perfect arc, and is the way that curves have traditionally been formed. 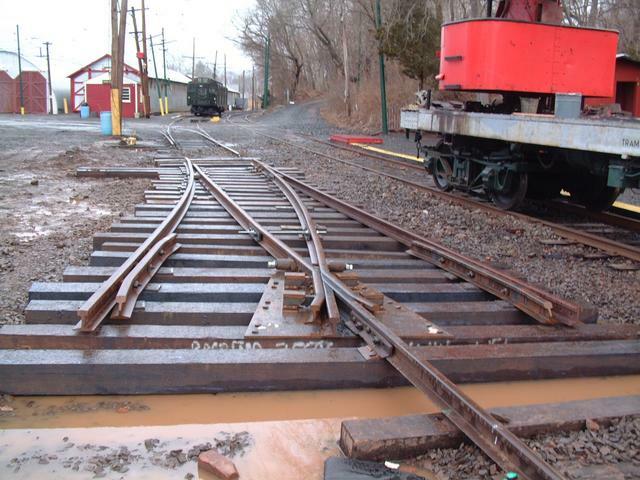 The force exerted by the hydraulic ram to form this particular bend, a 120' radius curve in 80AS rail, was about 10 tons. The next batch of 4 switches has been delivered. 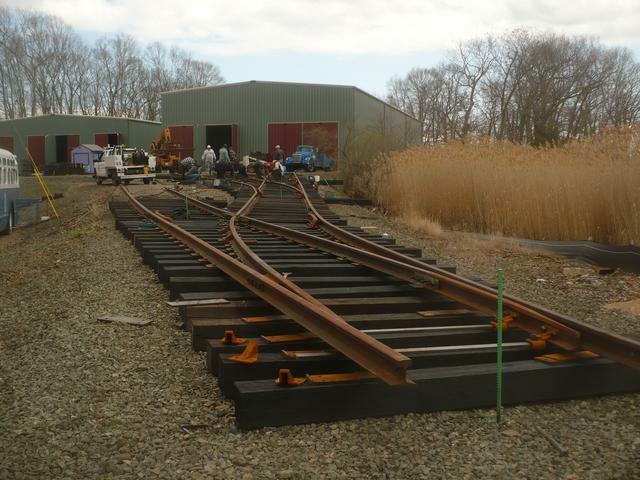 When installed, these will give us access to 3 of the 4 tracks in new building 8, and the beginning of the new loop track. 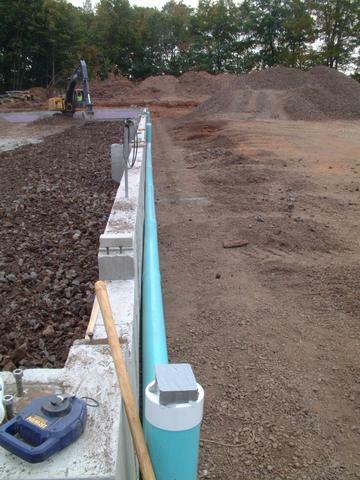 Above: Frogs, heel blocks and (below) frog guard rails have just arrived on the work site. 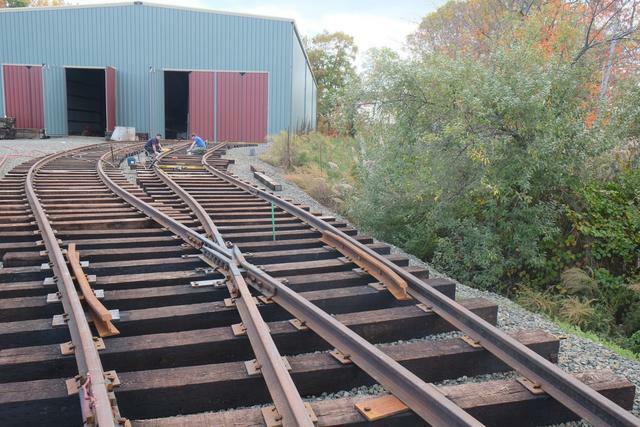 Between the new crossing and the first switch there is a stretch of about 40' of straight track, followed by about 40' of curve to the right. 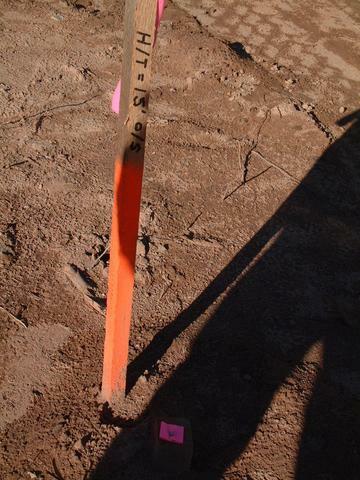 The head of the nail of this survey stake marks the exact position where this curve will end, and the first switch will begin. 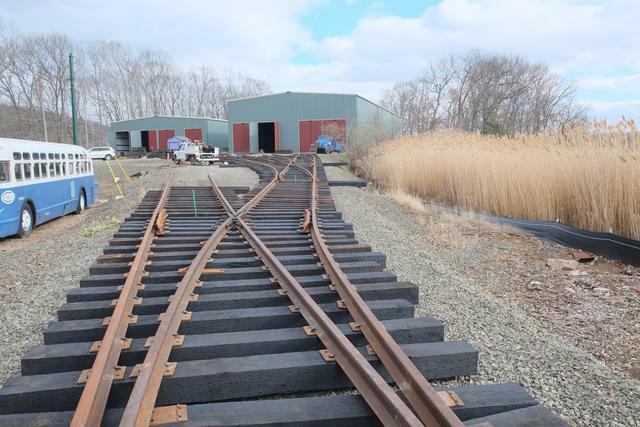 Looking railroad west at the re-opened Narragansett siding and the new crossing track taking shape. 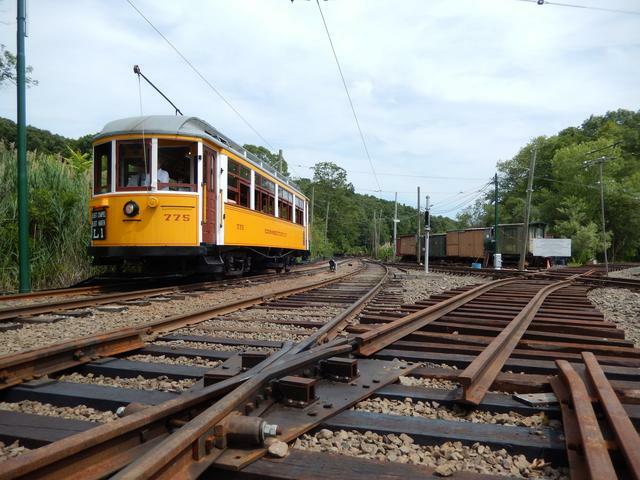 Soon car 775 will be able to take the route to the viewer's left and ascend to the Island. 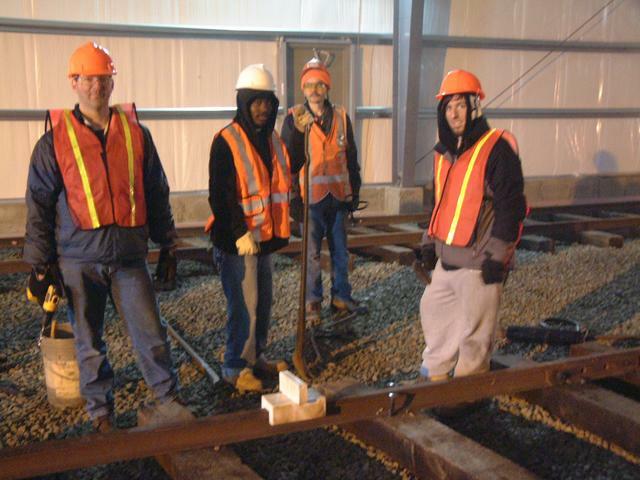 July 13, 2014: Another milestone was reached as the new mainline turnout (1-B on your map) was opened for test operation . 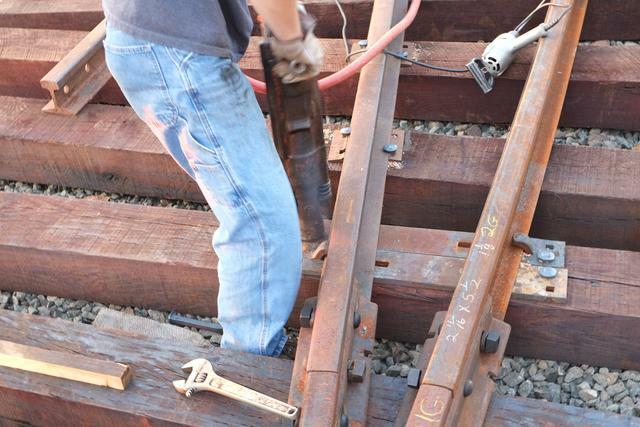 First, the two rails connecting the turnout to the crossing were completed, by cropping to length, drilling and making up the joints. 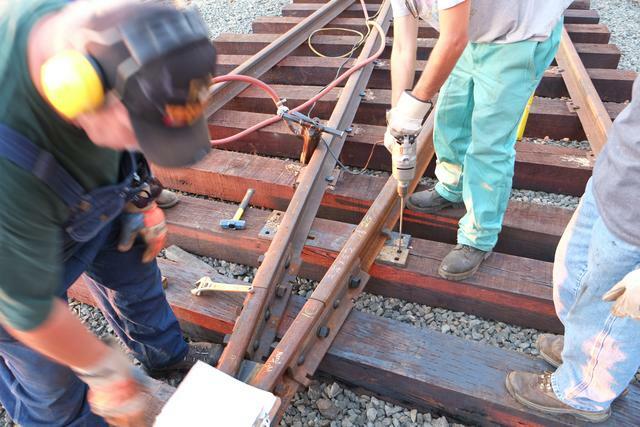 Above: tightening the joint at the crossing, below: rails connected waiting to be spiked. 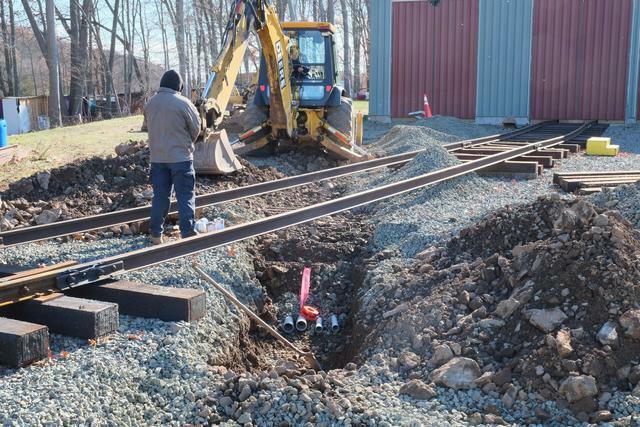 Now there was some "finishing up" work to do on the turnout, since in the rush to get it re-opened for mainline traffic, the turnout side was never fully spiked or gauged. 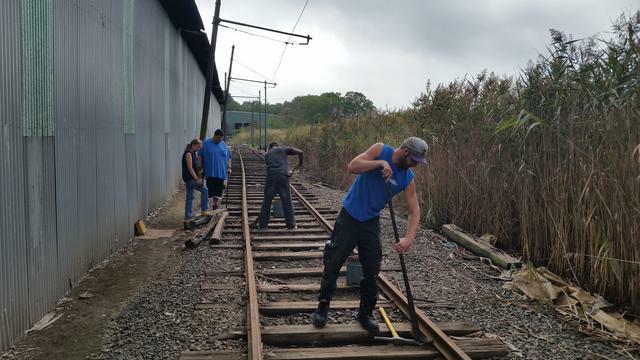 After this was done, spiking continued along the connecting track. Finally car 850 was used to make a test trip. 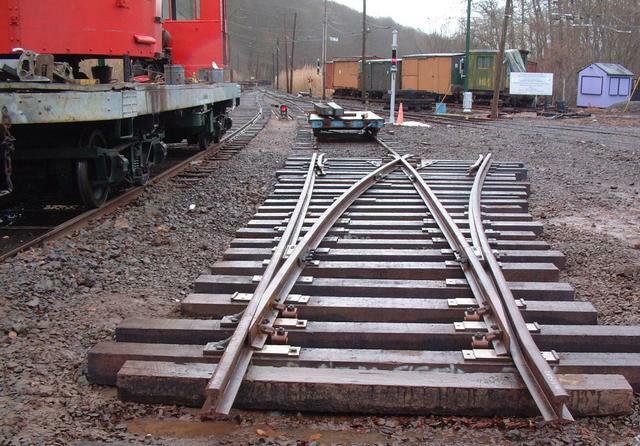 The temporary clamp was removed from the switch point and the points were thrown over to the diverging side. 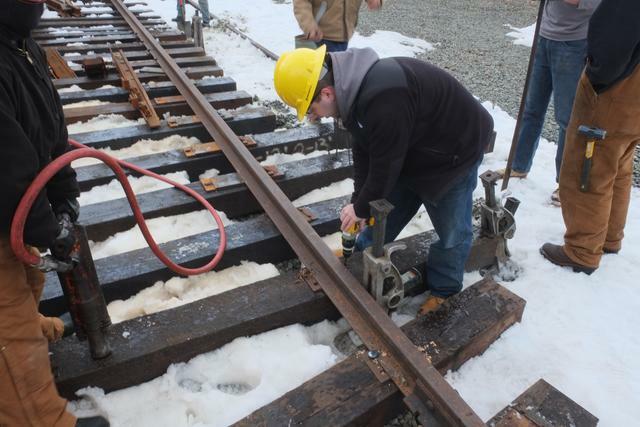 850 made a few trips over the switch and through the spring frog into the new track, and then the switch was re-aligned and clamped pending installation of the permanent switch stand. 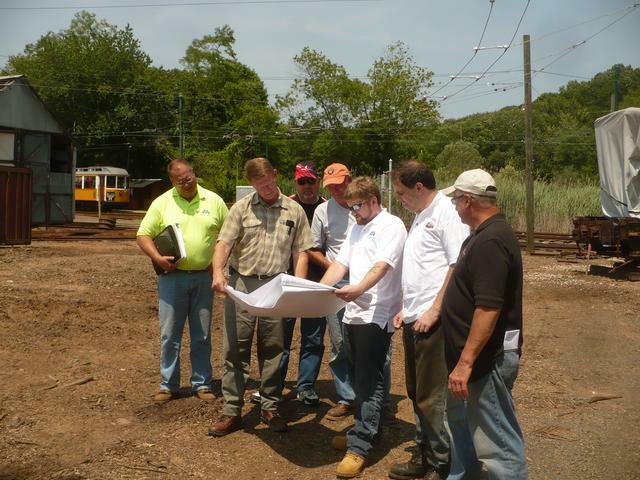 July 25, 2014: The new track reached and crossed the diamond crossing at Narragansett. 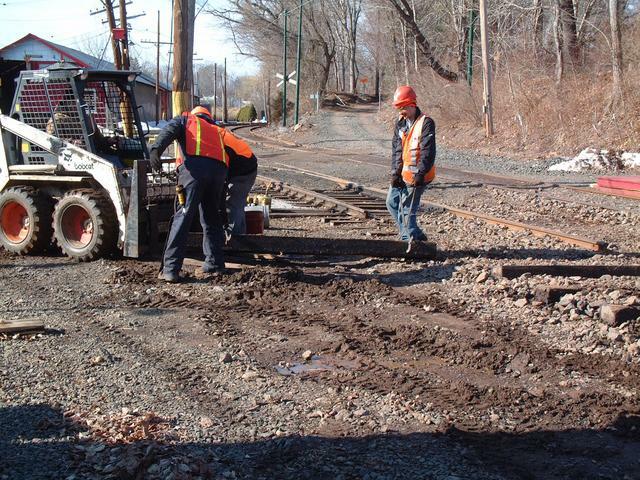 Above: stone has been spread and the connecting track is being tamped leading up to the crossing. 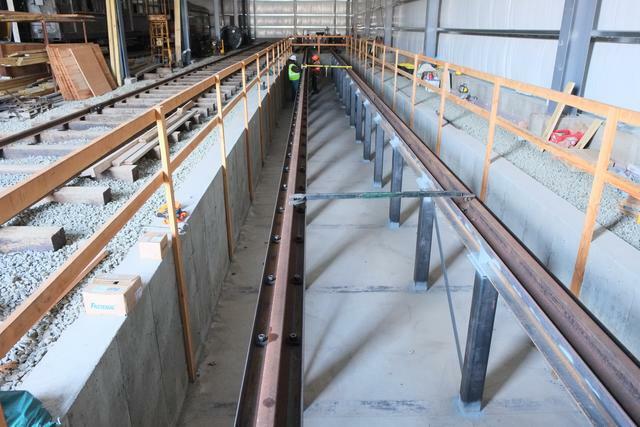 Below: The first lengths of rail are being laid on the other side of the diamond, and the view looking east. 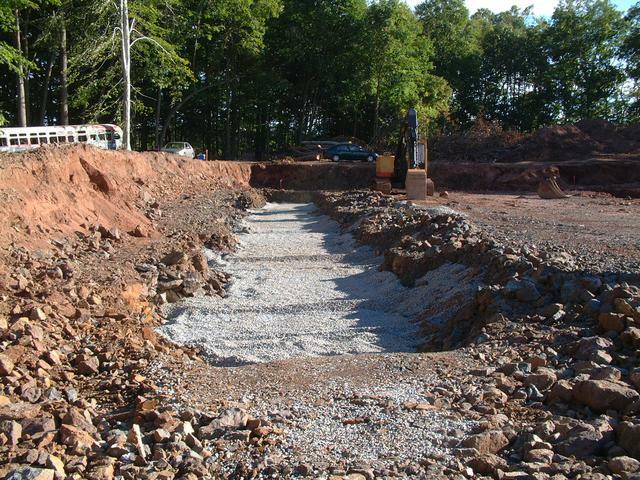 August 2, 2014: Next up was a 40' section of straight track followed by a 40' long curve to the right, starting up the hill. 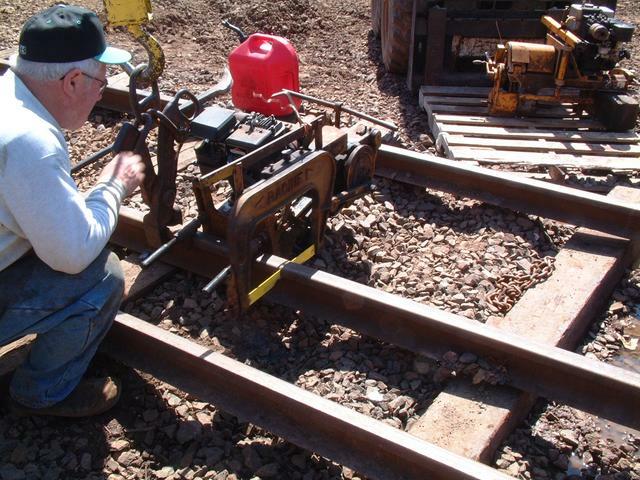 The hydraulic rail bender was again pressed into service to bend both rails to the required radius. 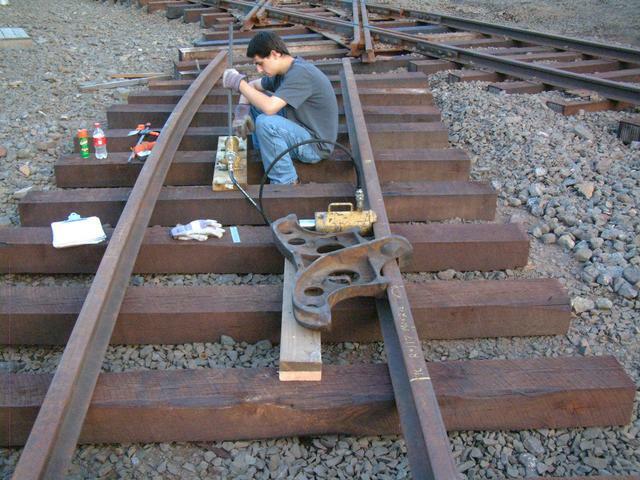 After both rails were curved, they were aligned correctly and then spiked down to gauge. Close-up of new joint just before the start of the switch. 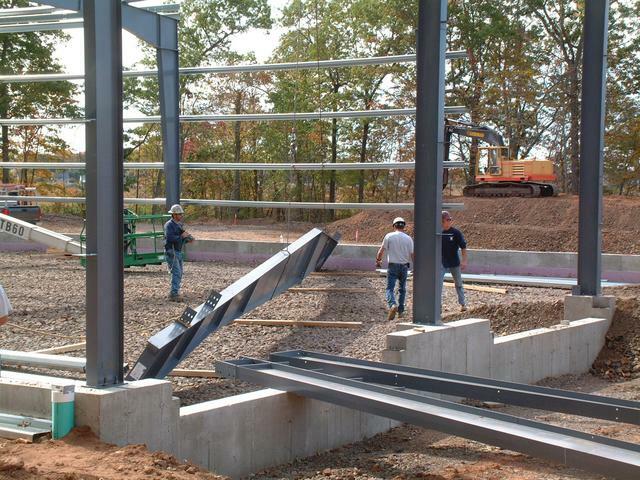 Components of the turnout have been placed into rough position. 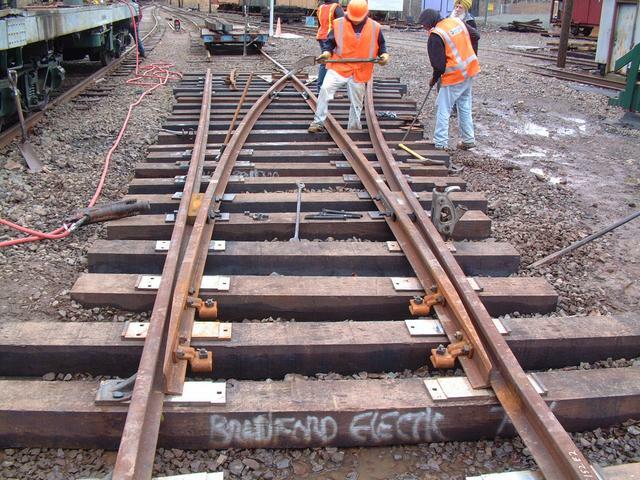 The arrow mark indicates the location of the point of switch on the straight stock rail. 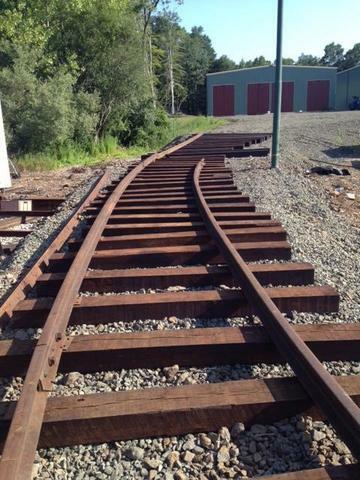 The right stock rail has not yet been curved. 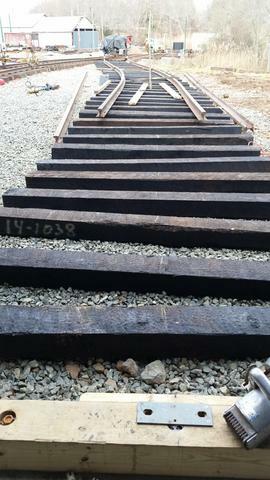 Rail braces and slide plates have been installed. Loose heel blocks and the frog are in the distance. 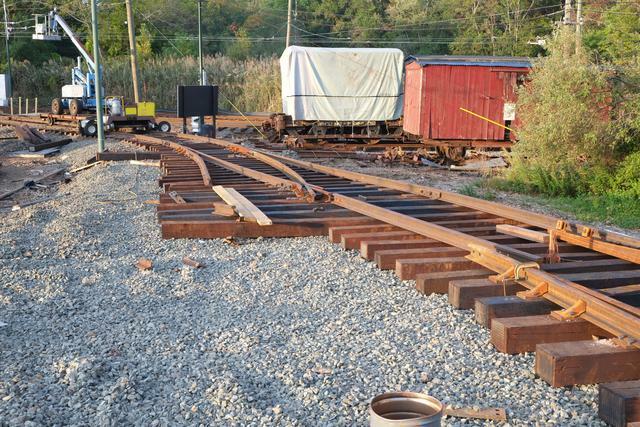 August 16, 2014: With the completion of the first 80' of track beyond the crossing, shown in the last update, it was now possible to bring equipment onto the new lead. 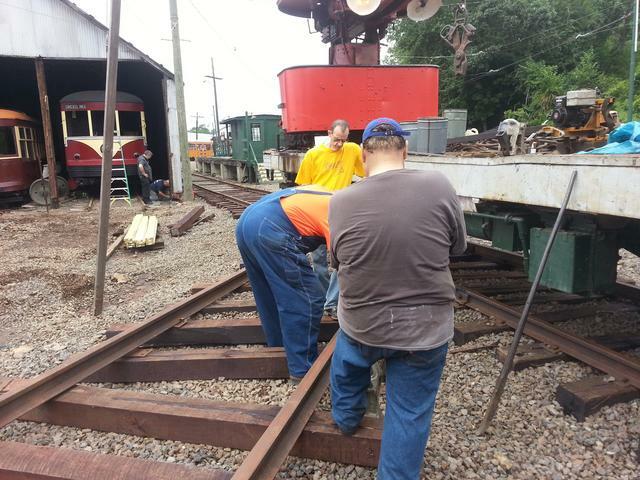 Below, crane W-3 is the first car to operate over this trackage. 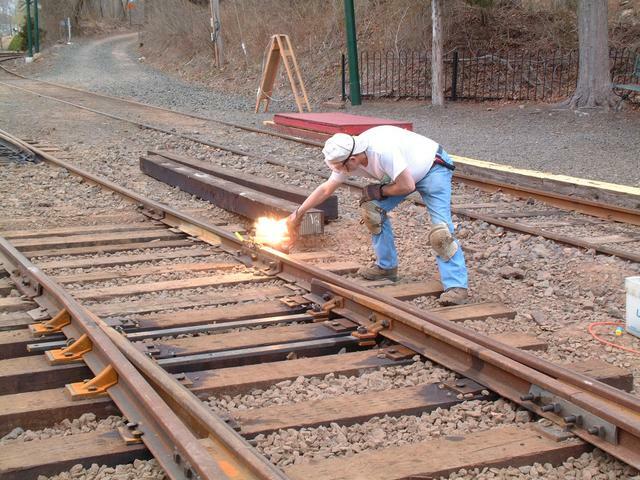 Since the overhead wire is not up yet, it was moved using a "stinger" connecting its pole to the live wire via a long cable. 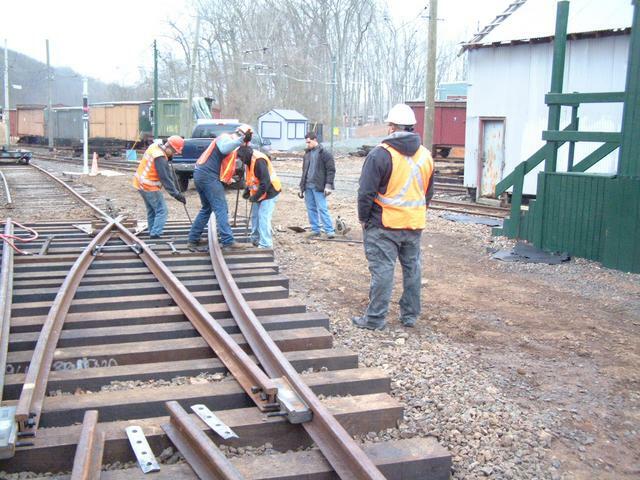 Turnouts are the most complicated and time-consuming of all track work projects. 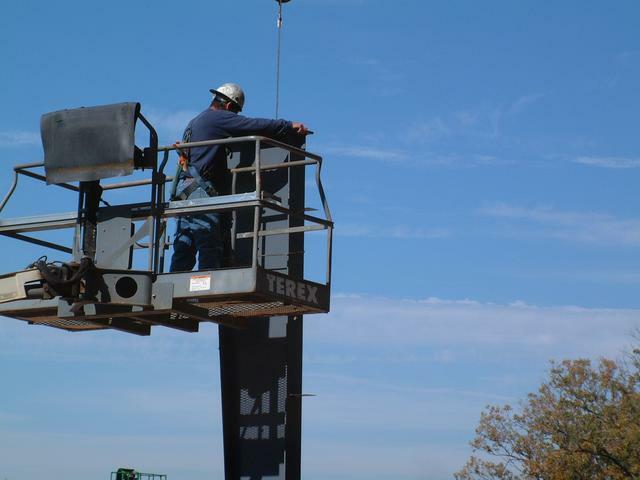 Installation must proceed methodically with careful attention to details and measurements, so that all of the geometrical constraints are met and cars can track through without difficulty. 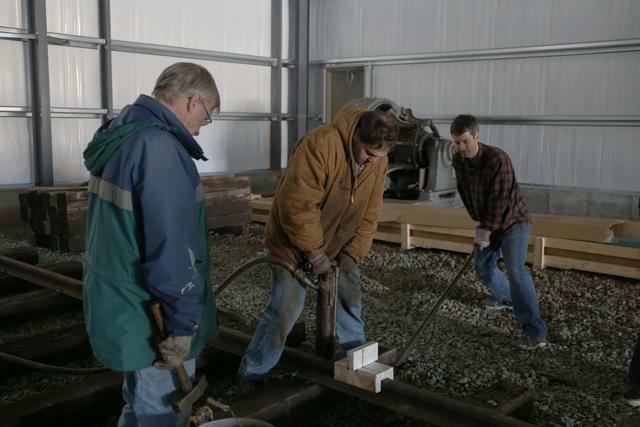 Work begins at the "point of switch" and proceeds to the "heel" of the switch. Above, holes have just been drilled for the heel block casting. Below, the heel block unit is assembled. 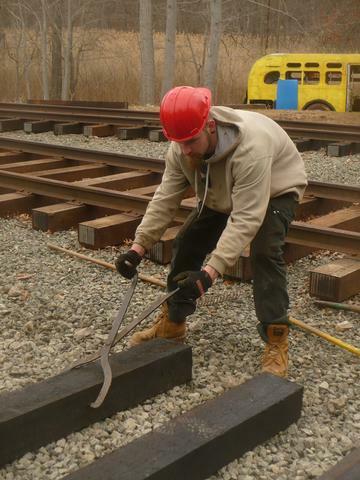 The rail bender is needed to curve the outside (stock) rail and one of the closure rails to the required radius. 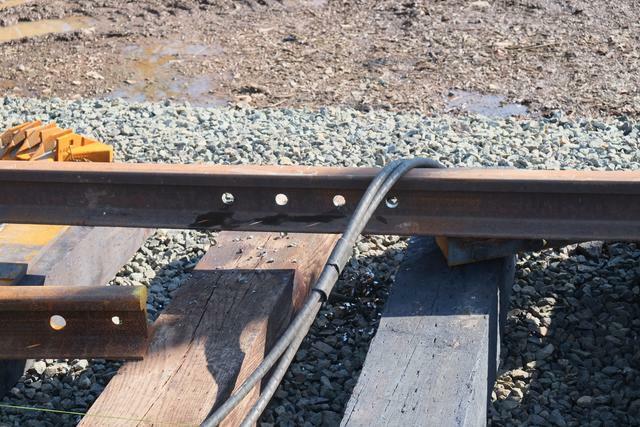 Once the turnout has been spiked to gauge between PS and HS, and the point rails have been attached, the rods between the movable points can be installed. 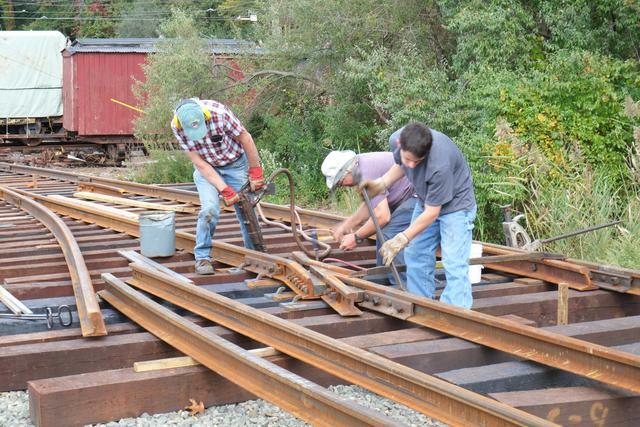 Spiking continues for the straight portion of the turnout, working towards the frog. 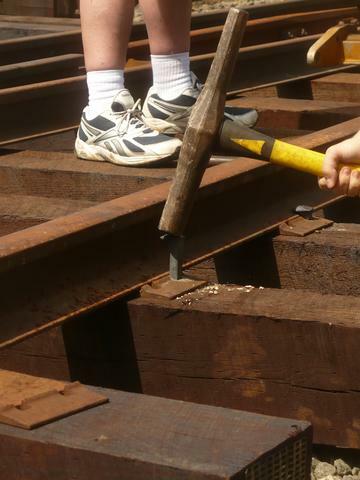 In the sequence below, two holes are pre-drilled through the single-shoulder tie plate into the tie, the spikes are set easily with a small hammer, and then driven down with the spike maul, or the pneumatic hammer, while an assistant uses a lining bar and a fulcrum to keep the tie seated securely against the rail. The operation continues another day. 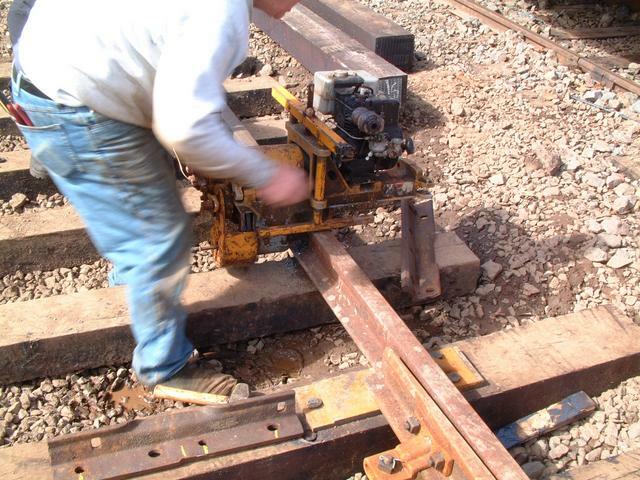 The stake in the foreground is used to control the rough alignment of the stock rail. 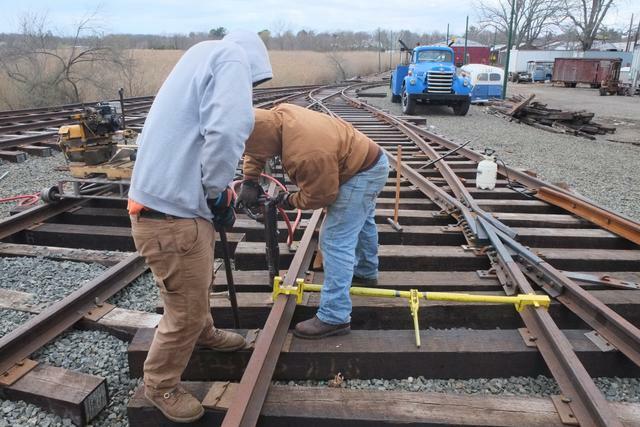 Sometimes the gauge is tight and hard to move by hand, so a pair of jacks can be used to spread the rails prior to spiking. 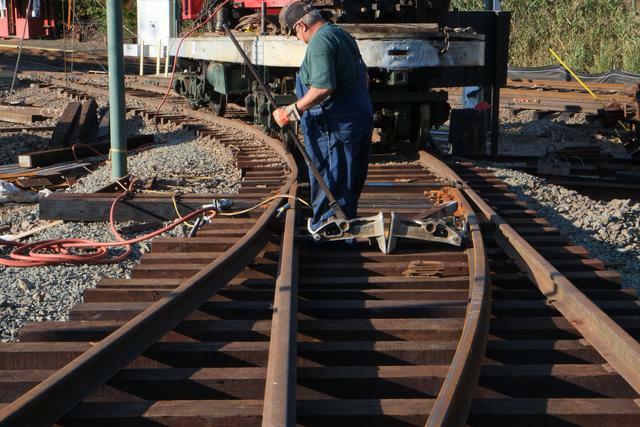 Spiking of the straight closure rail approaches and then reaches the frog. 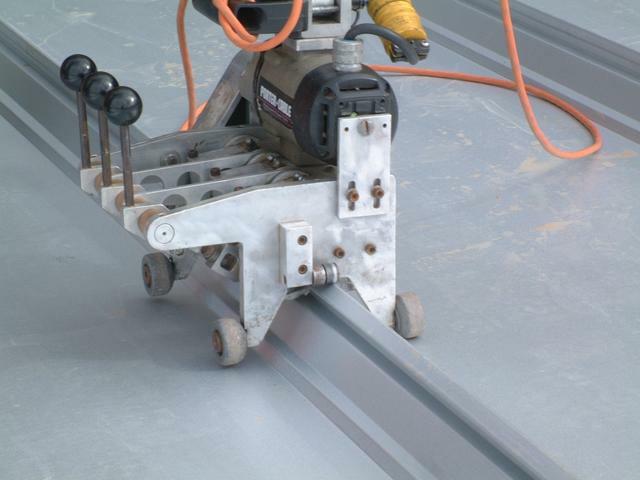 At the frog, special tie plates known as "hook-twins" are used, because regular plates won't fit in the close spaces. The view below shows turnout 81-B completed, on the straight side. 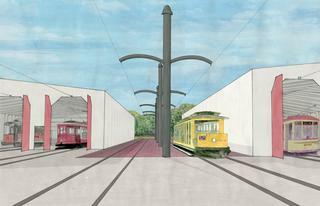 The diverging side will be the start of the Burch Memorial Loop. 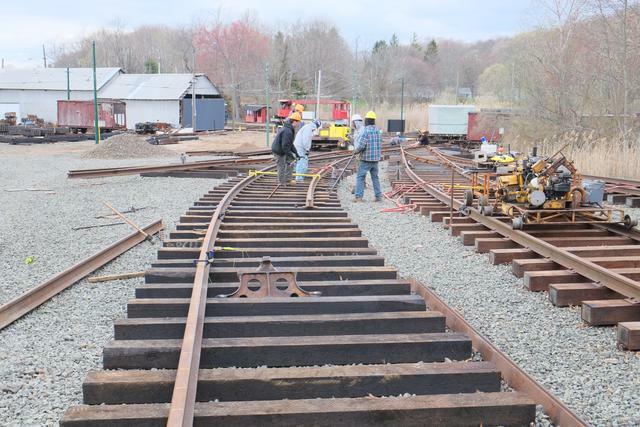 In the foreground, installation of the brace plates for switch 81-85 has been completed, along with one rail of the 15' curved connecting track between 81-B and 81-85. 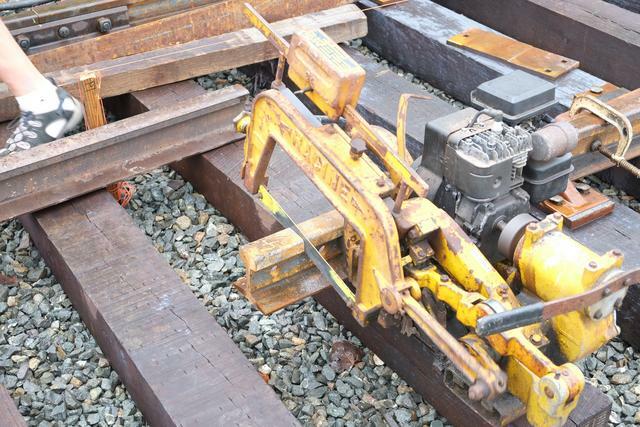 At the far end of 81-85, the frog has been placed roughly into position and attached to the straight stock rail. 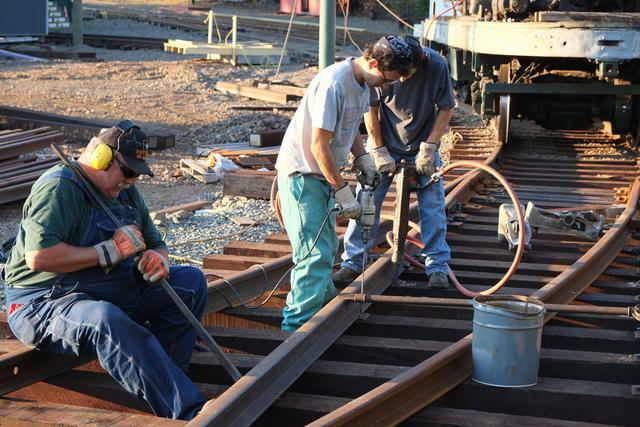 Spiking of the straight side between the heel of the switch and the frog is underway. 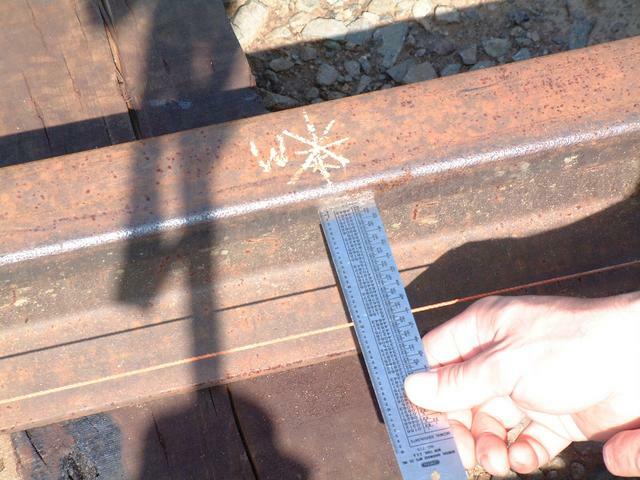 The orange stringline, stretched between stakes, guides the centerline alignment. 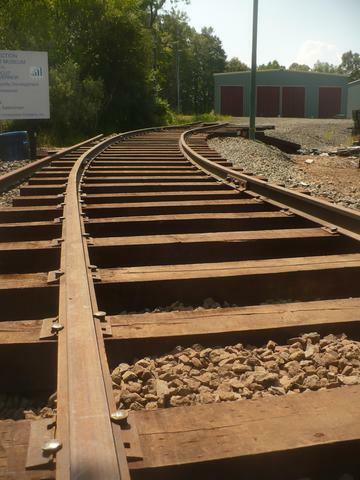 The track curving to the viewer's left will lead to turnout 83-85, while the straight track to the right begins turnout 81-82. 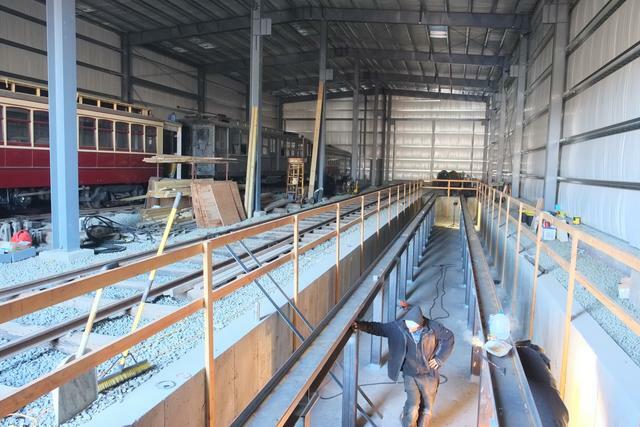 During the month of October, a milestone was reached with the connection of 82 track to the building 8 ladder, thus allowing cars to reach the inside of the building for the first time! 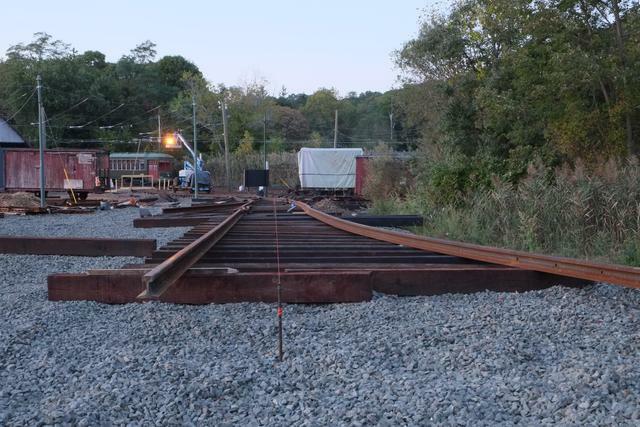 Late October: Ties and rail were now placed for the connecting curve. 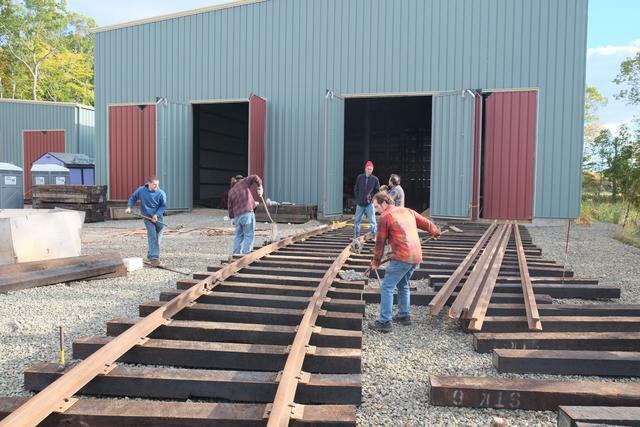 The rail bending was completed and the rails were installed into the building. November 8, 2014 was the day of the museum's annual membership meeting. Car 775 was selected for the ceremony. 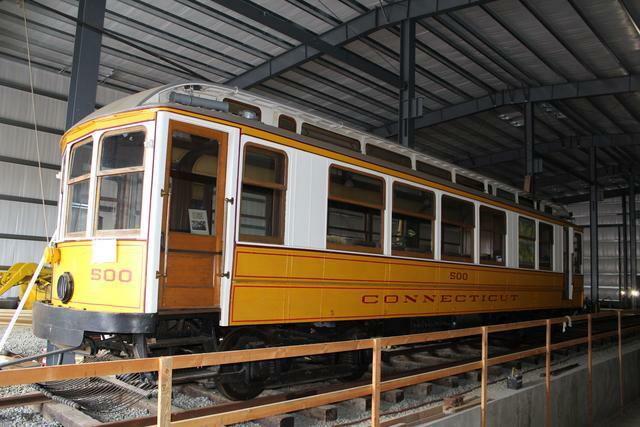 This car was built in 1904 and spent much of its career running on the museum's line (when it was part of the Connecticut Company's network). 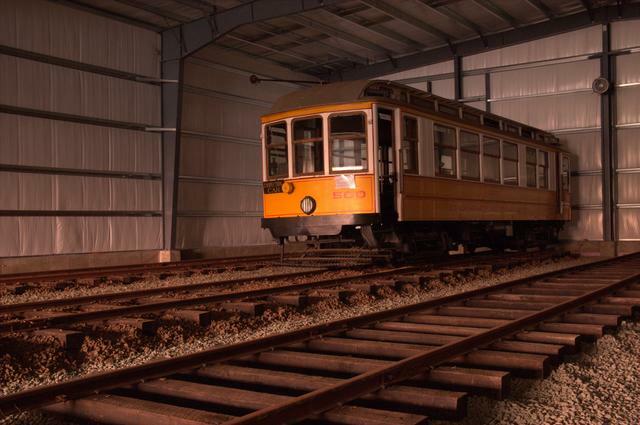 It was restored at the museum and is one of the regularly operating cars. 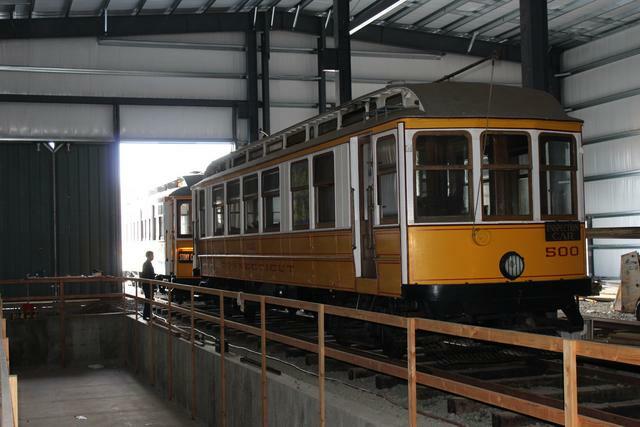 Above: Car 775 waits outside as the crowd gathers. 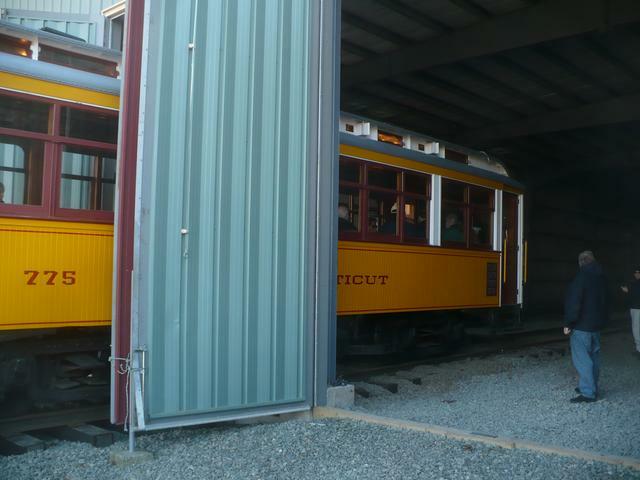 Below: The trolley car enters the building for the first time. 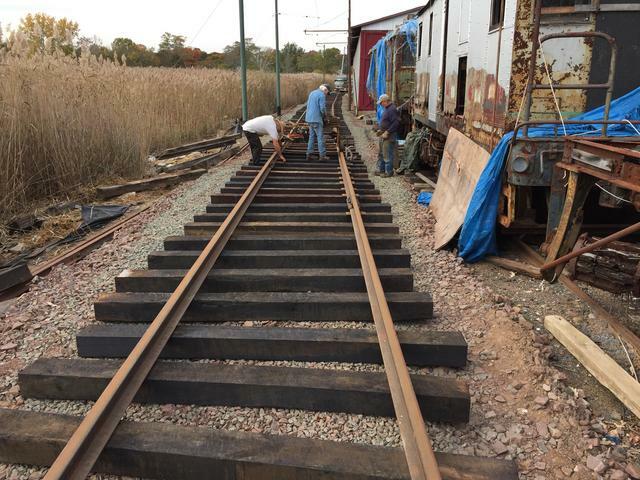 There is no overhead wire on the new tracks yet. 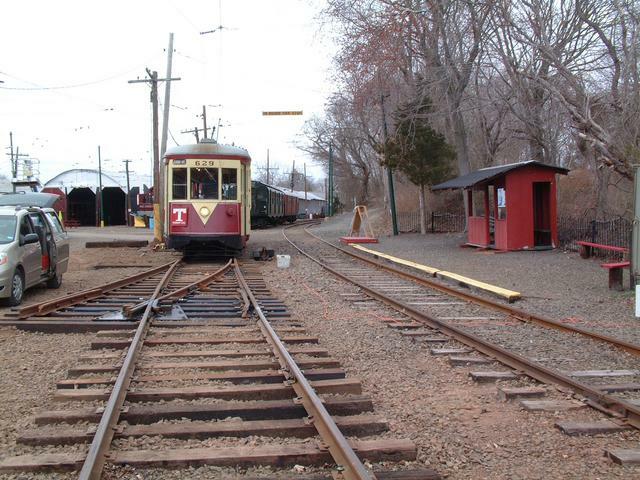 A special "extension cord" with a "stinger" was used to bring the trolley power to the pole of car 775. This allowed it to run under its own power. This was only a ceremony, however. 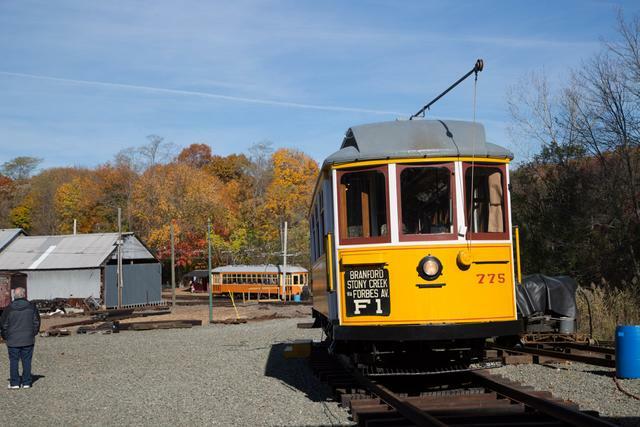 775 will be used during the busy end-of-year season. 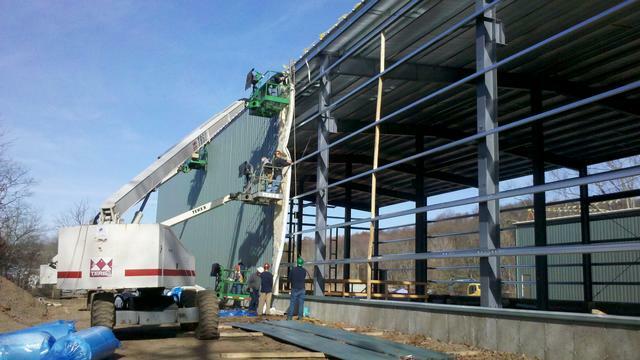 The next day, the car was run out of the building and back into Barn 3. In the event of a flood, the car can be run back to the safety of higher ground. 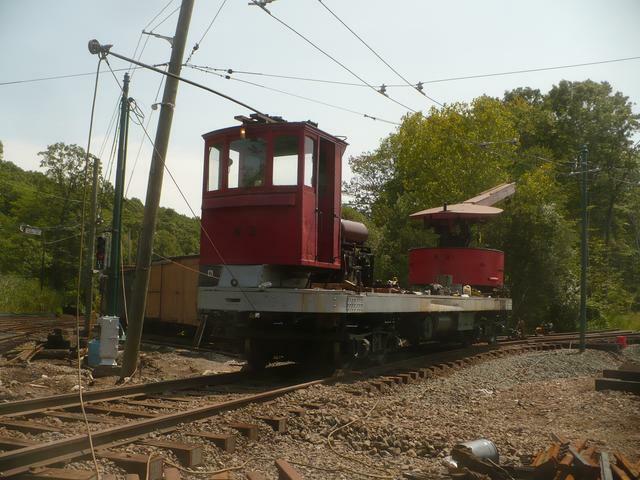 With the track temporarily empty, Car 500, the "pride of the fleet," was towed to the back of 82 track. This car has not received repairs from the Sandy and Irene floods and so it could not operate under its own power. 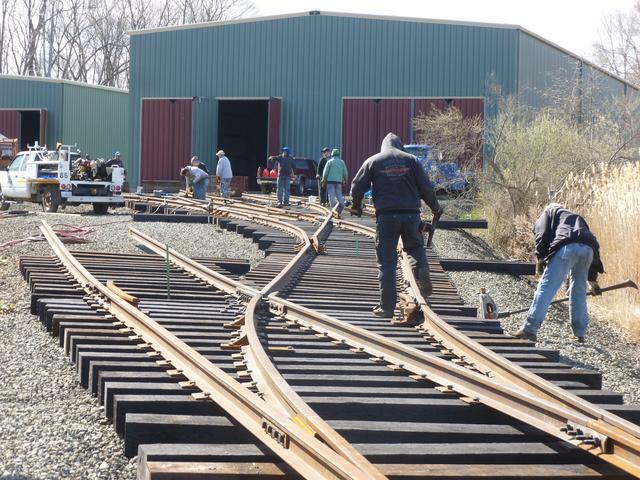 Bending the rails and lining them up took a few days. 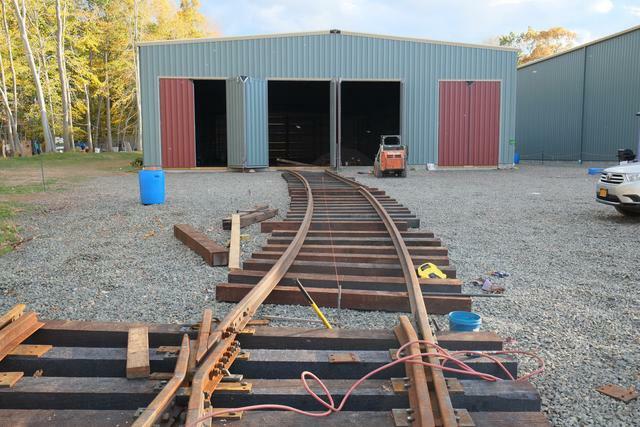 Here the S-curve is completed and the track is about to enter the door. 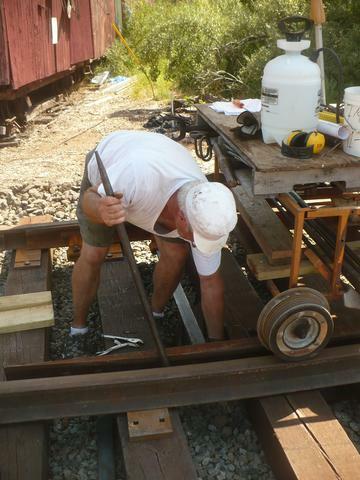 The temporary wooden doorway timber is notched to clear the rails. 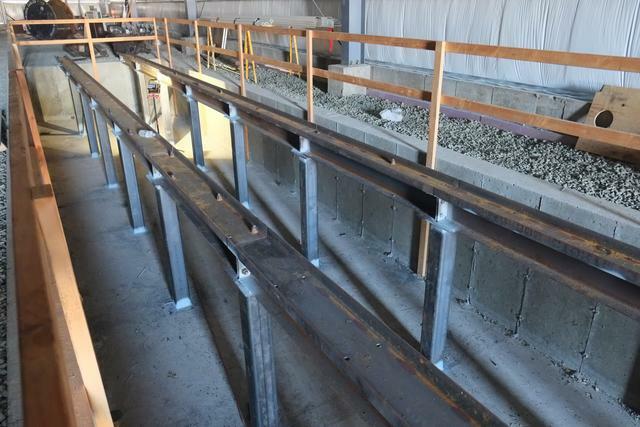 Inside the building, a step or "compromise" joint is needed where the 80AS exterior rails join the 60AS interior rails. 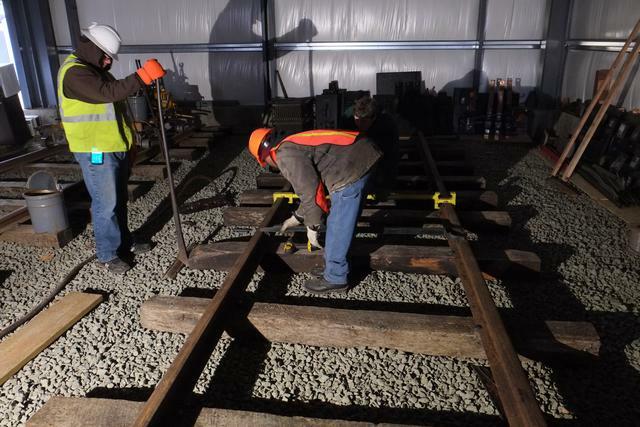 The switch stand for 81-82 was installed so that track carts and other light equipment used for track construction can be moved over the track. 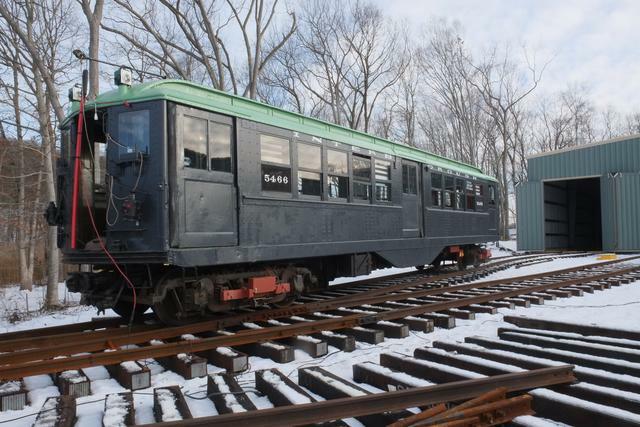 Next up was the widest, longest and heaviest car in our collection which is currently operable: New York City R-9 class subway car 1689. It was used to check clearances and the ability to negotiate the reverse ("S-") curve leading to 81. 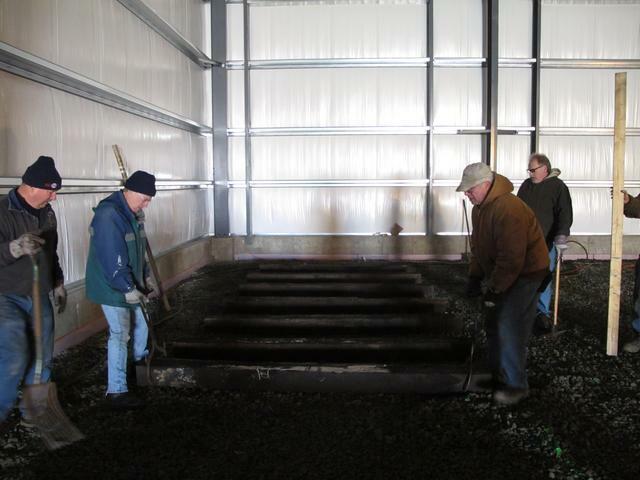 It was successfully run into the building, where it will spend the winter. 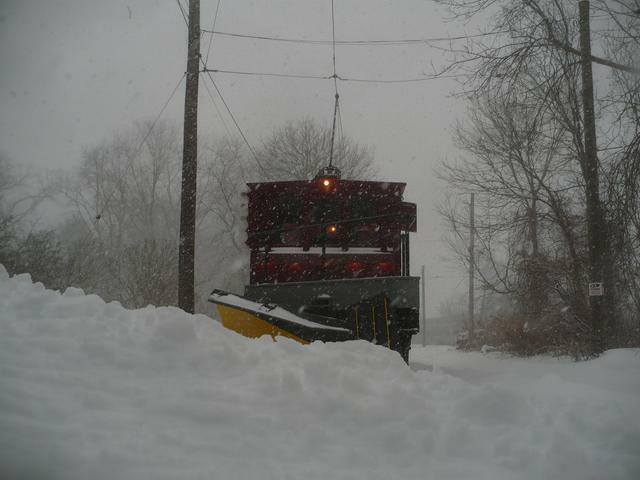 February 9, 2015: Since our last update, almost three feet of snow has fallen at the museum over the course of a number of weather systems. 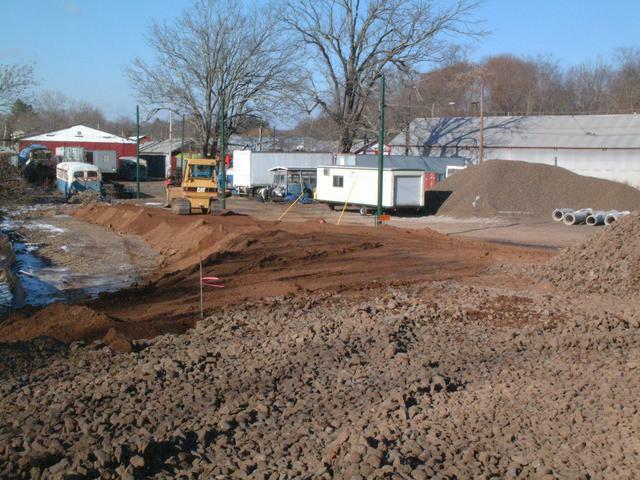 This has stopped outdoor track construction until we can see the ground again! 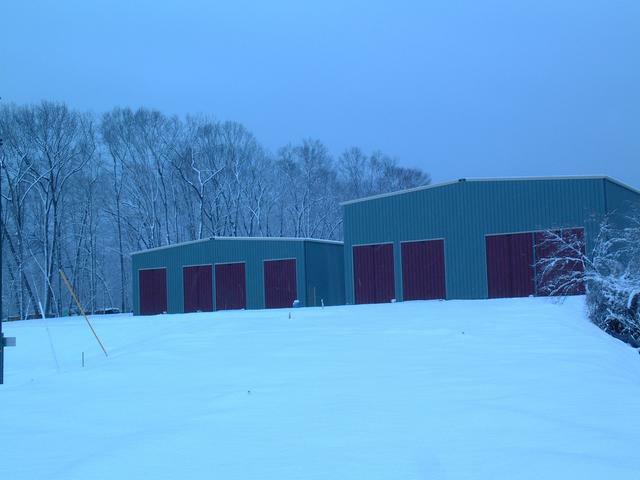 Prior to the first of these systems, winter storm Juno, a number of cars were moved from the most vulnerable low-lying barn spots. Here car 5466 is about to enter track 81 with a "stinger" supplying power. 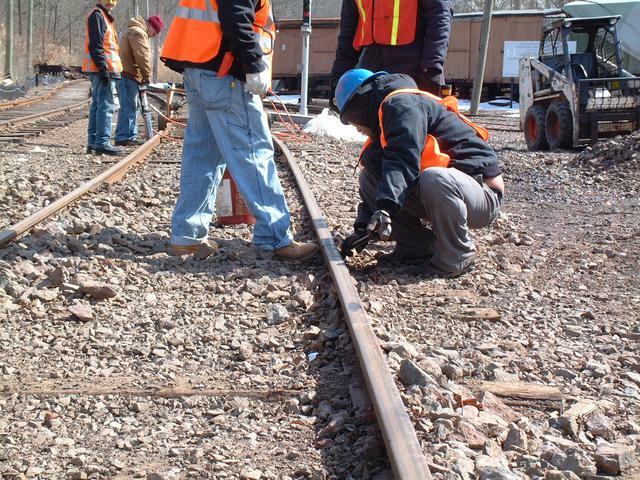 The main line was plowed out and shortly thereafter another delivery of ties was received. 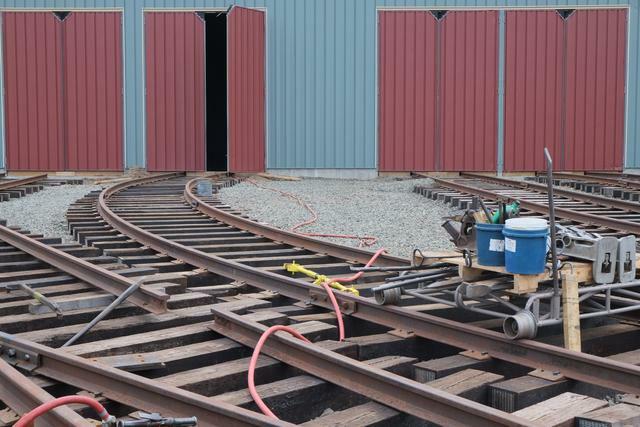 These second-hand ties will be used to complete the tracks inside building 8 and building 9. 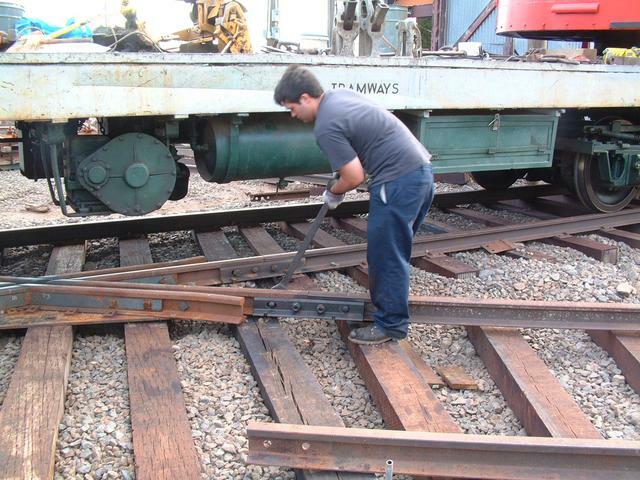 Above: Museum volunteer Paul uses crane W-3 to load ties. 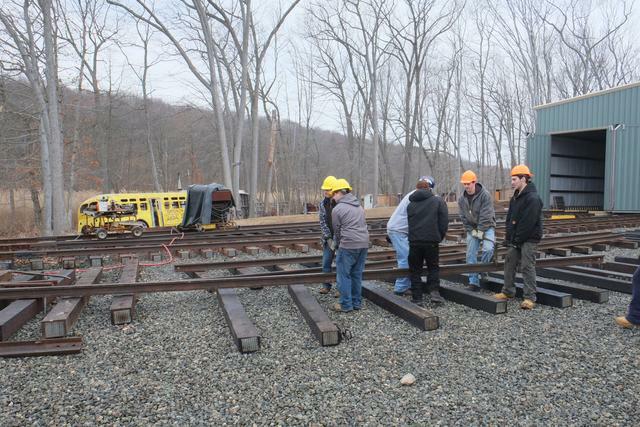 Below: Students with the Gateway College Railroad Internship program assist. The spikes are driven most of the way with the air hammer, but the shape of the plate doesn't allow the hammer to reach the bottom. So this part has to be finished with the old-fashioned maul. 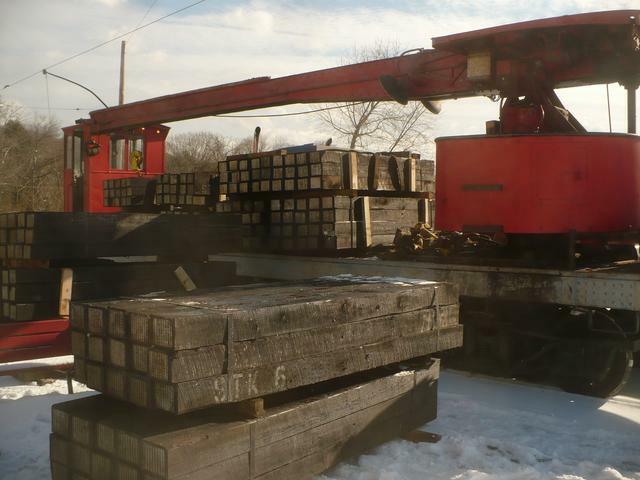 Our final delivery of switches and frogs arrived and was quickly unloaded by crane W-3 and transported to the Island area. 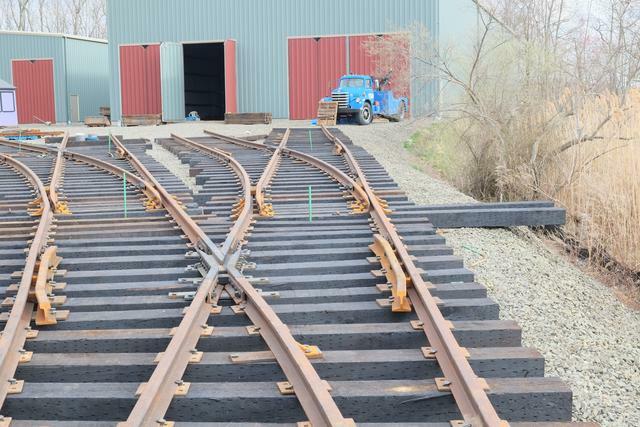 These 6 turnouts will complete tracks 84, 85, 90, 91, 92, 93, 94 and the new loop. 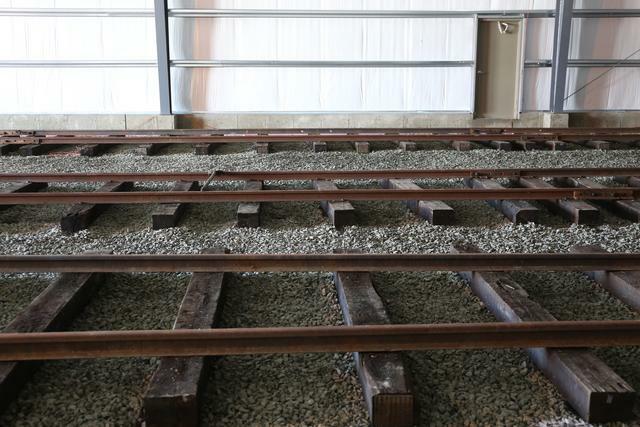 And ties have been laid out in anticipation of connecting this track to turnout 83-85. 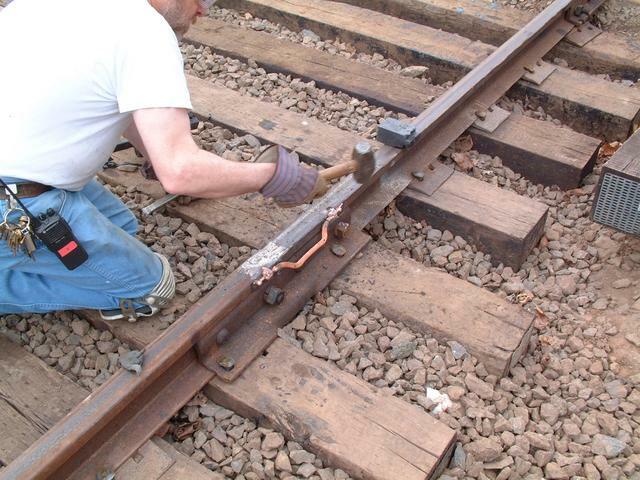 Additional lengths of rail are positioned, in this case by hand using rail tongs. These GWCC students are standing in what will eventually become the 84-85 turnout. 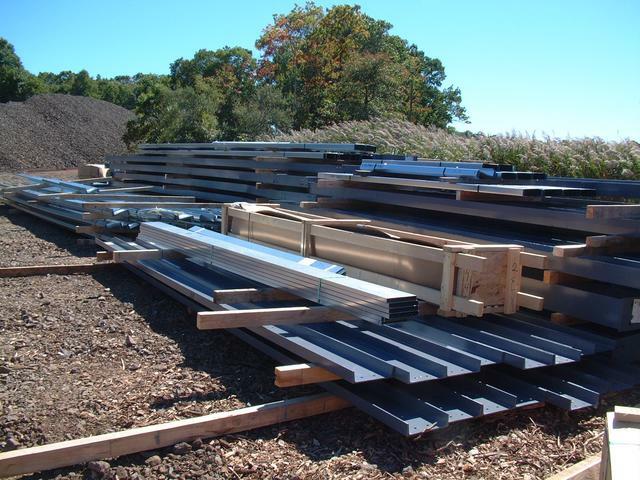 Meanwhile, several truckloads of ties and rail have arrived as we press forward with the completion of the Building 8 ladder and the start of the Building 9 ladder. 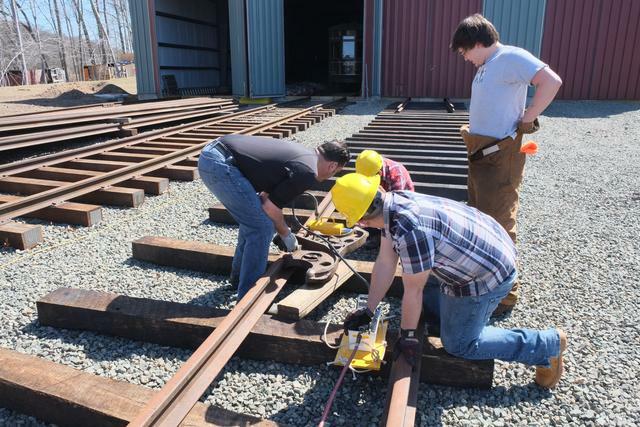 Here, GWCC students are unloading lengths of rail from our small flatcar with crane W-3. 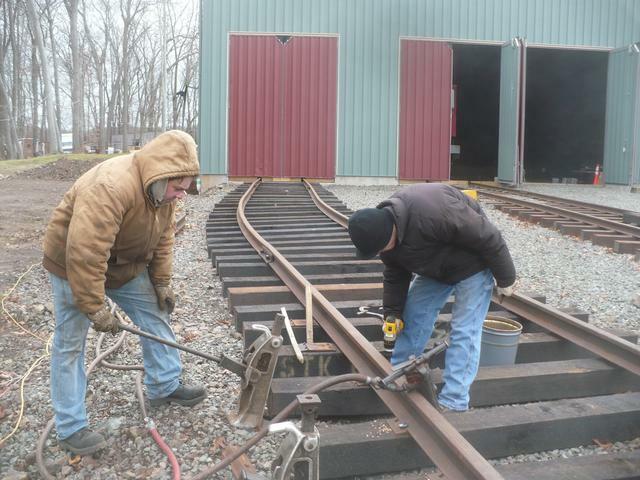 April 19-24, 2015: Many thanks to a multi-museum team of experienced track volunteers on a mission of charity, who visited during the week prior to Members' Day and accomplished what seemed almost impossible: 4 turnouts constructed in 4 days! 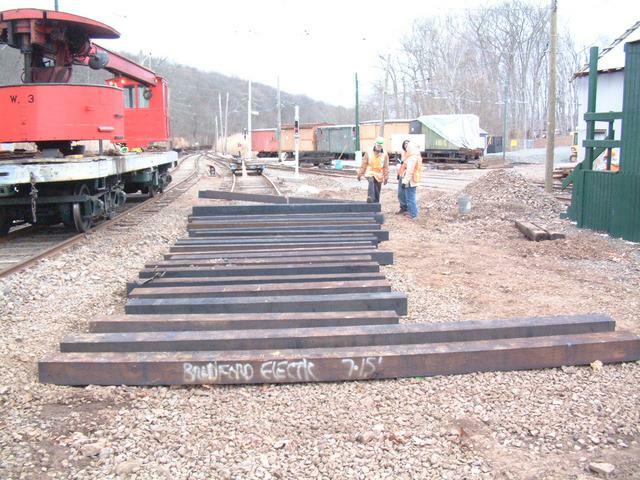 and the first piece of rail is brought into position. 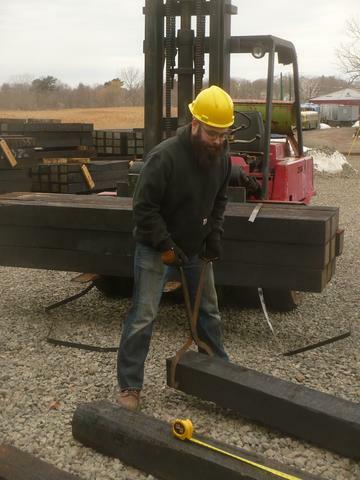 We are grateful to A&G Construction of East Haven for the use of their Lull telescoping forklift, which greatly eased material handling. 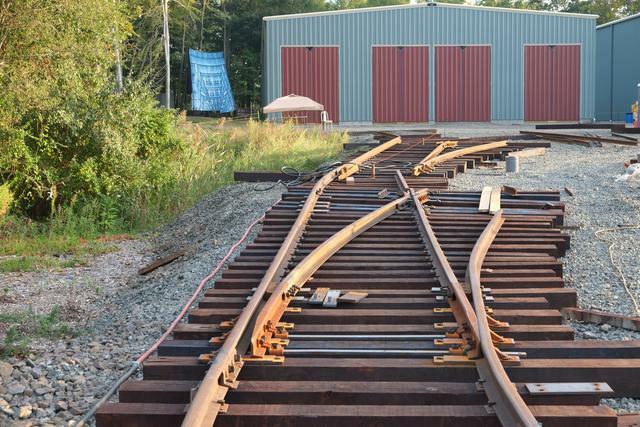 The two stock rails of what will become turnout B-94, the throat of the building 9 ladder and the beginning of the new Birch Memorial Loop. 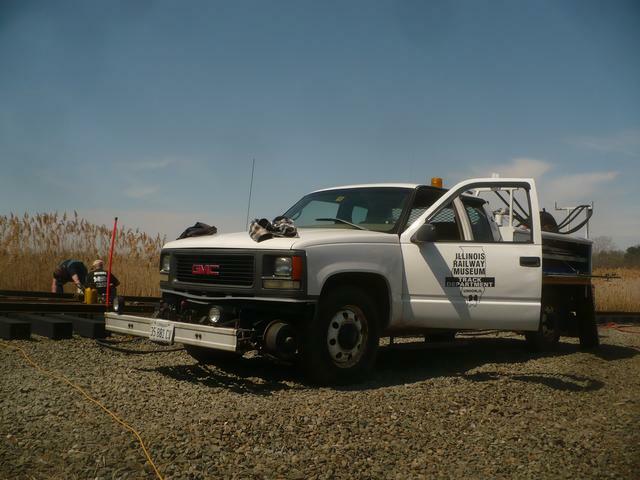 IRM brought their hy-rail track department truck, loaded with enough hand and power tools to keep the entire crew occupied! 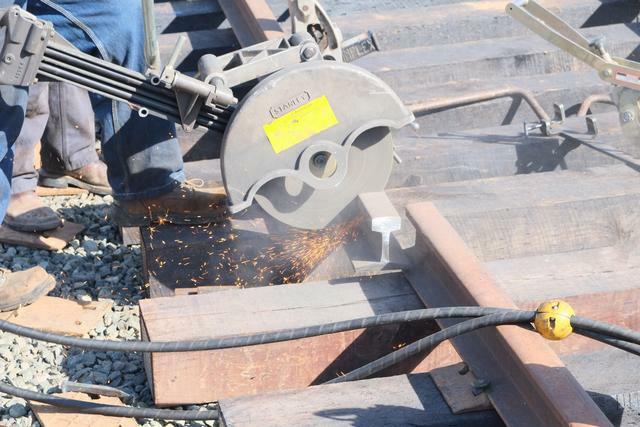 These tools included this hydraulically-powered abrasive rail saw, which made much quicker and easier cuts than our pre-historic reciprocating hacksaw machine! 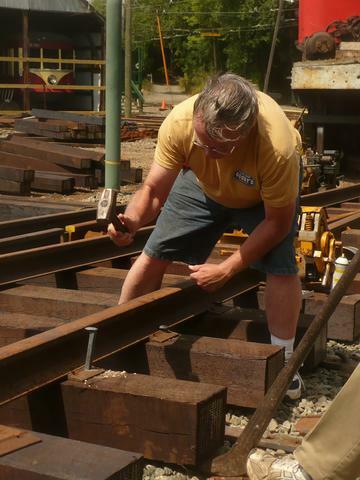 With this, the first of many holes were drilled, for the heel blocks of B-94 turnout. 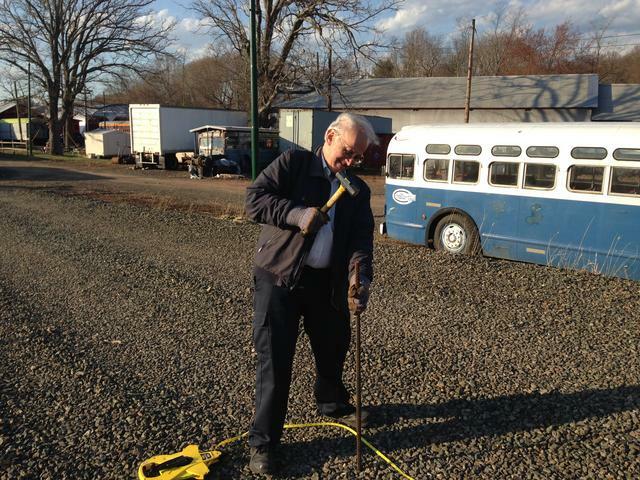 Another handy device was this spike-setter, allowing a helper to hold the spike while it is set by the air hammer. 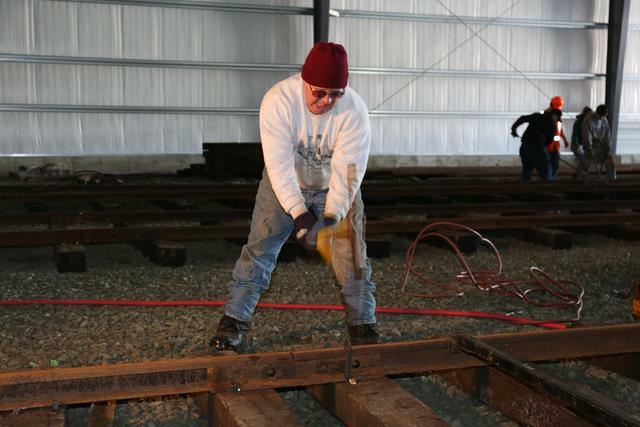 After a few pops, the spike setter is withdrawn and the air hammer finished the job. This was a lot faster than pre-drilling and/or pre-setting the spikes with a maul. The straight side of B-94 turnout is done, only a few hours elapsed! 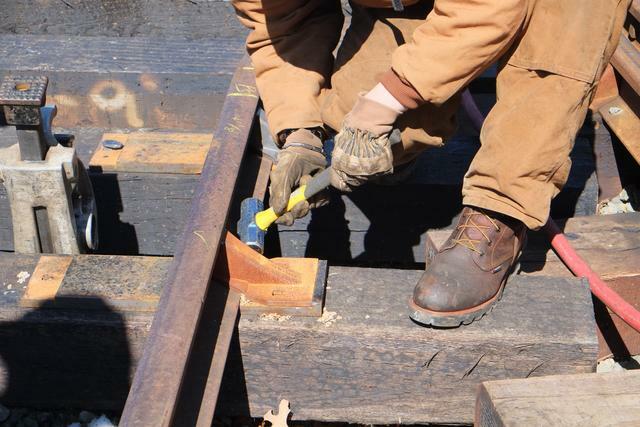 Further up the ladder, the heel block of 93-94 turnout is being installed as work continues on B-94 spiking the guard rail on the diverging side. 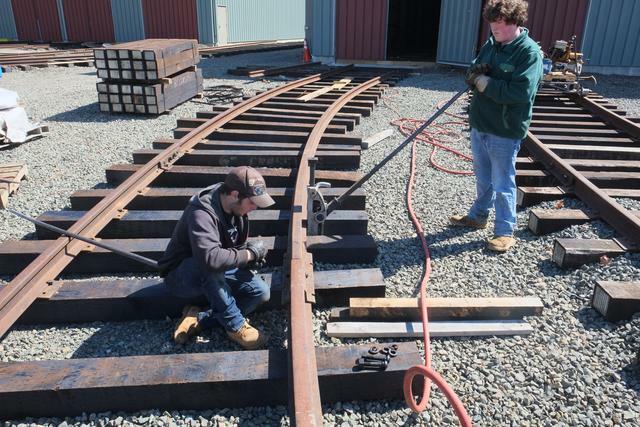 Students in our Gateway Community College Railroad Engineering Technology internship program got valuable experience working with volunteers from other museums, several of whom are track professionals. 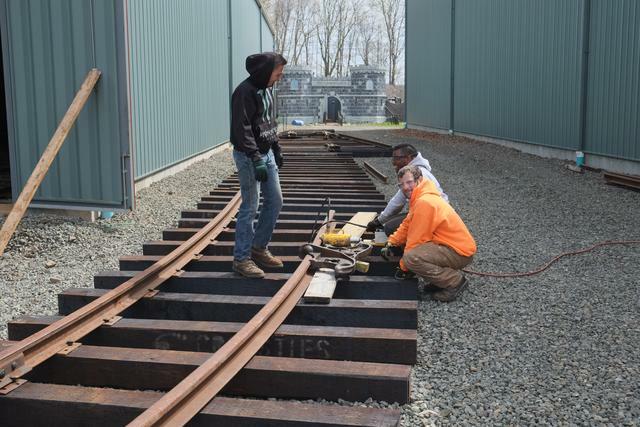 Here they are setting the gauge wider than usual on the diverging side through the frog, to allow proper guarding action with our mixed wheel profiles. 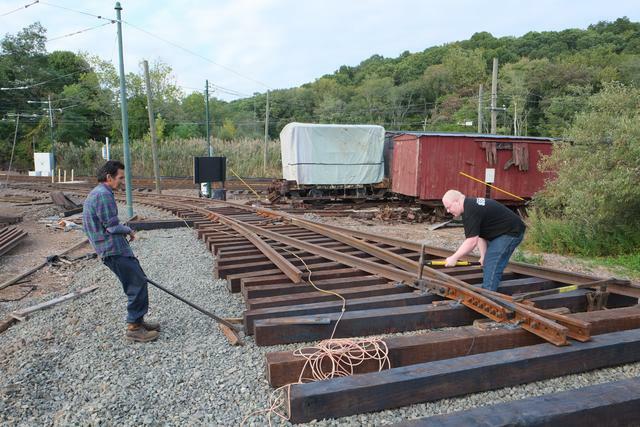 An IRM volunteer demonstrates the use of their gauge pusher, which is quicker than ours but requires a helper. On the third day of the project, turnouts B-94 (immediate foreground) and 90-94 are done, as work progresses on 90-92 and 93-94. Now we're up to the frog of 93-94, as it is lined up and bolted in. By Members' Day, April 25, 2015, museum supporters could see the fruits of their donation dollars. These four turnouts are complete! 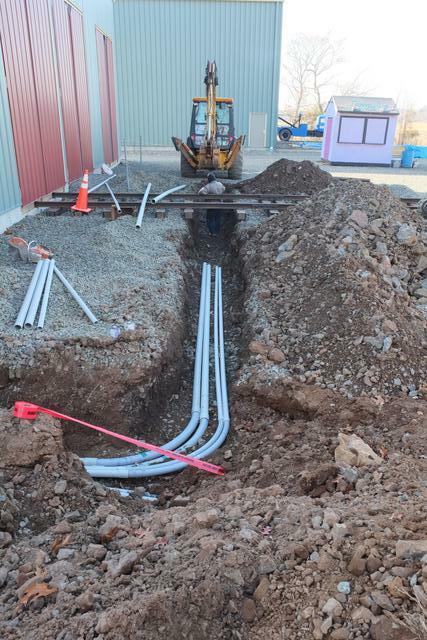 There is still more work to be done before Building 9 is connected. 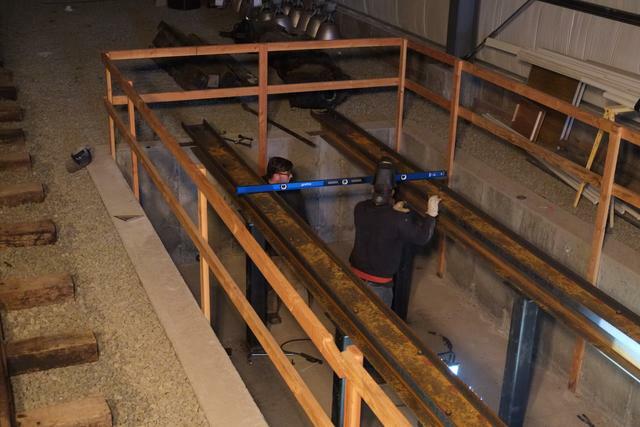 This ladder must be cut-in to the existing "run-around" track behind Barn 6, and one more turnout (90-91) must be constructed. 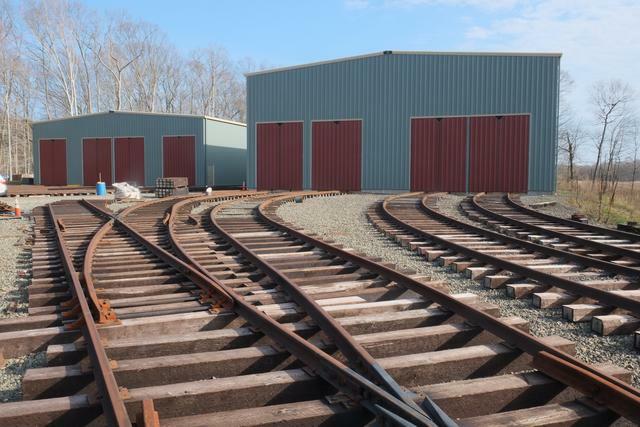 Meanwhile, back at Building 8, Track 83 connected! Building 8 now completely connected! 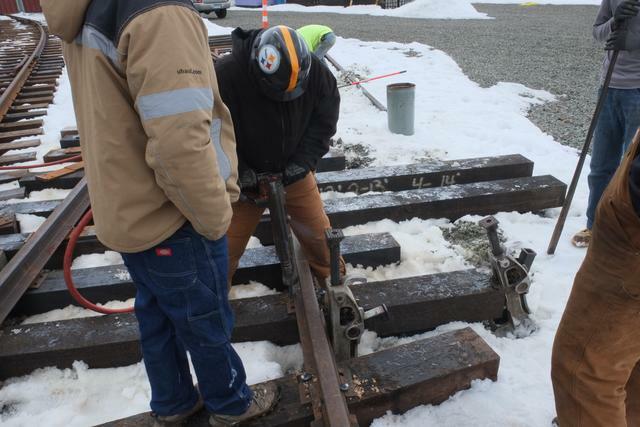 Making up the heel block on the 84-85 turnout. 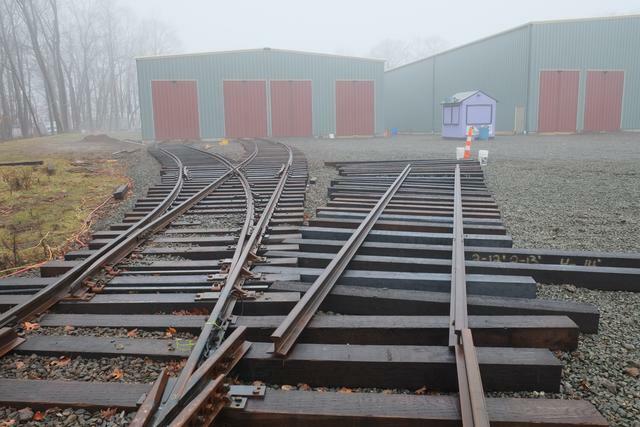 Two views looking back towards the mainline and ahead towards track 84 with the frog in place and straight side of the turnout spiked. 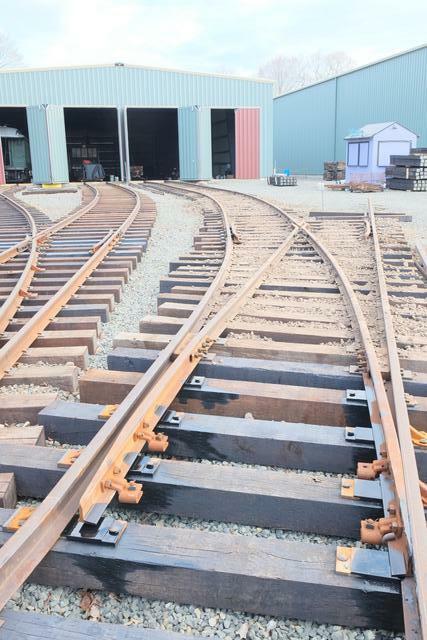 In this view, the next length of the curved stock rail has been made up and it, along with a curved closure rail, have been bent to radius and spiked to gauge. 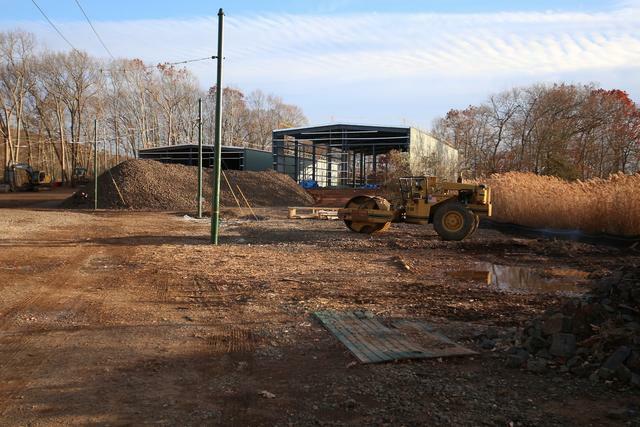 The turnout is now almost complete and all that remains is the connection into Building 8. 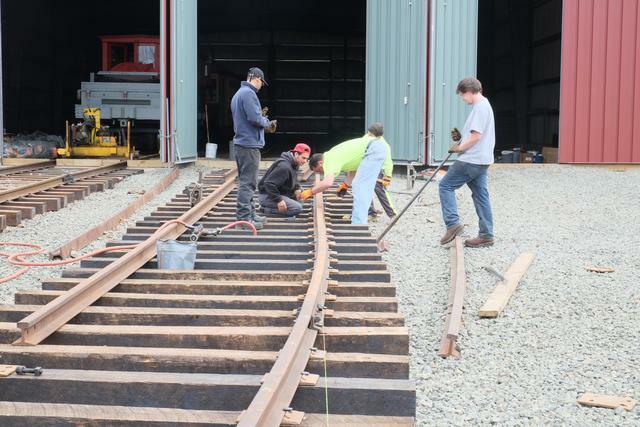 The connecting track has been bent and spiked, and joined to the track inside the building, which was partially built during the winter of 2015. 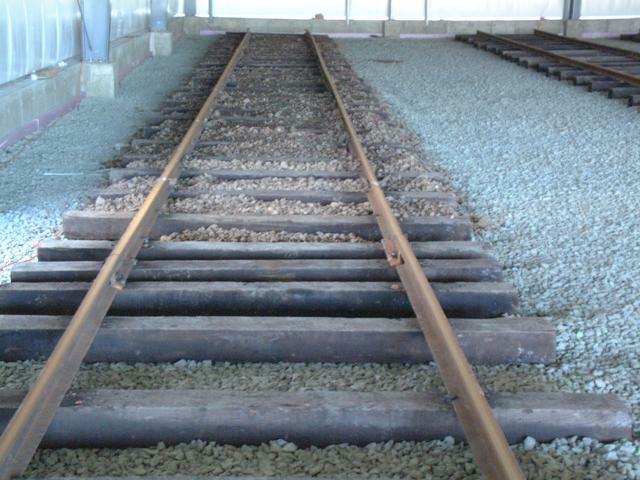 The track has been placed in service but full use is pending stone delivery, levelling and tamping. 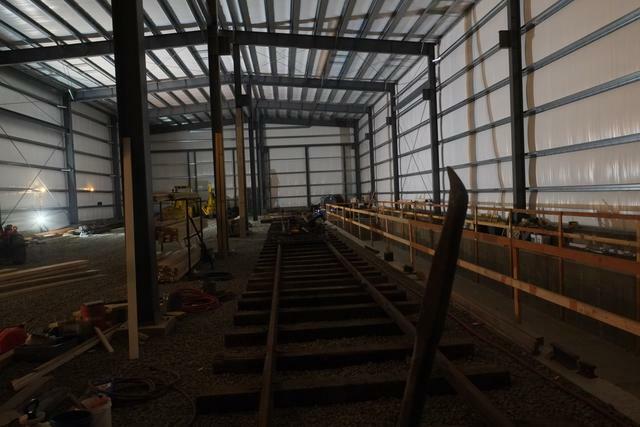 Sep - Oct 2015 the turnouts for tracks 92-94 in the Building 9 ladder were built in Spring 2015. 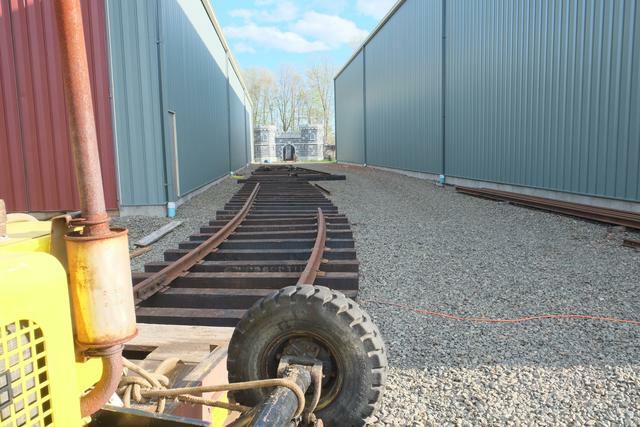 Now that the daily operations season has ended, cars were moved to clear the "run-around" track next to Barn 6. 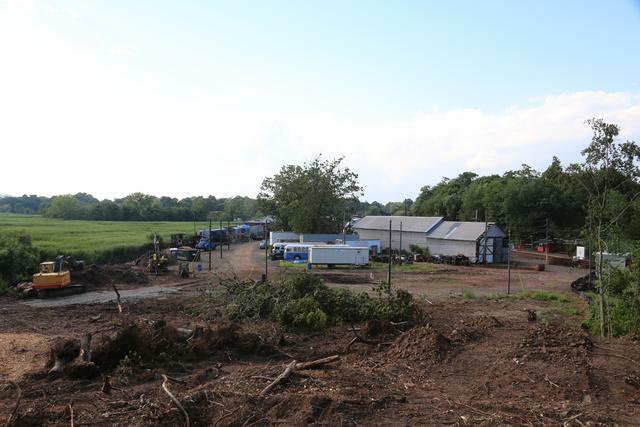 Grading is now complete, view from B-94 turnout looking back towards run-around and second view from far end of run-around track looking towards Barn 9 lead. 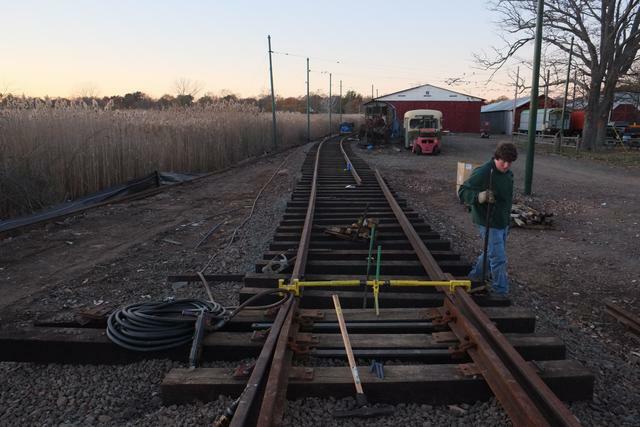 Run-around track: Ties and rails all set! 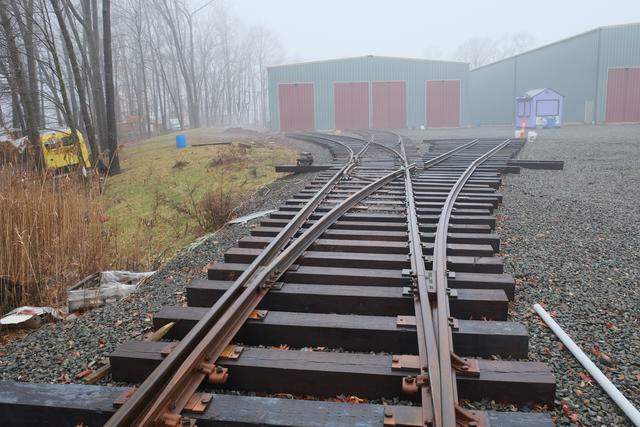 Nov-Dec 2015: Building 9, track 93, is now connected to the railway via the completely rebuilt run-around track. 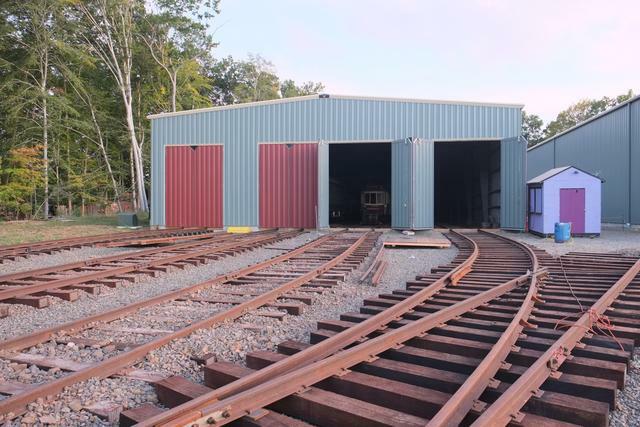 Although no cars in the collection are yet being stored in the building, they will be soon after ballasting and levelling is complete. 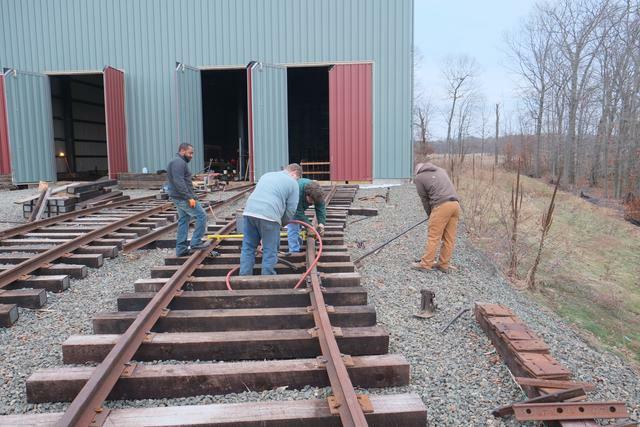 At the railroad west end of the rebuilt run-around track, the new 80 pound rail joins the existing 70 pound rail of the Barn 6 ladder. 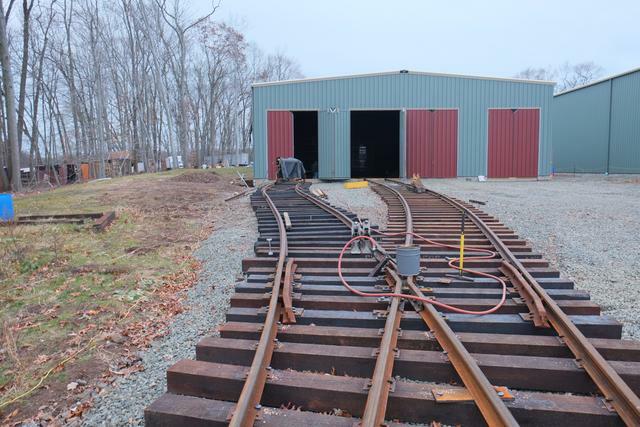 The next week, track is connected and flatcar has been run through to deliver supplies. 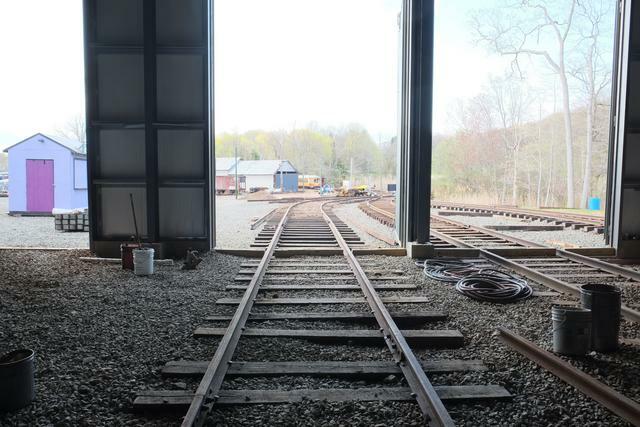 View from 93 track looking railroad west down the ladder, and looking east towards Building 9. 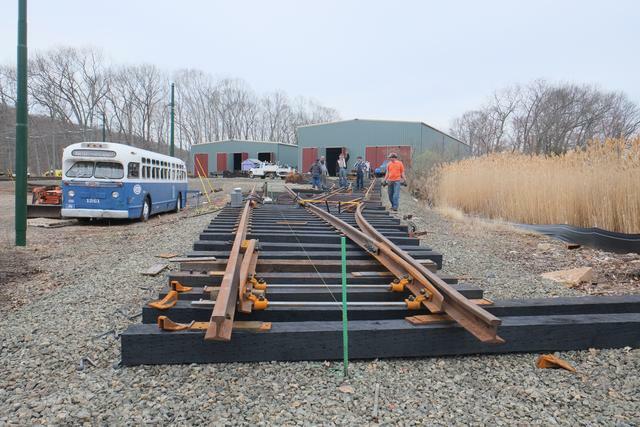 Jan/Feb 2016: Another project milestone was quietly observed as the calendar turned to Feb, 2016, as car 500 was towed into 93 track. 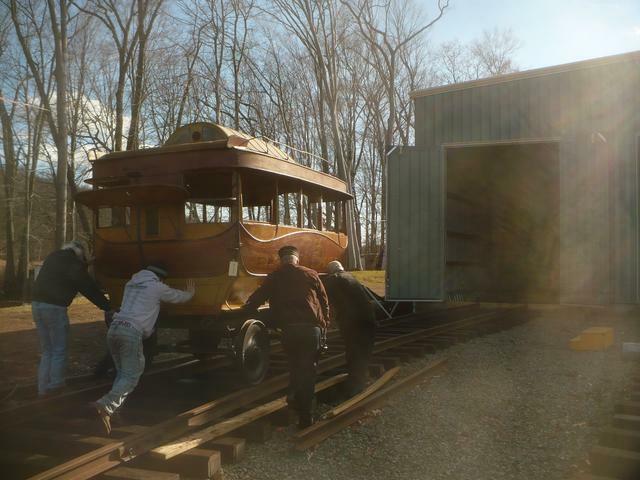 Its motors were recently pulled as part of the ongoing flood recovery program, and now it will be stored safely in Building 9 until the motors return from the overhaul shop and it is time to complete the repairs. 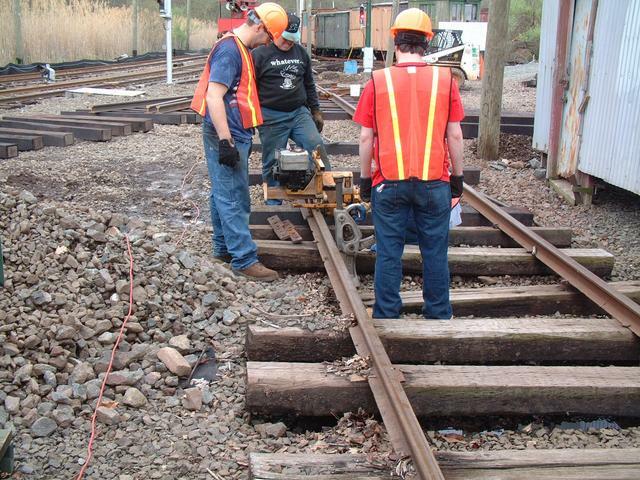 After ballast was spread over the completely-spiked track, these students who just began their Gateway Community College internship are putting the track in proper level (the yellow tool checks the cross-level, plus a laser level for end-to-end level) and tamping the ballast by hand. To be honest, 500 wasn't motoring itself, despite the pole seemingly being up. 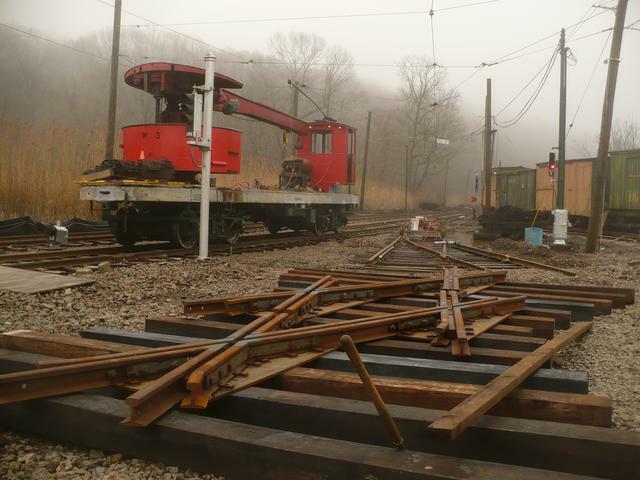 For one thing, there is no overhead wire here yet, and 500's motors are not in it. Car 775 is performing the towing and is powered by a "stinger". 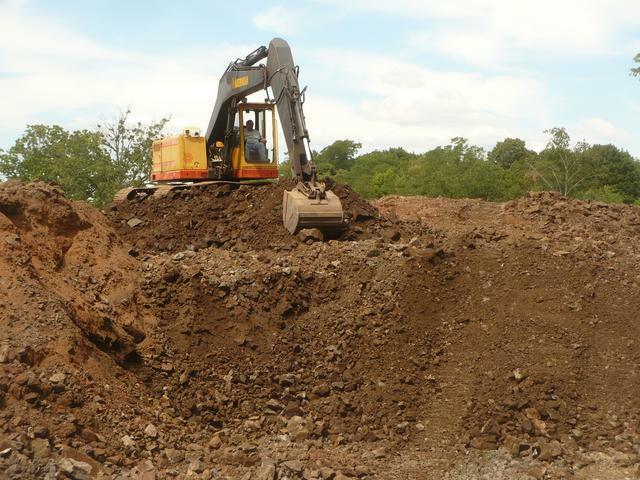 View from other direction, 500 alongside future pit. 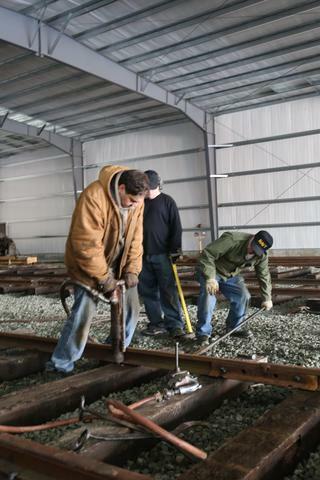 Snowpack is impeding outside track work but work inside Building 9 continues. 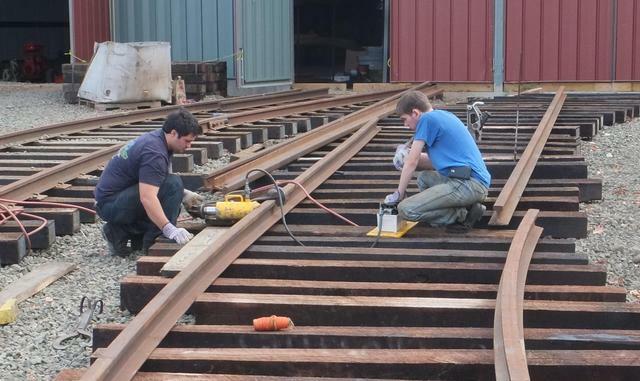 Below, 92 track is being spiked, with 91 track in the background ready for spiking. 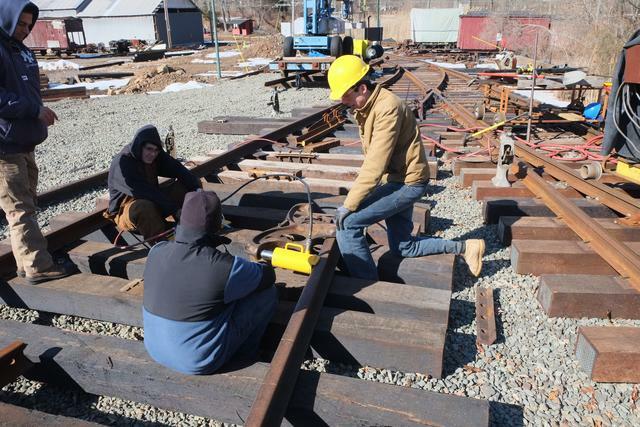 Feb 2016: In late February, with the snow almost melted, outdoor work resumed. 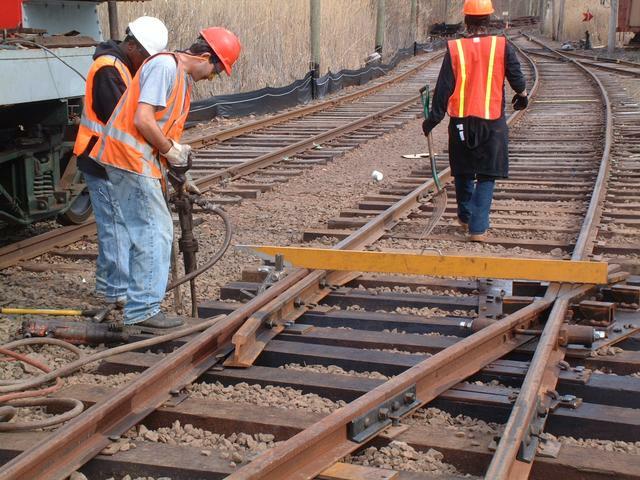 The final few feet of the connecting curve for track 94 were bent, lined and spiked. 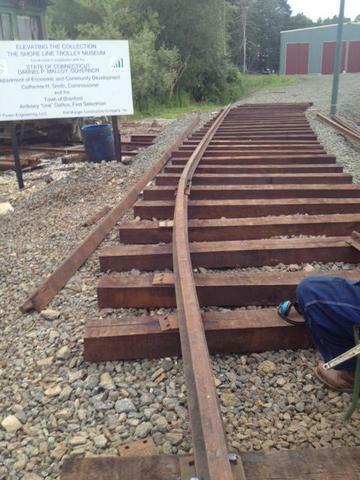 The pit is not yet constructed, so this track is usable for emergency outdoor storage only at this time. 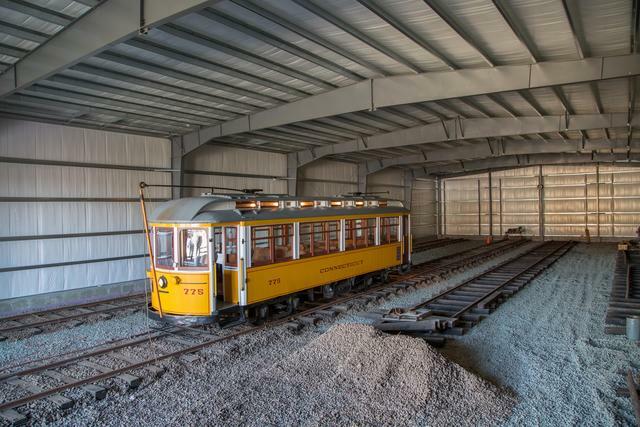 The 10 feet of indoor space holds the track tool carts. 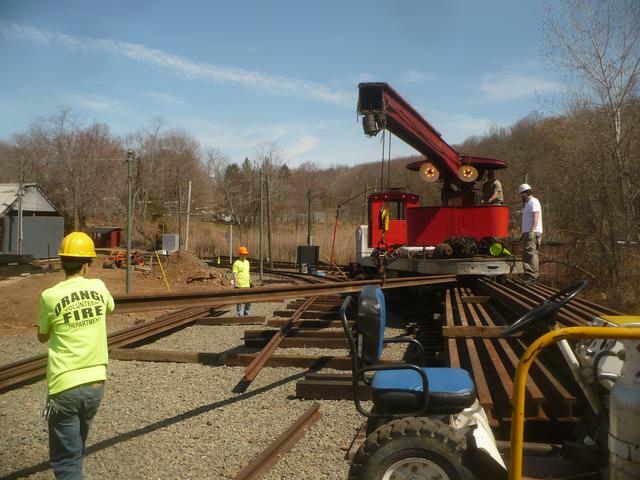 April 2016: Another project milestone was reached in mid-April. 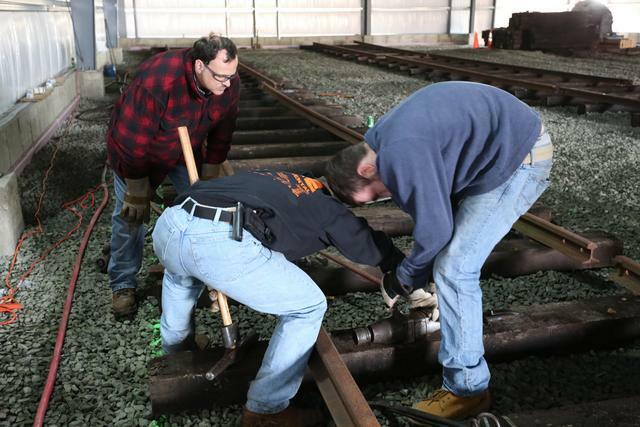 The last turnout of the ladder (90-91) was completed, giving access to the final track (91) of Building 9, and to track 90 down "Broadway" between the two buildings. 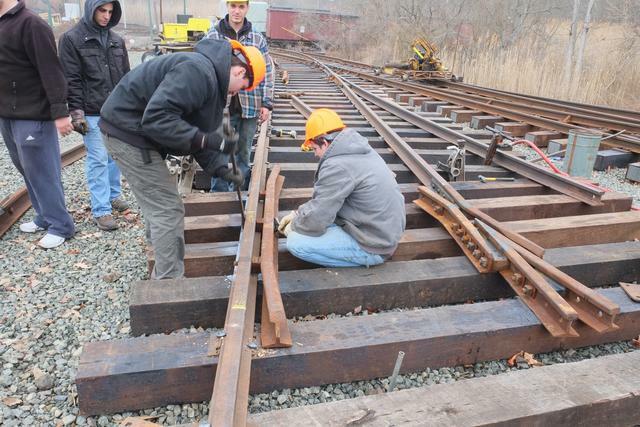 Below, spiking of the diverging closure rail of 90-91 turnout, leading to 91 track, is progressing through the frog area. 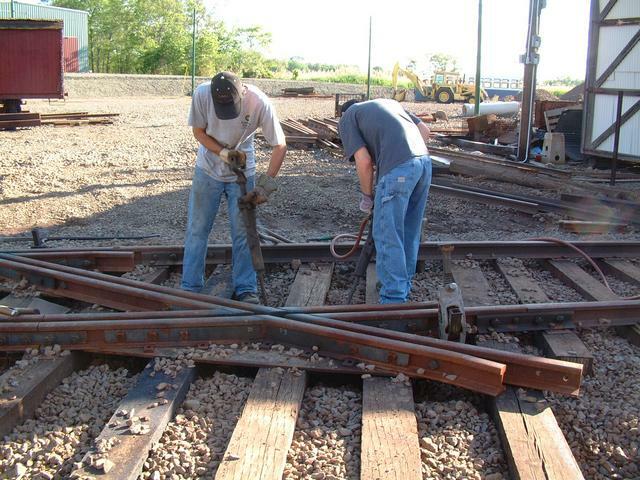 The layout of track 85 is now underway. 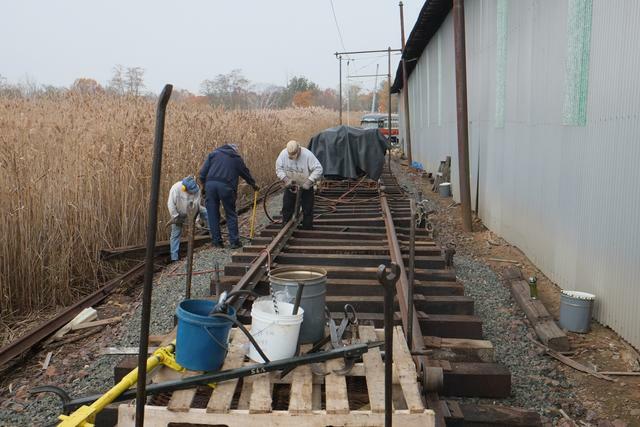 Below, rail has just been bent and ties are being lined up prior to spiking. 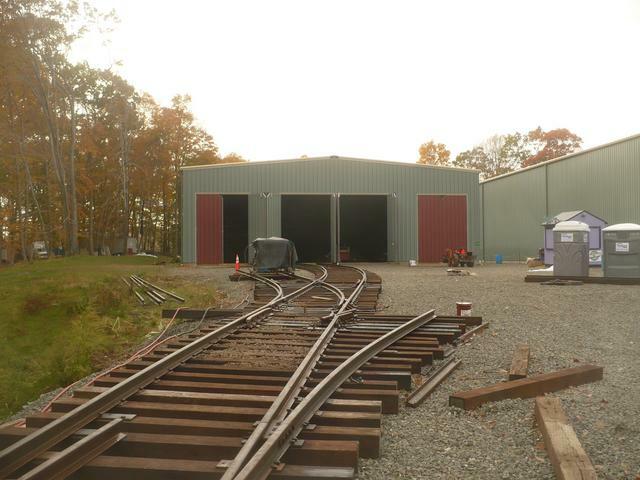 Building 8 and track 84 are in the immediate background. 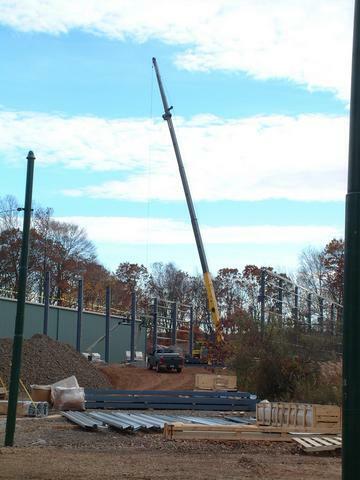 View from the far end of Building 8. 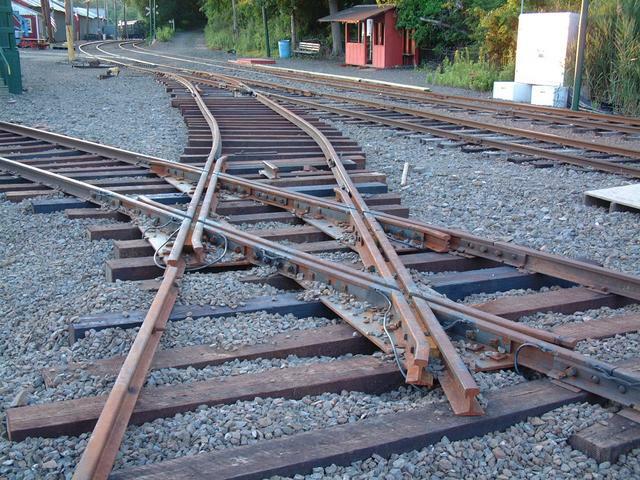 Layout of switch timbers for a future cross-over between tracks 85 and 90. Track 85 is one of two outdoor tracks in "Broadway" between buildings 8 and 9. 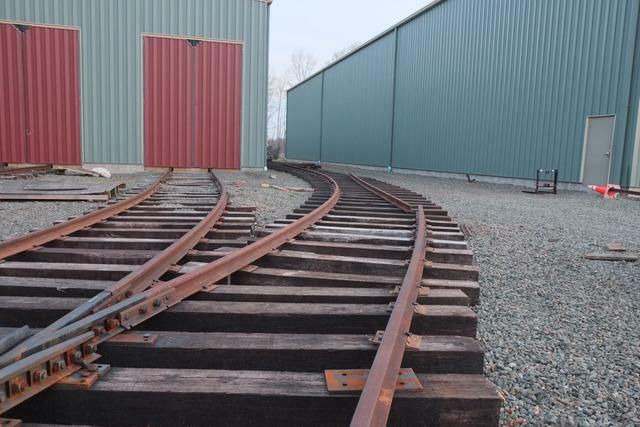 These tracks give us extra flexibility when switching cars between the two buildings, and also several hundred additional feet of flood-proof trackage. In the photo below, the left-hand curve is just beginning taking us from the straight side of turnout 84-85 into 85 track. Our little car-mover pensively awaits the run over the last part of the building 8 ladder. 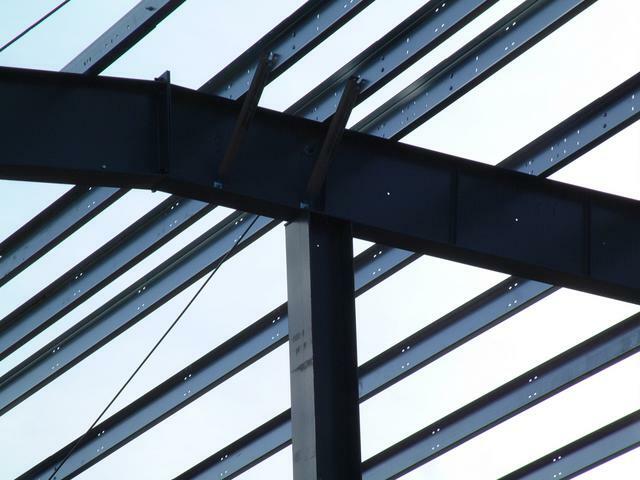 A few days later, spiking has advanced beyond the point of tangency and alongside building 8. View looking railroad west. 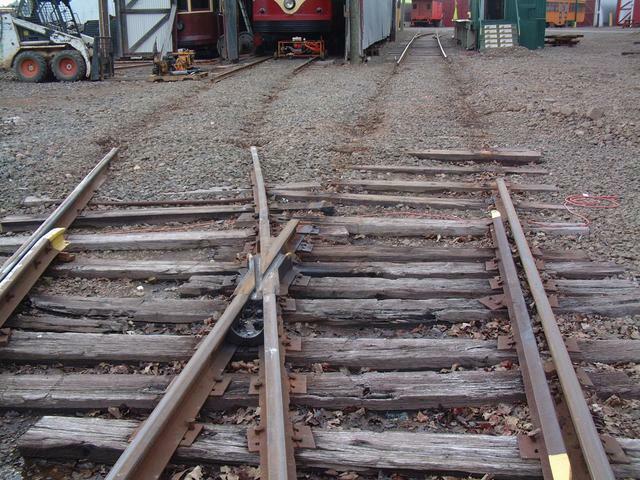 The frog for a cross-over to 85 track is in place. 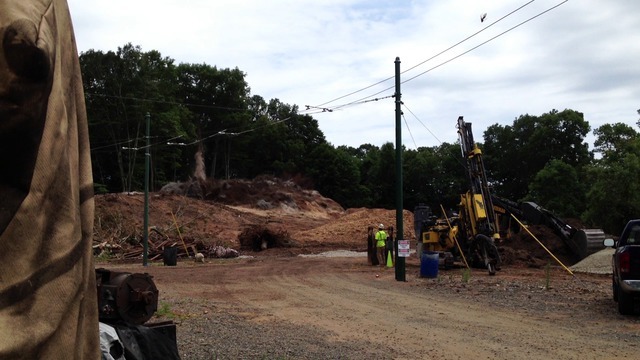 Meanwhile, inside building 9, track 92 has just been leveled and tamped. 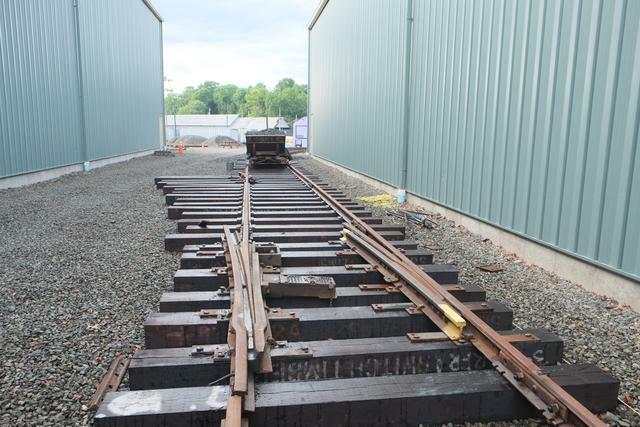 Equipment is now being stored on this track. 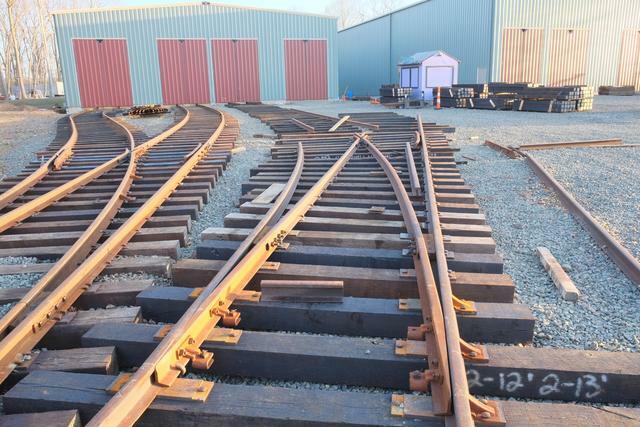 Track 91 to the left just needs a few more spikes, stone and tamping. 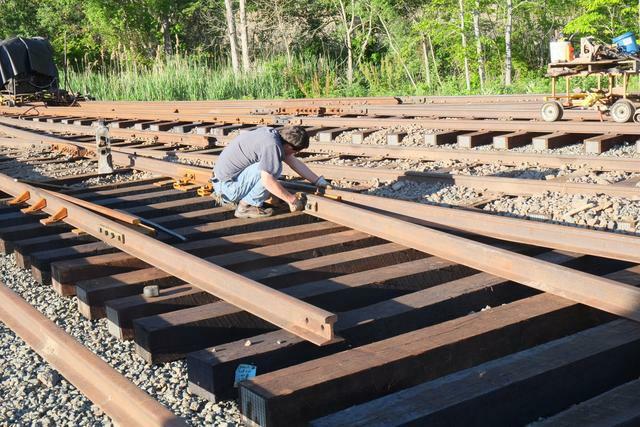 Summer 2016: The next part of placing track 85 in service was lining up and spiking the point-and-mate (or "single-point") switch, which forms one end of a crossover between 85 and 90 tracks. Only the straight side of this switch is being completed at this time. Below we see the No. 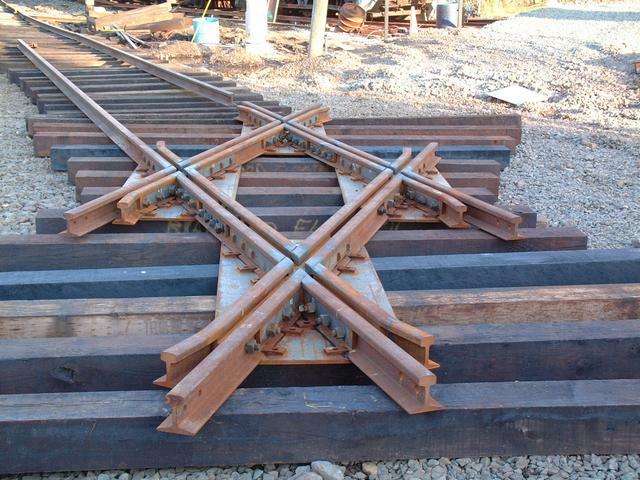 4 frog which has just been connected to the straight rail on either side. 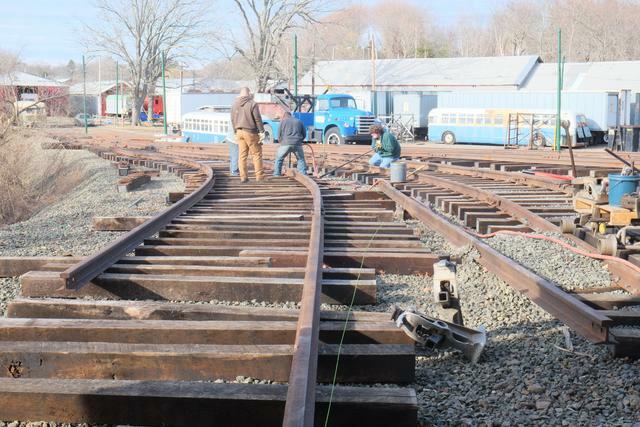 Hook-twin plates are being positioned to hold the frog. These are the point (on the left) and mate units. At the time of this photo, they were not connected or spiked yet. 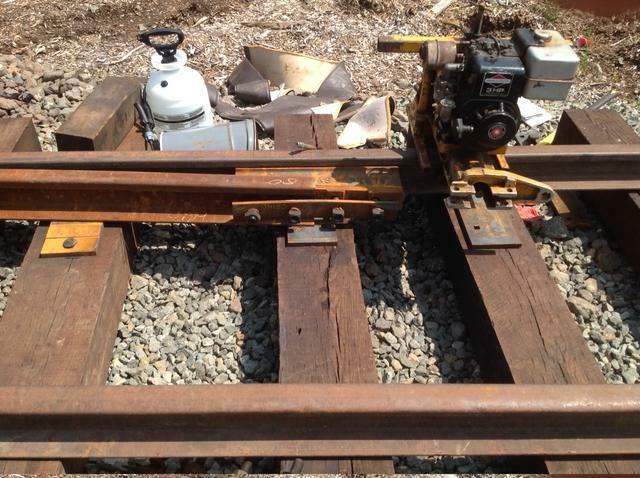 This switch was "free" in that it was taken out when 21 track was removed from service in 2014. A few weeks later, the frog, point and mate are all spiked down with hook-twin plates. 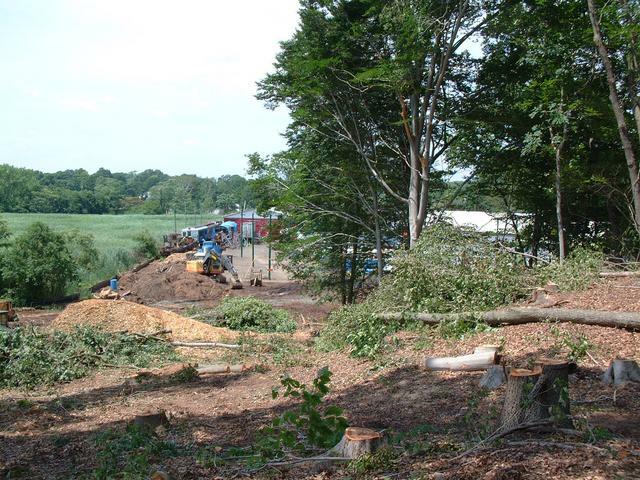 In early July, this was the scene in Building 9. Car 500 is almost invisible in the dark corner of 93 track. 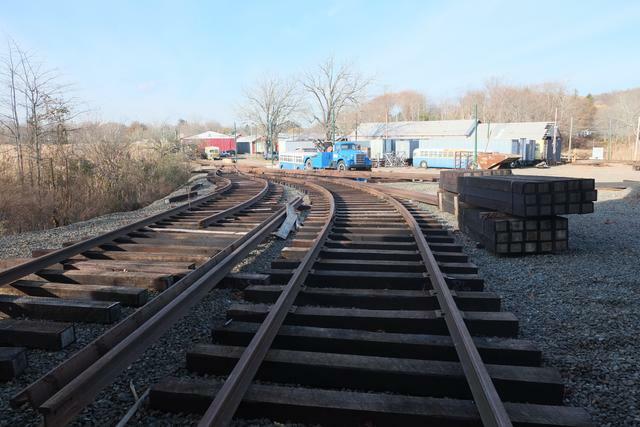 27 and 3662 are on track 92, and 91 is complete and ready for cars. 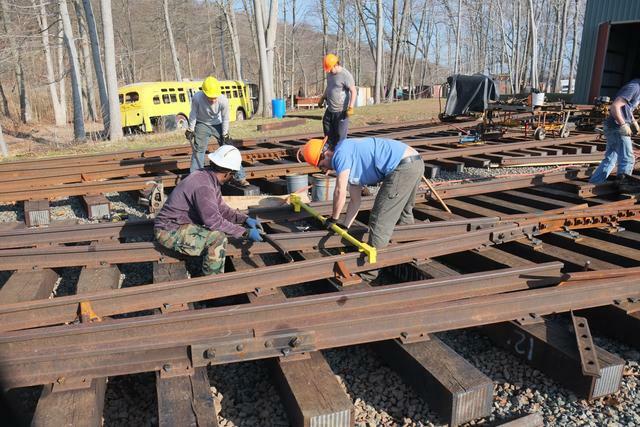 Track tools are stored on the rolling cart in the foreground. 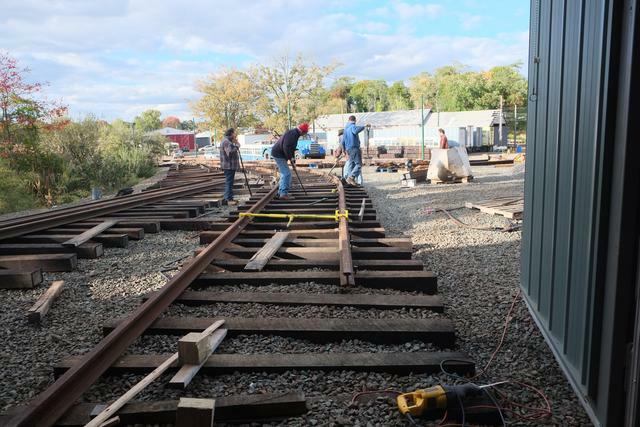 A few days later, switching moves were underway to populate these tracks. 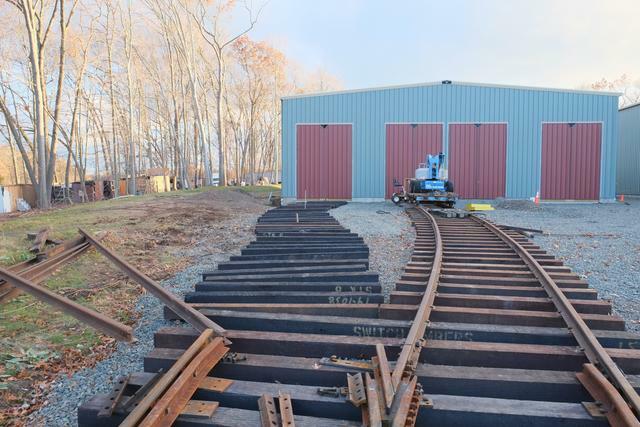 Below car 1403 is being pushed by 6688 along the run-around track, next to Barn 6, which leads to new Building 9. And here is 1403 on track 91, with 2431 on track 92. 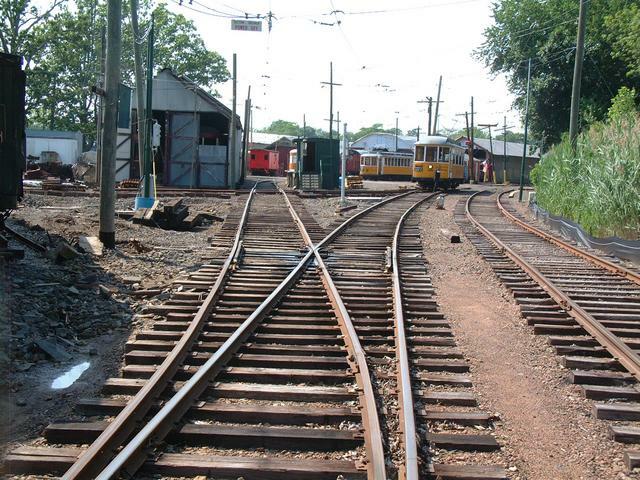 Behind 1403 on track 91 (not visible) are 1403 and 1972. 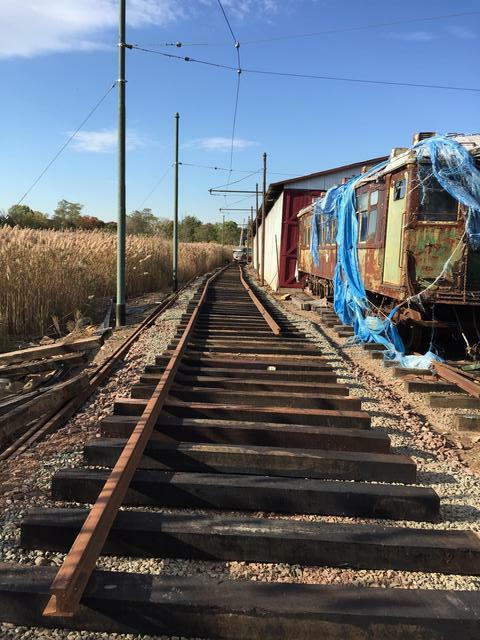 These un-restored cars were all operable pre-Irene, and are being stored here to protect them from the possibility of additional flood damage until they are repaired. 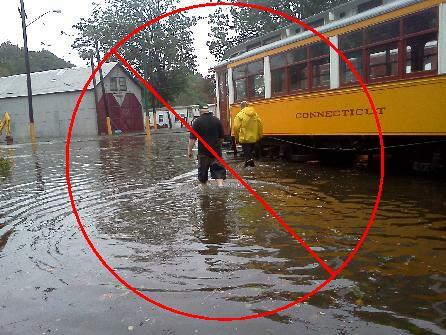 Sep 3, 2016: With a tropical storm warning posted for our area and predictions of moderate to major coastal flooding, the museum invoked its emergency plan. Operations were suspended and cars were moved to higher ground. 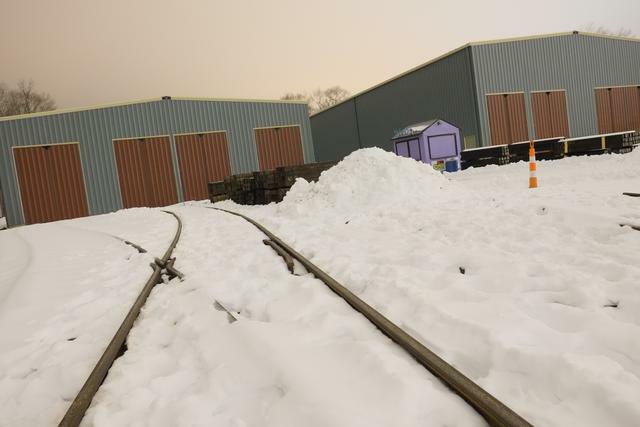 There is now more than enough track space out of the flood plain, and almost all of the operable cars were housed indoors too. As it turned out, the storm stayed further out to sea, and there was no flooding at all in our area. 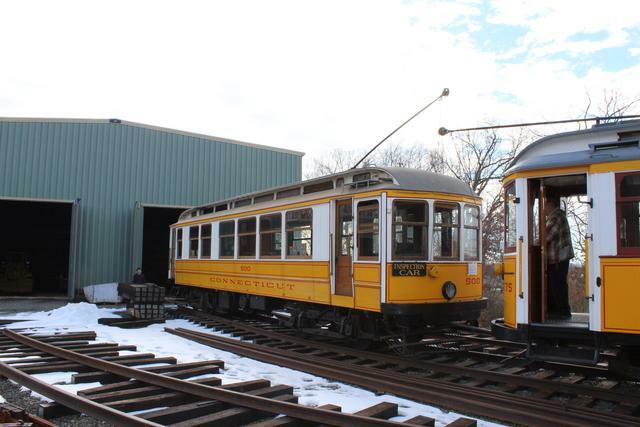 Below, cars 850 and 948 are on tracks 82 and 83, with 3152 in the "alley" on 85 track. View from the other direction with 3152 on track 85. 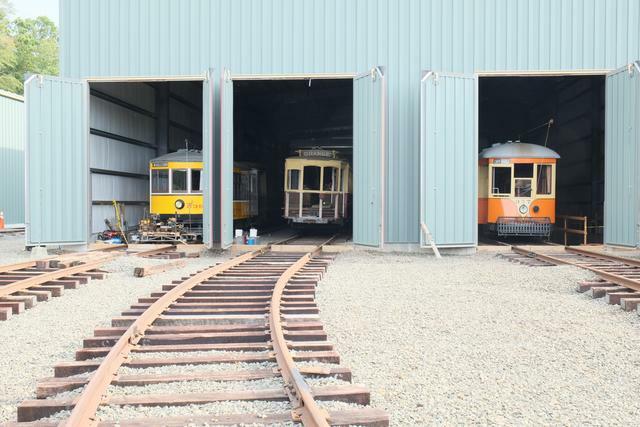 Building 9 is full of cars on tracks 91, 92 and 93. 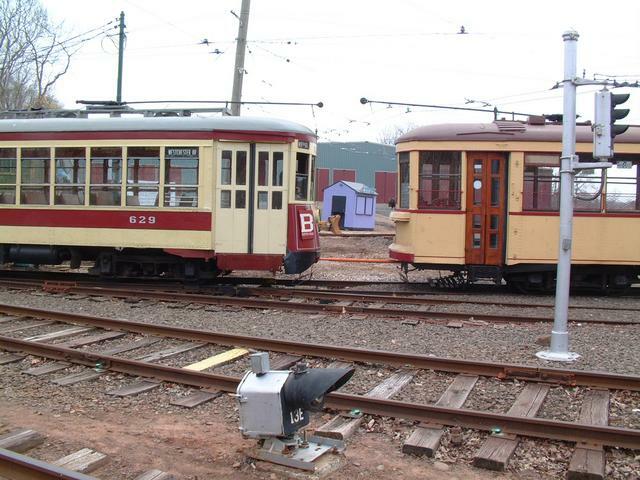 We see cars 2350, 2431 and 357, respectively. 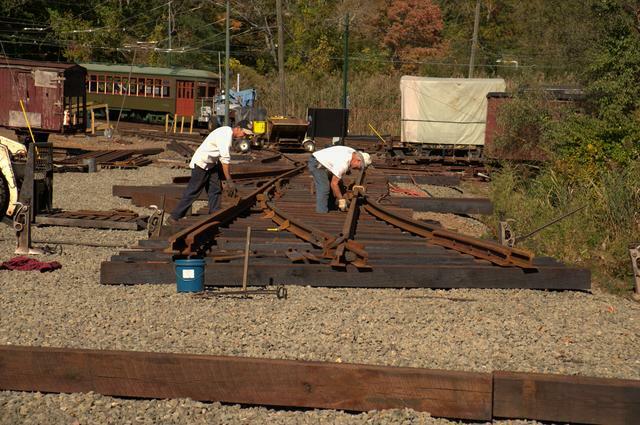 Construction is underway on track 94 (pit track) but it was not ready to accept cars yet. 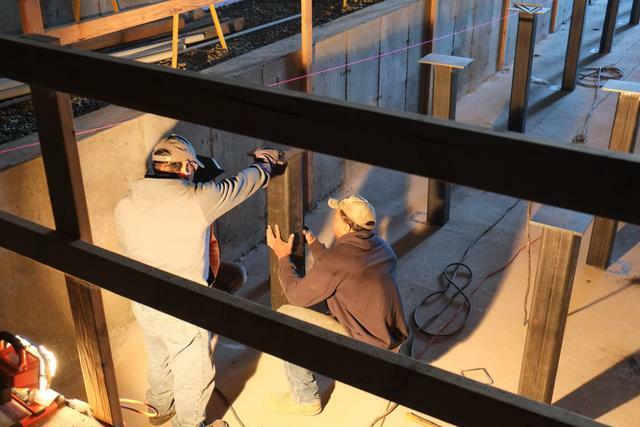 In mid-October, all of the columns were set, lined and plumbed. Below workers are using string lines to line up the columns near the back end of the pit. 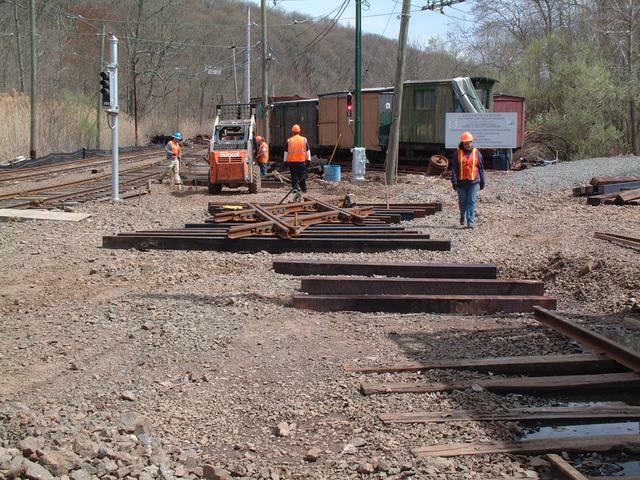 Note crane car W-3 on the adjacent Track 93. 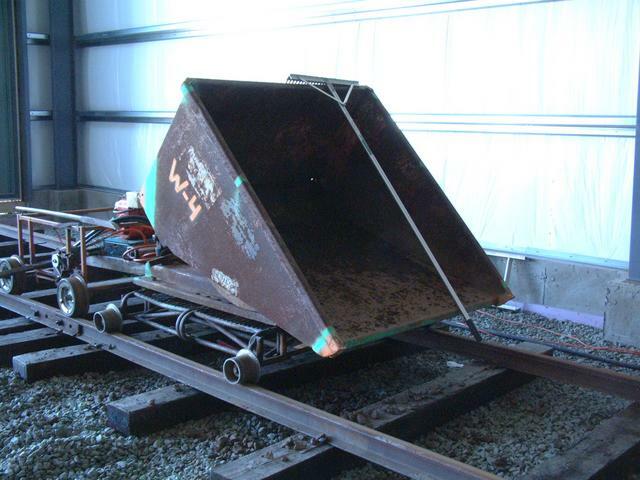 It was used to deliver materials. 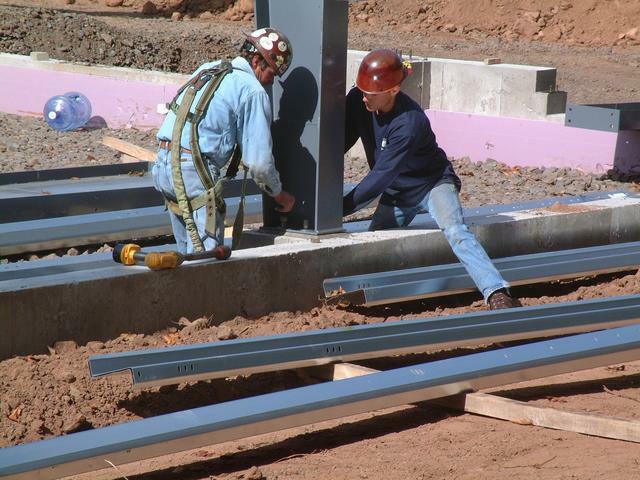 Each column was carefully plumbed and then tack-welded. 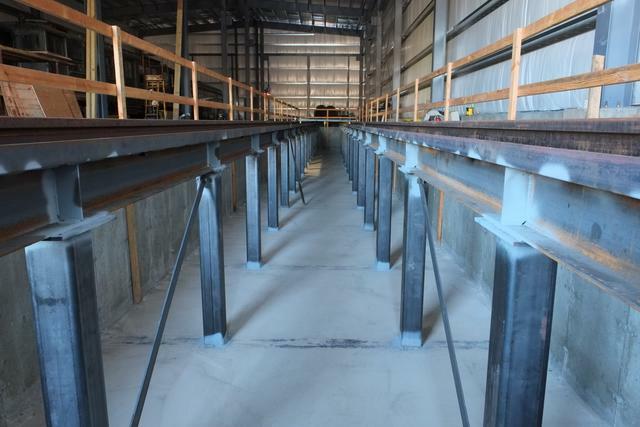 The steel I-beam embedded in the concrete floor was first prepared by grinding in the area of the column to get clean metal. 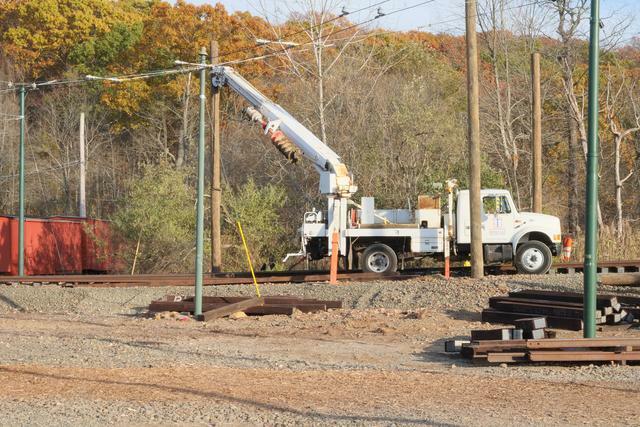 Late Oct, 2016: A utility pole contractor has begun setting the line poles, the first step in getting live trolley wire over all these new tracks. 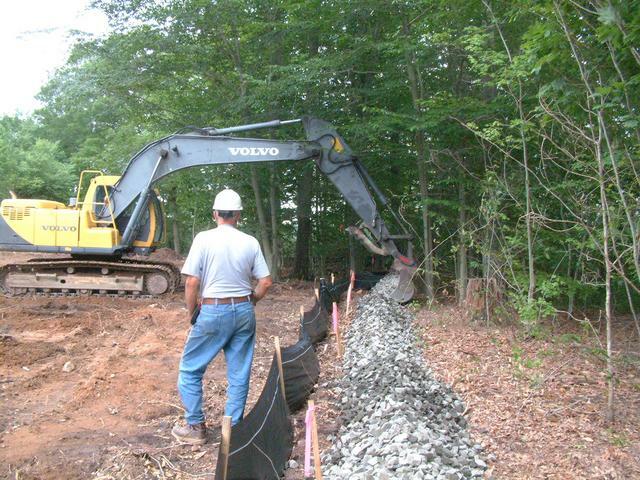 Here a boom-mounted auger is digging a hole 6-7' deep through the embankment. 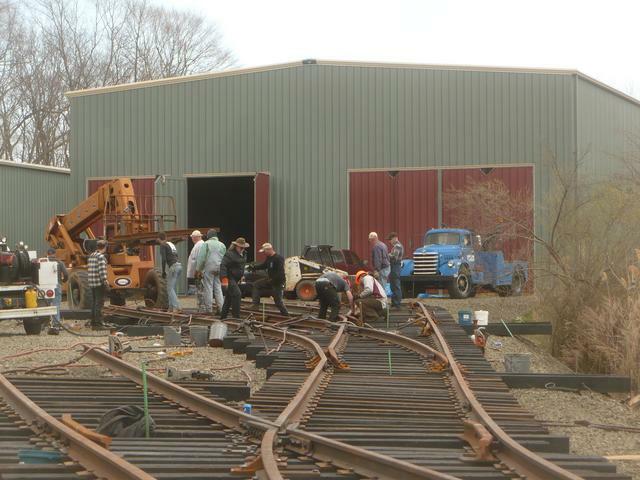 The location is near the future new loop track on the building 9 side of the yard. 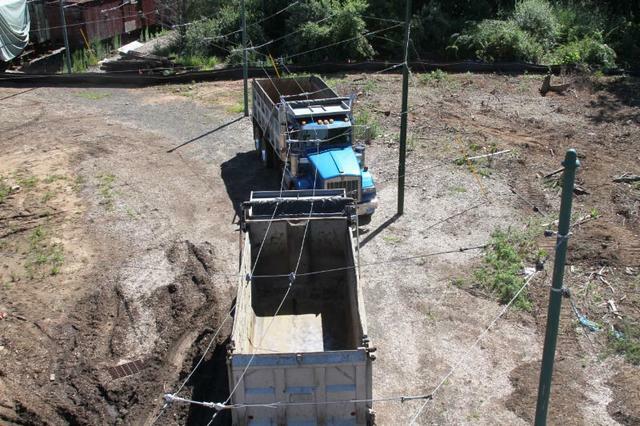 Once the hole is dug and the bottom cleaned out with special shovels, the boom truck picks up the new line pole and sets it into the hole. This tool, a "Peavey" pick pole, spins the pole so the branding mark is facing a consistent direction. It doesn't make any mechanical difference but it does make for a neat looking job. 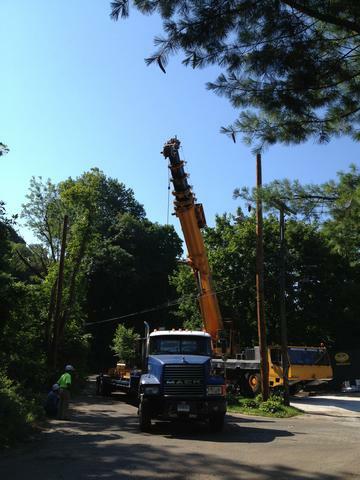 The boom truck detached from the pole shortly after this photo was taken, after the hole was filled and tamped. Nov 12, 2016: Governor Malloy was our guest at the 2016 Annual Meeting. 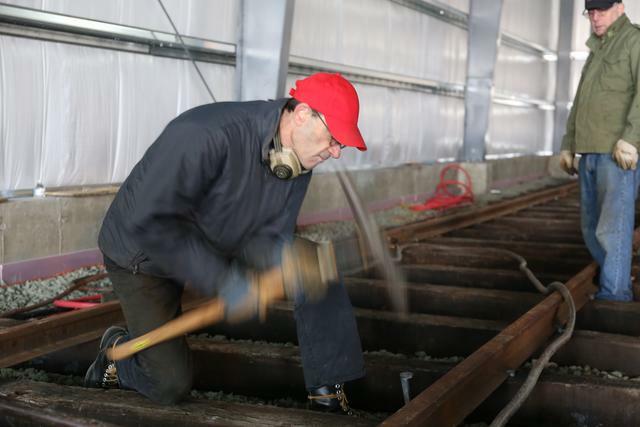 In a morning ceremony, he drove a symbolic golden spike. 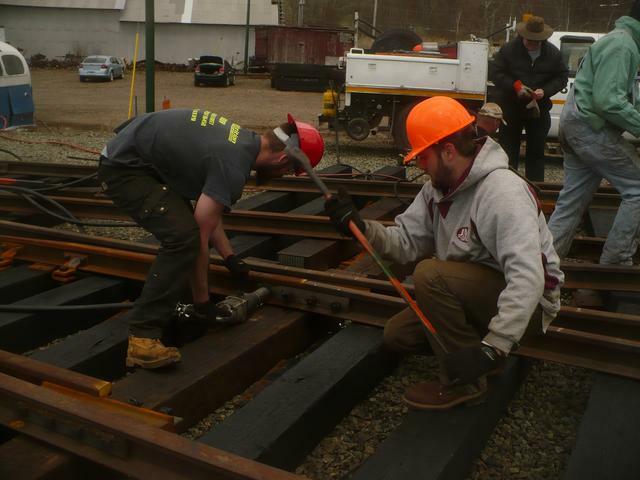 With a crowd of museum members and supporters looking on, and with a few perfect hits of the spike maul, the Governor set down the spike on the 84/85 track lead. 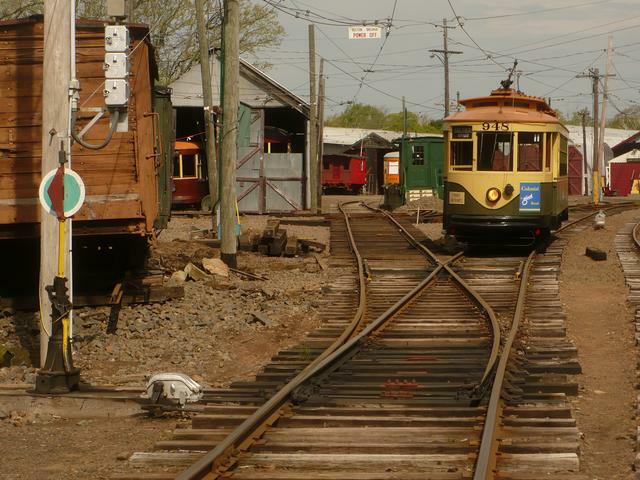 Situated around him were cars 865 and 316, both of which have recently been repaired after hurricane flood damage. 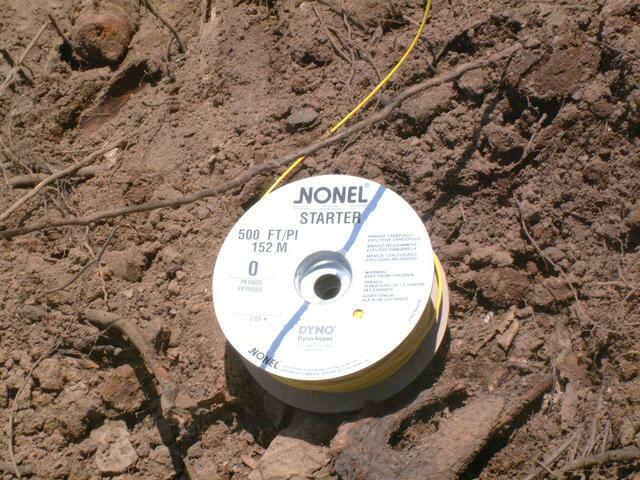 Line pole setting by a professional contractor continued through November and into December. 18 of the 24 total poles have now been set. With colder weather coming in, this will probably be it for line work until the spring. 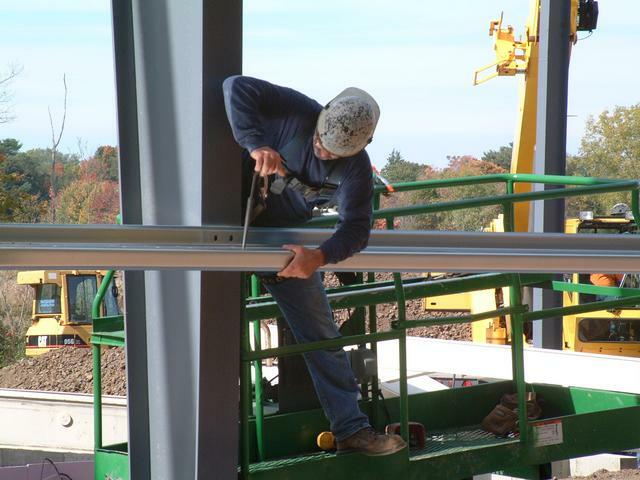 Above: setting pole E-5 on the north side of the approach ramp to building 8. 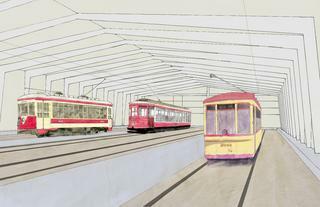 Below, view from track 81 with a succession of line poles leading back to the mainline. 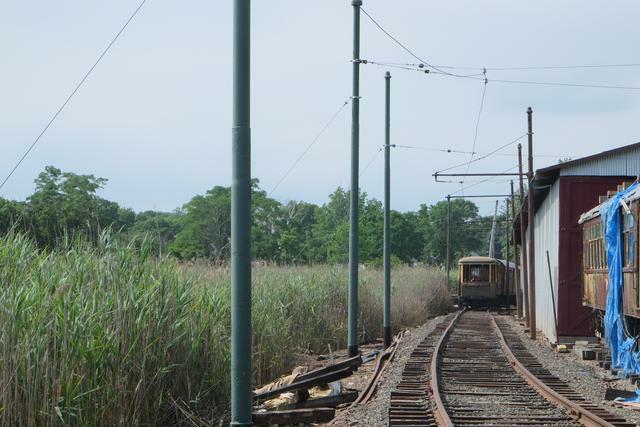 Soon span wires and trolley wire will be suspended from these. Looking the other way. 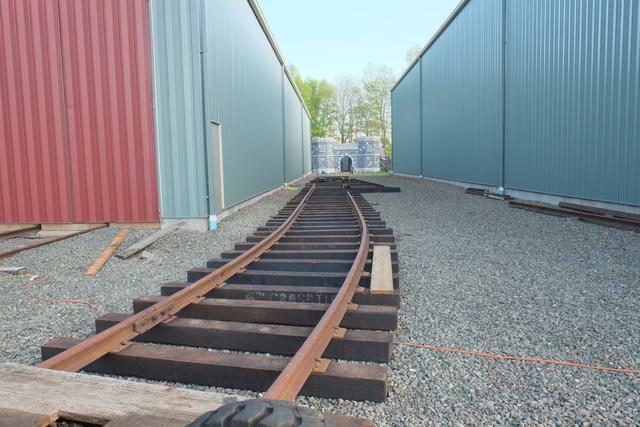 The area in the foreground will become the Donor's Recognition Brick Area as soon as the loop track through here is completed. 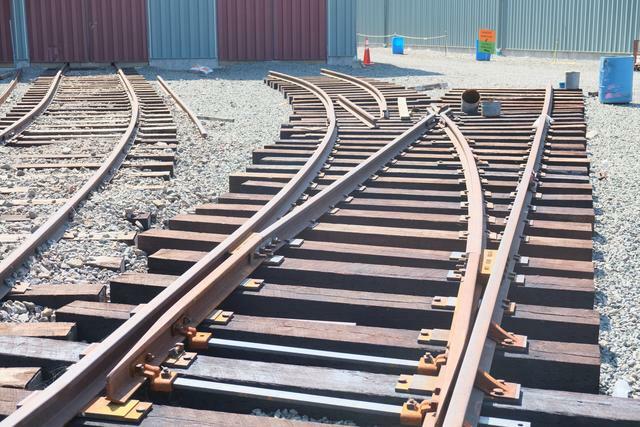 That track will curve off to the right, passing between the pair of poles. 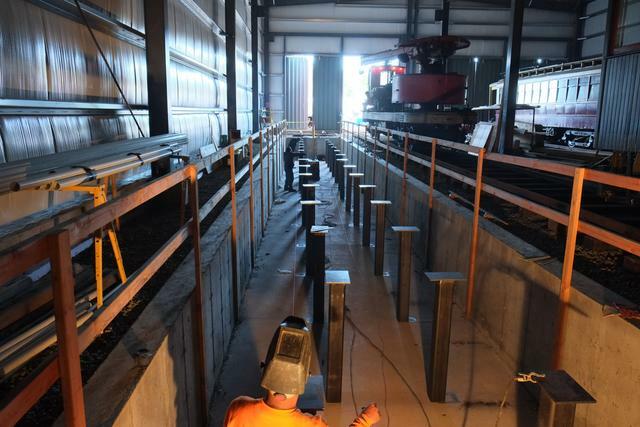 December 2016: Our welding contractor has completed the structure which will support the pit track. 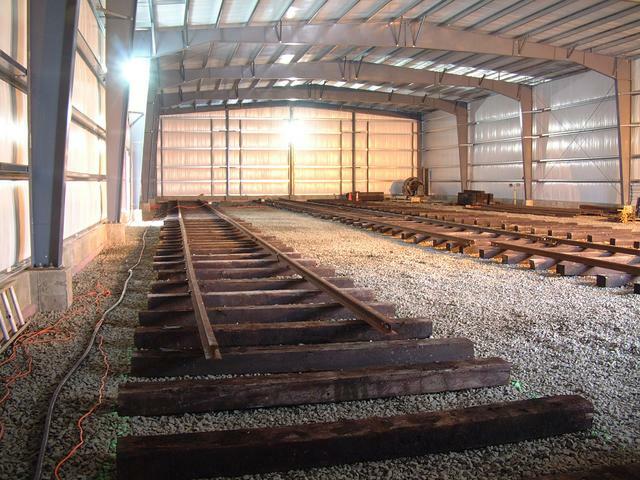 The next phase will be to install the rails and then track 94 can be opened. 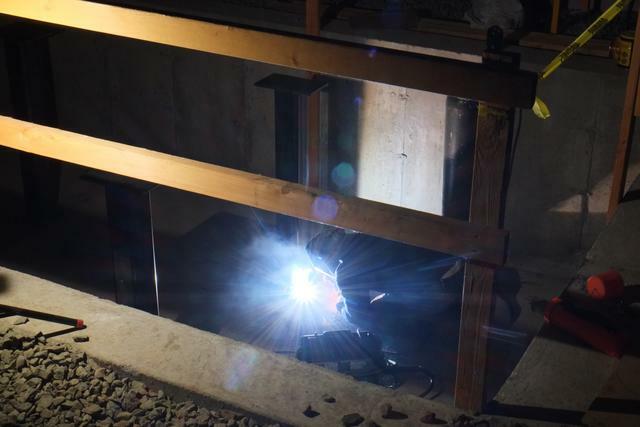 The level in both directions is checked prior to welding down the beams. 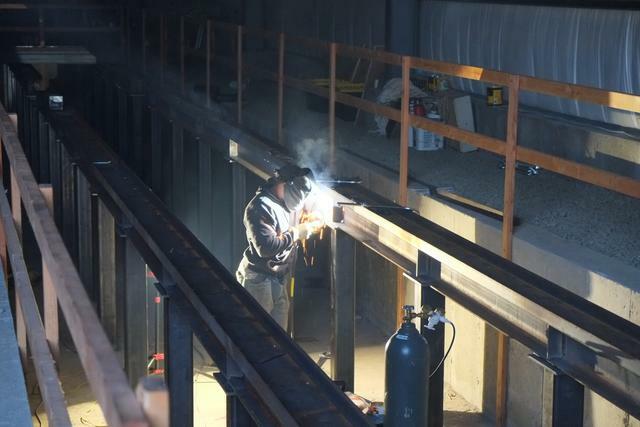 Welding the web stiffeners at each point of column support reaction. 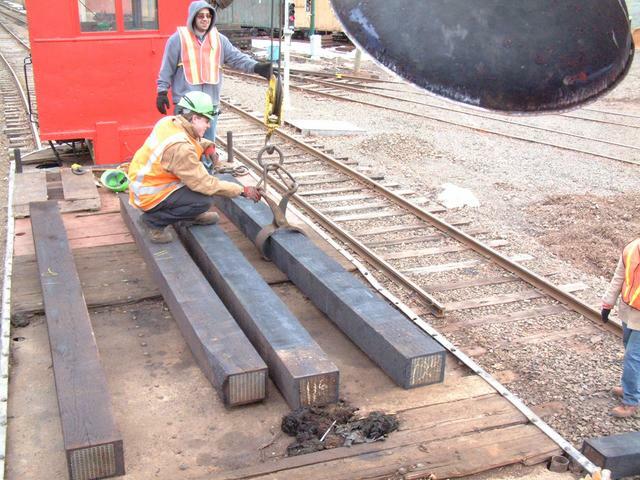 Almost all of the structure is welded, but one section is bolted so that it can be removed to access equipment on cars that might straddle the line of the rail (such as air compressors and grid banks). 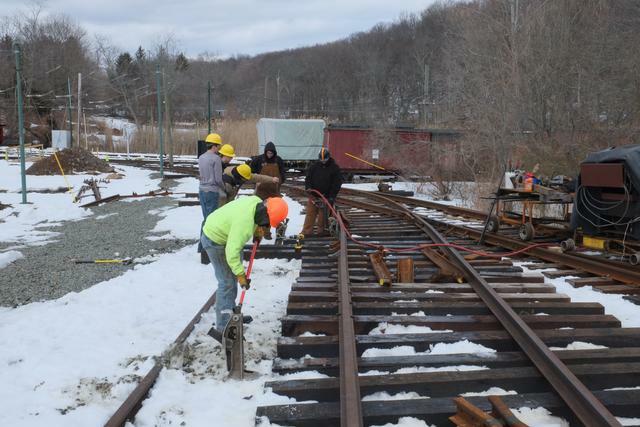 Feb 2017: Winter weather has slowed work, but rails are now being placed on the pit structure. 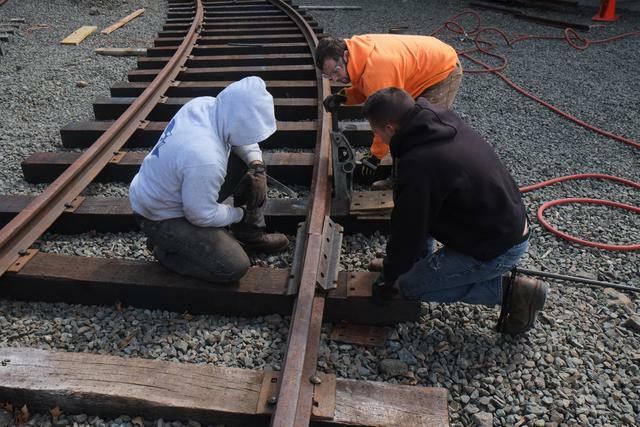 Mar 2017: With the help of our annual Gateway Community College internship students, work on track 94 is now done and the track, including the pit, is open for business! 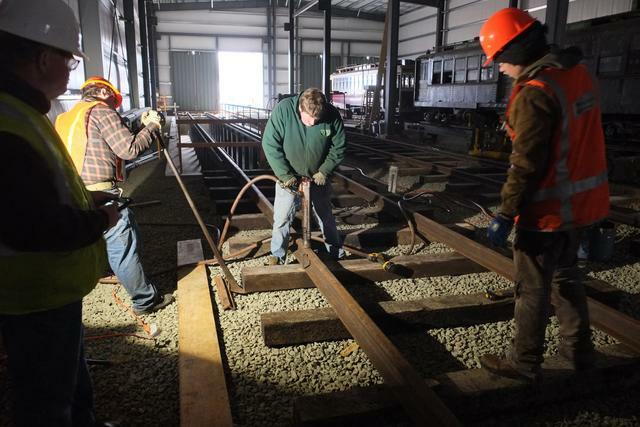 Above: Installation of rail hold-down clips is at the mid-way point in this early March view. 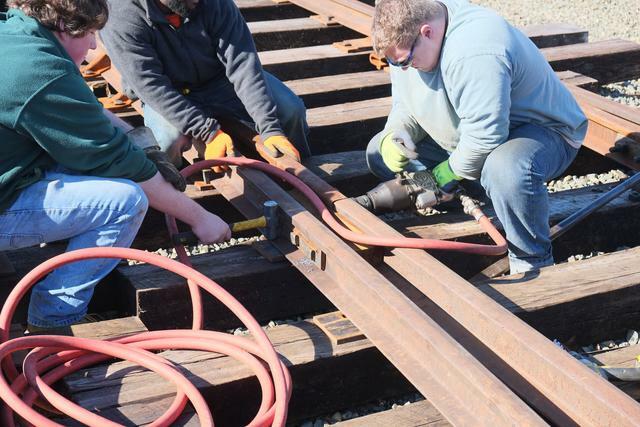 The rail is being put into proper gauge and then the hold-down bolts are tightened. 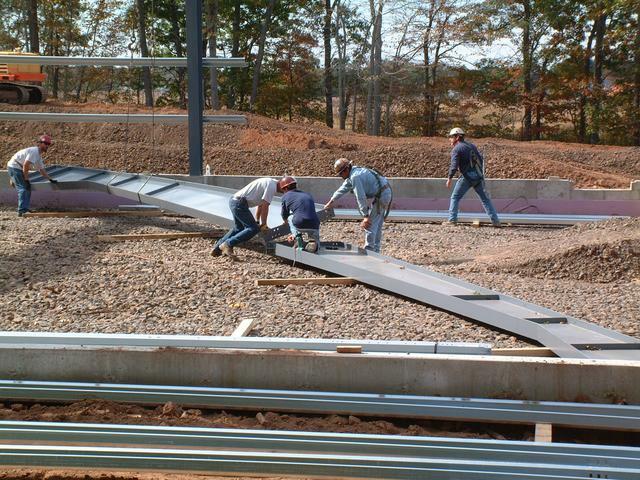 Above: The last 60' of the pit track, back on solid ground. 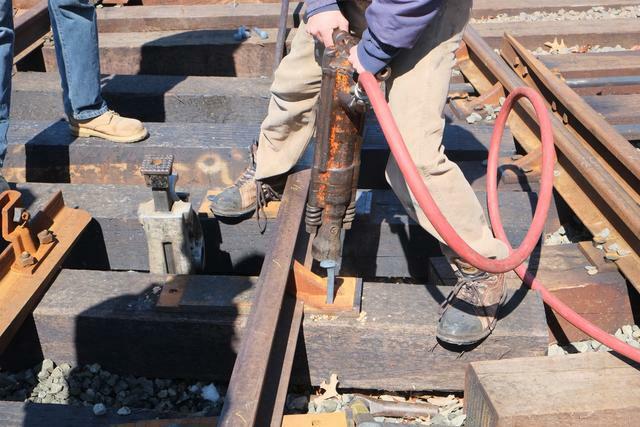 Track is being spiked with the pneumatic spike driver. 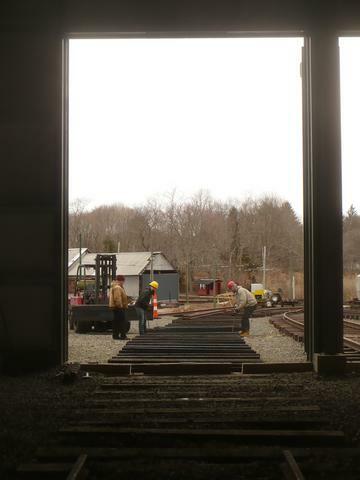 Below: checking the gauge as we get to the back wall. 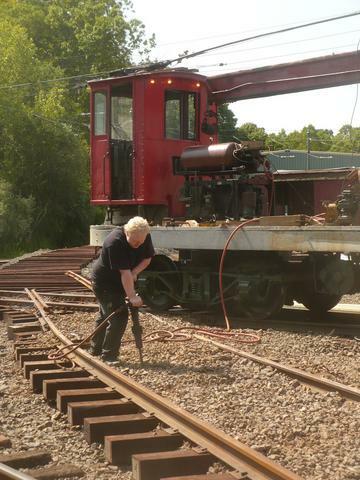 Since we don't have live wire up here yet, the Ottawa Line Car is a bit difficult to use. 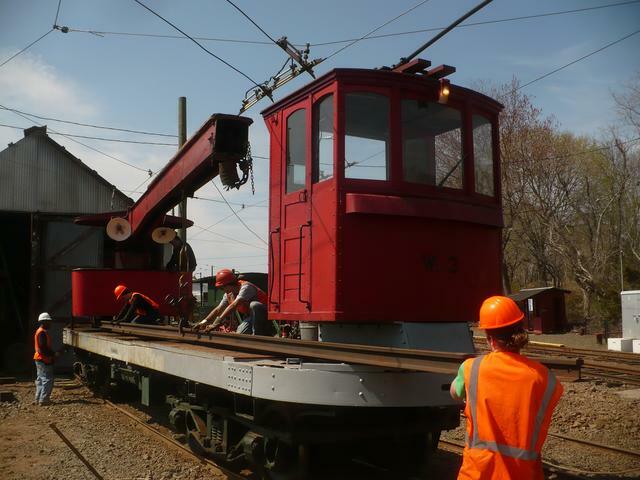 Instead, we have the bucket lift mounted on a flatcar and propelled by the car-mover. 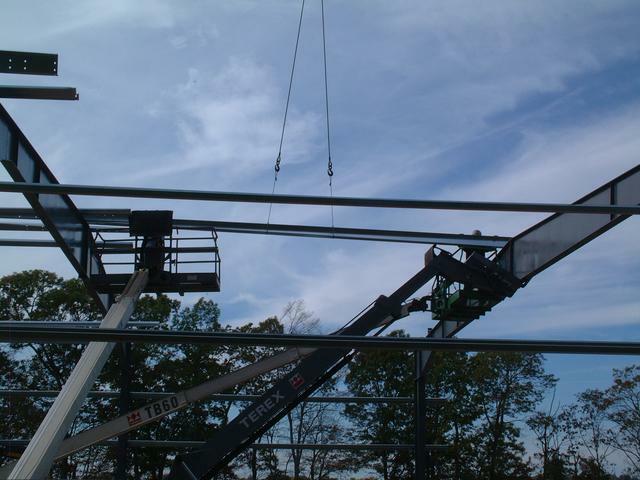 Here an eyebolt has been installed through new pole E-09 and the previously assembled span is being attached.